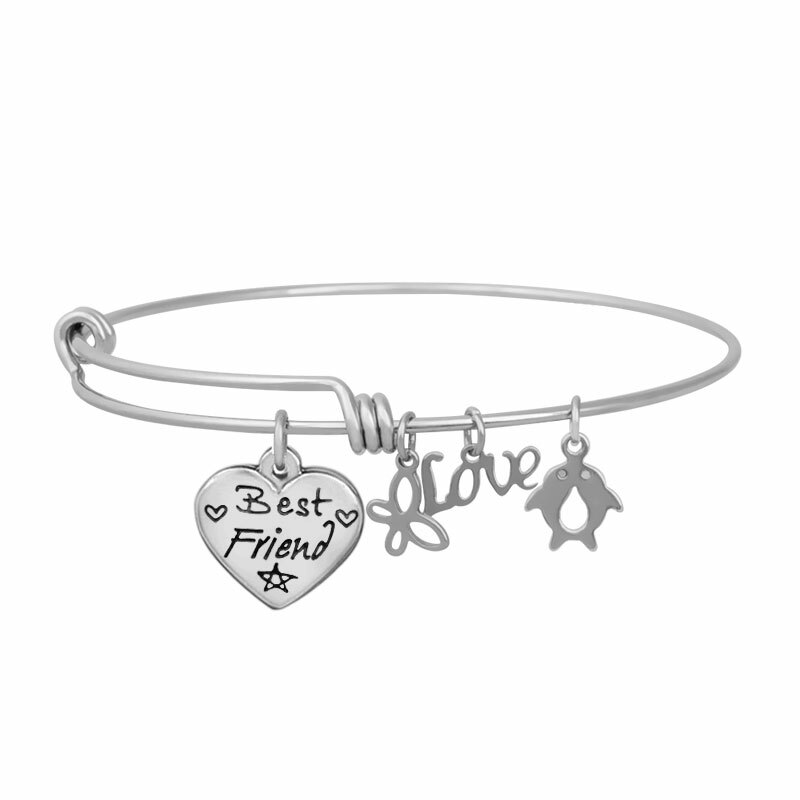 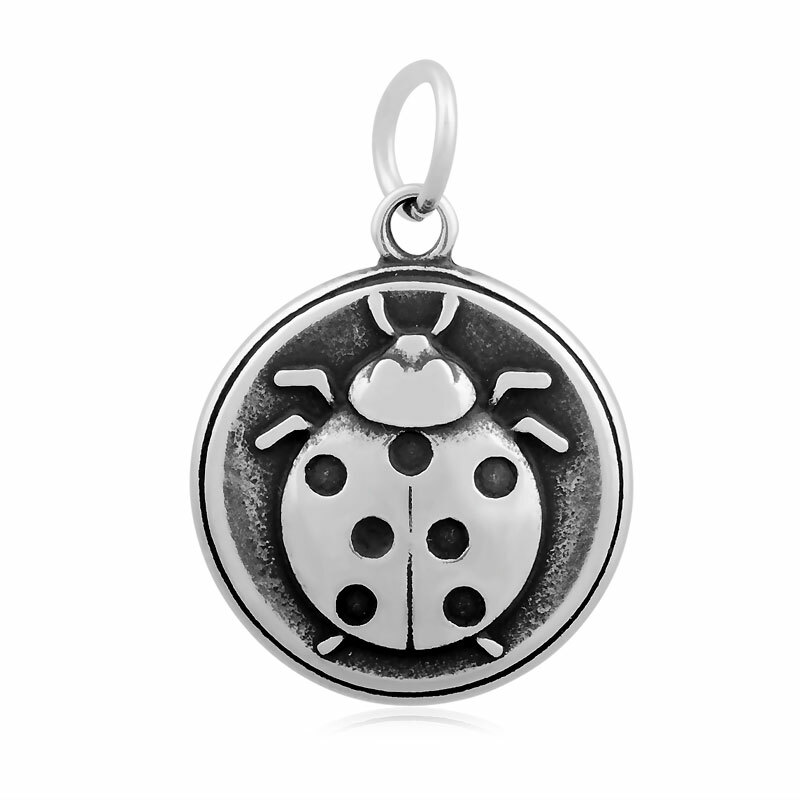 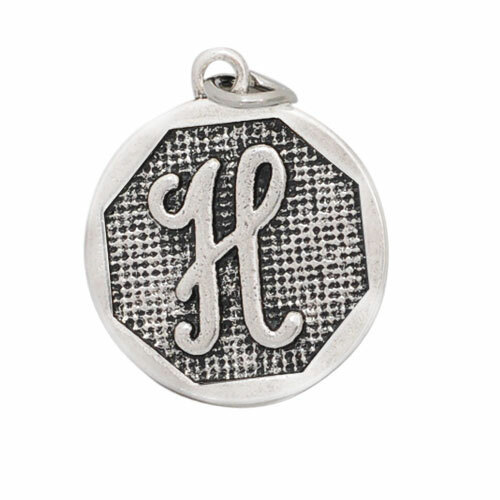 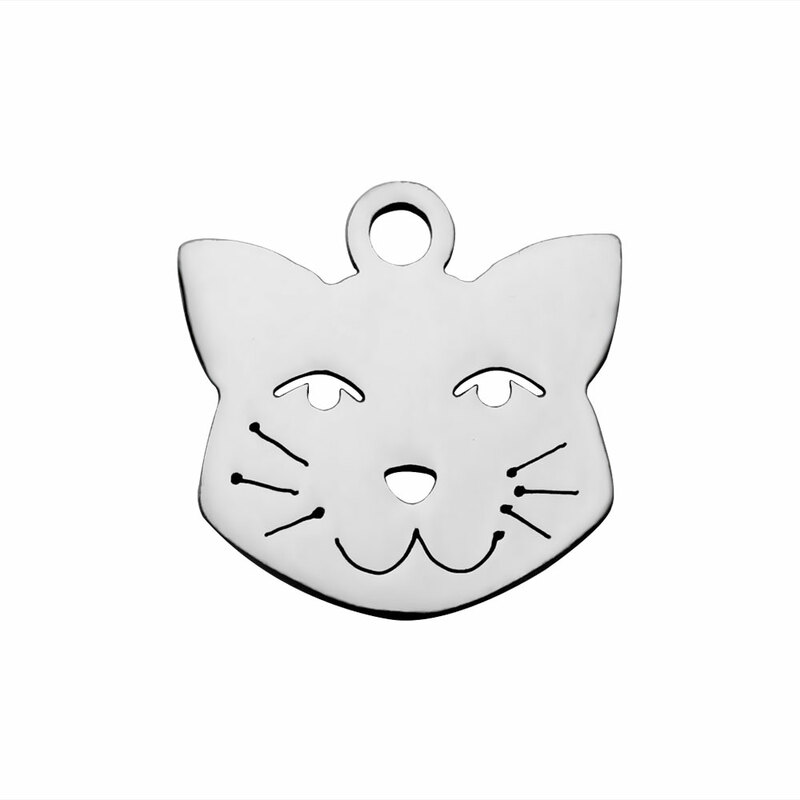 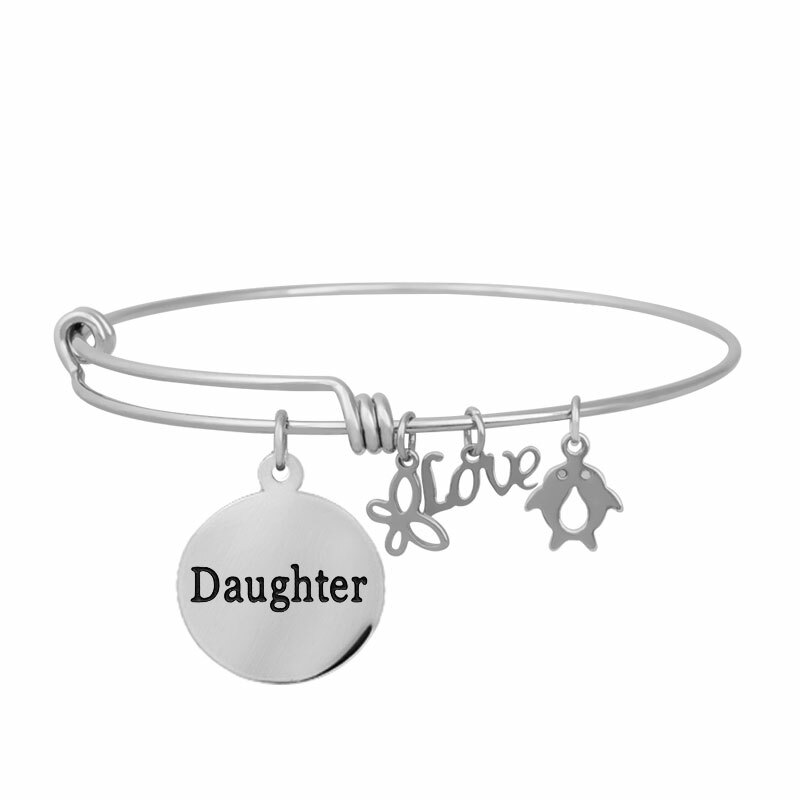 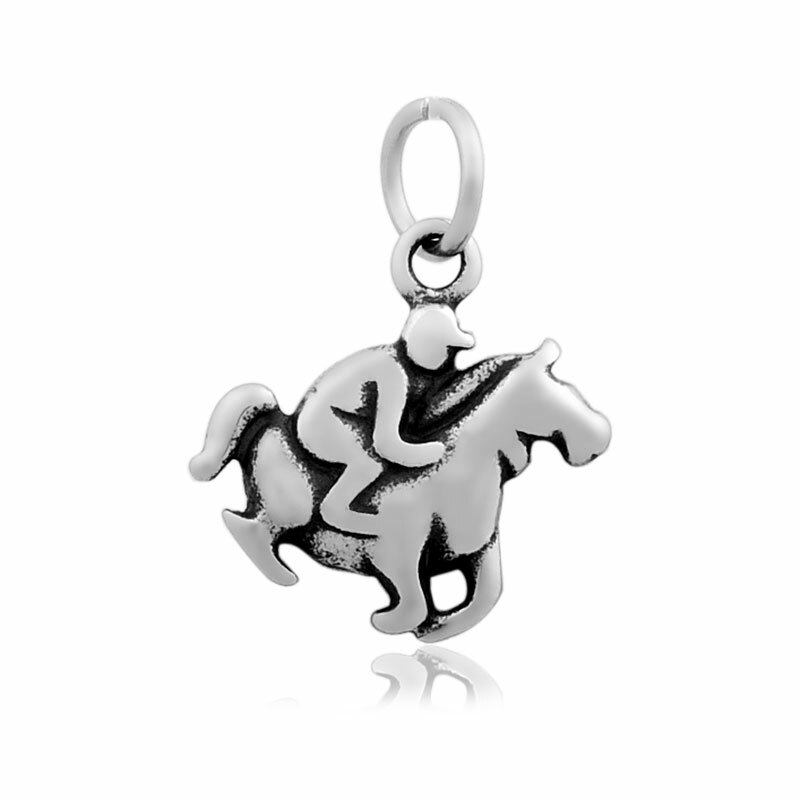 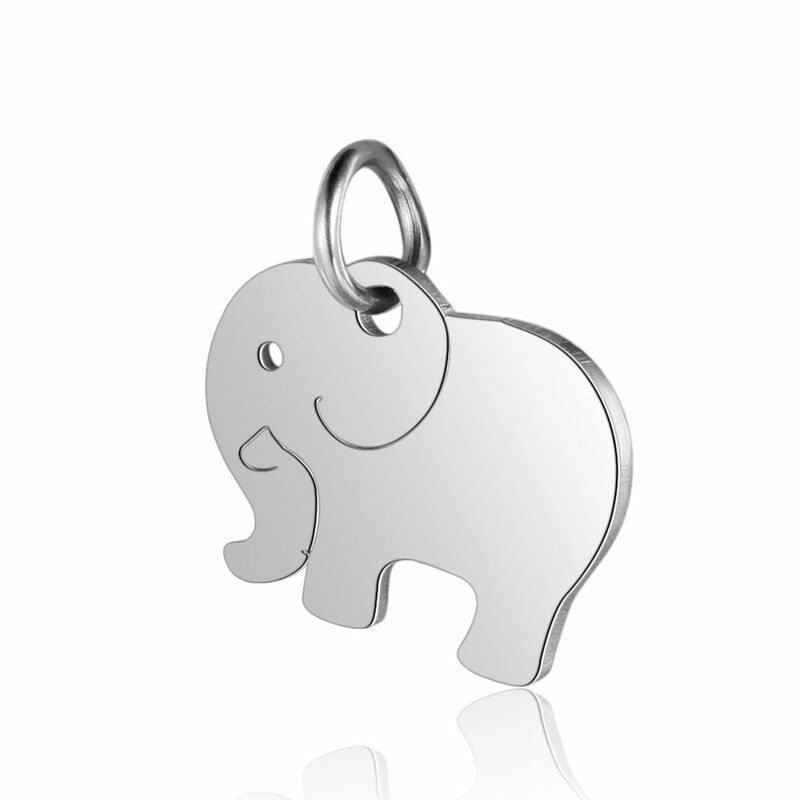 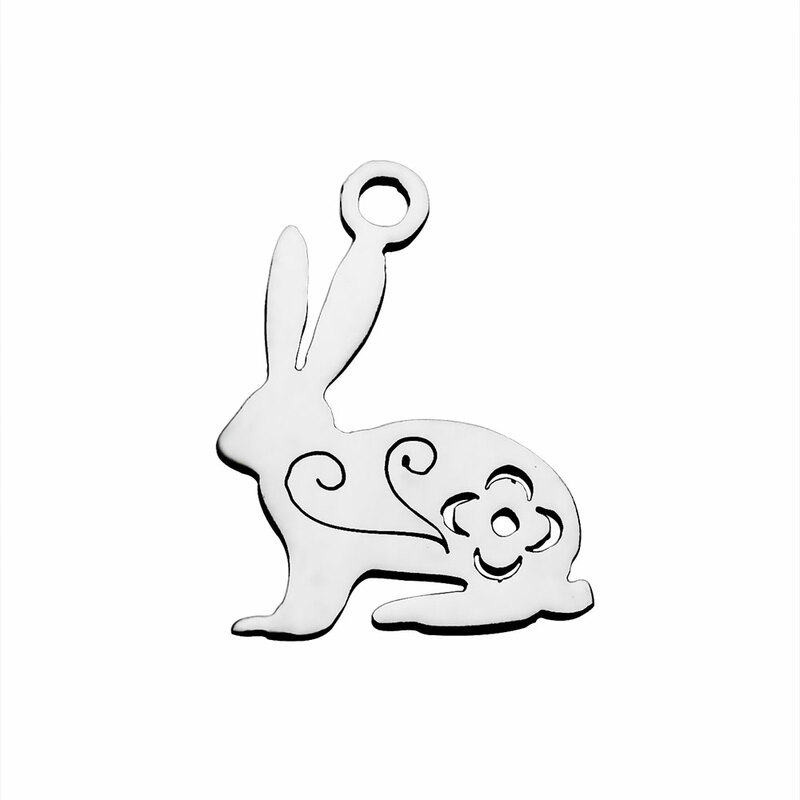 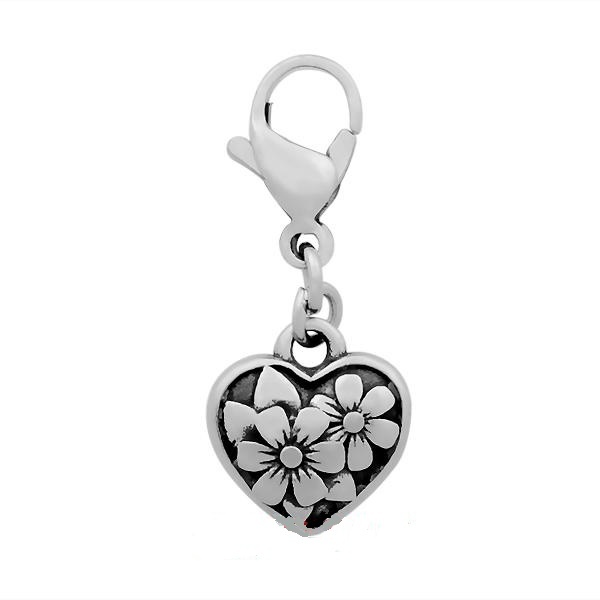 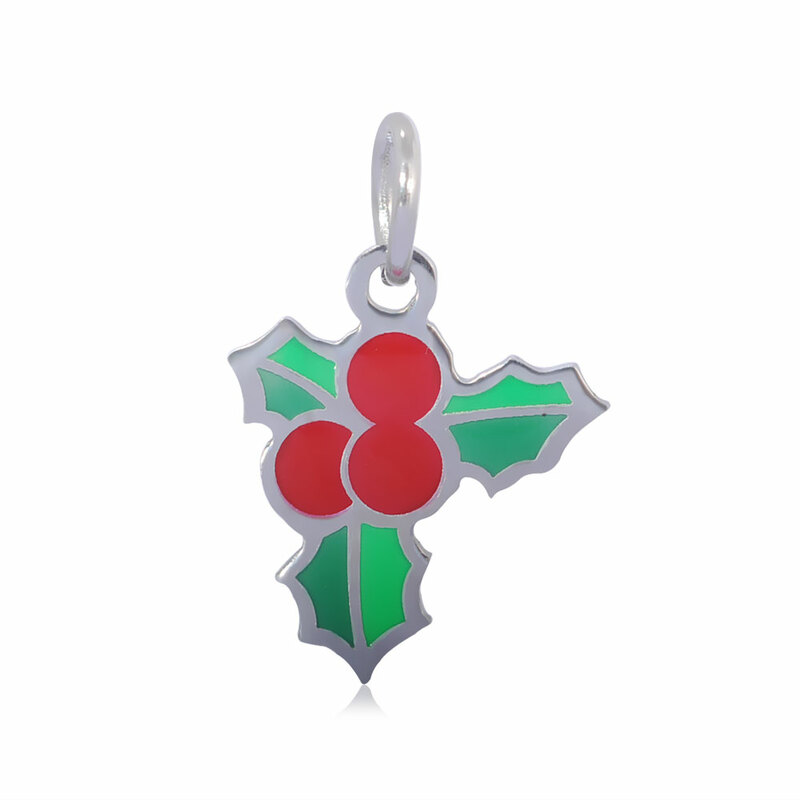 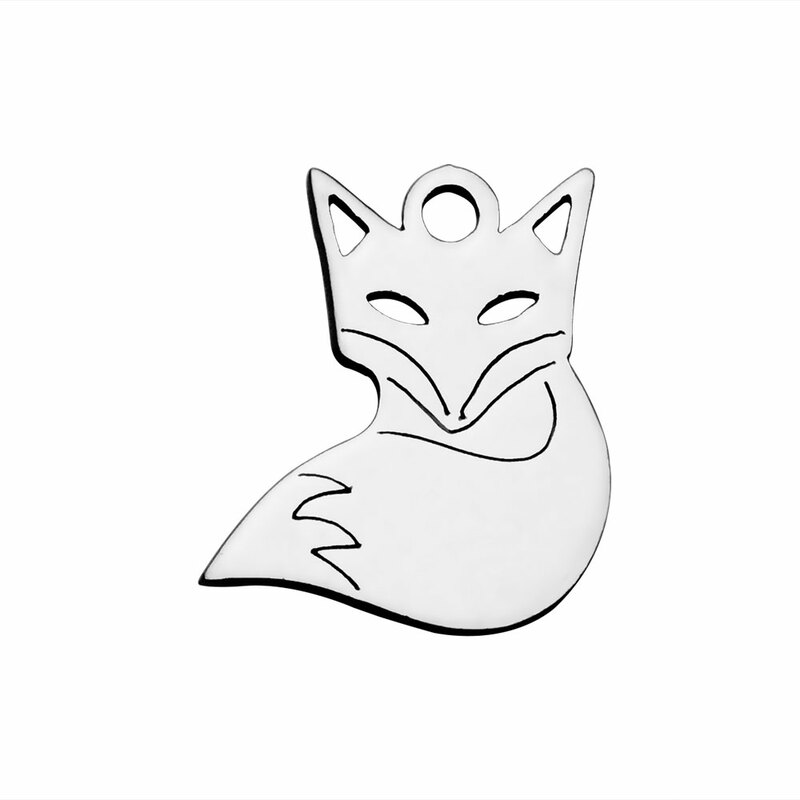 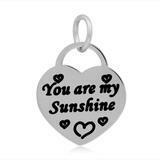 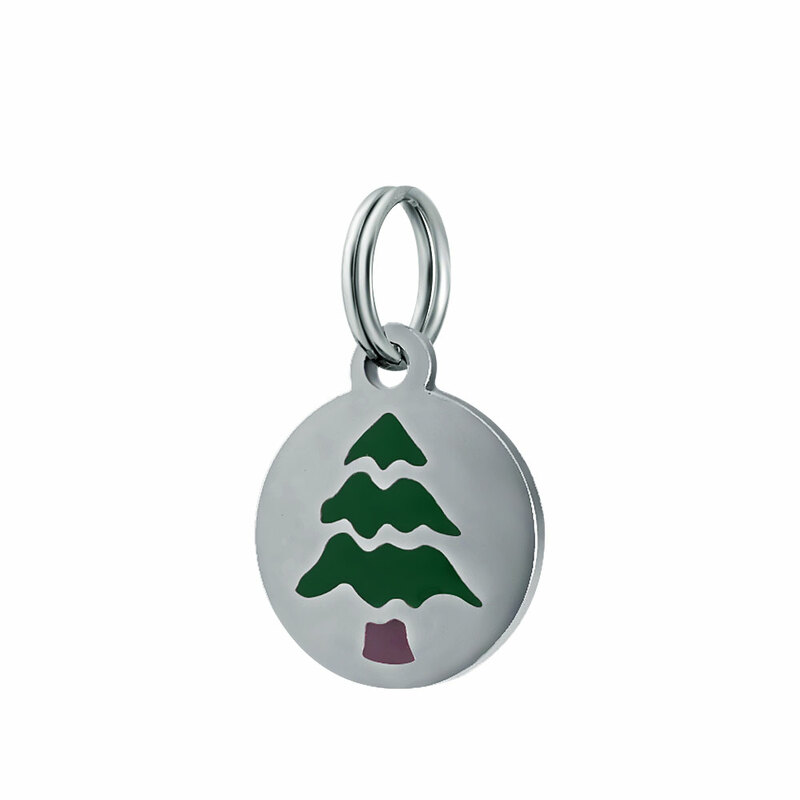 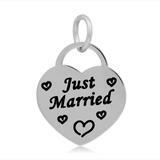 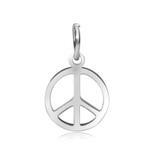 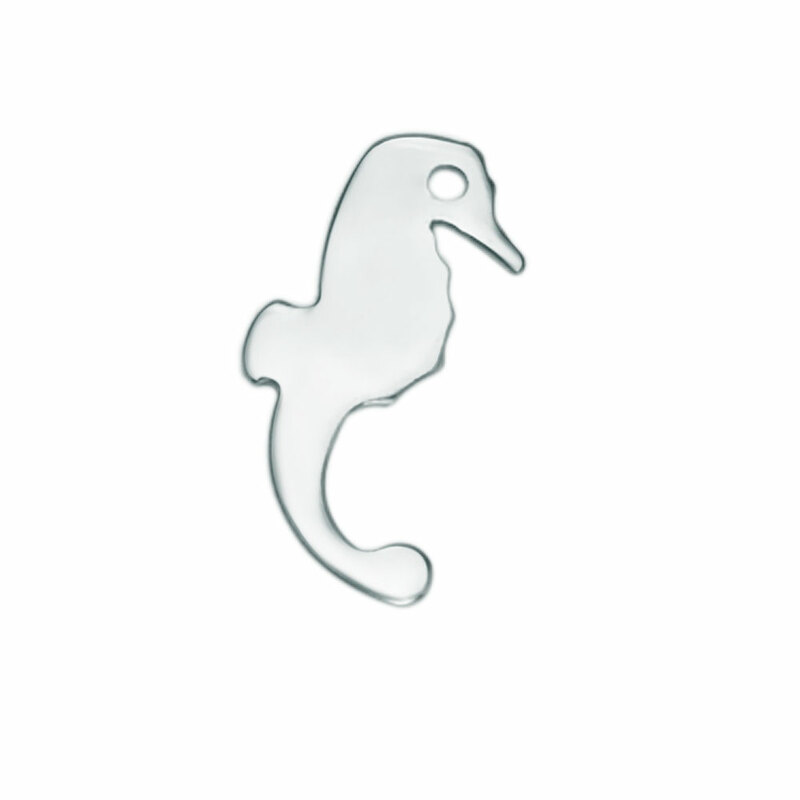 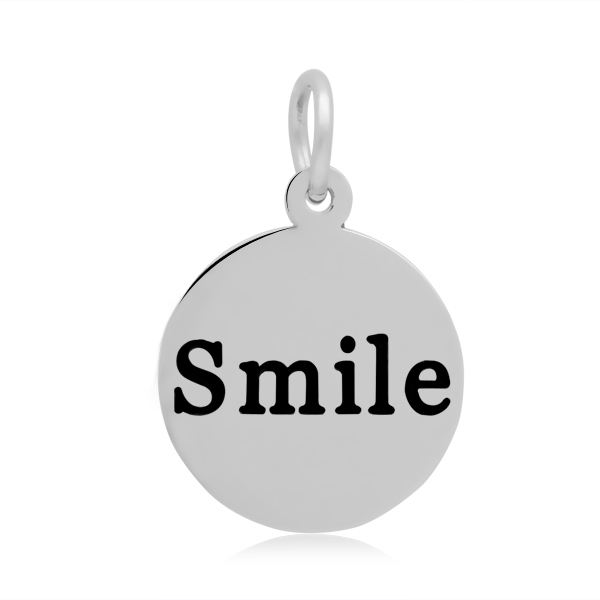 Add this cute Stainless Steel Charm to to a Charm Bracelet or Necklace to enhance your fashion statement or present as a gift to anyone you Value! 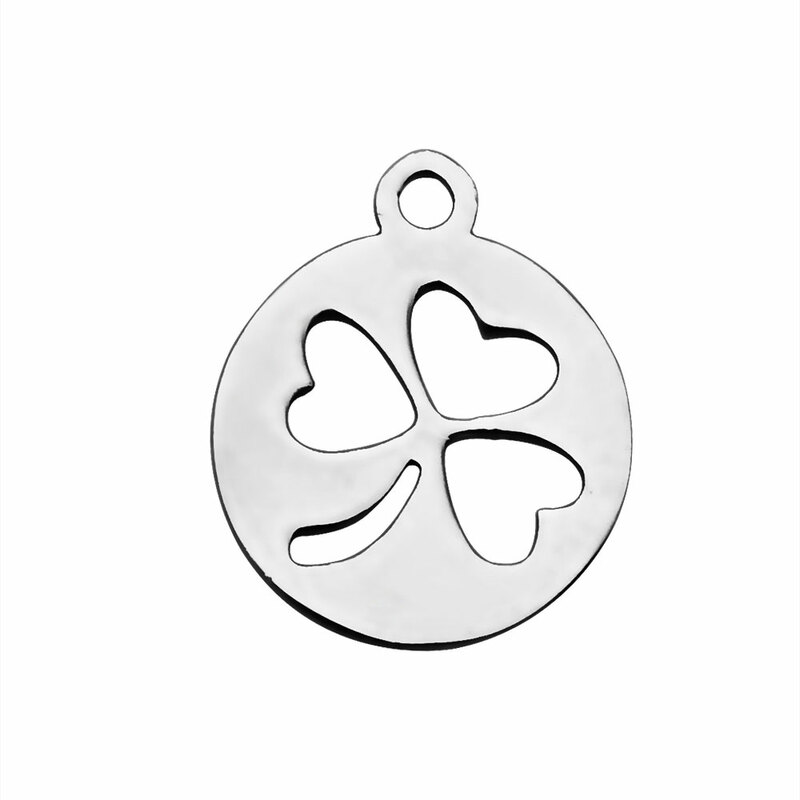 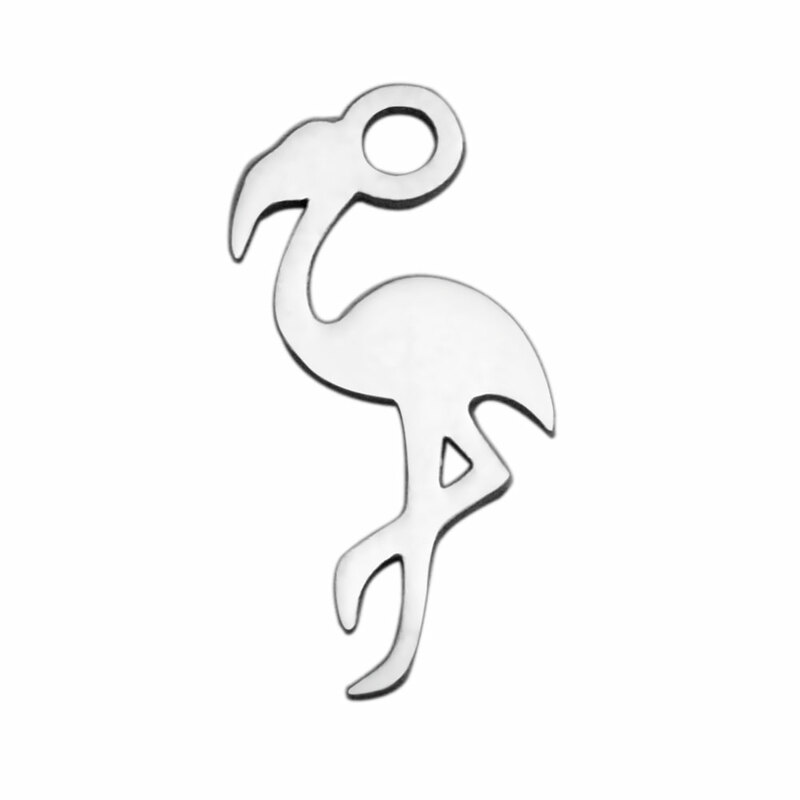 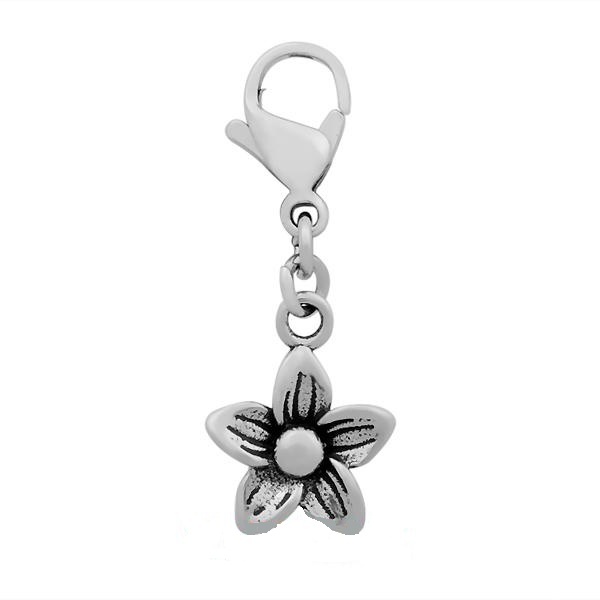 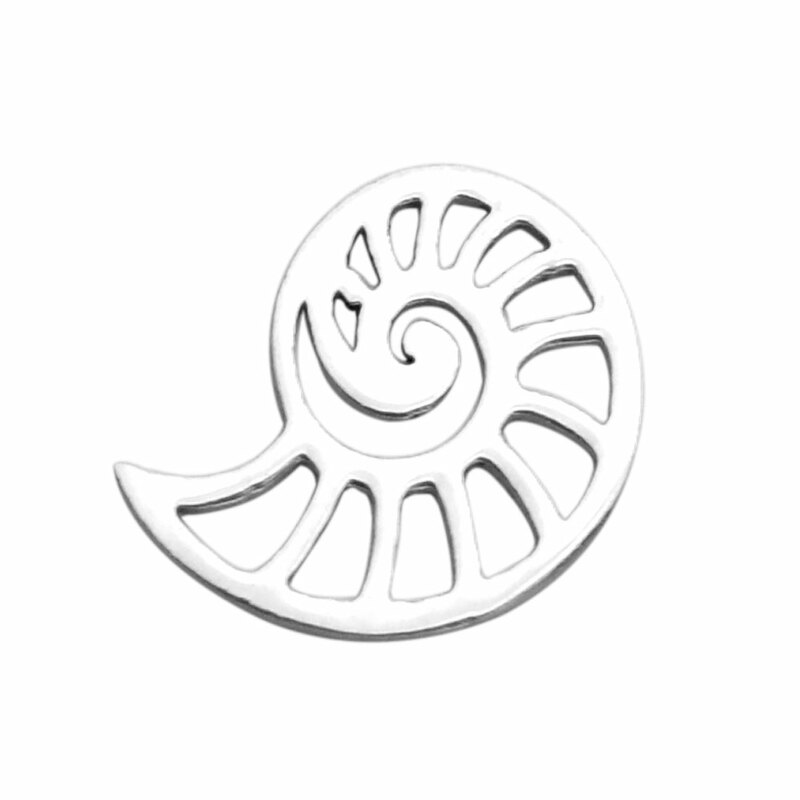 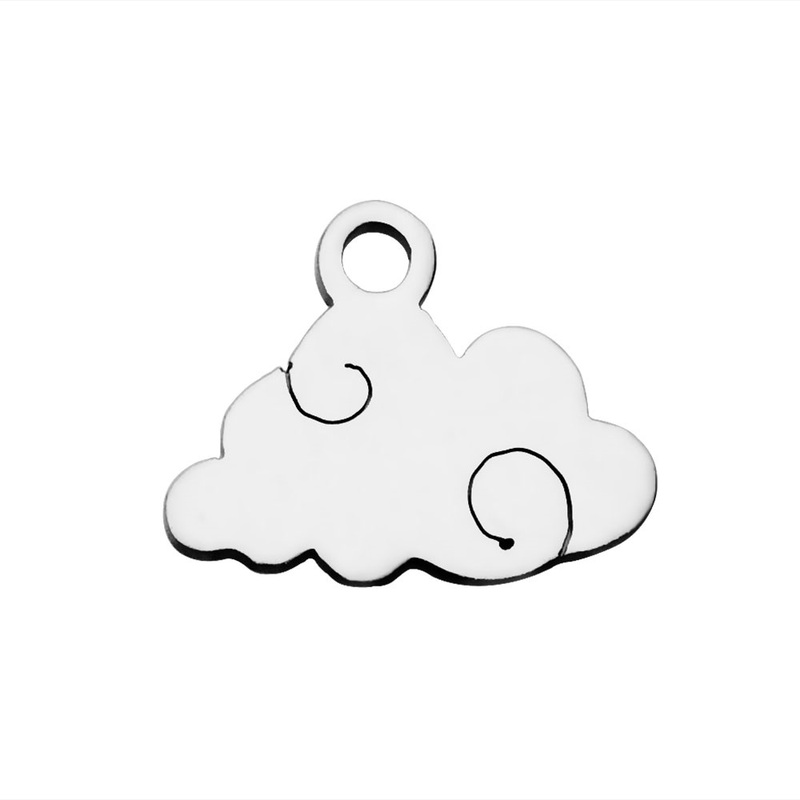 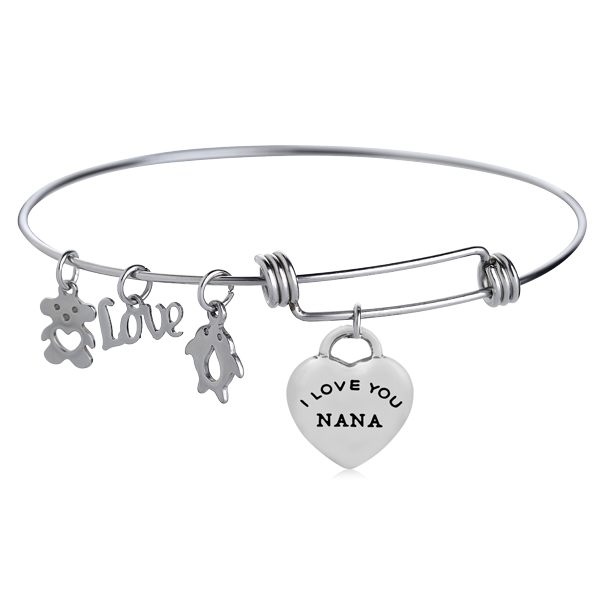 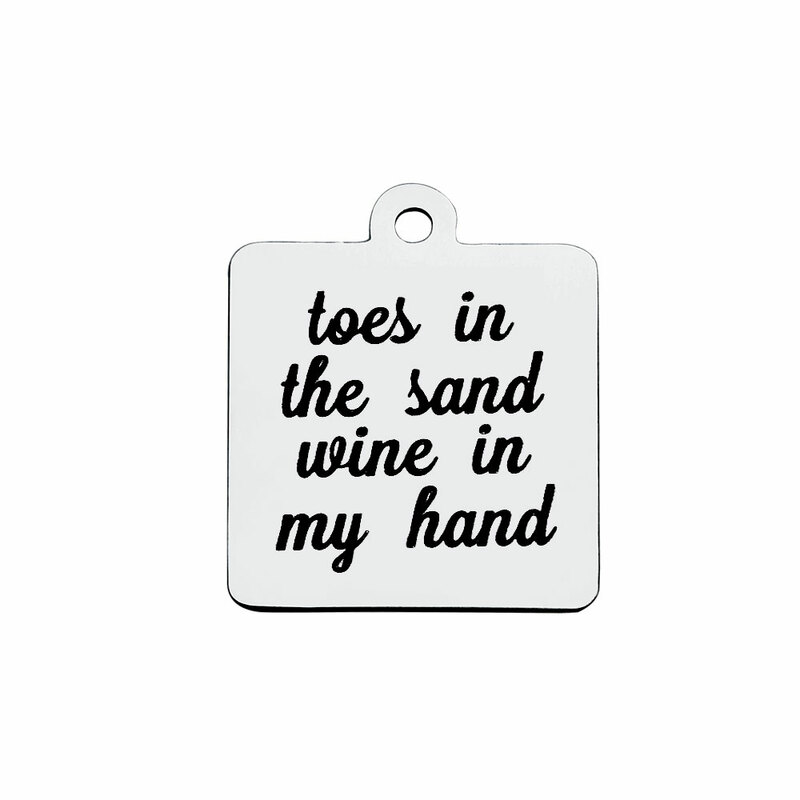 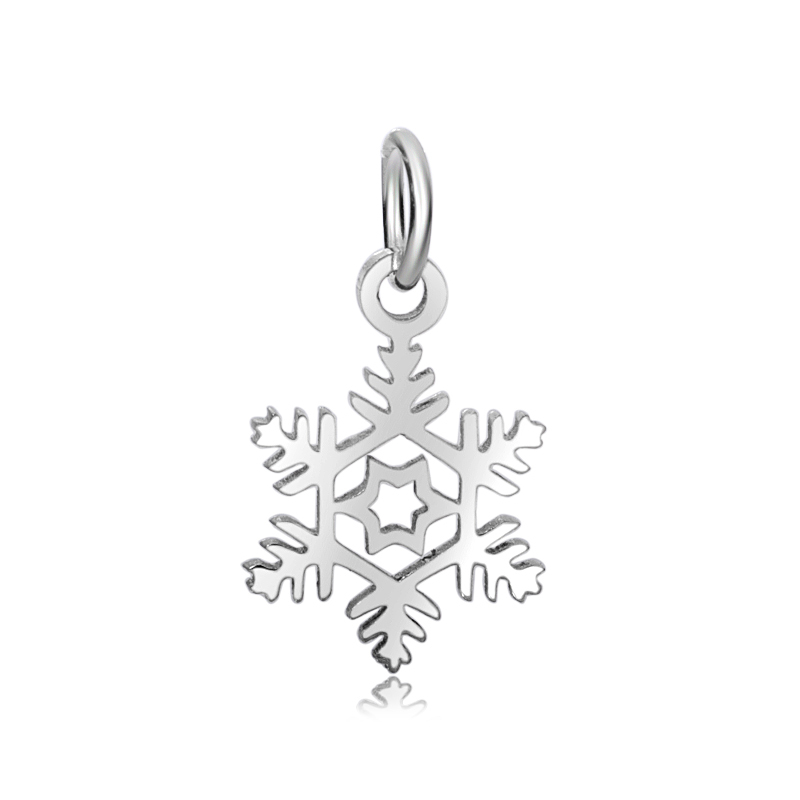 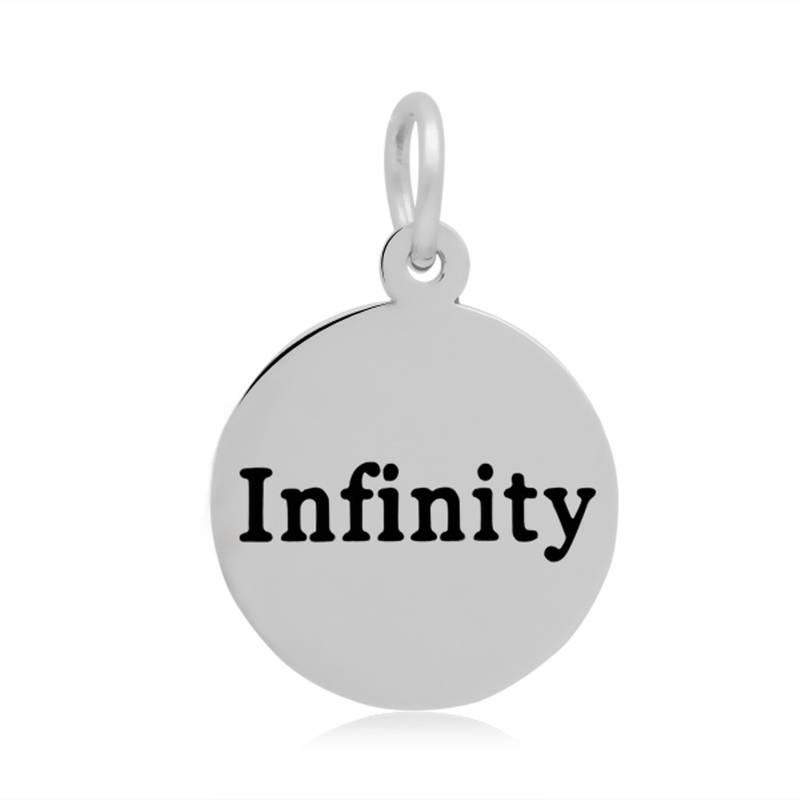 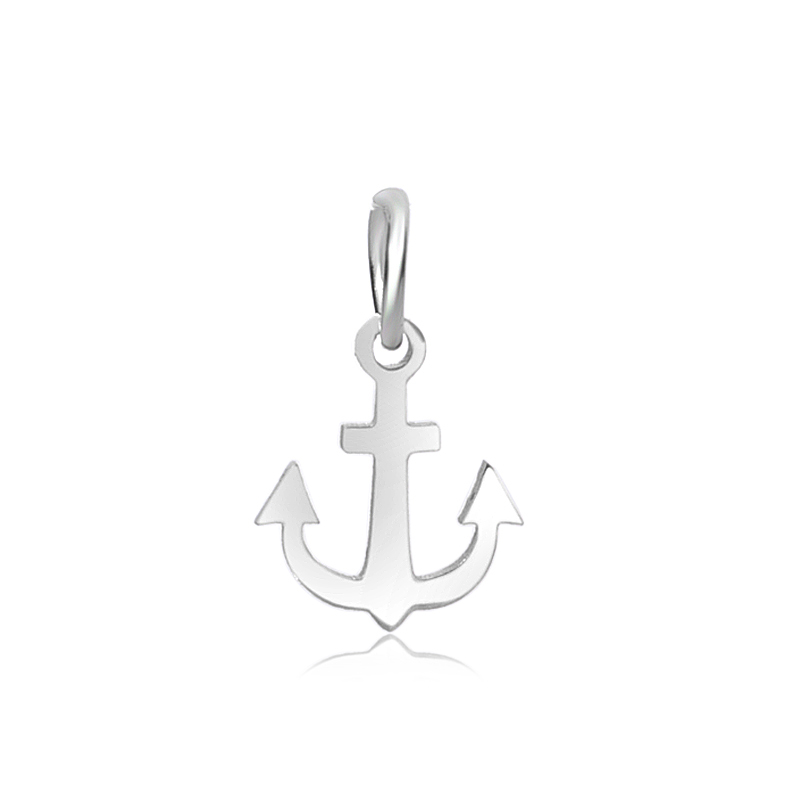 Add this cute Stainless Steel Charm to to a Charm Bracelet or Necklace to enhance your fashion statement or present as a gift to anyone you hold up to the Sky in Value! 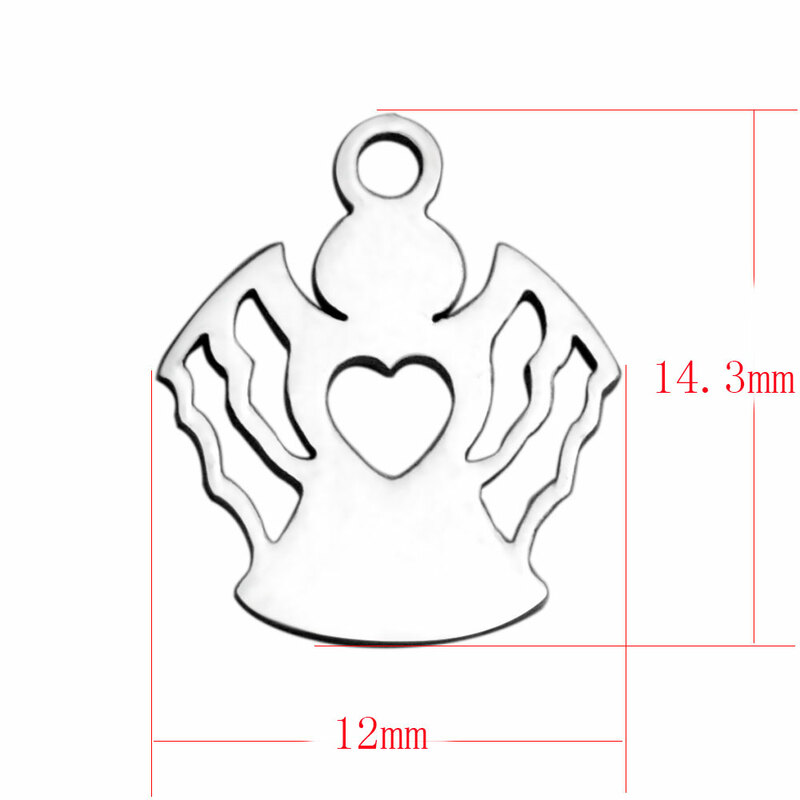 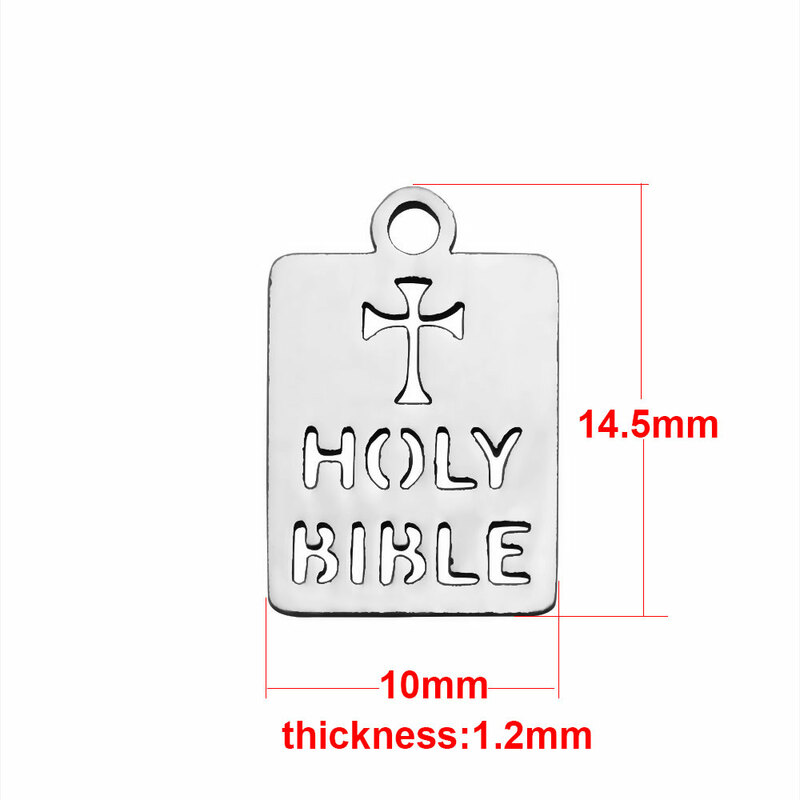 10*14.5mm Small Stainless Steel Charm - "Holy Bible"
Stainless steel jewelry will not tarnish or rust. 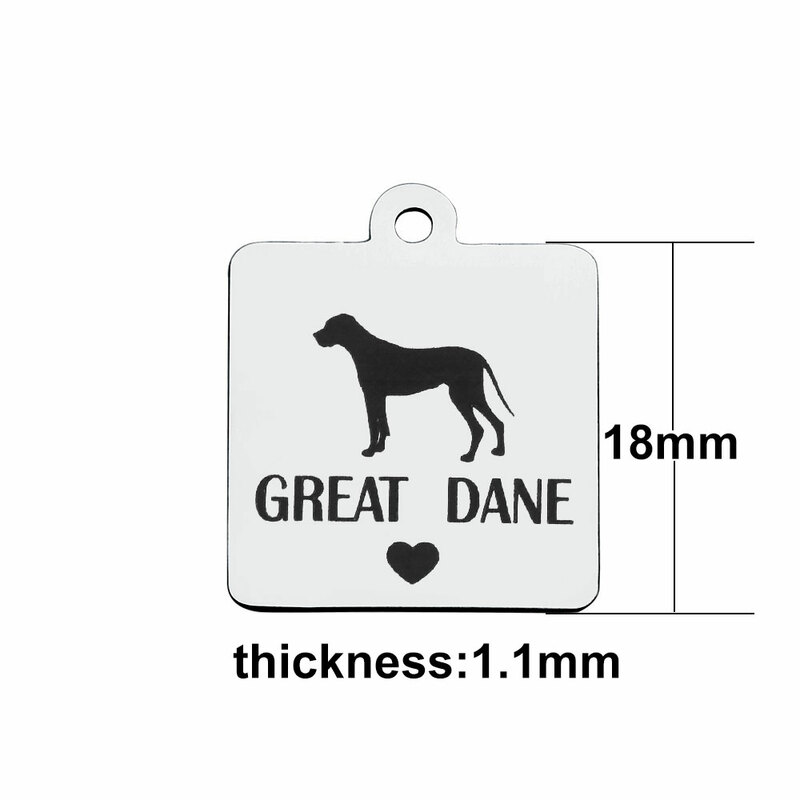 It is durable and scratch resistant. 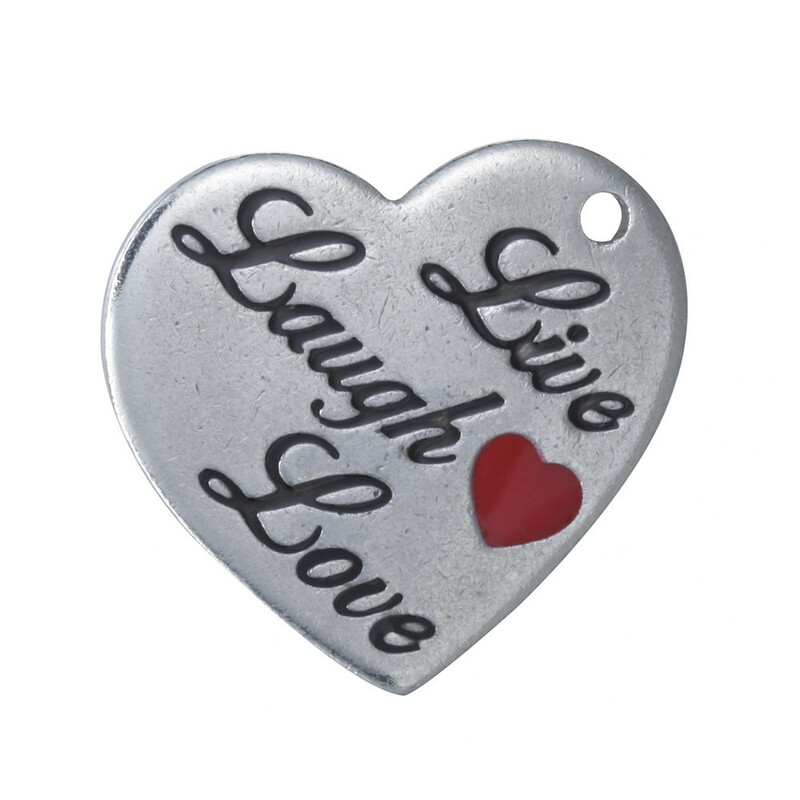 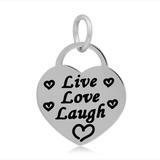 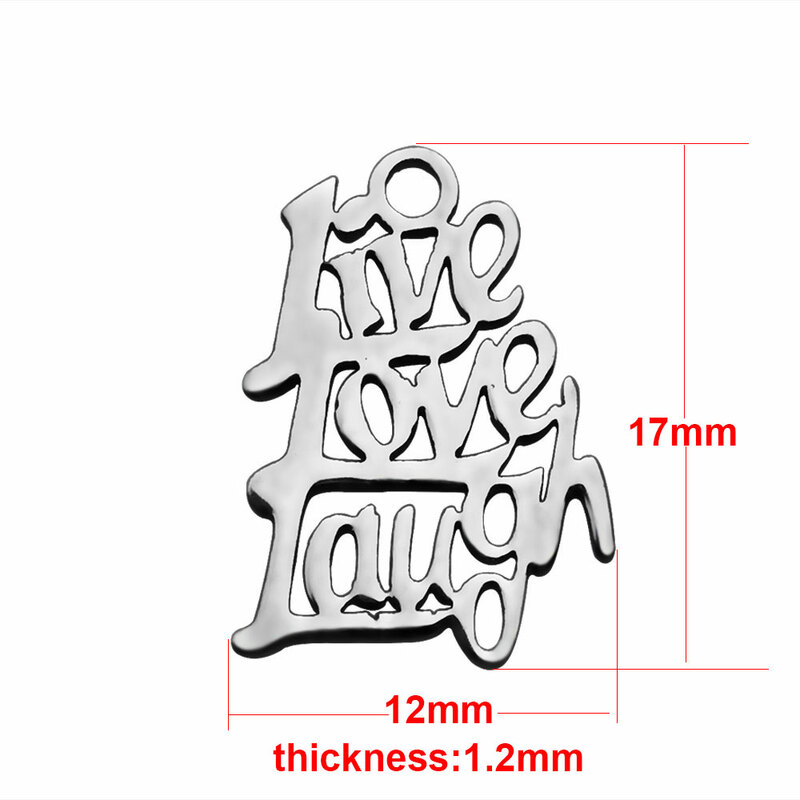 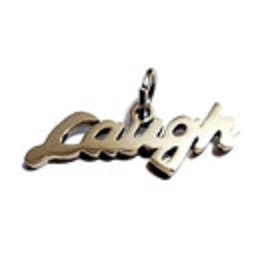 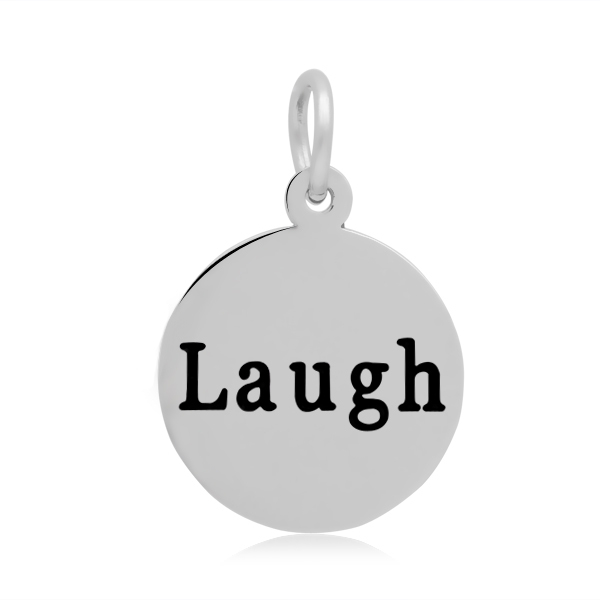 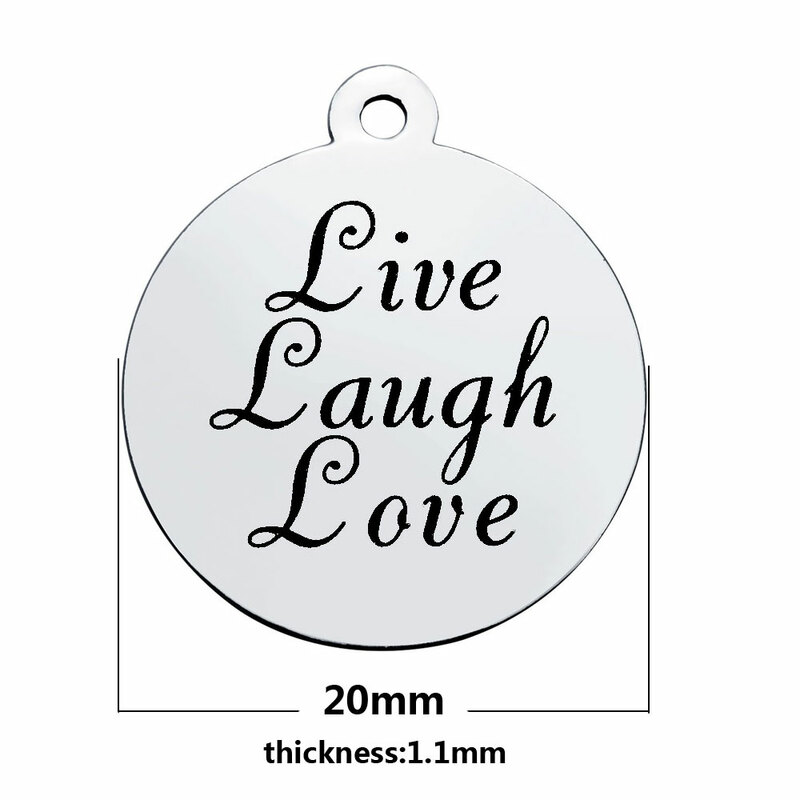 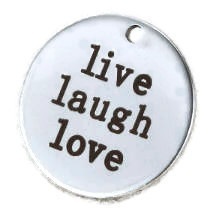 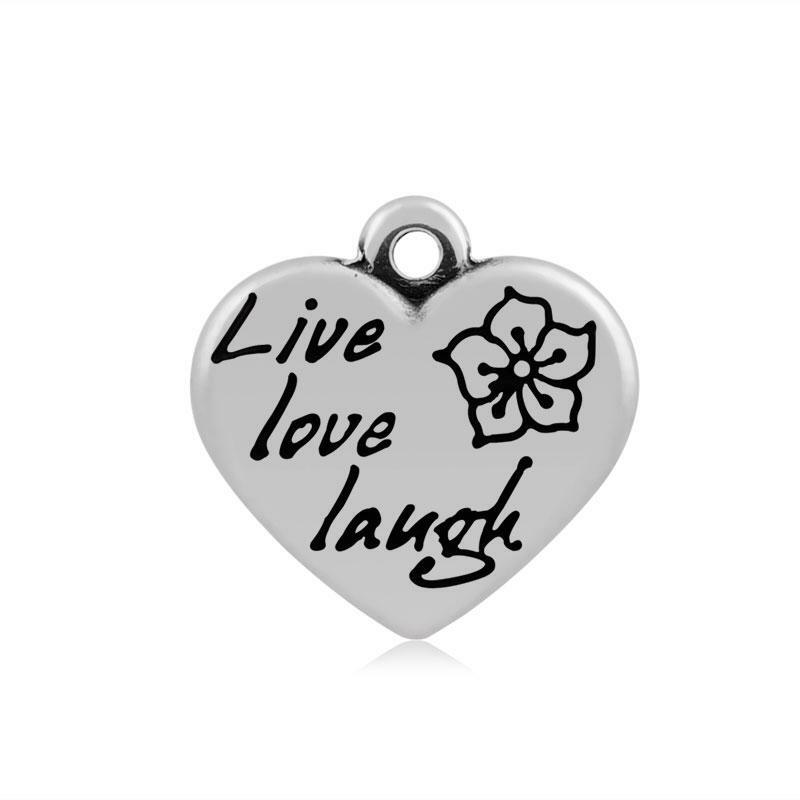 12*17mm Small Stainless Steel Charm - "Live Love Laugh"
Add this cute Stainless Steel Charm to to a Charm Bracelet or Necklace to enhance your fashion statement or present as a gift to anyone you Value...Don't forget to wish them the Best of Luck! 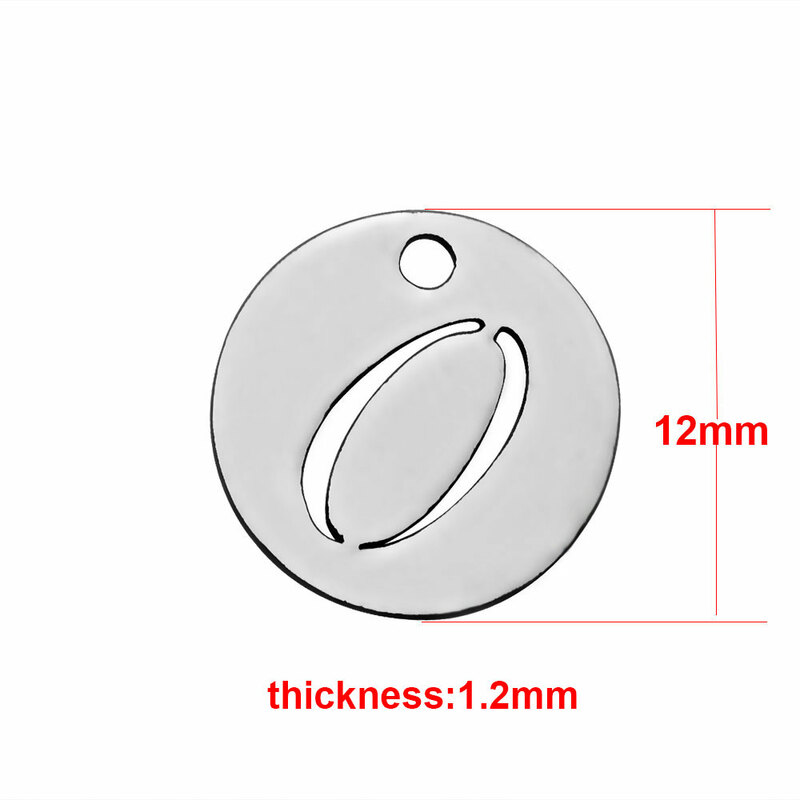 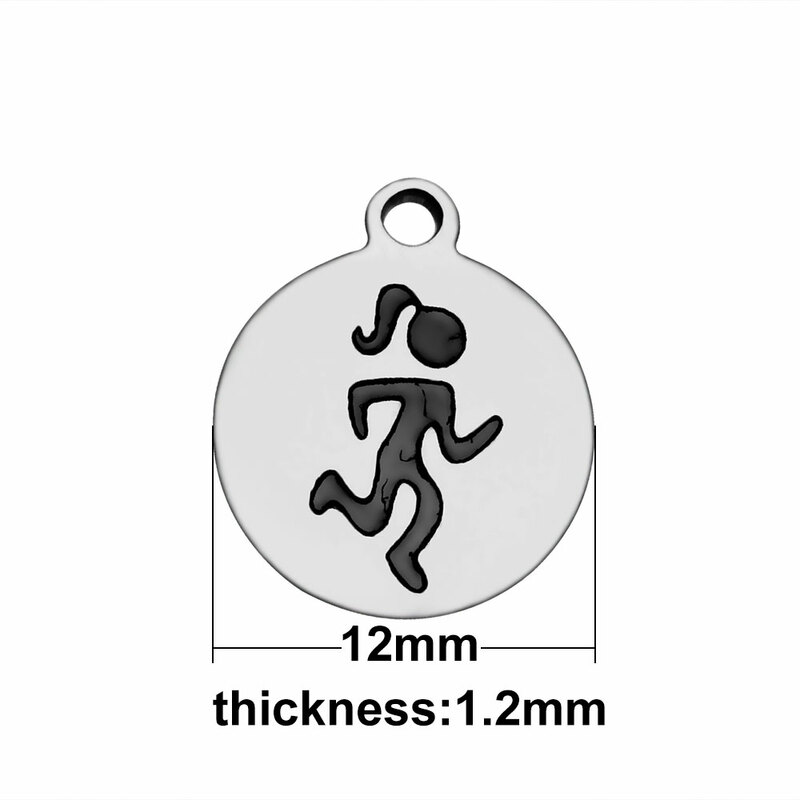 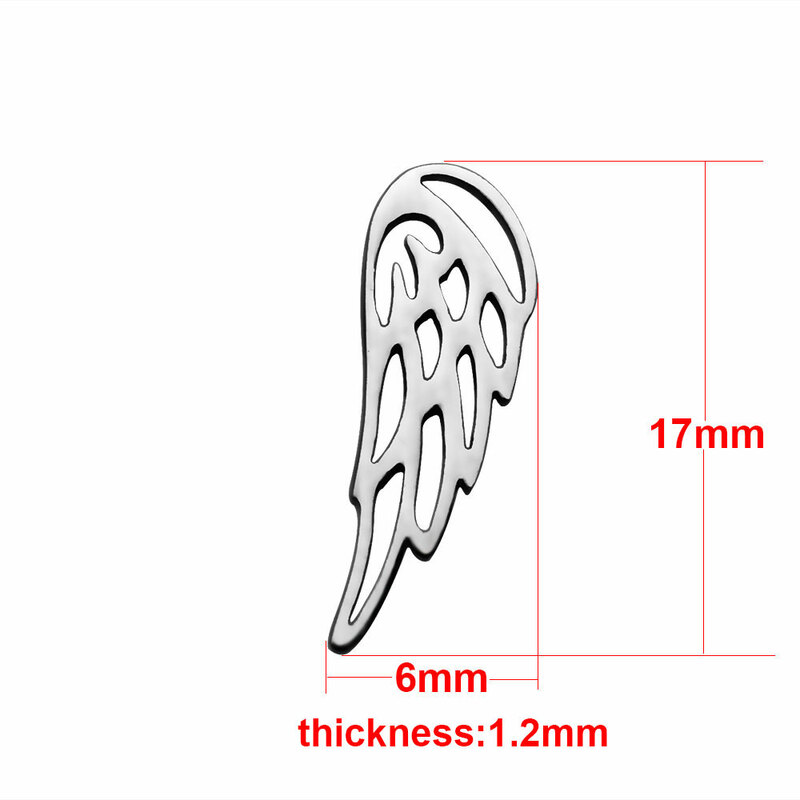 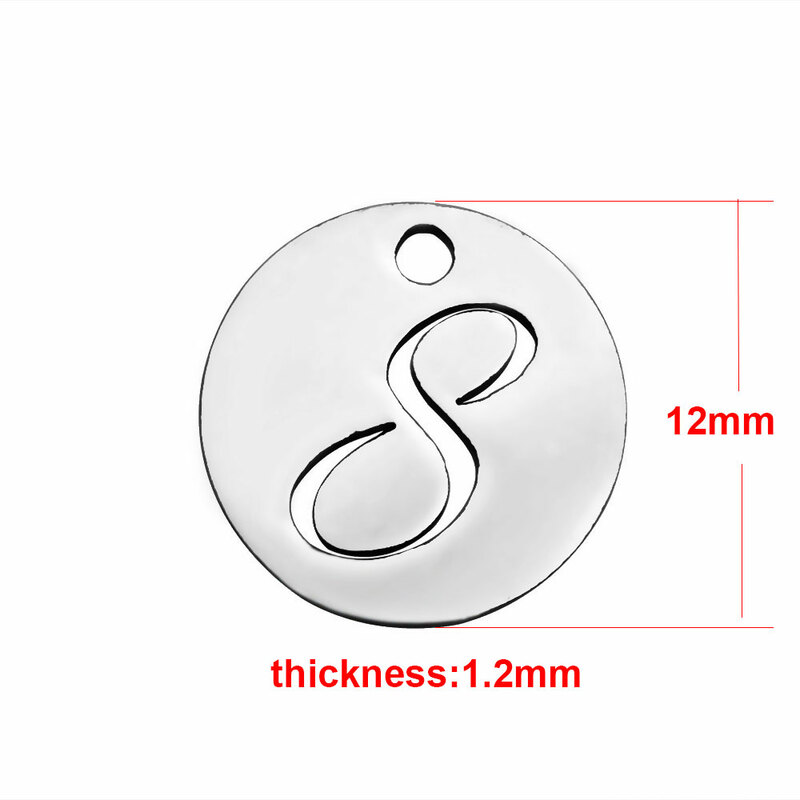 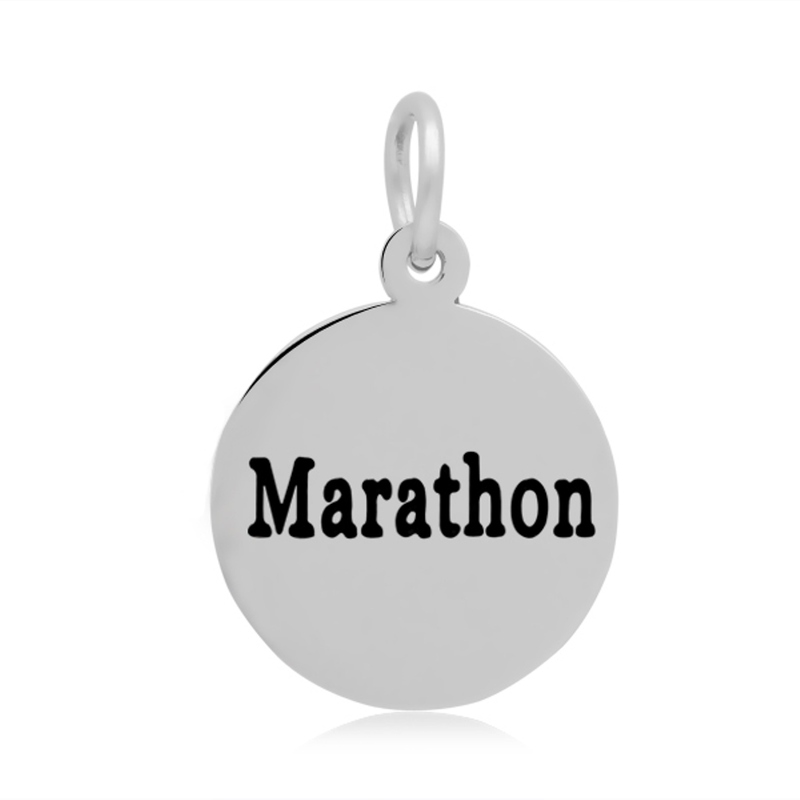 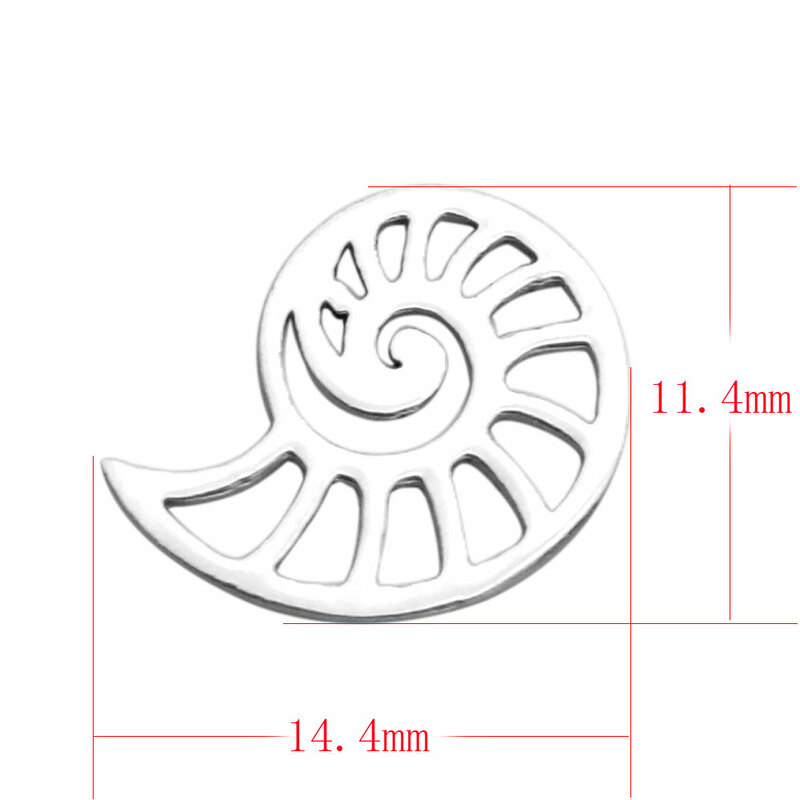 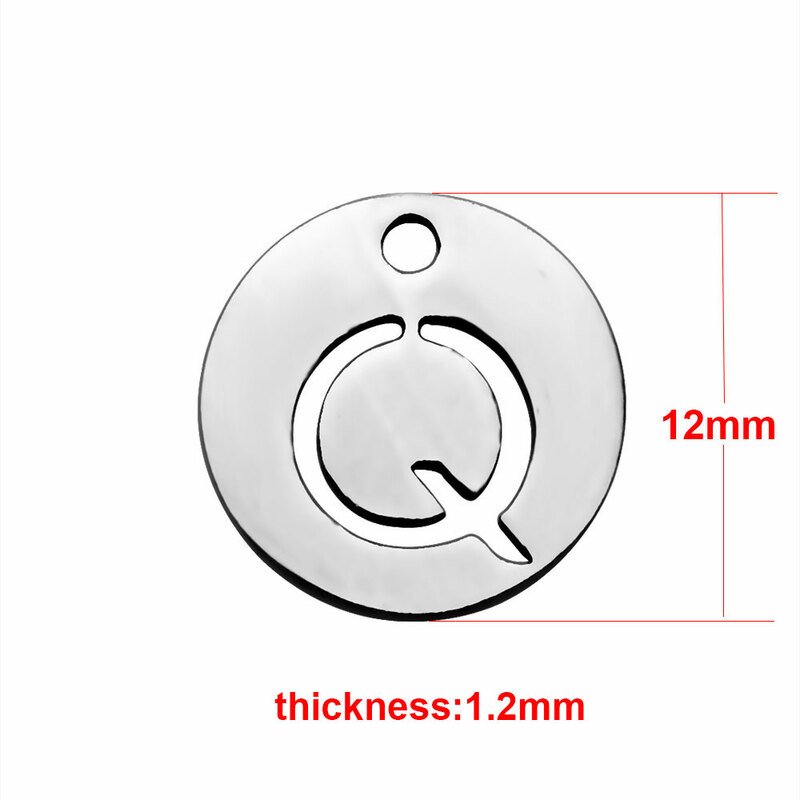 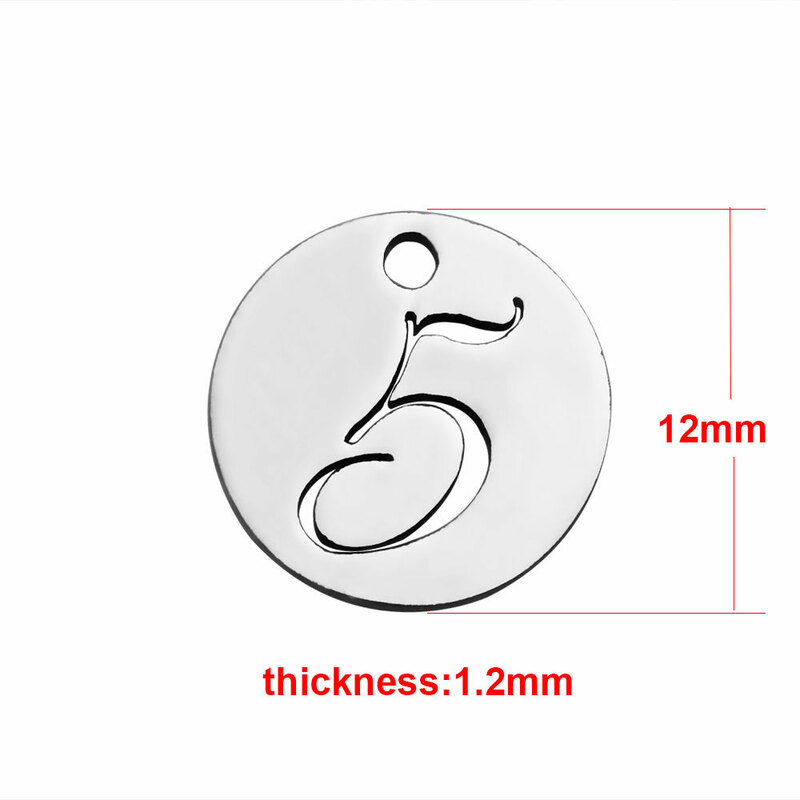 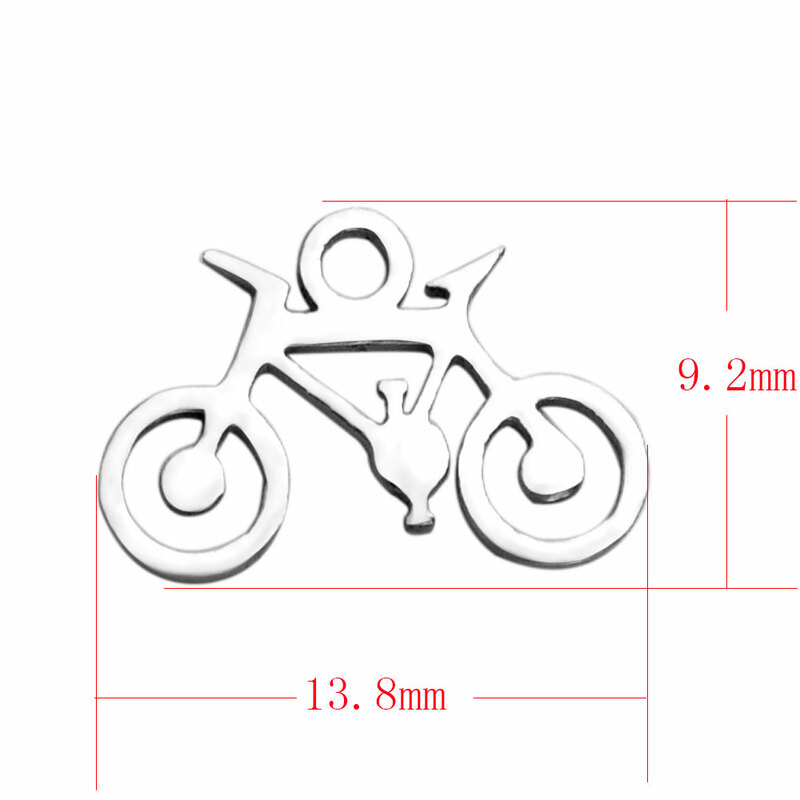 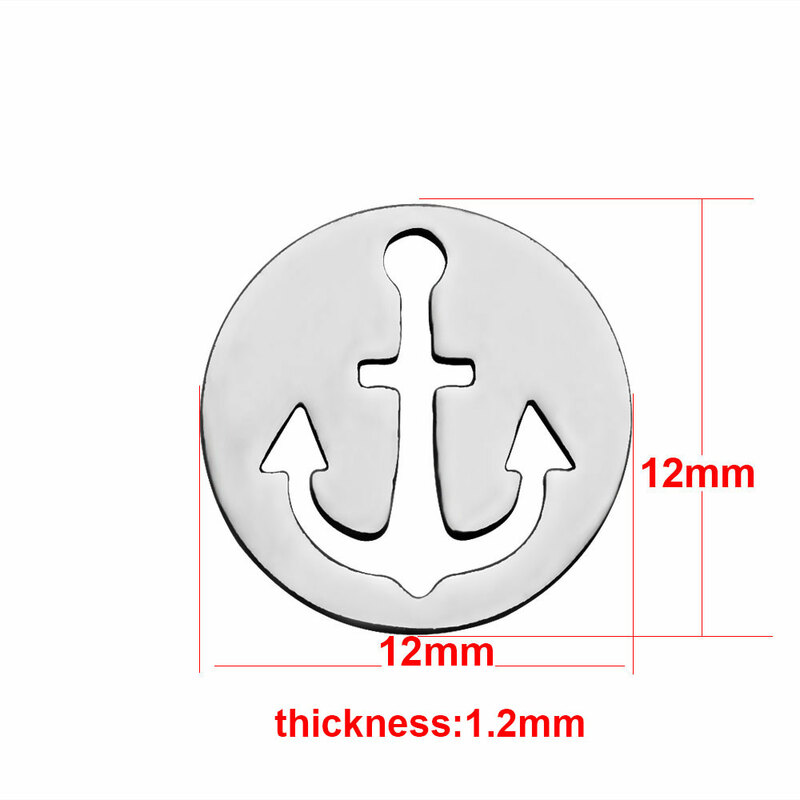 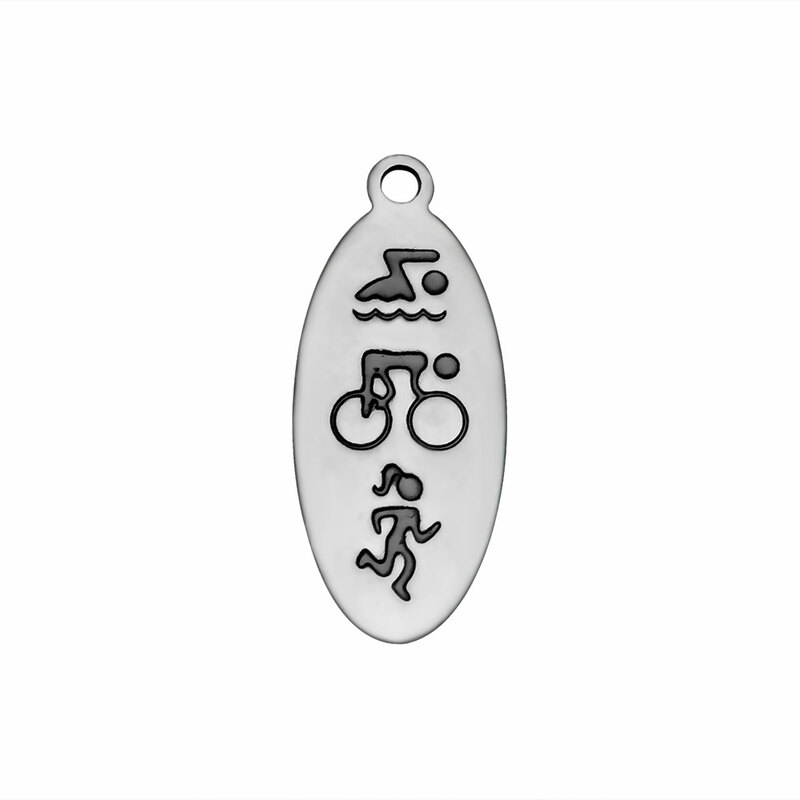 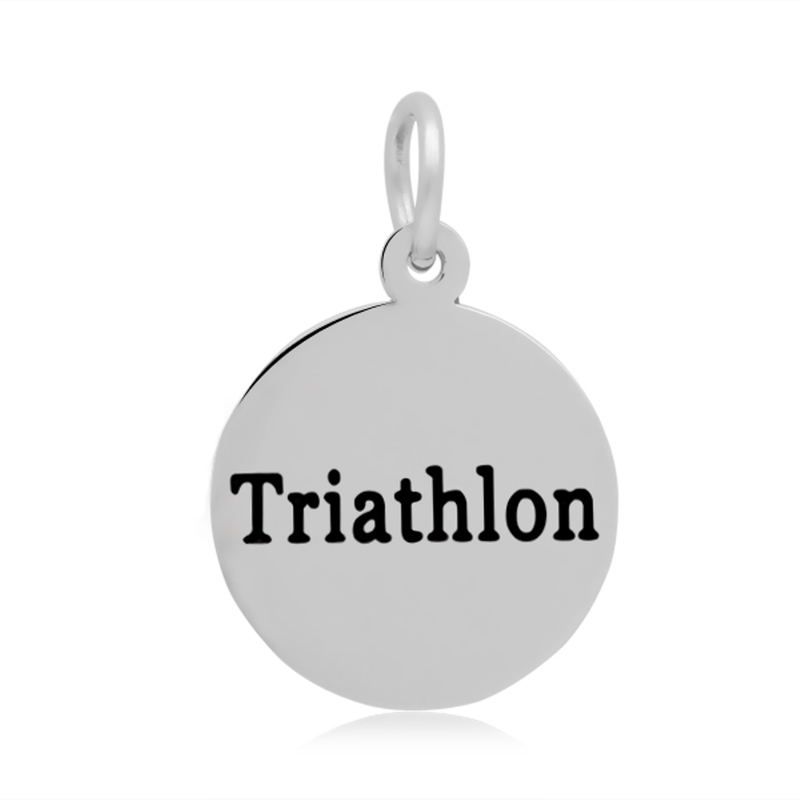 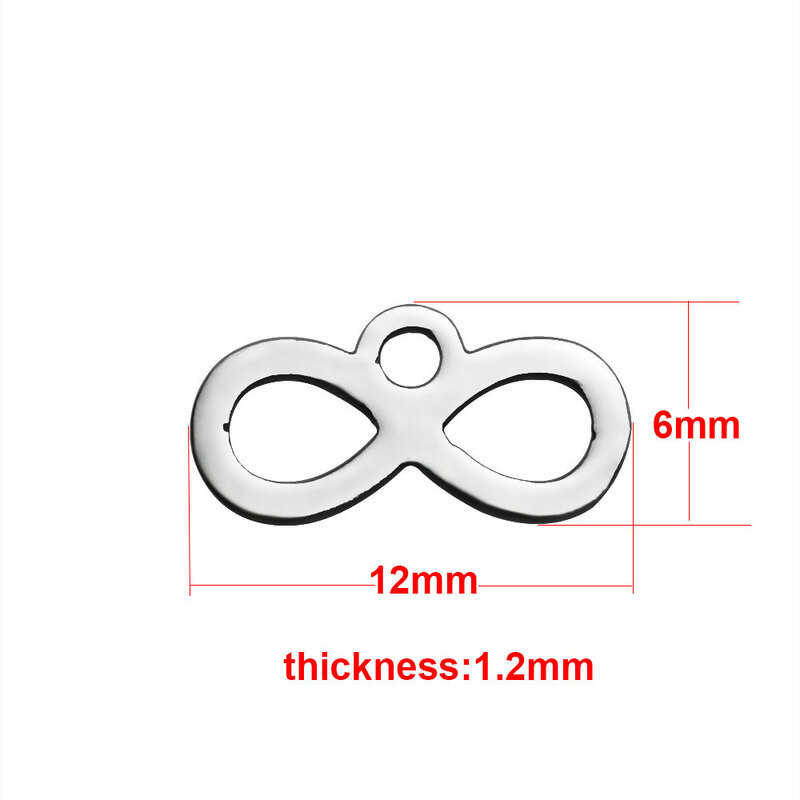 16*24mm Small Stainless Steel Charm - Round "Brave"
16*24mm Small Stainless Steel Charm - Round "Triathlon"
Stainless steel jewelry will not will not tarnish or rust. 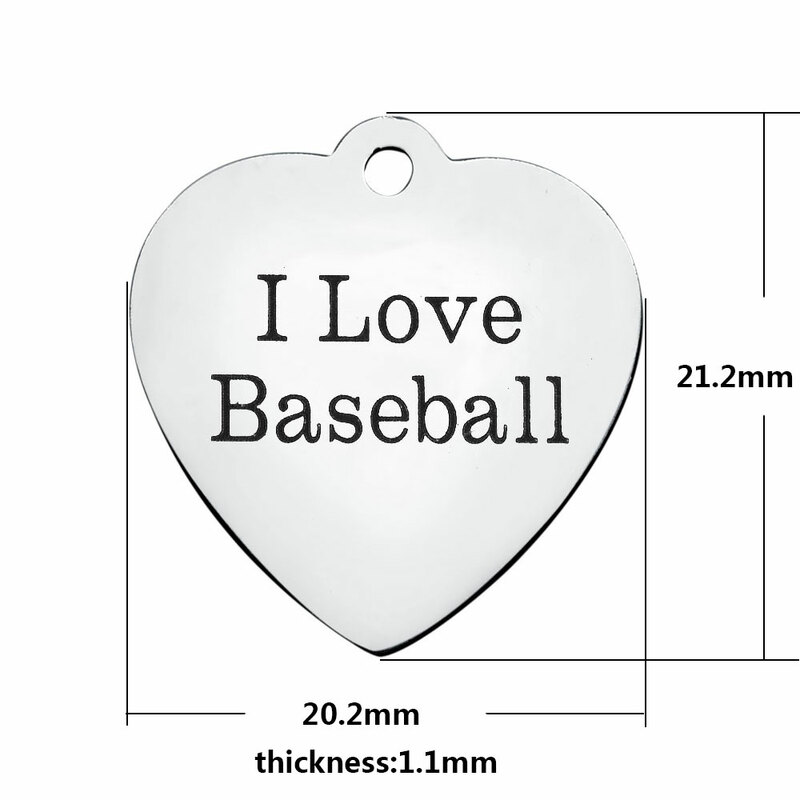 It is durable and scratch resistant. 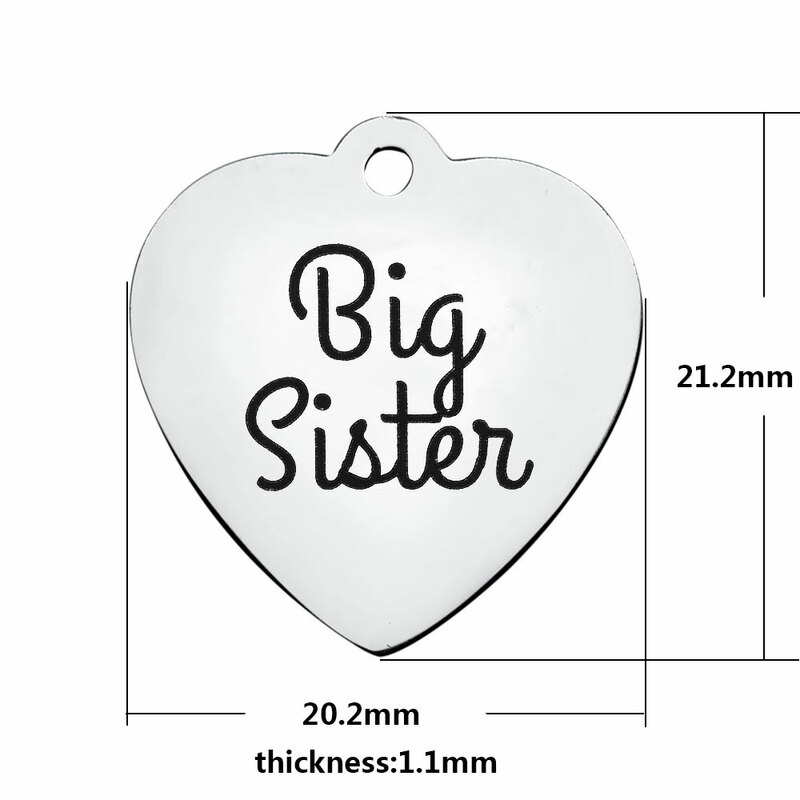 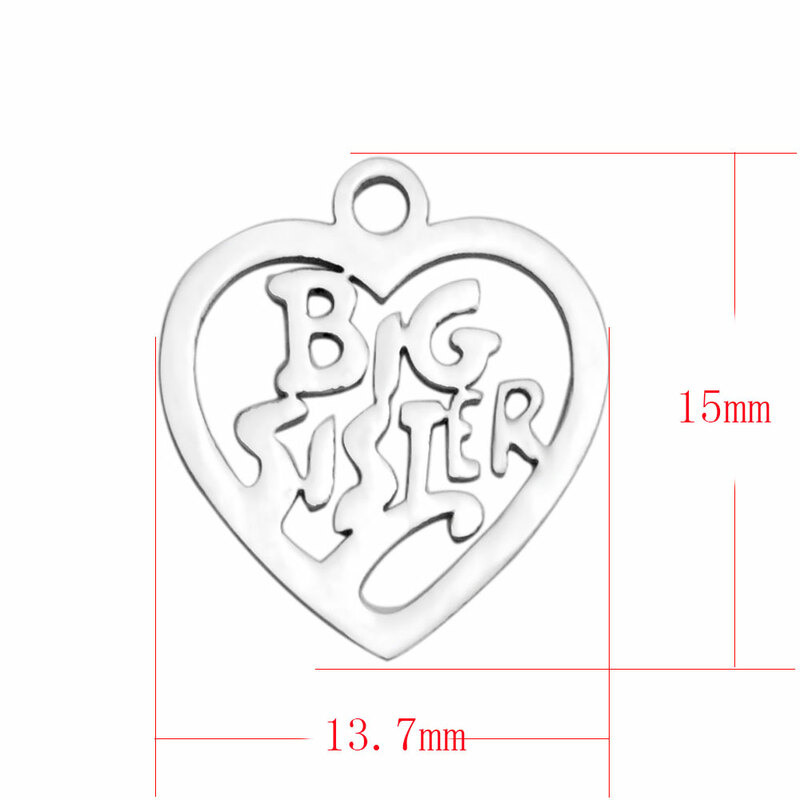 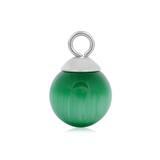 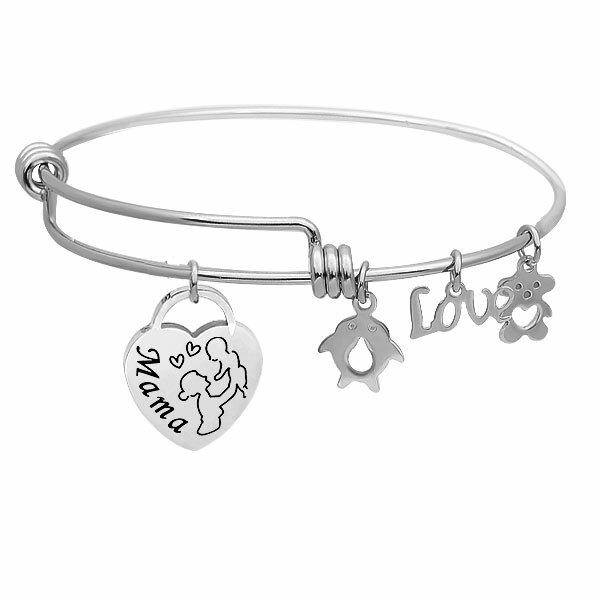 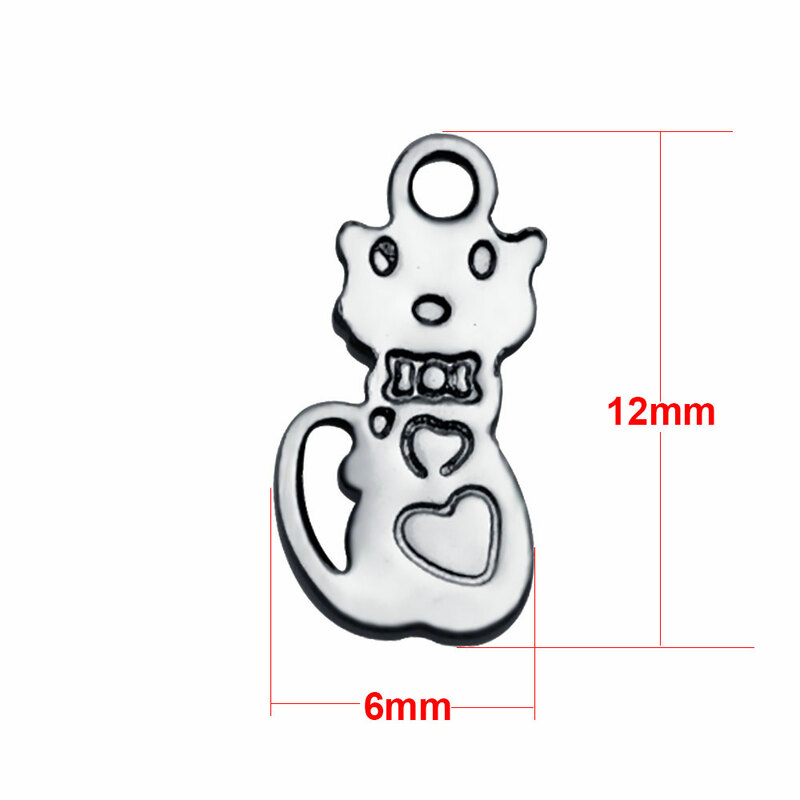 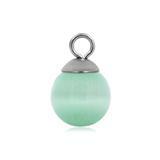 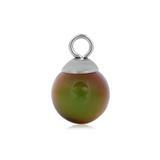 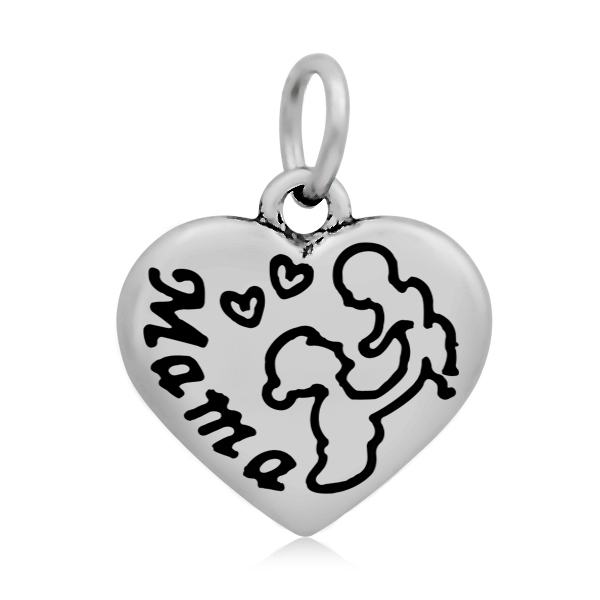 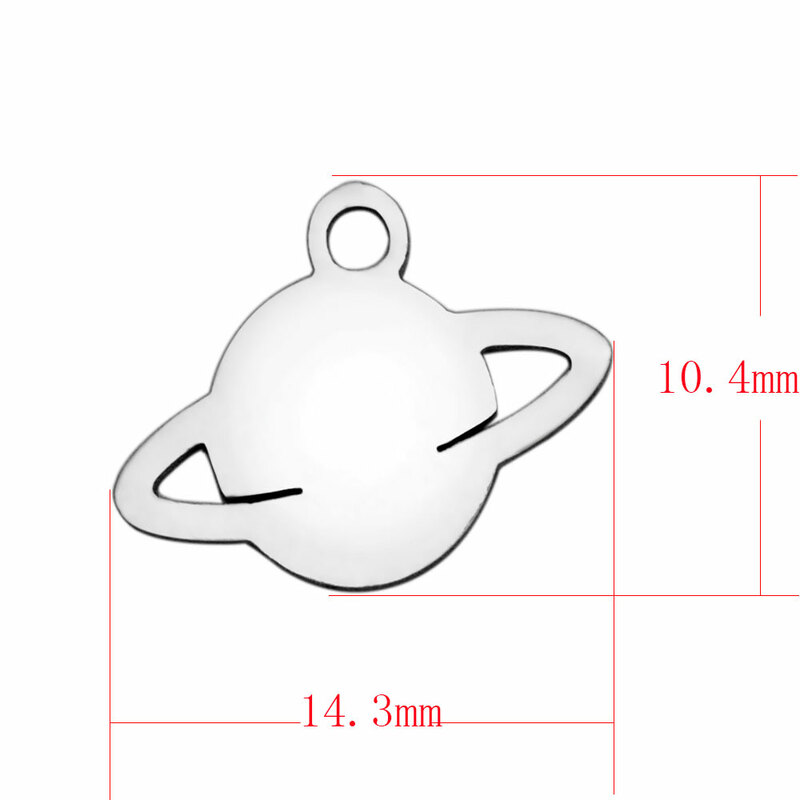 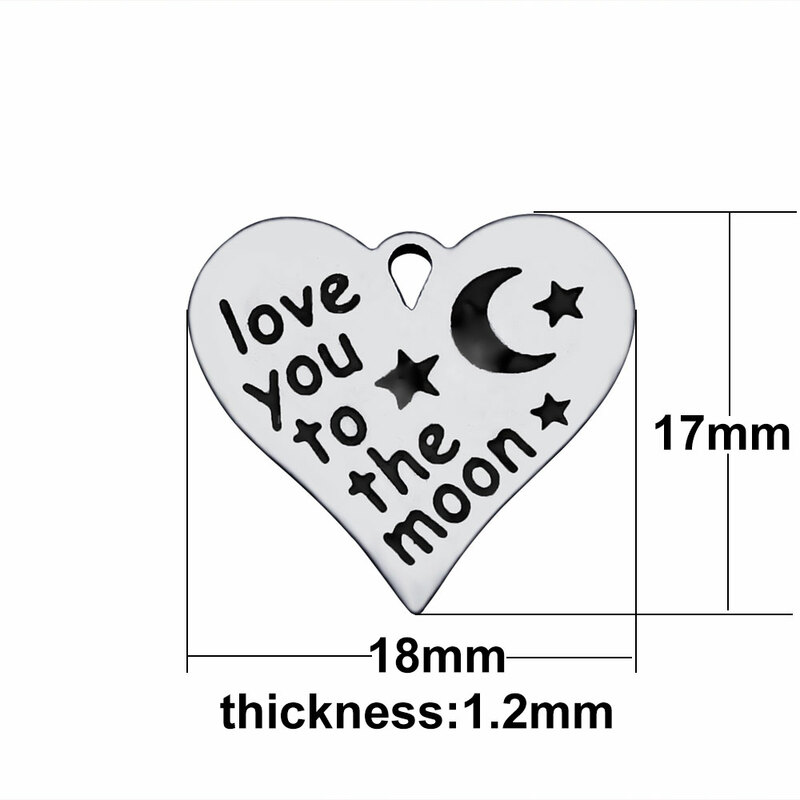 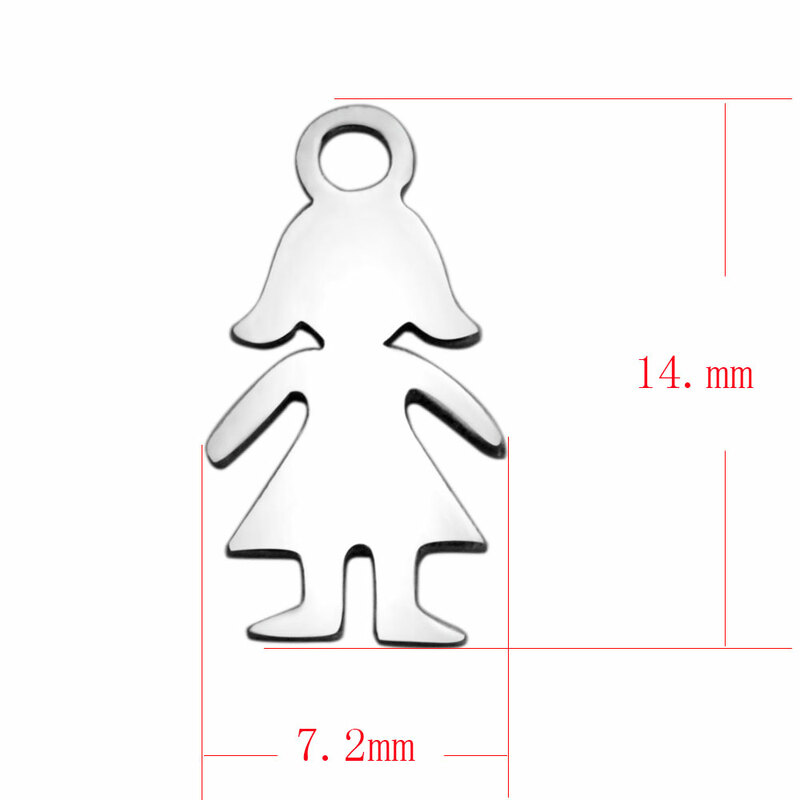 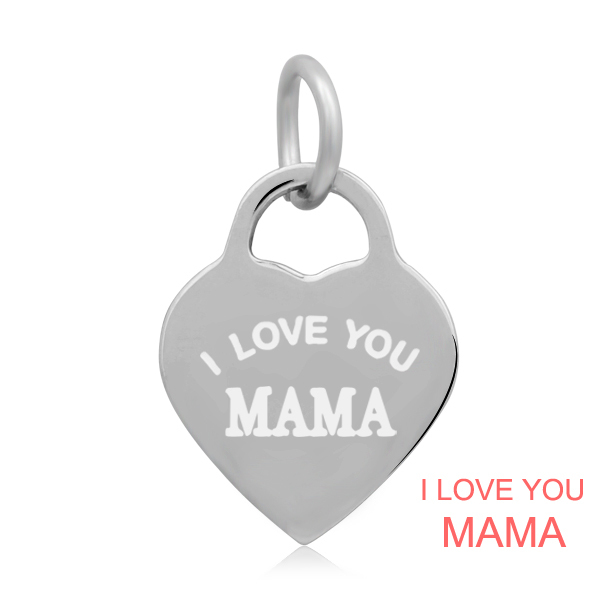 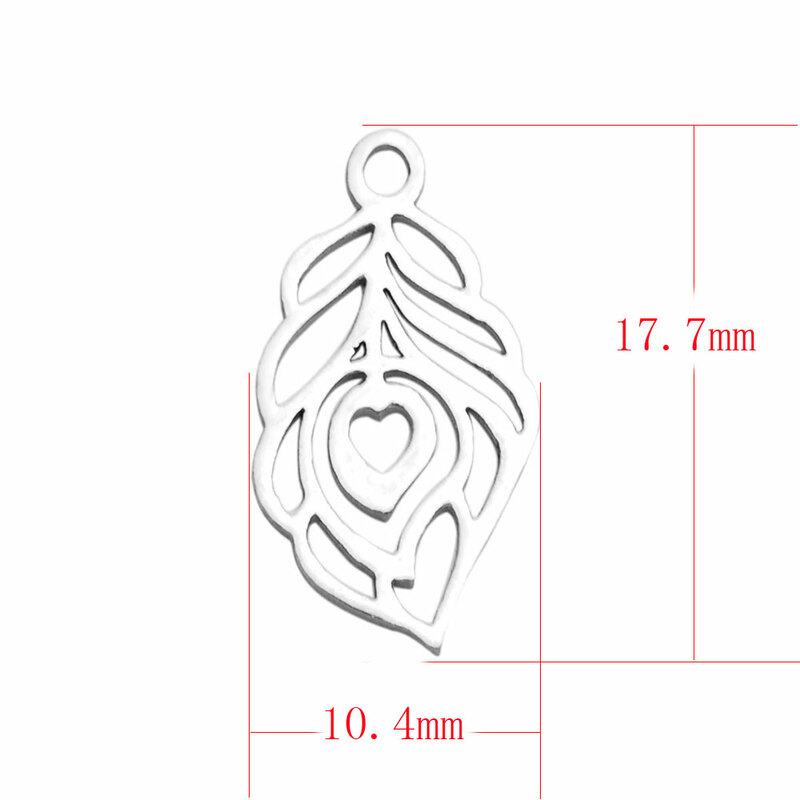 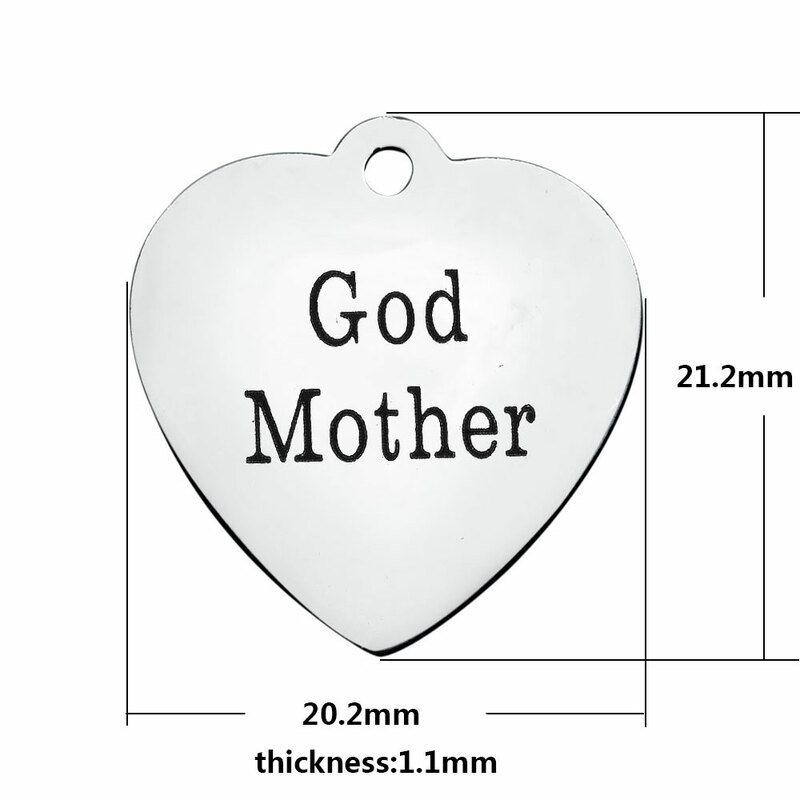 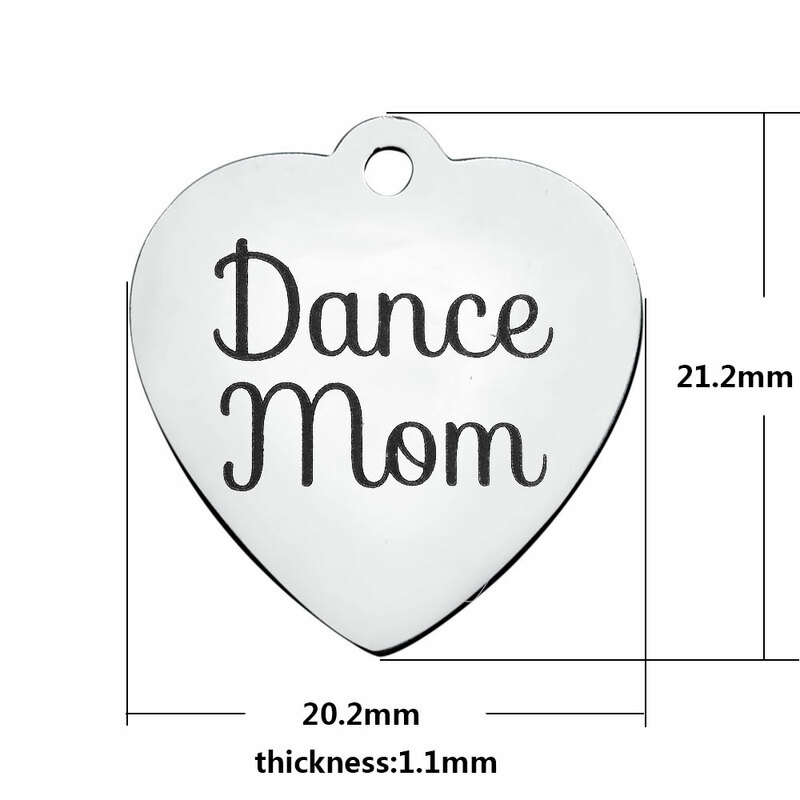 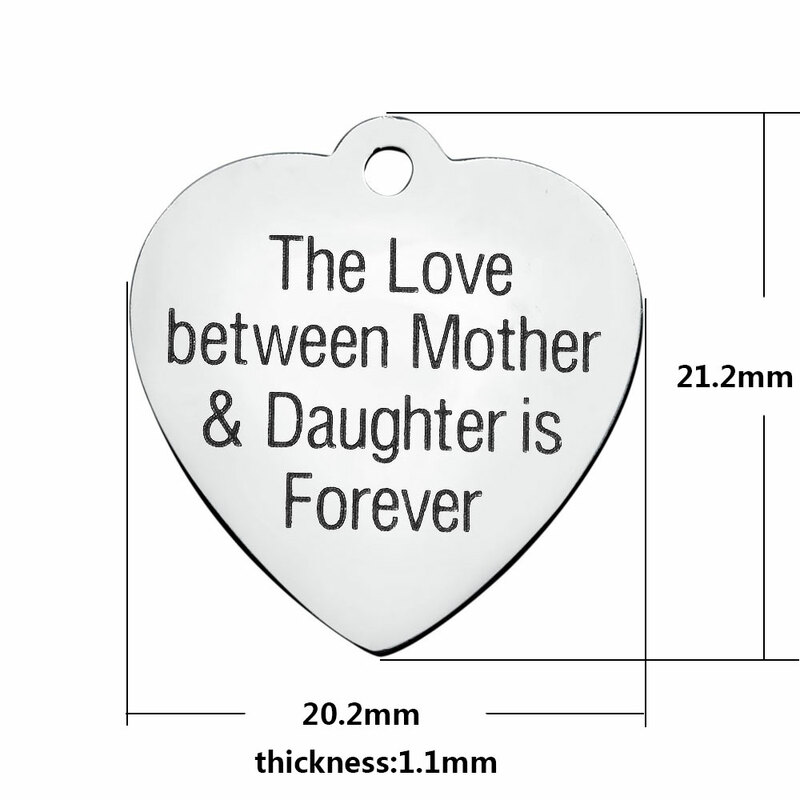 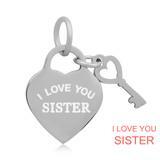 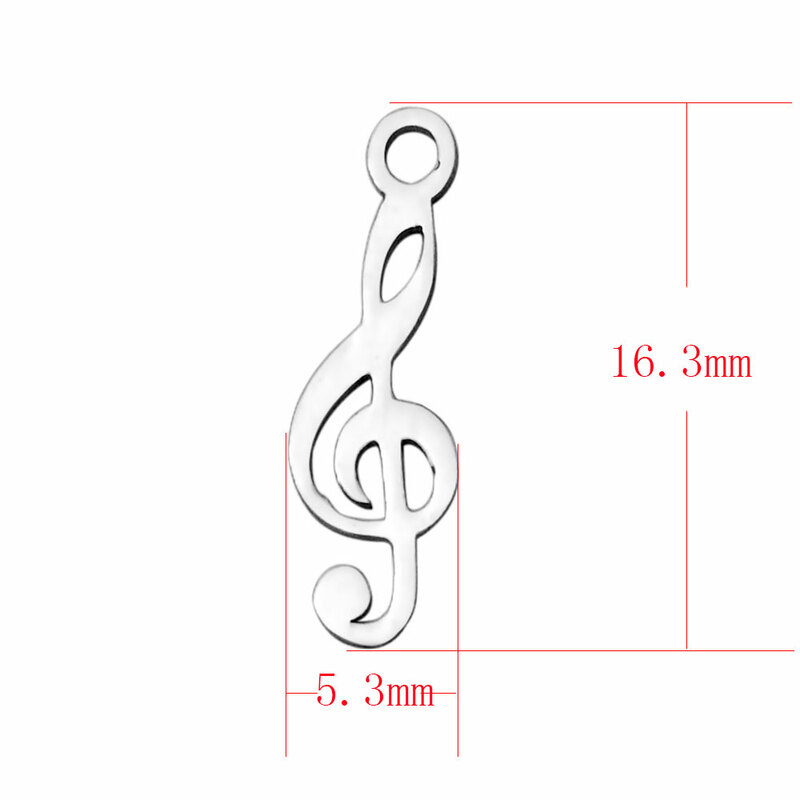 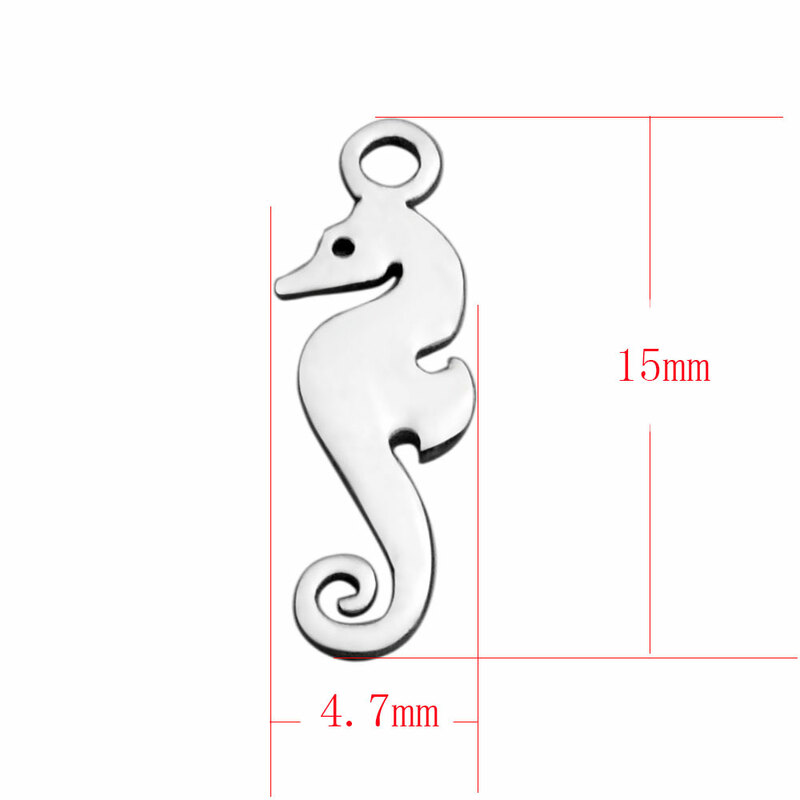 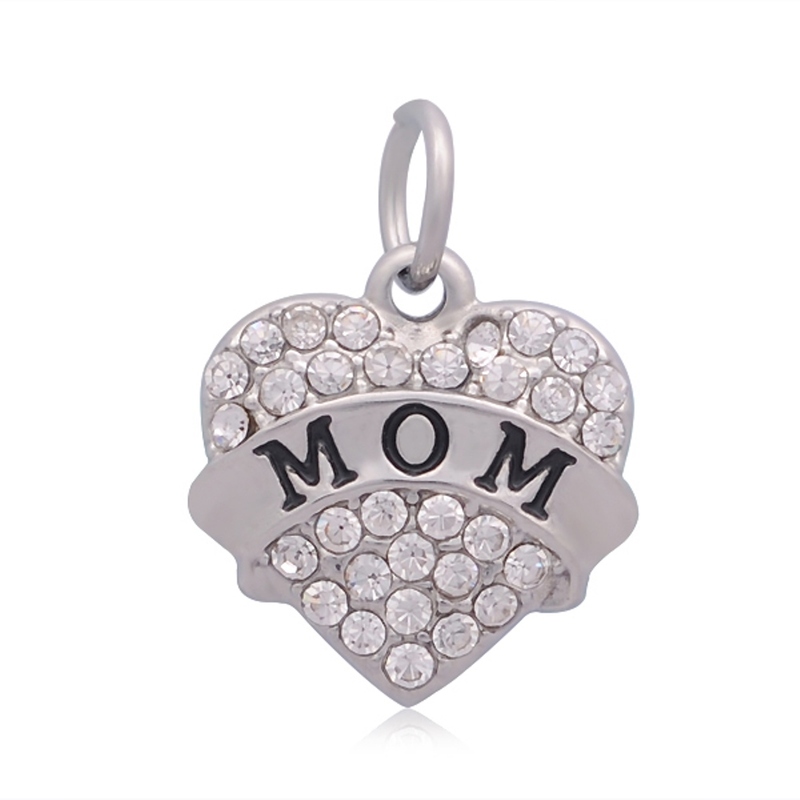 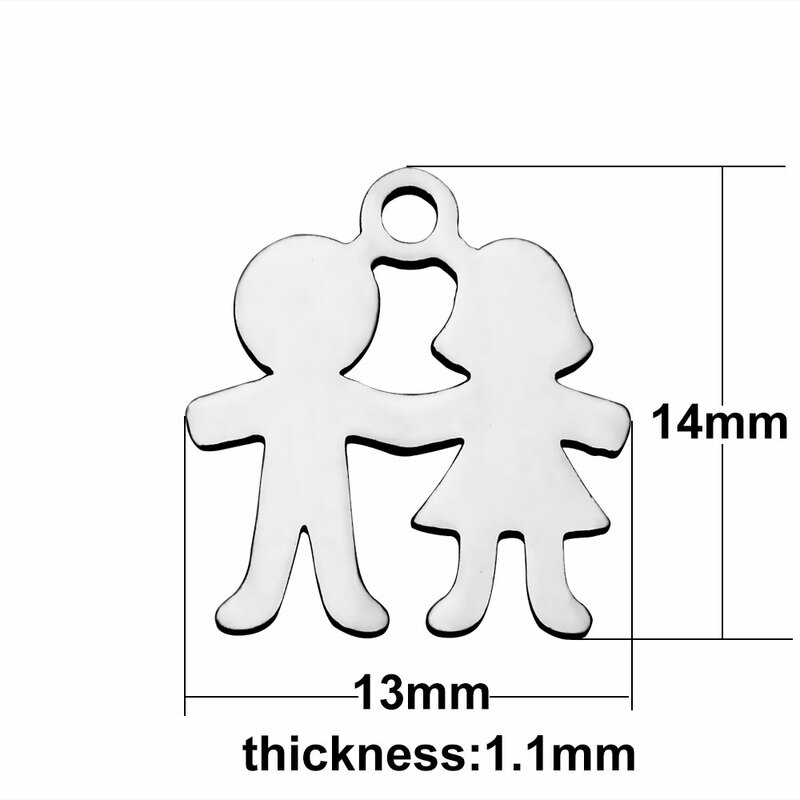 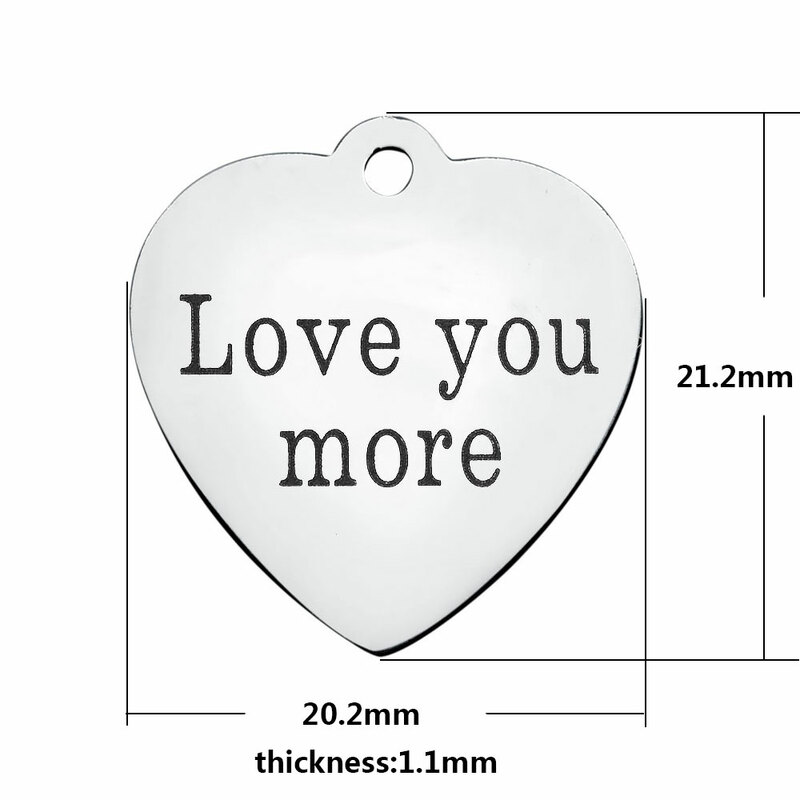 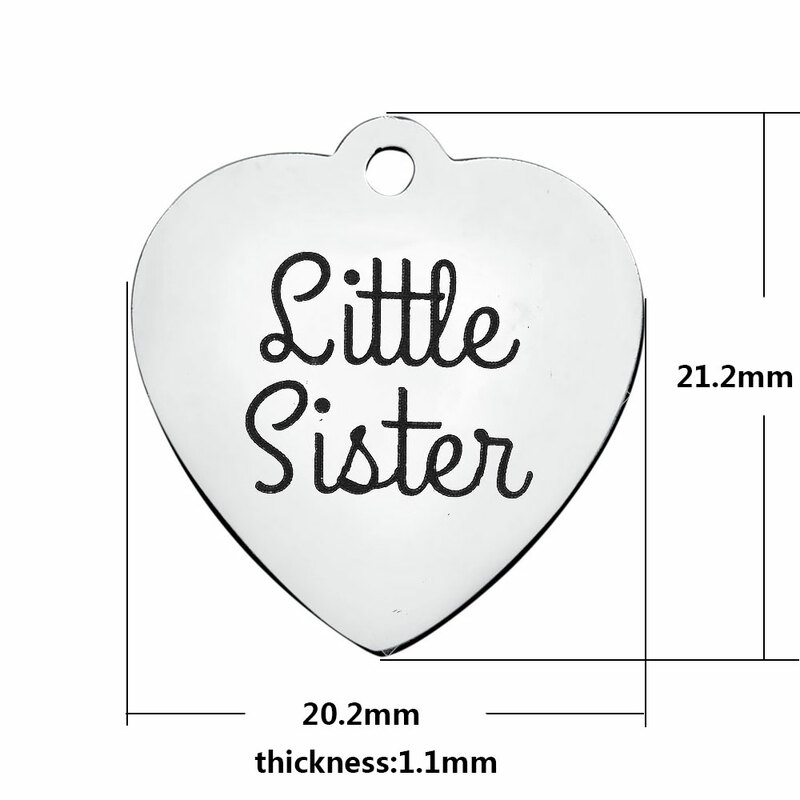 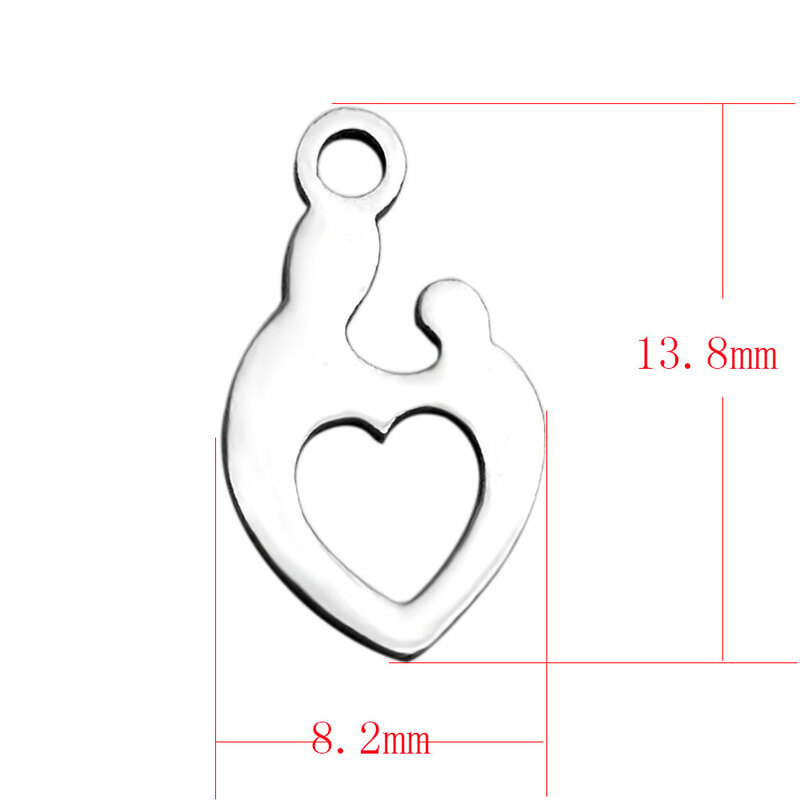 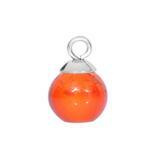 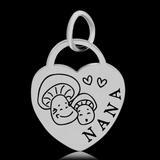 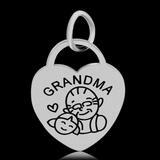 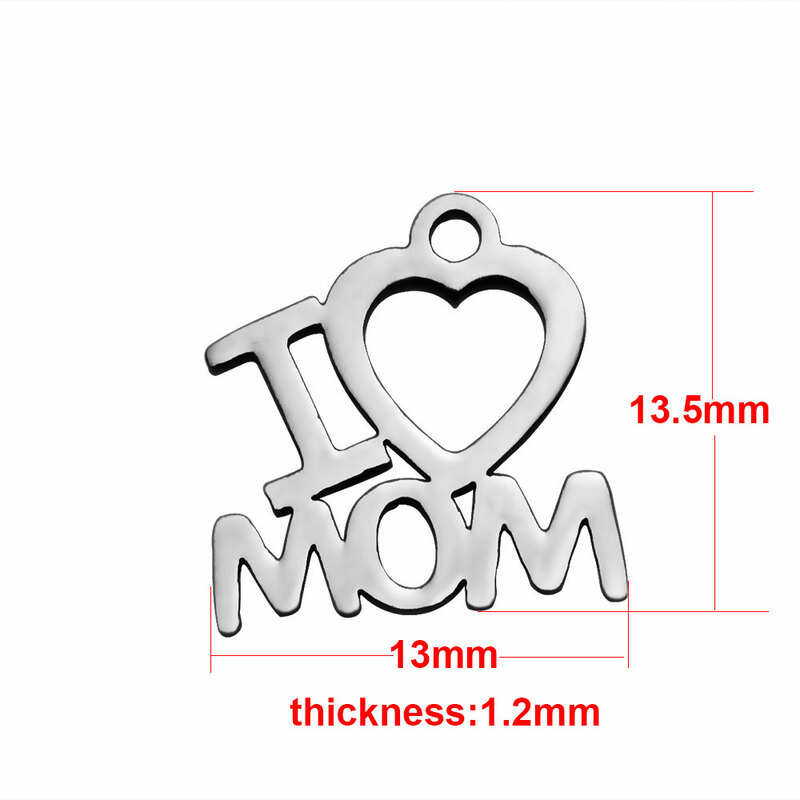 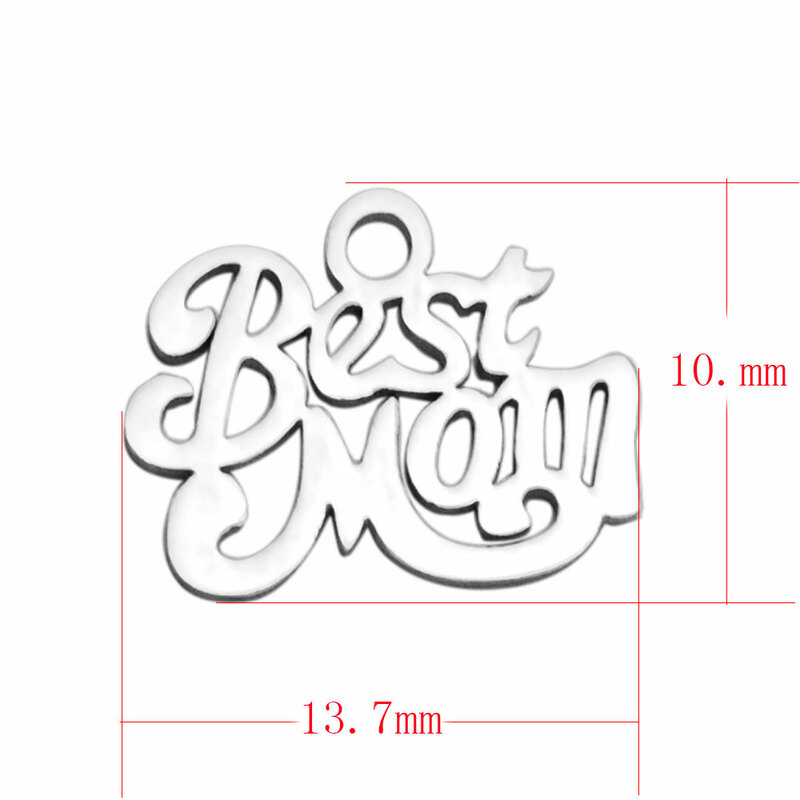 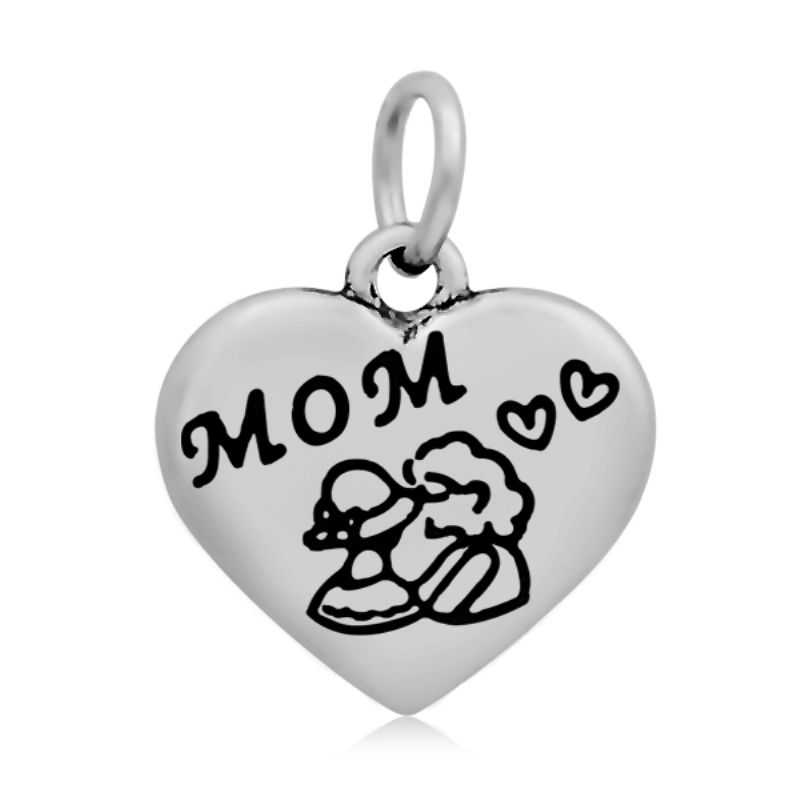 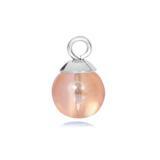 20.2*21.2mm Medium Stainless Steel Charm - Love Between Mother.. 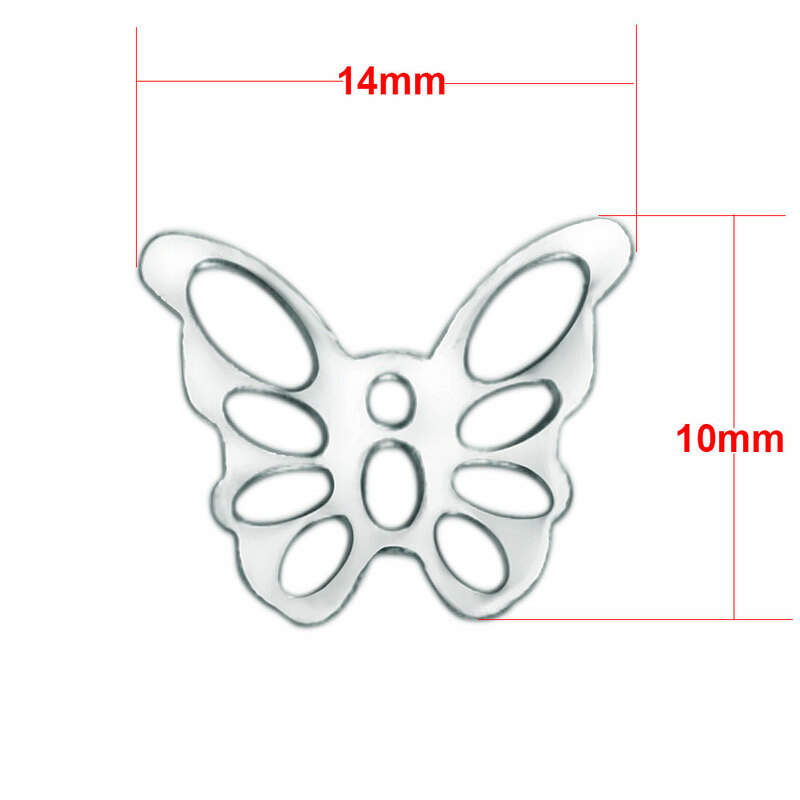 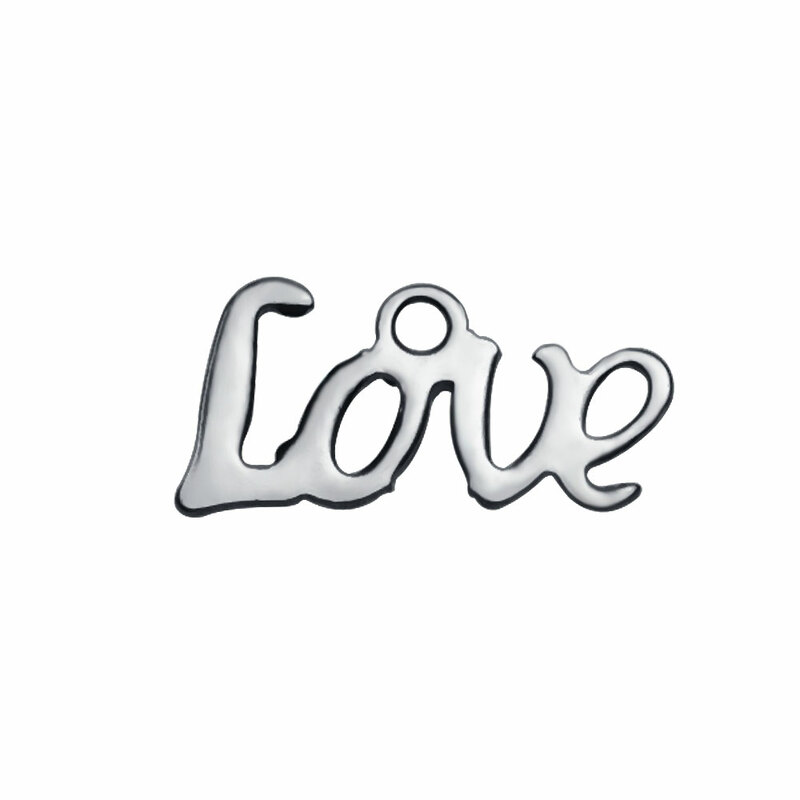 Stainless Steel Jewelry will not tarnish or rust. 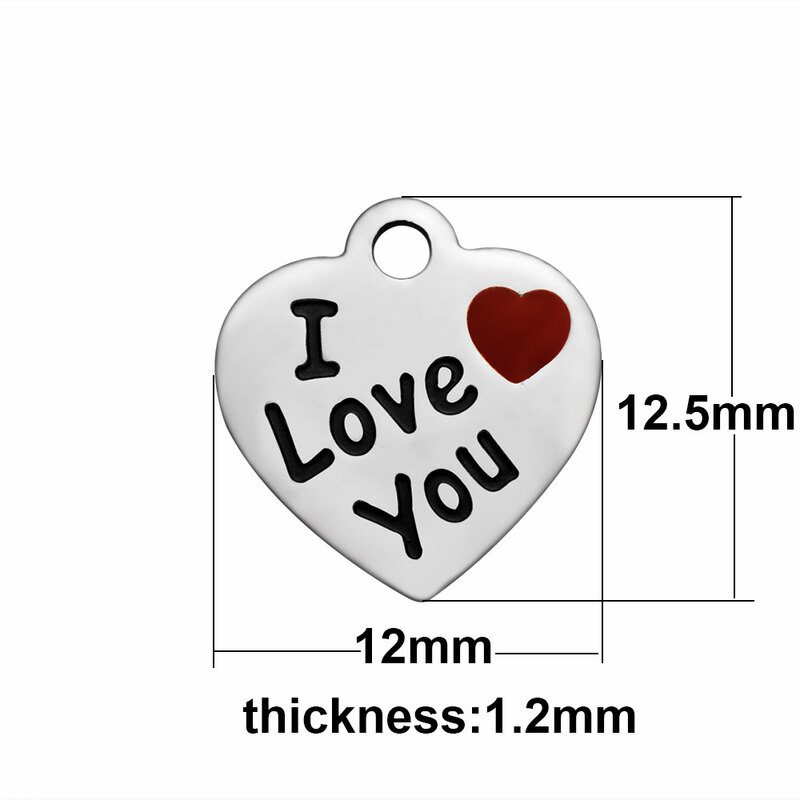 It is durable and scratch resistant. 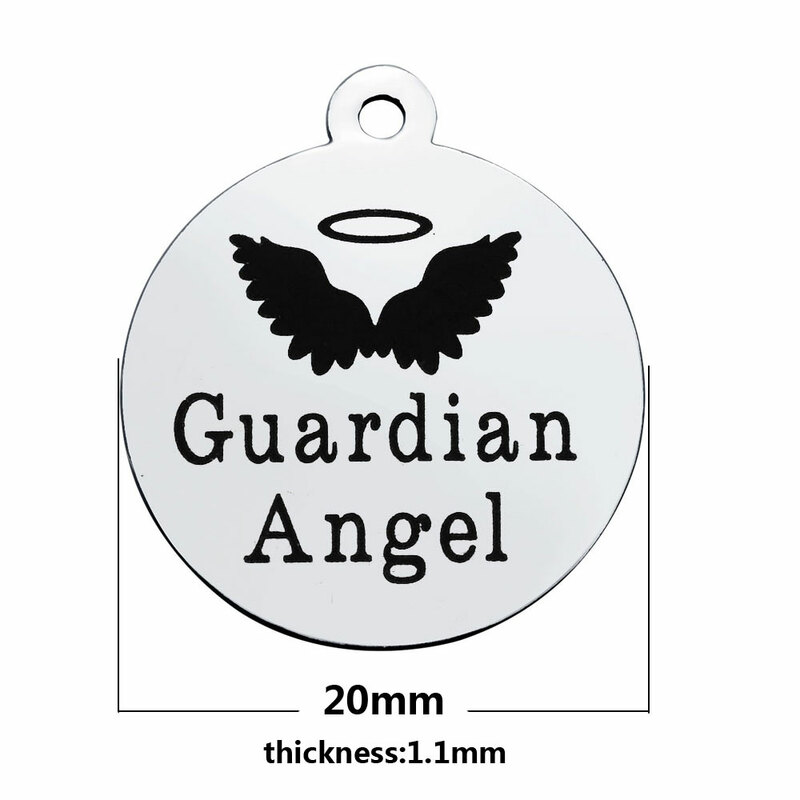 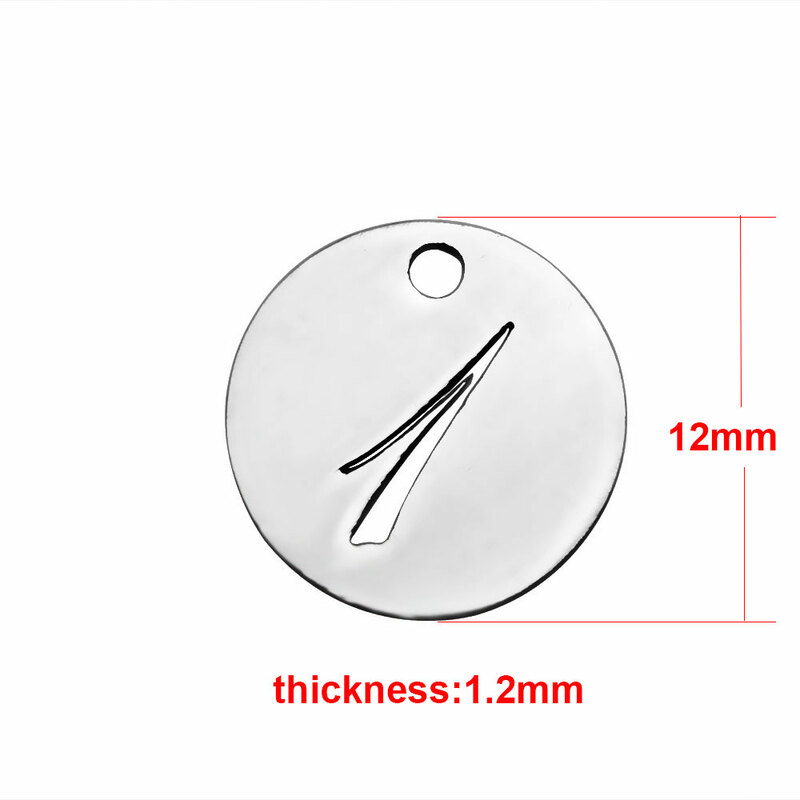 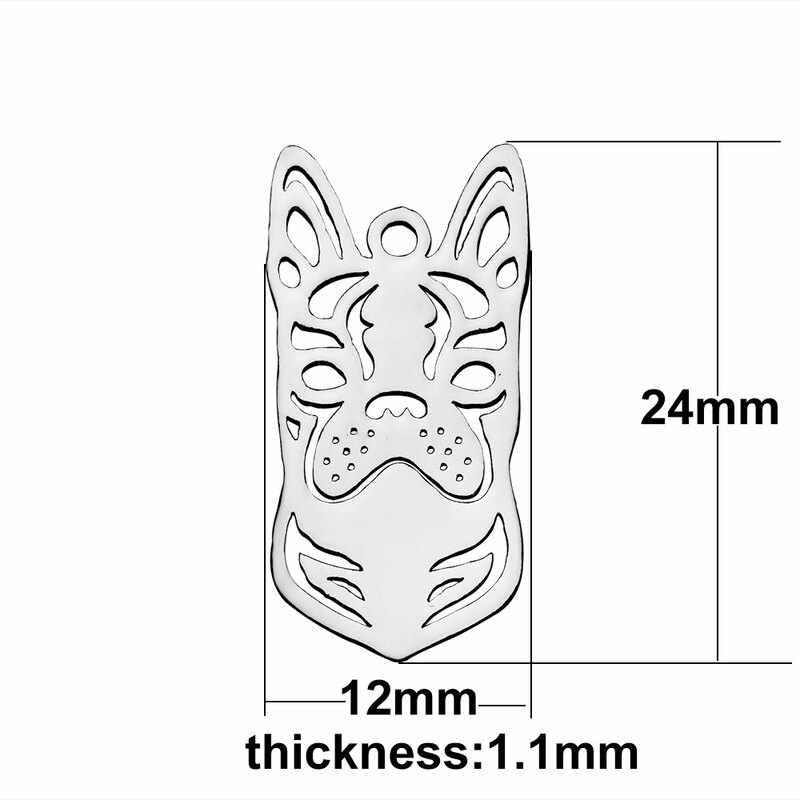 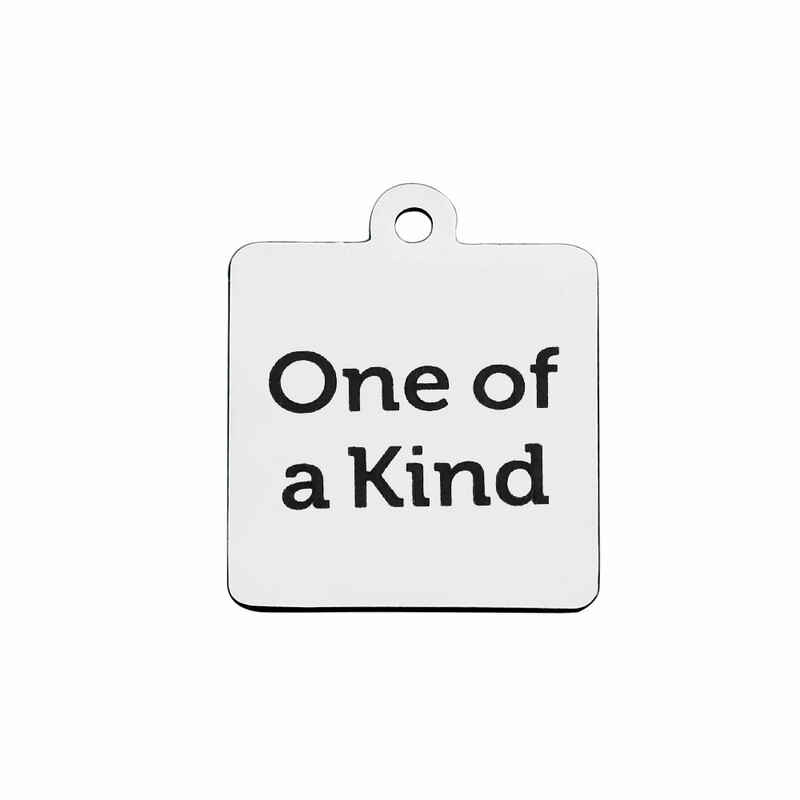 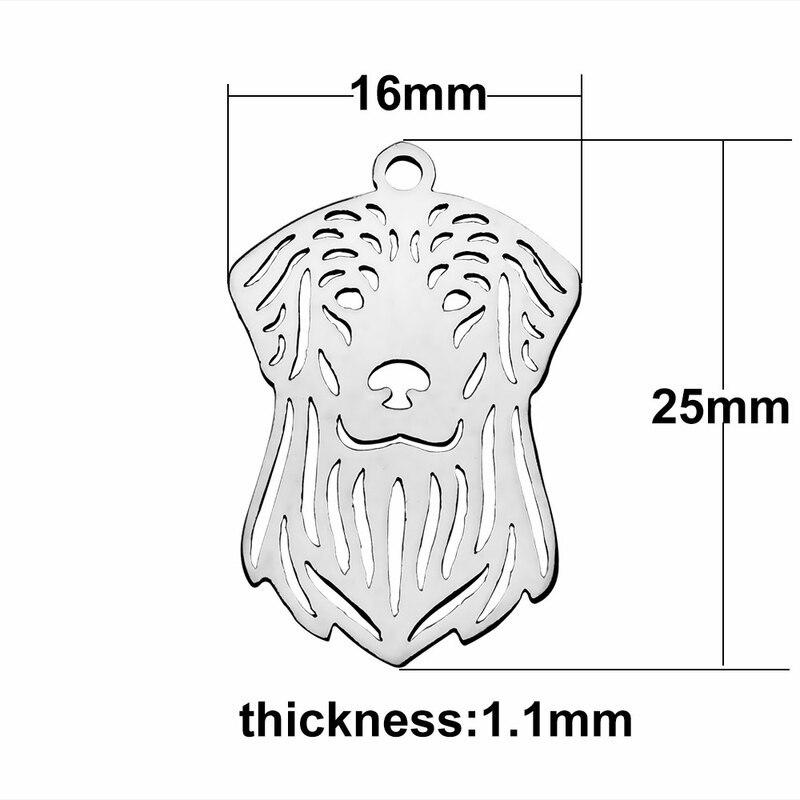 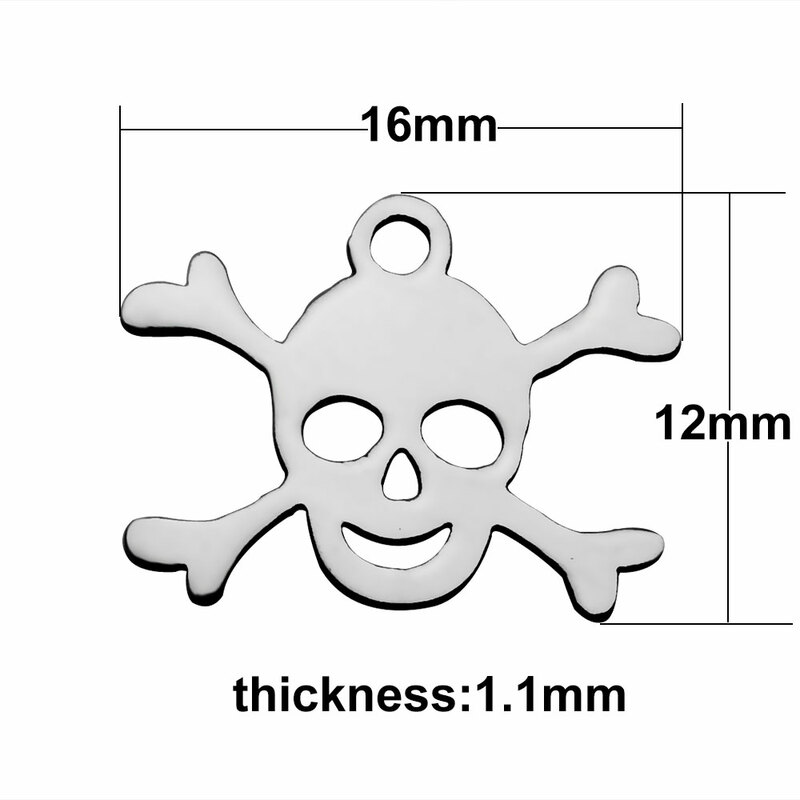 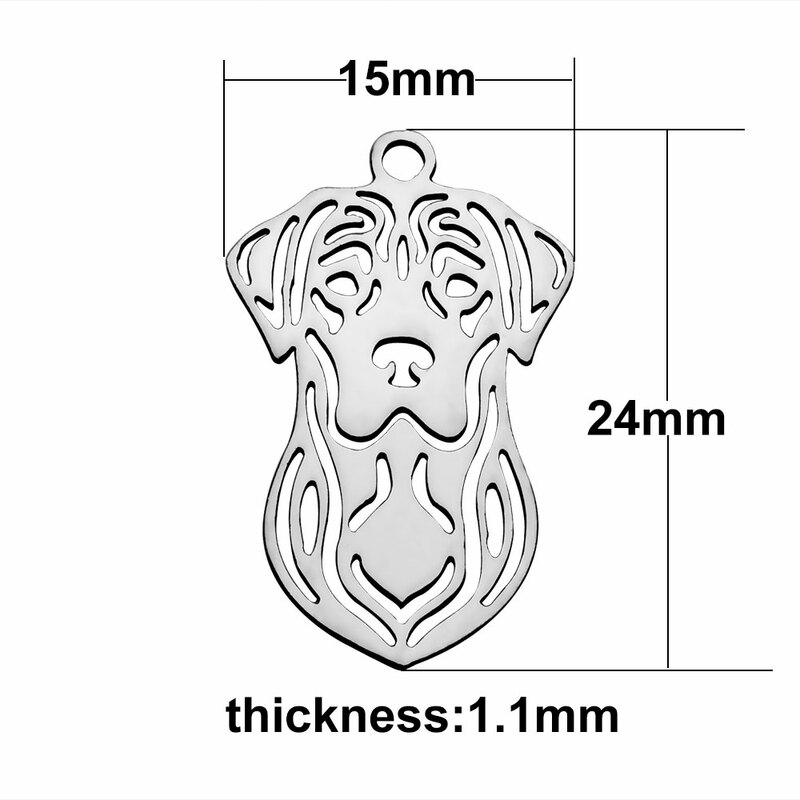 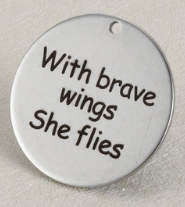 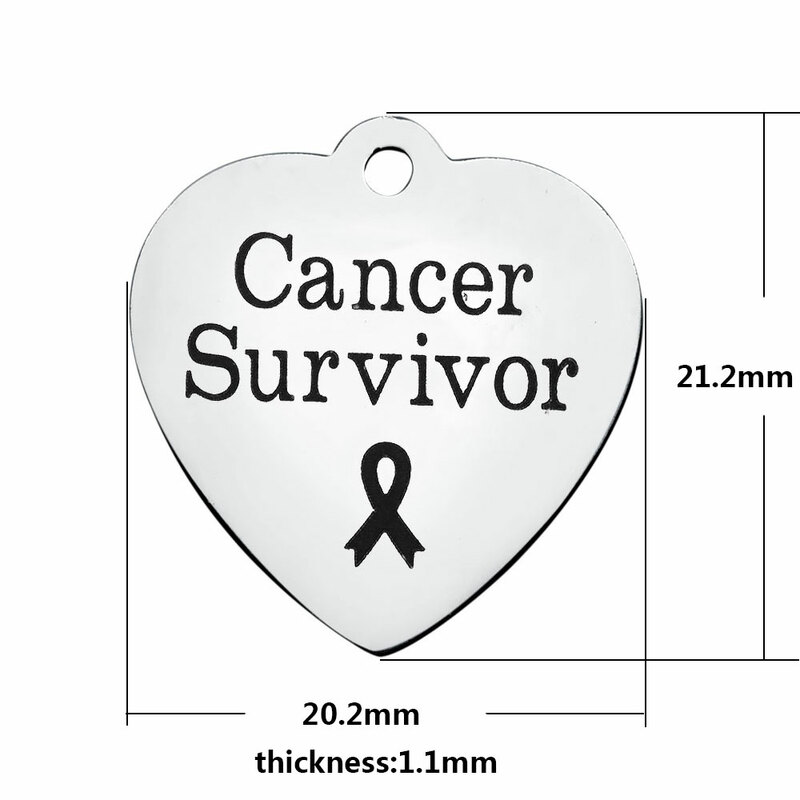 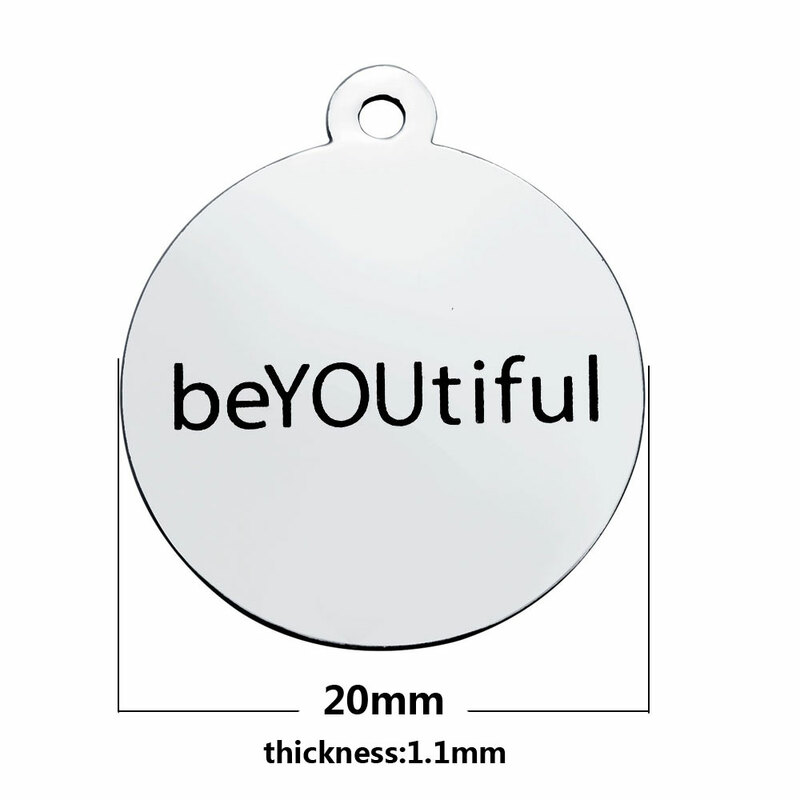 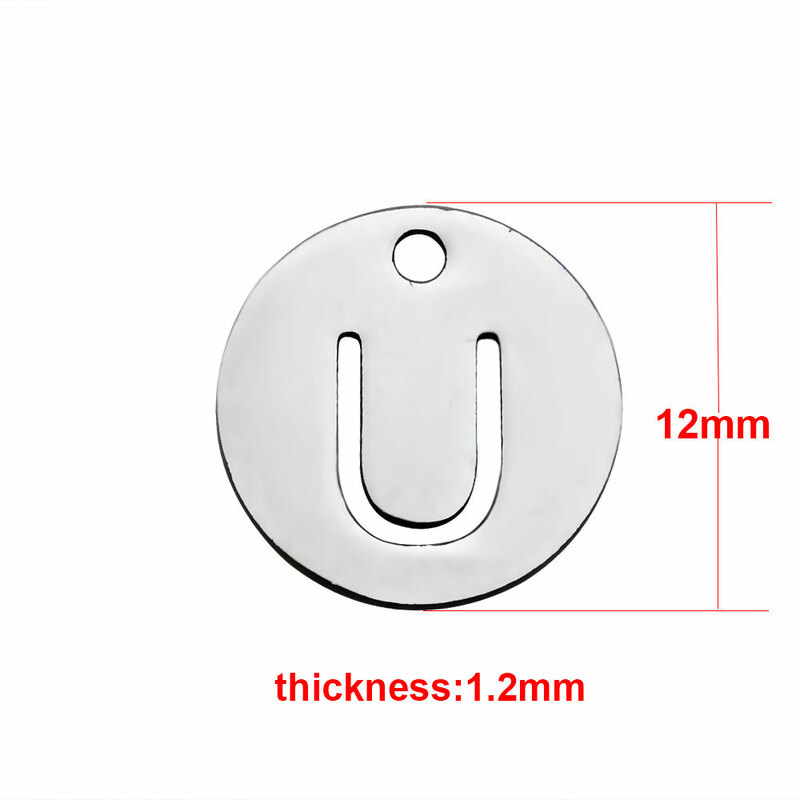 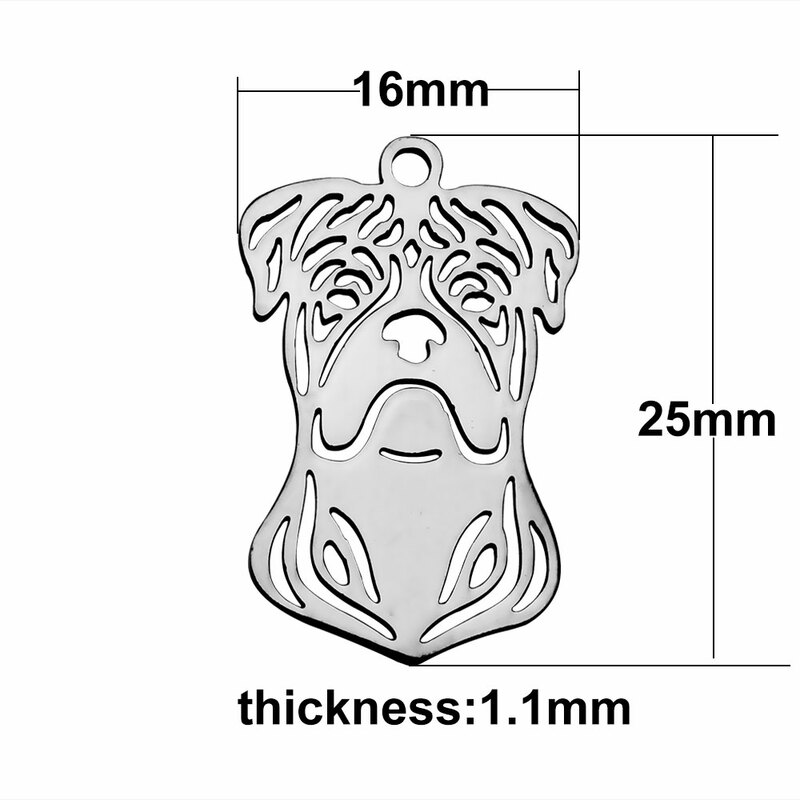 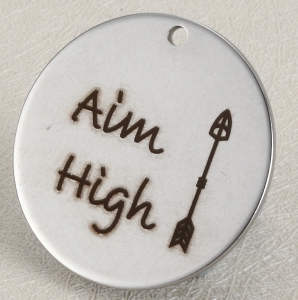 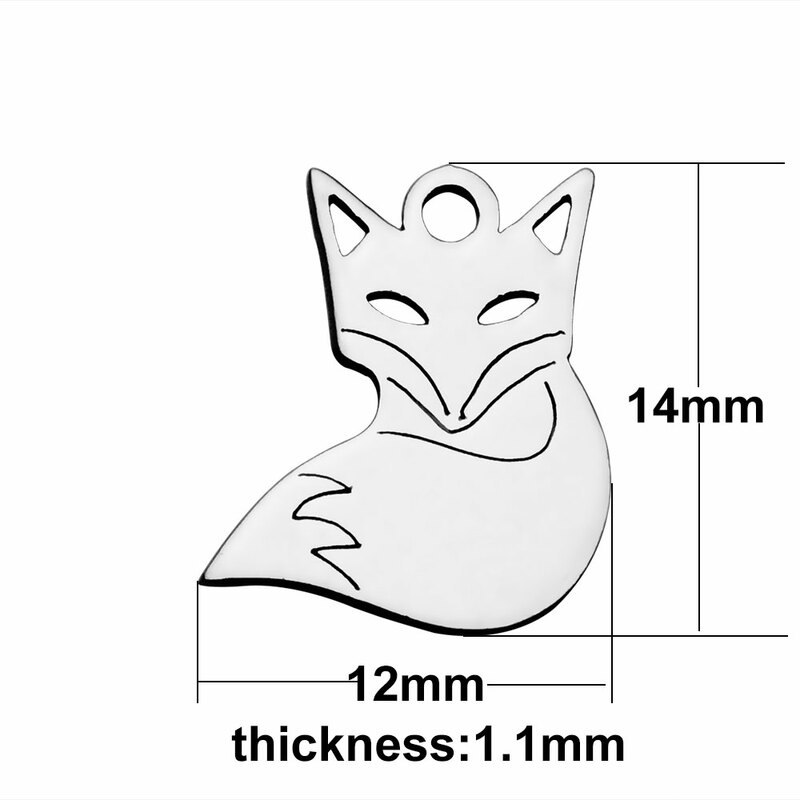 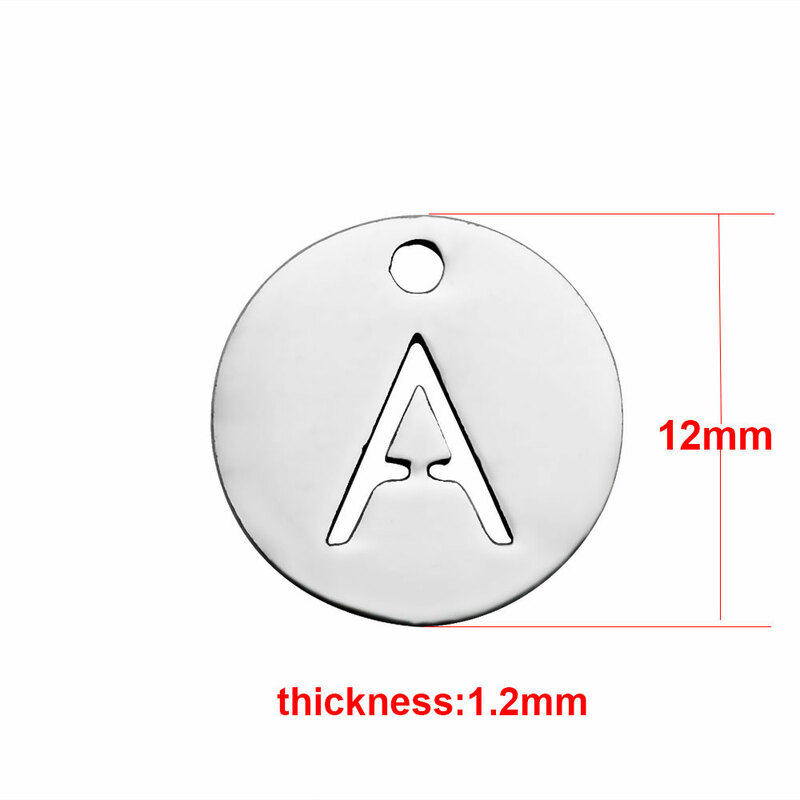 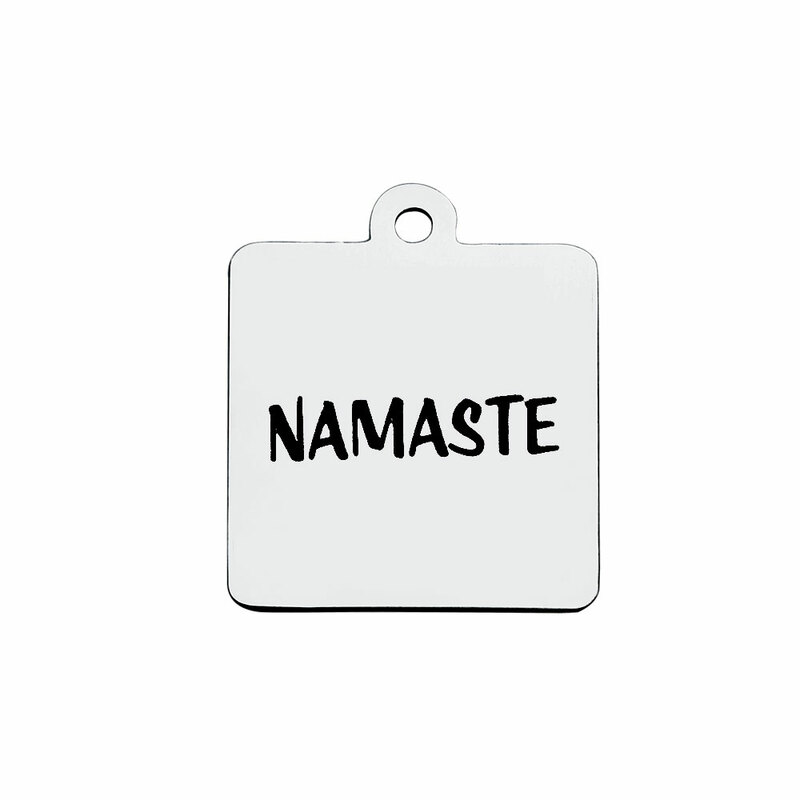 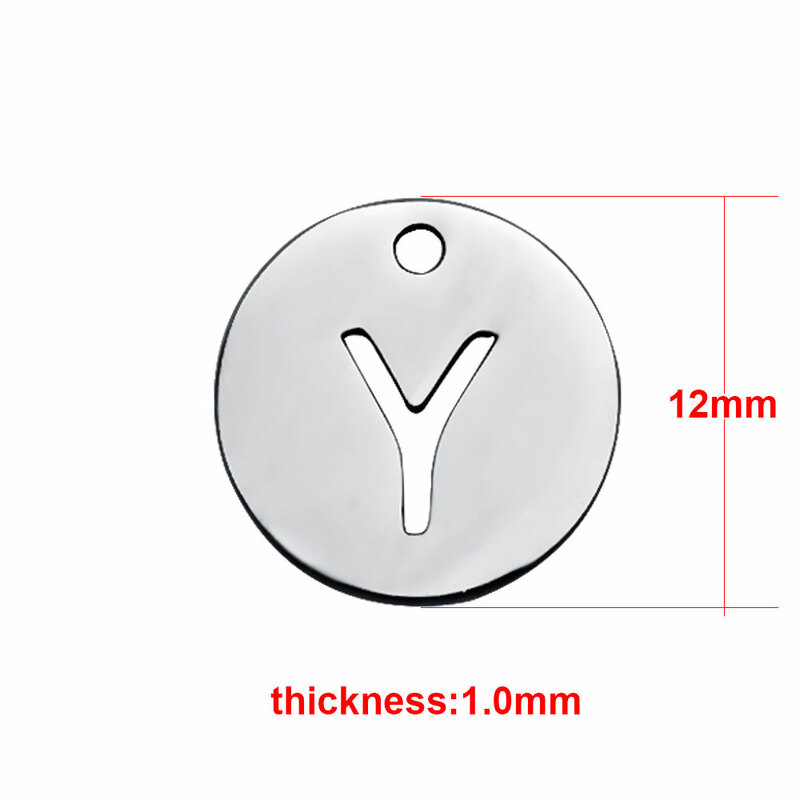 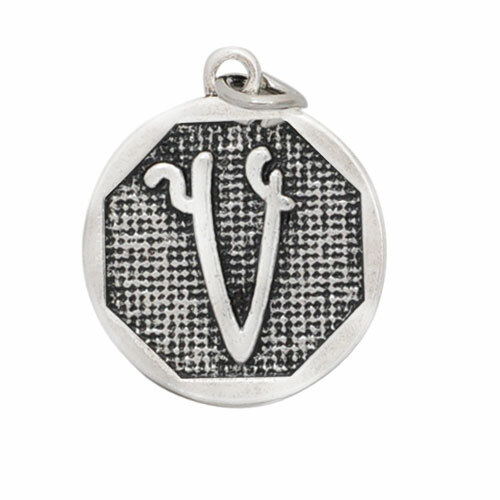 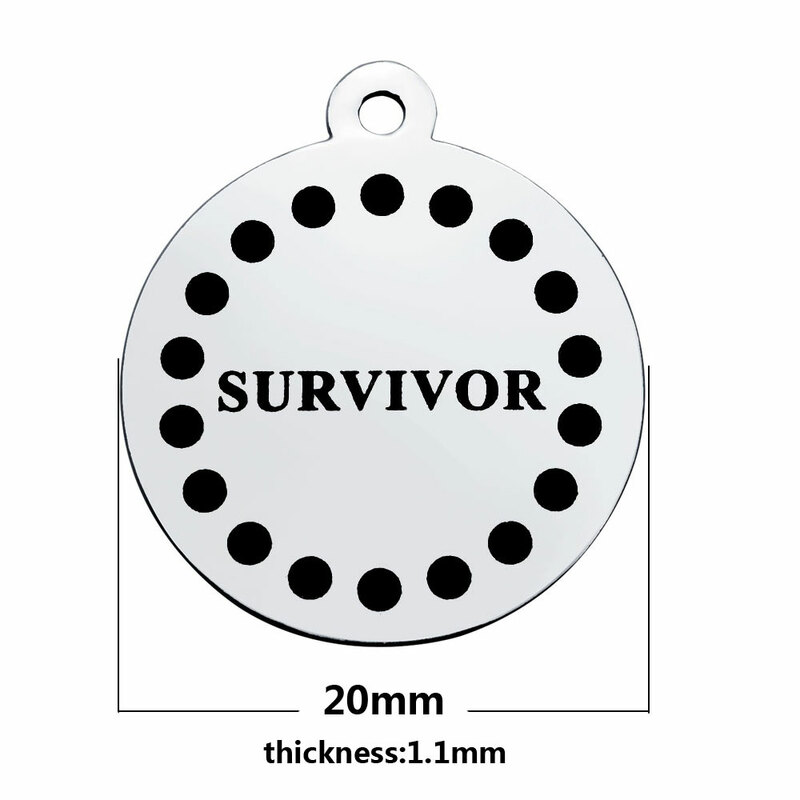 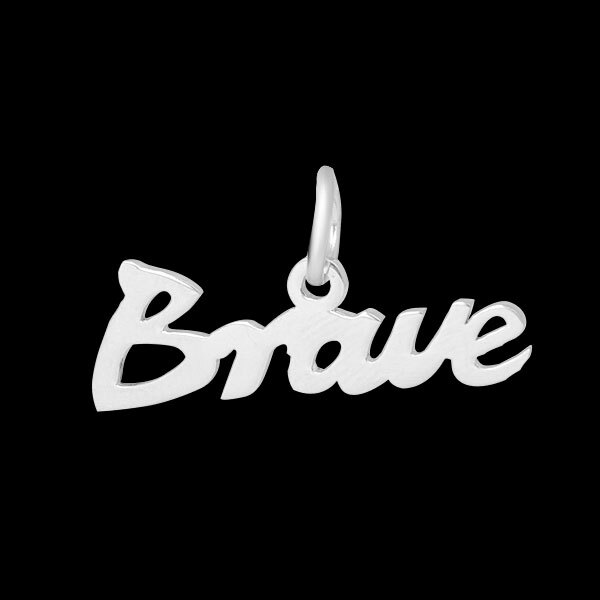 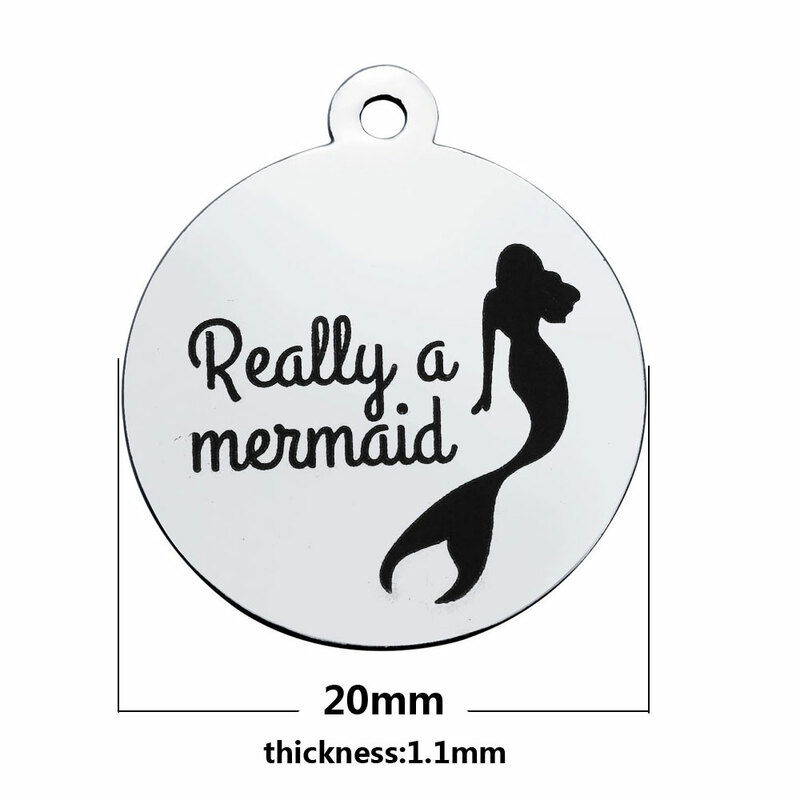 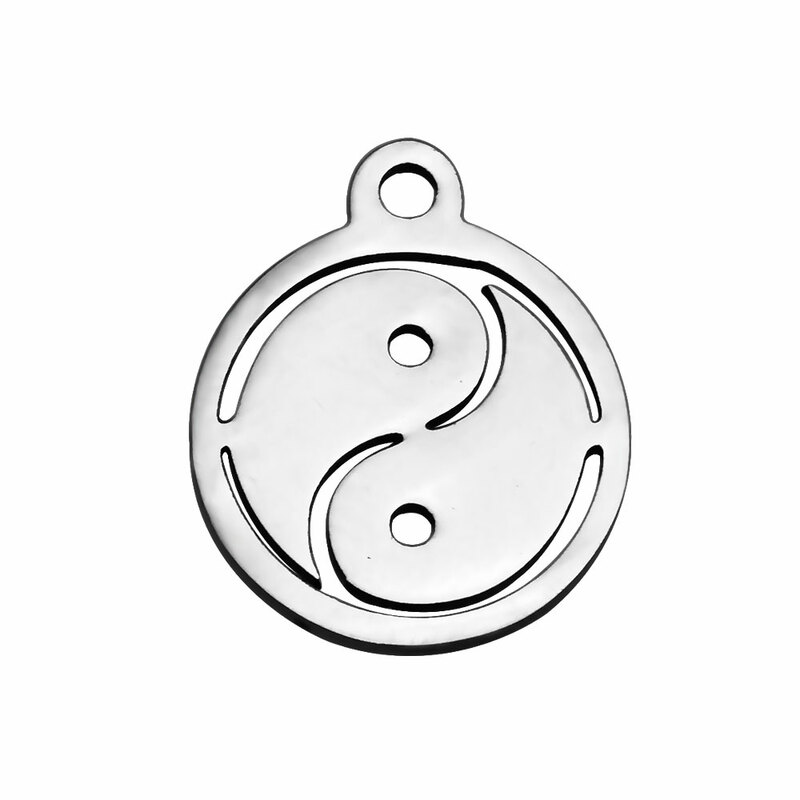 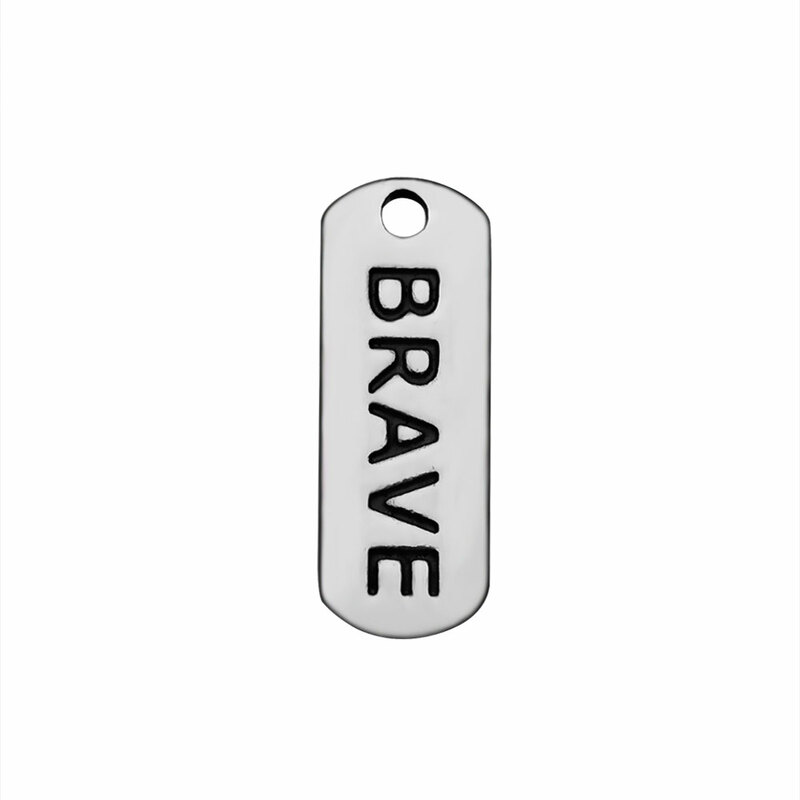 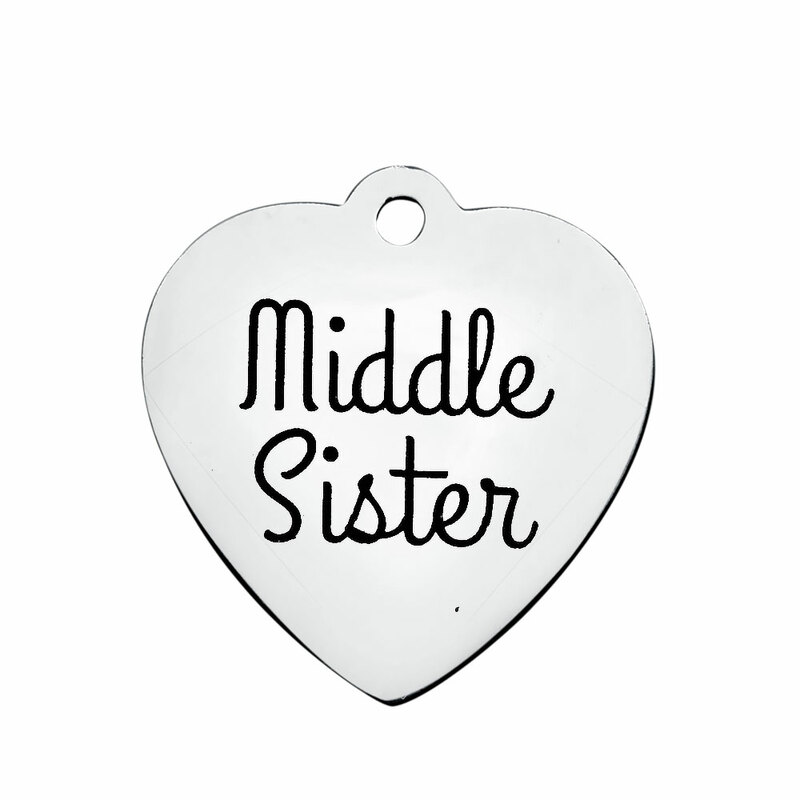 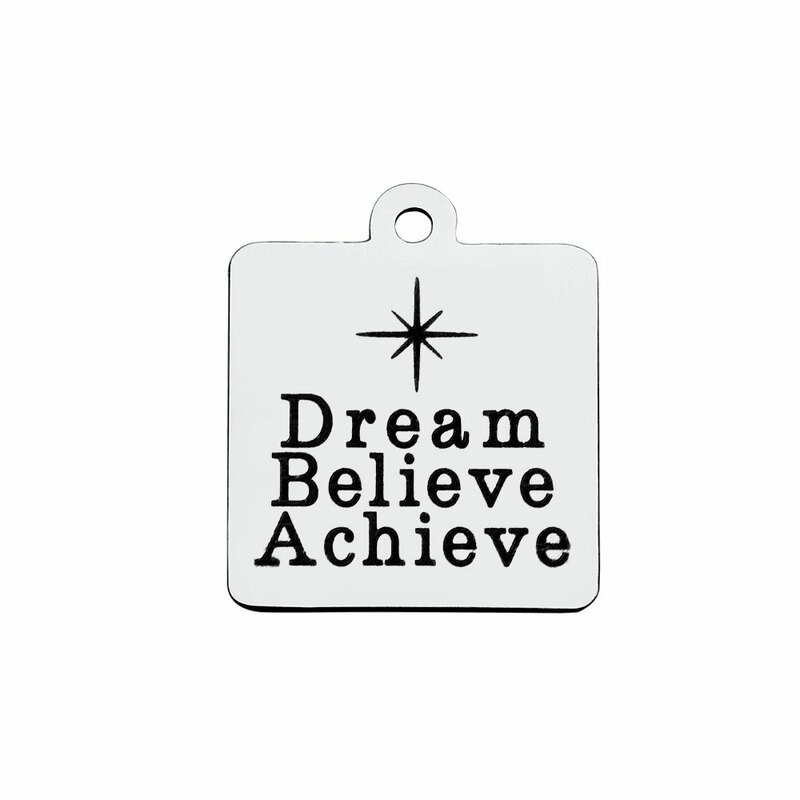 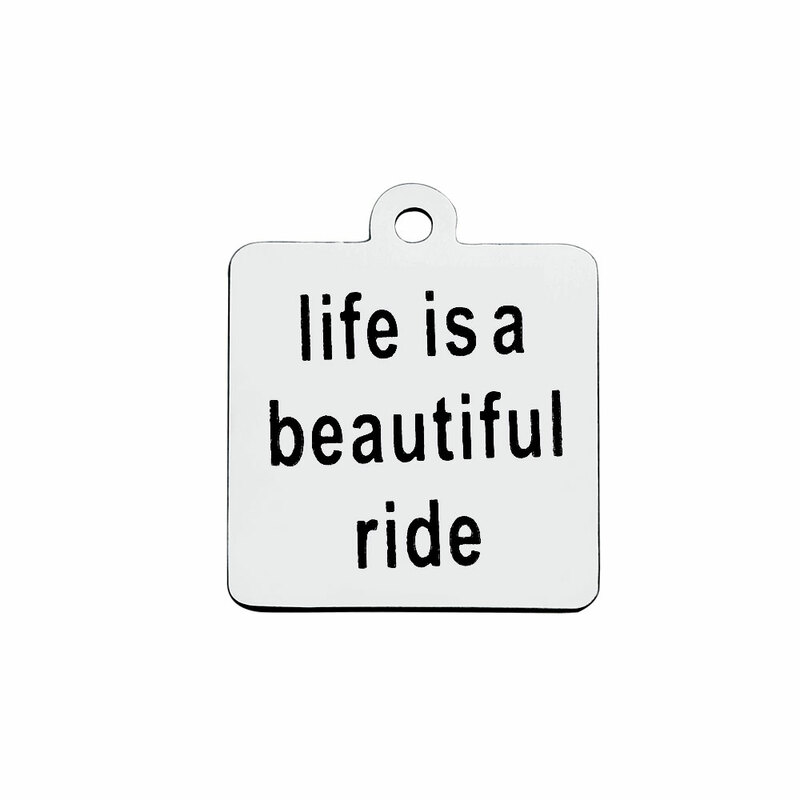 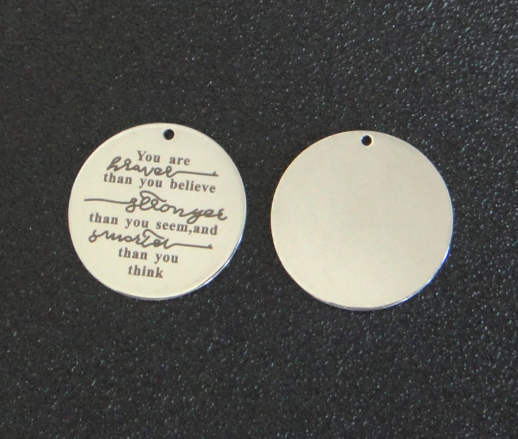 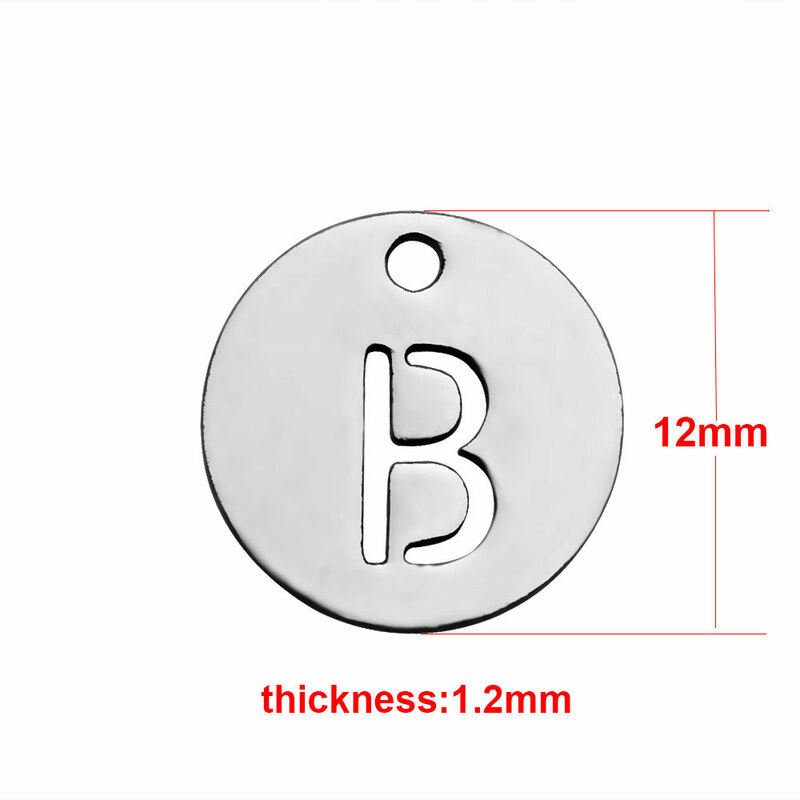 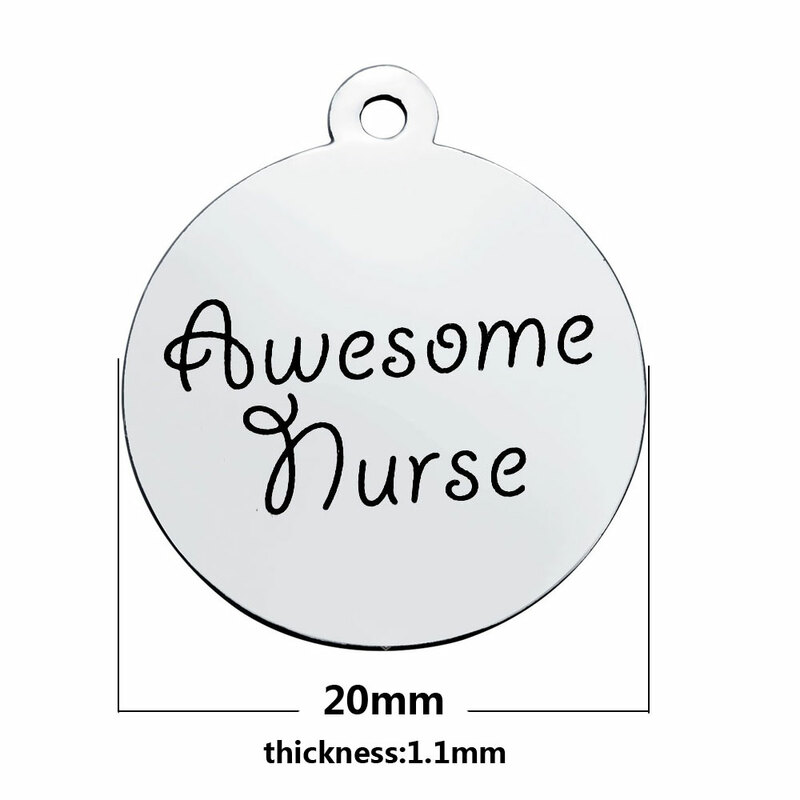 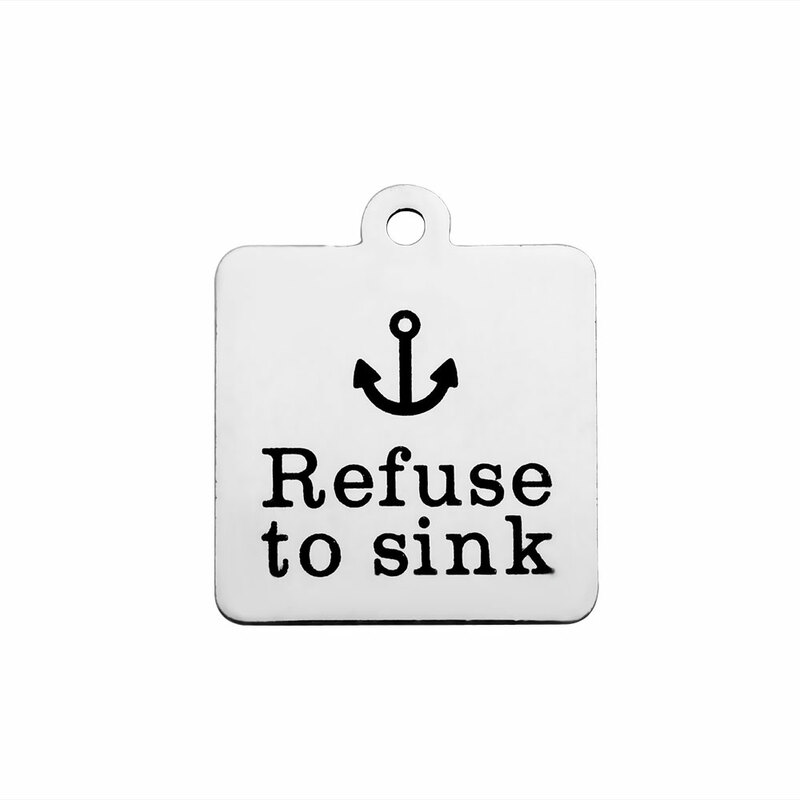 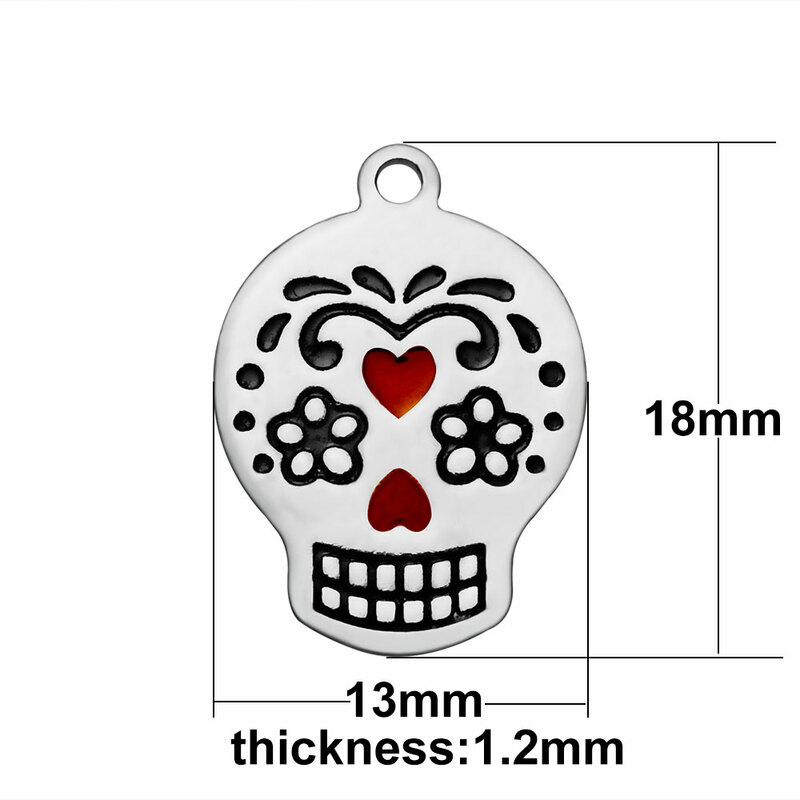 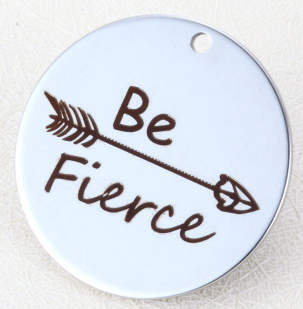 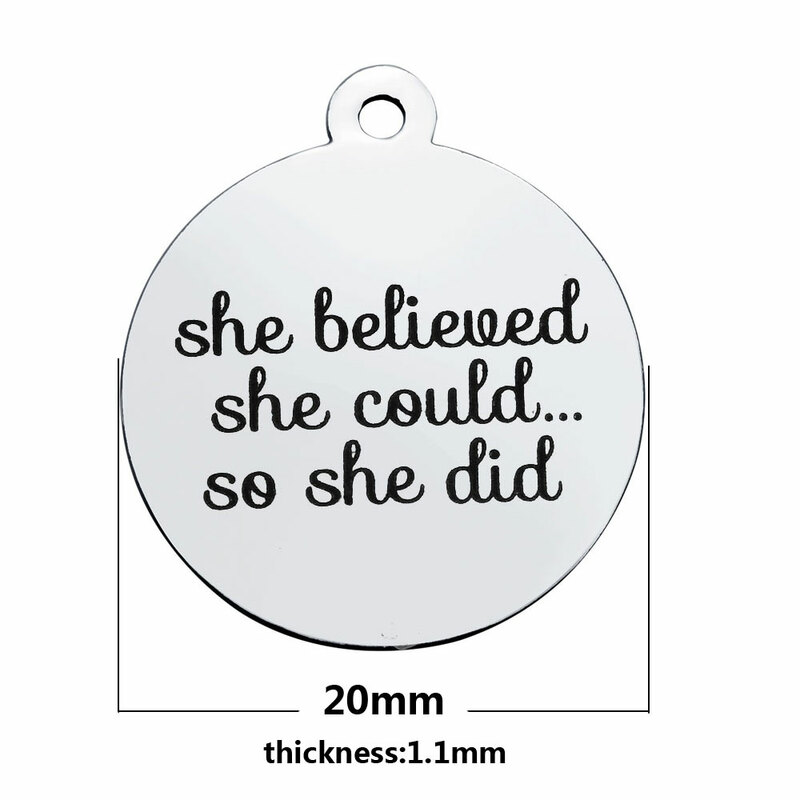 Medium Tag Charm Pendant - 25mm You are Braver than you believe Stronger than you seem, and Smarter than you think. 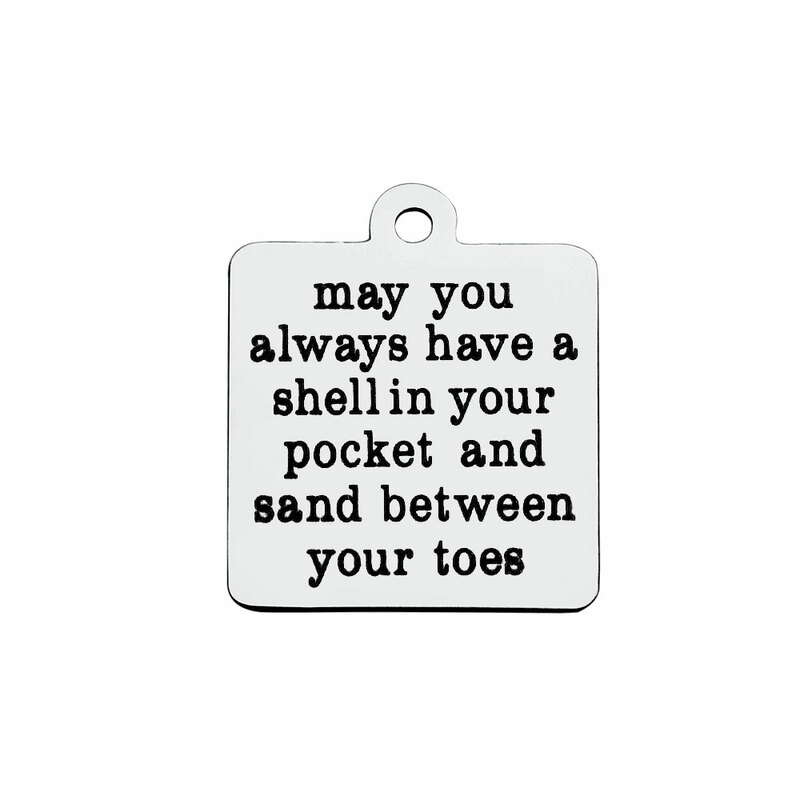 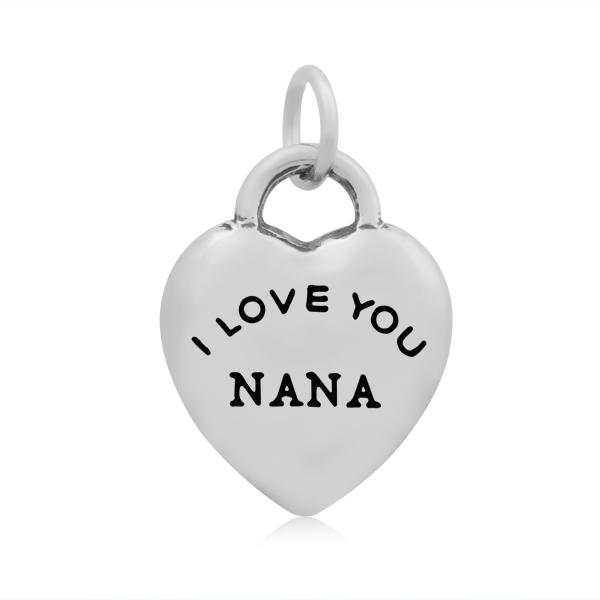 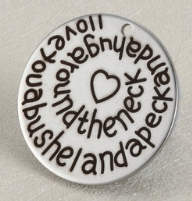 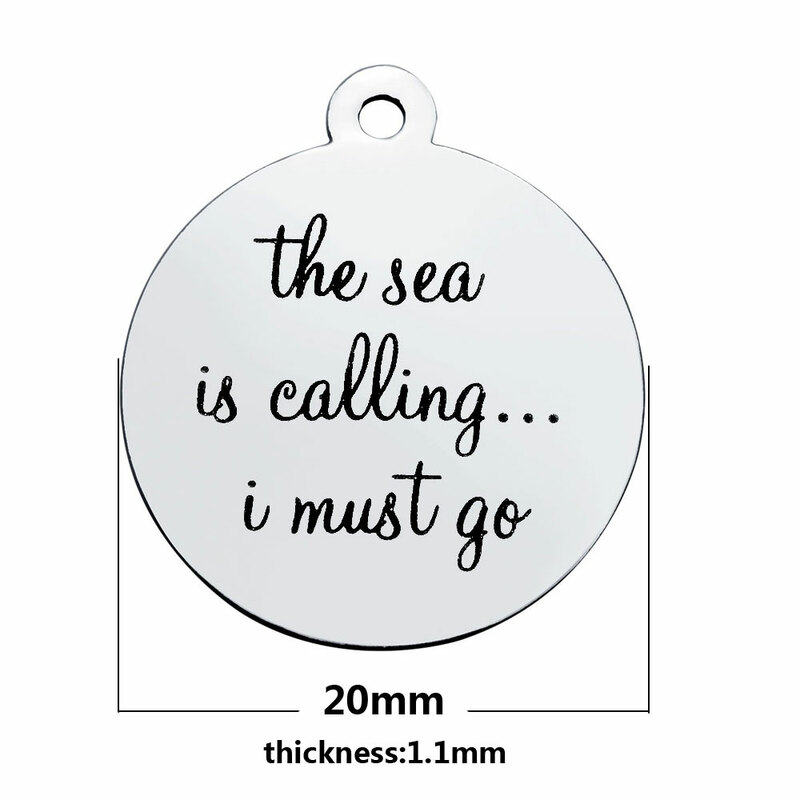 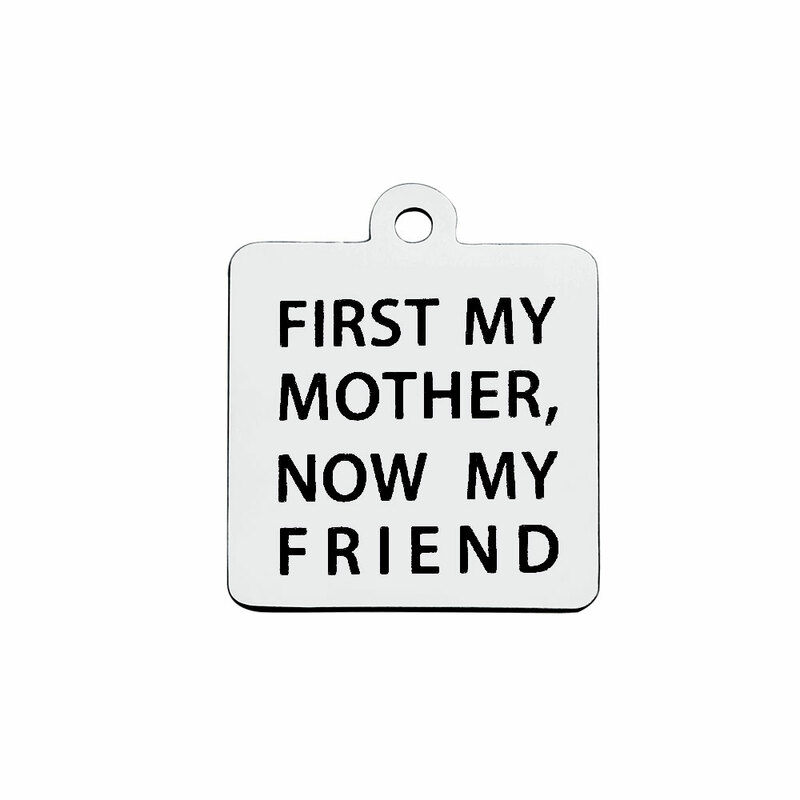 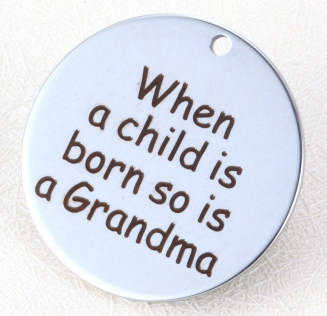 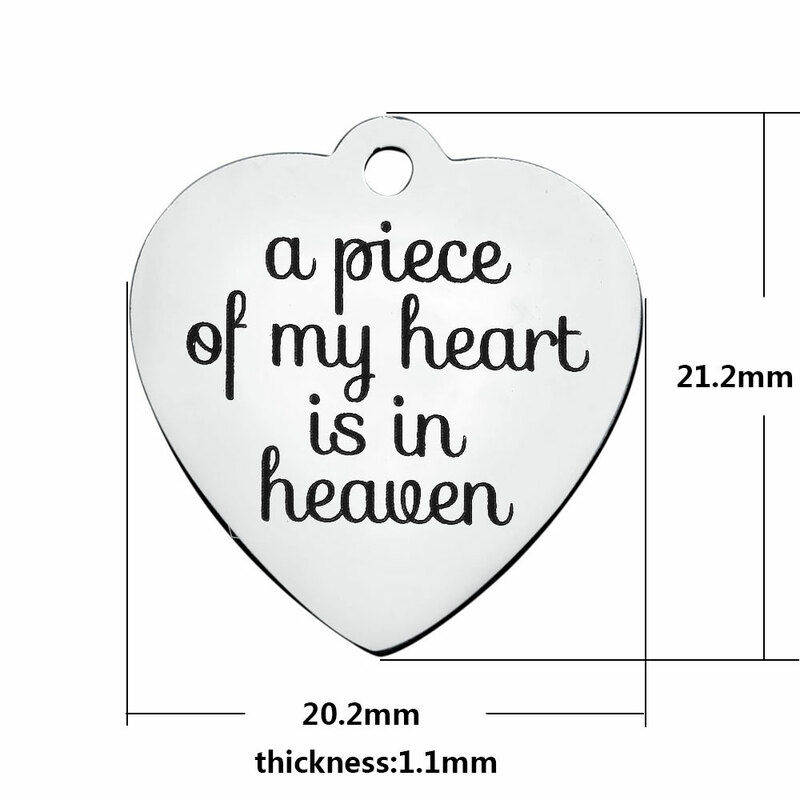 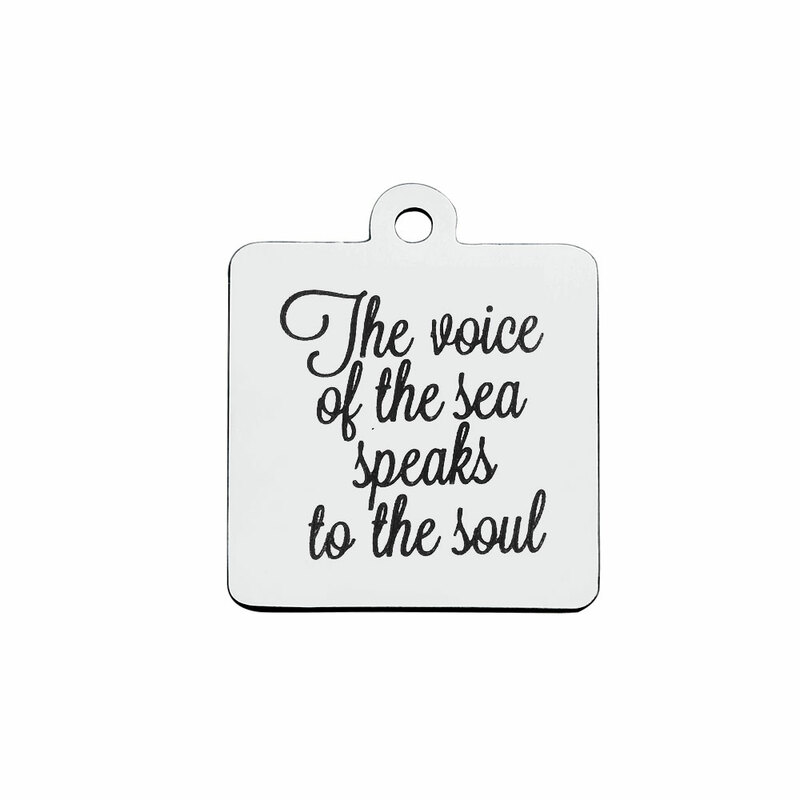 25mm Quotes Stainless Steel Pendant - Love Between Grandmother.. 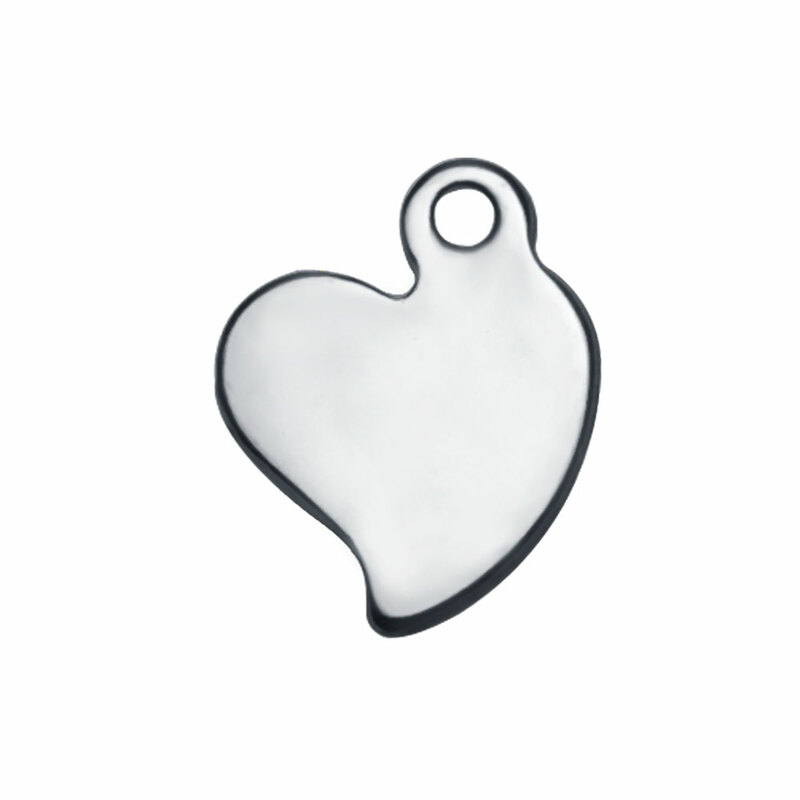 Stainless Steel Jewelry will not tarnish or rust. It is durable and scratch resistant. 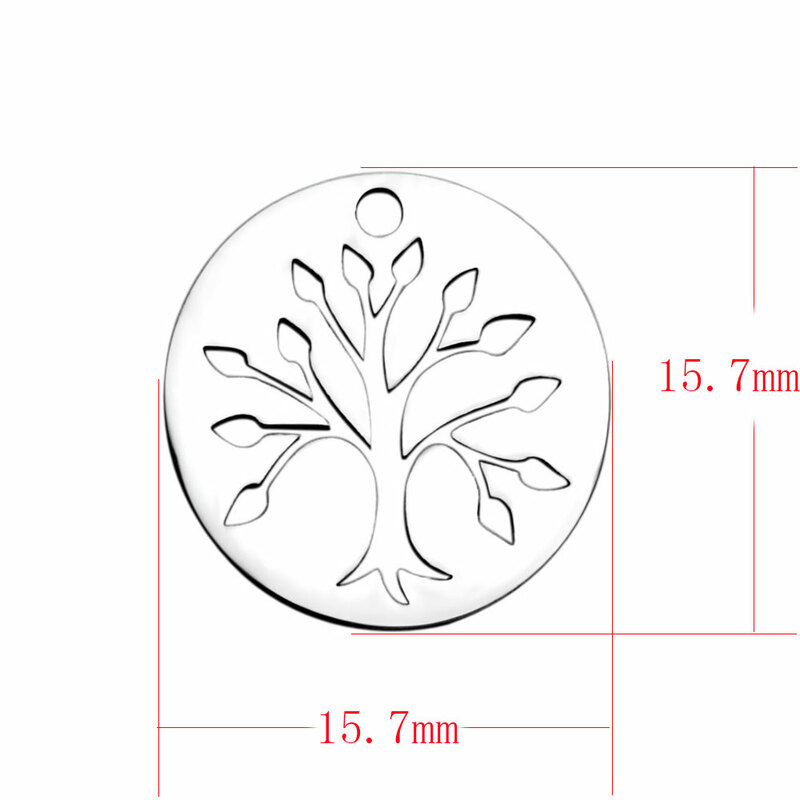 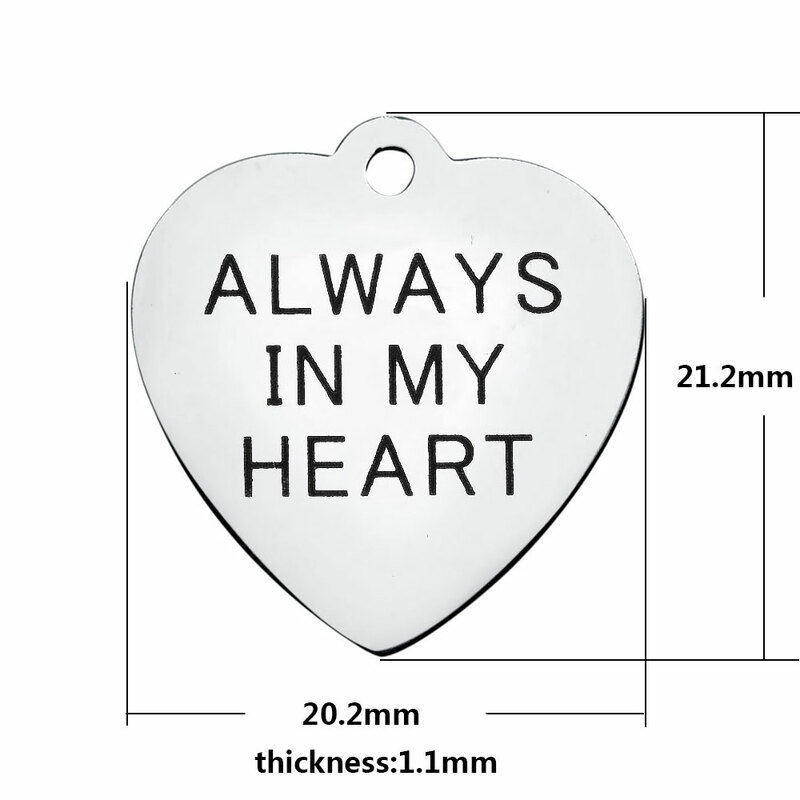 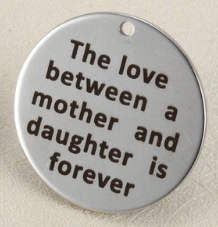 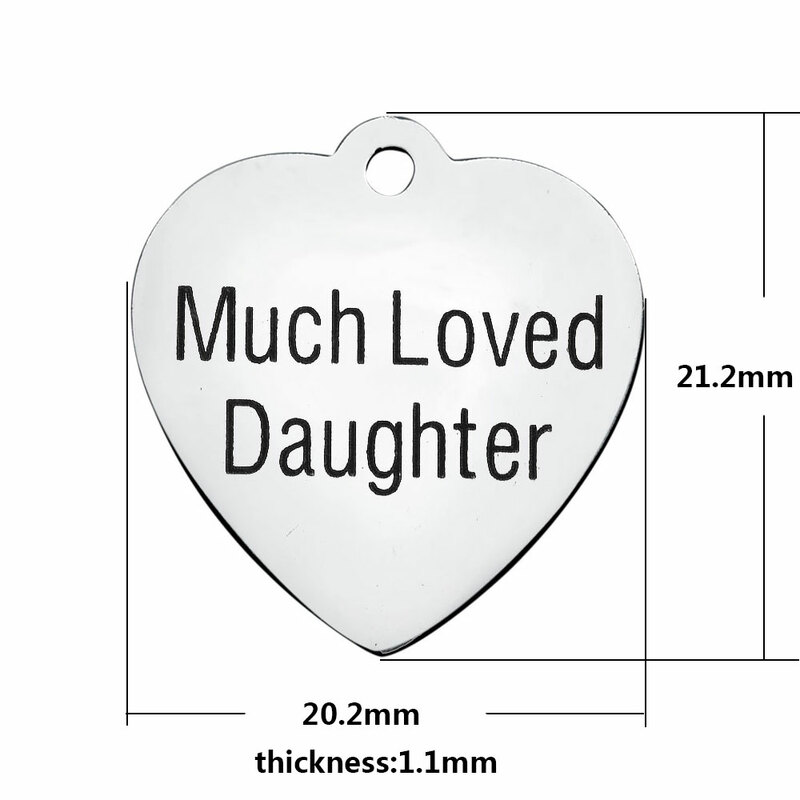 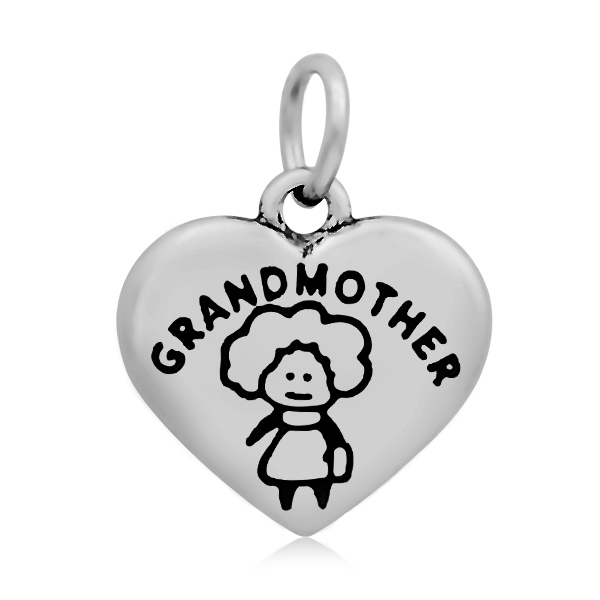 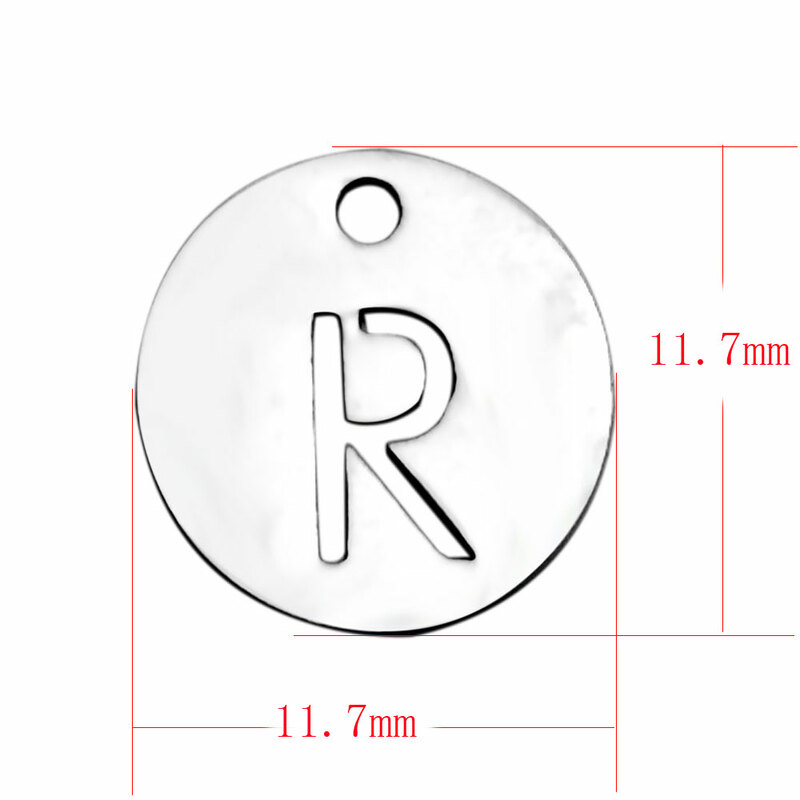 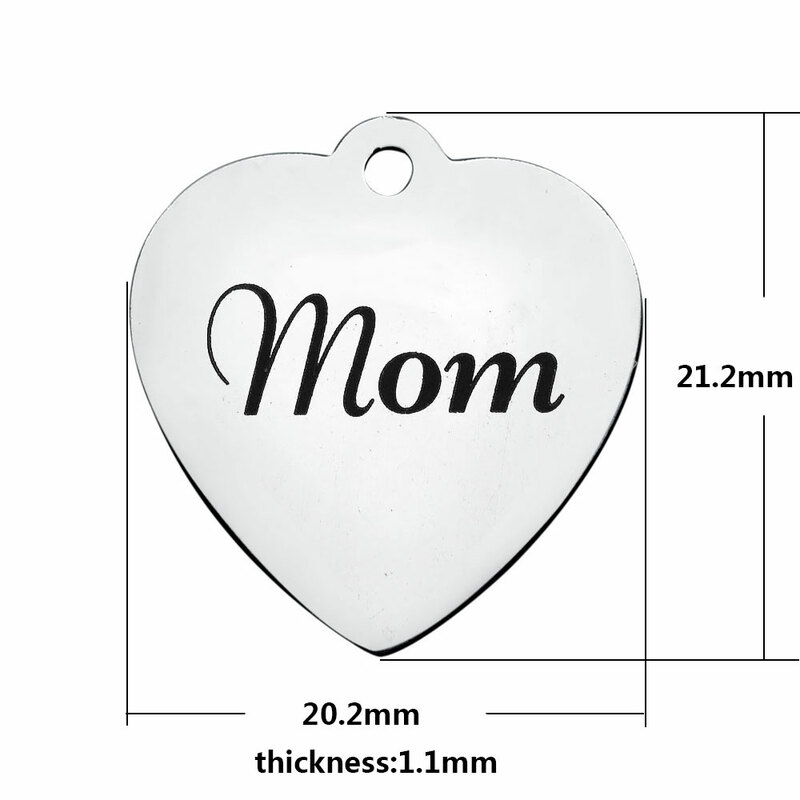 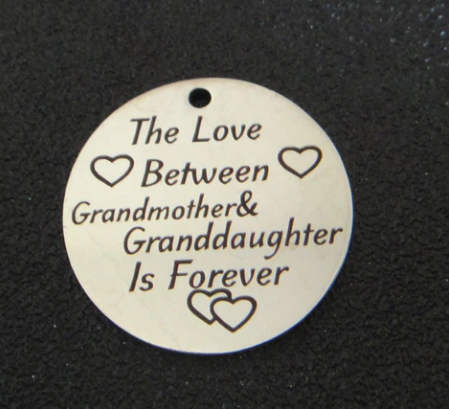 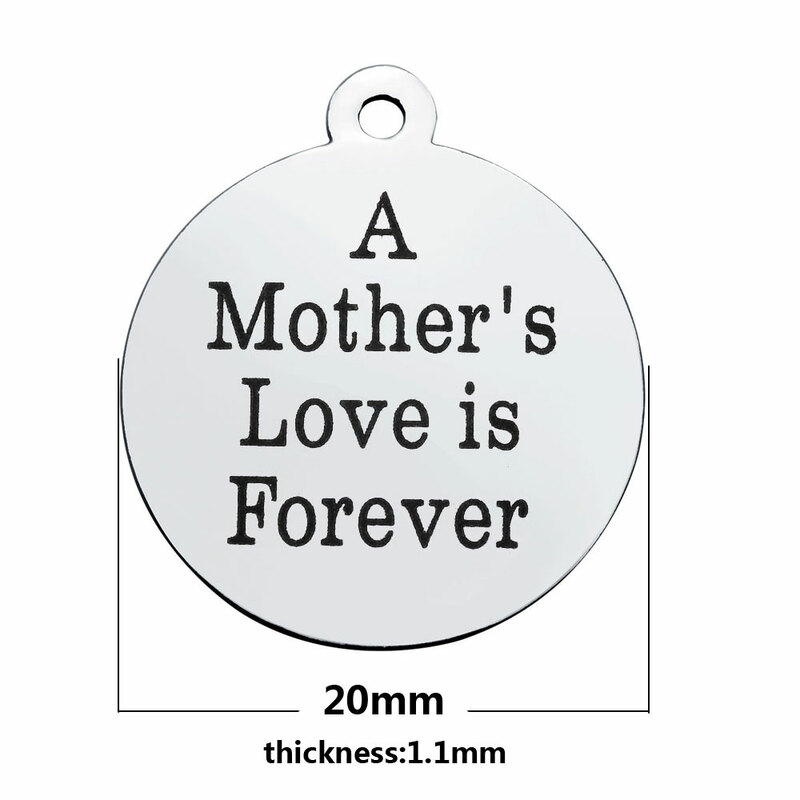 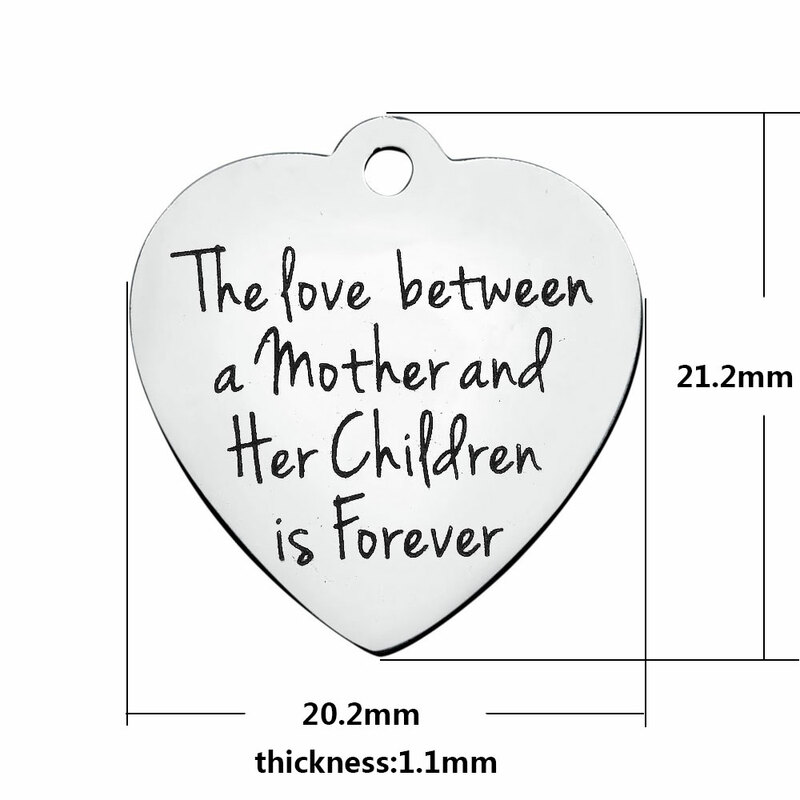 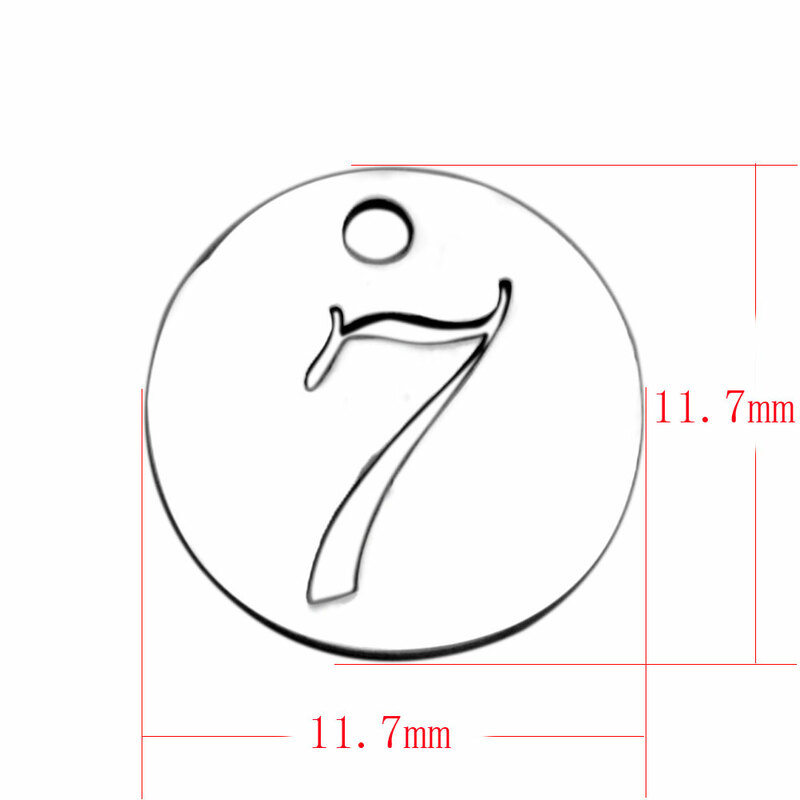 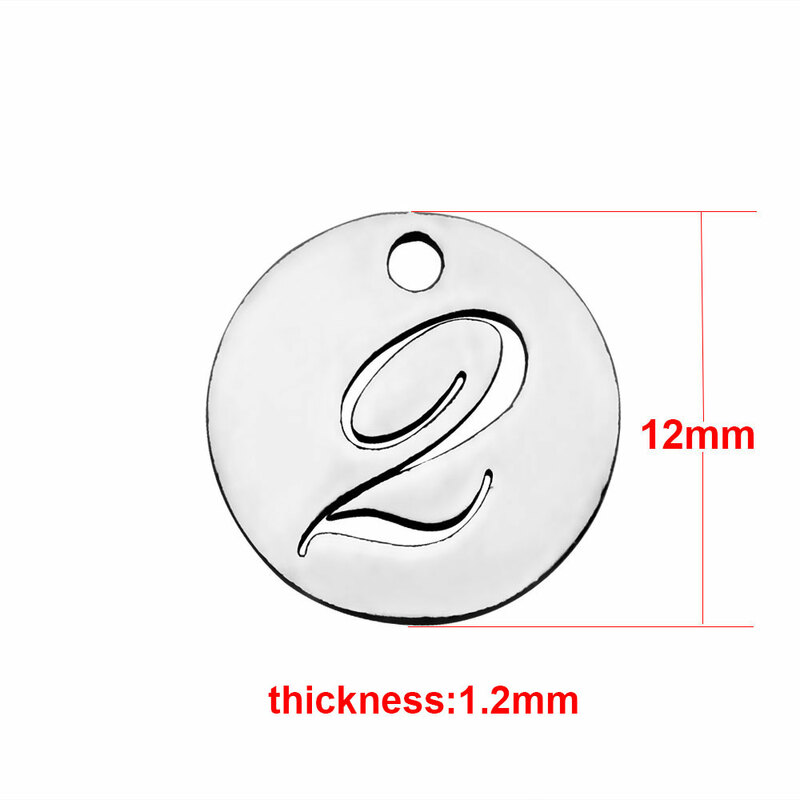 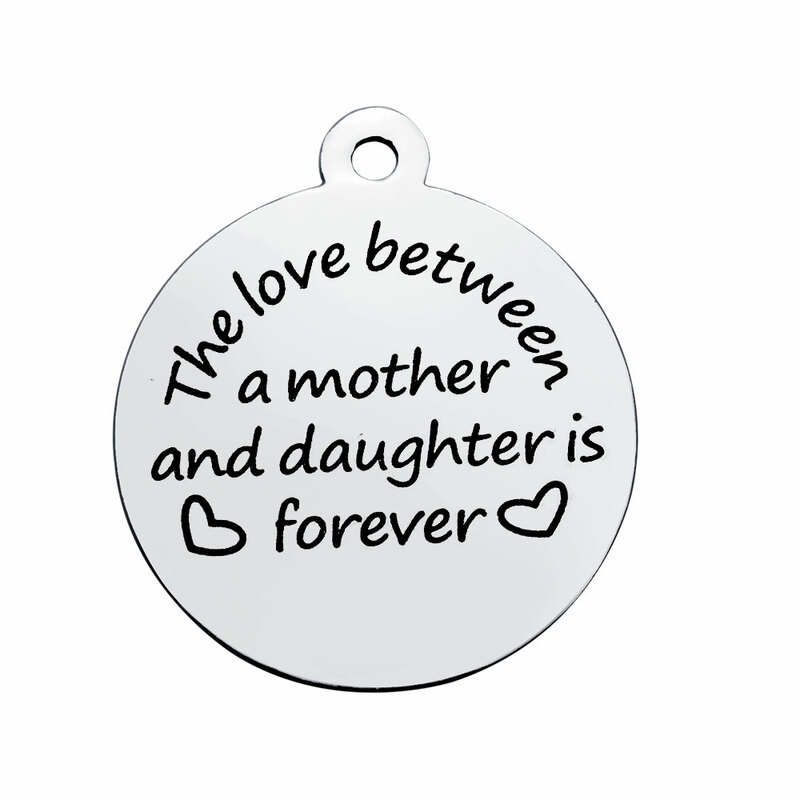 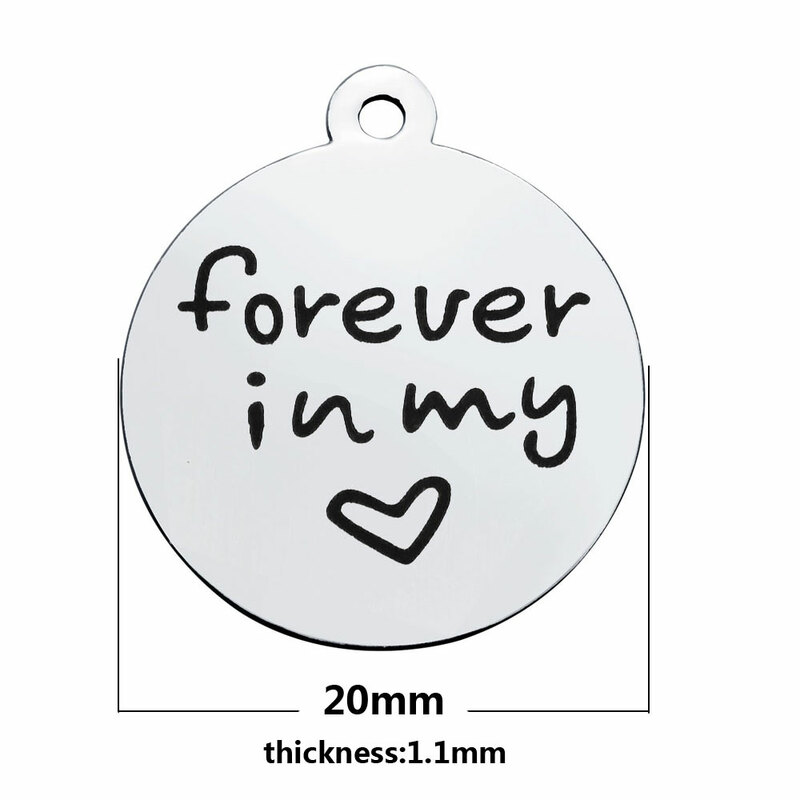 Medium Tag Pendant - 25mm The Love Between Grandmother And Granddaughter is Forever. 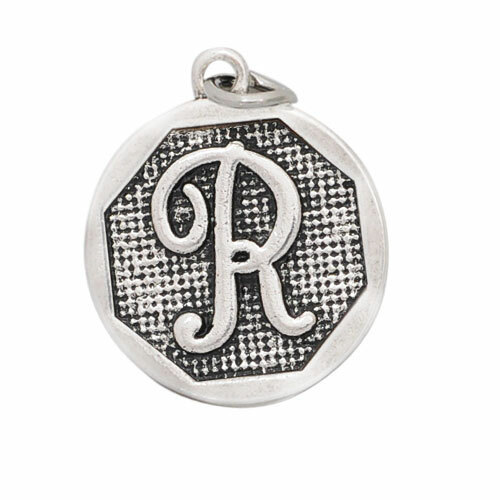 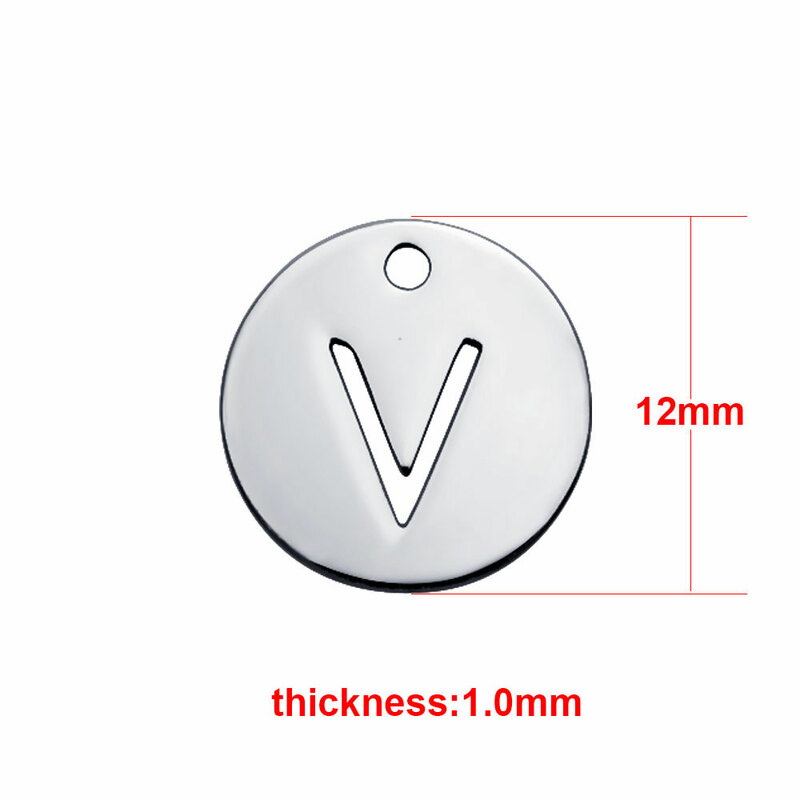 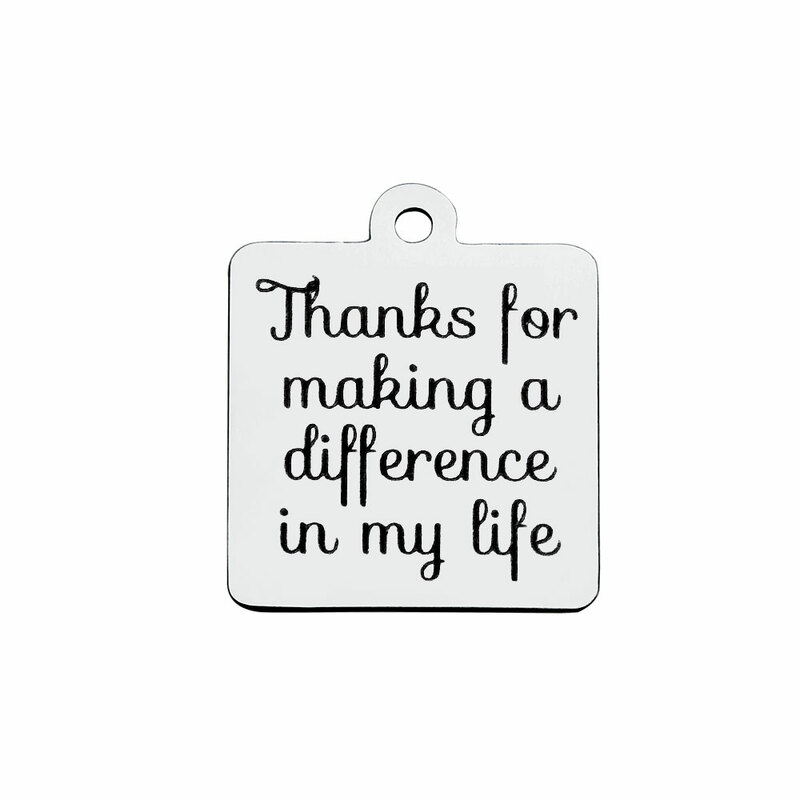 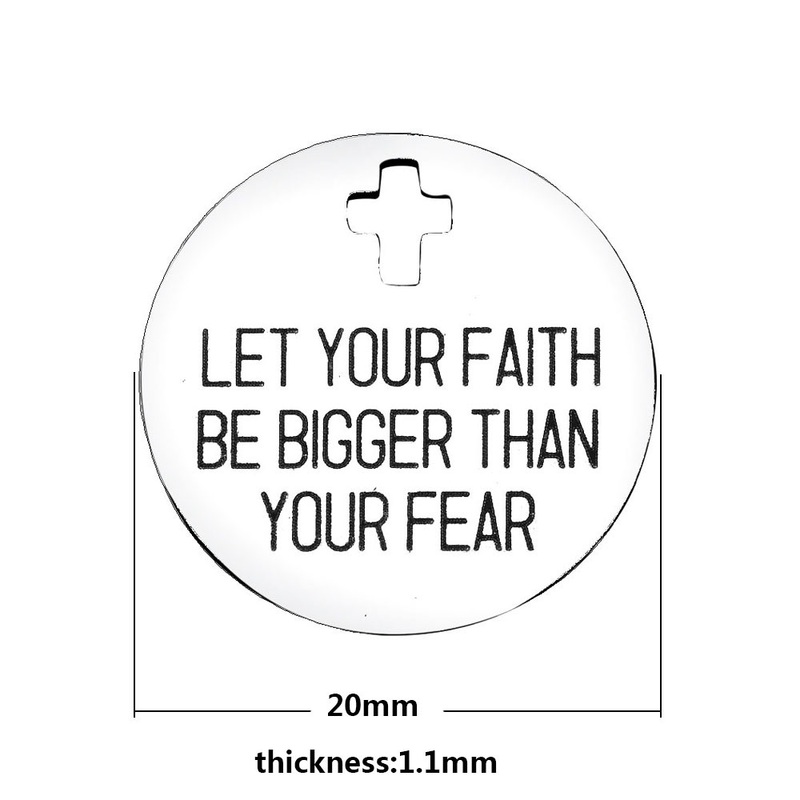 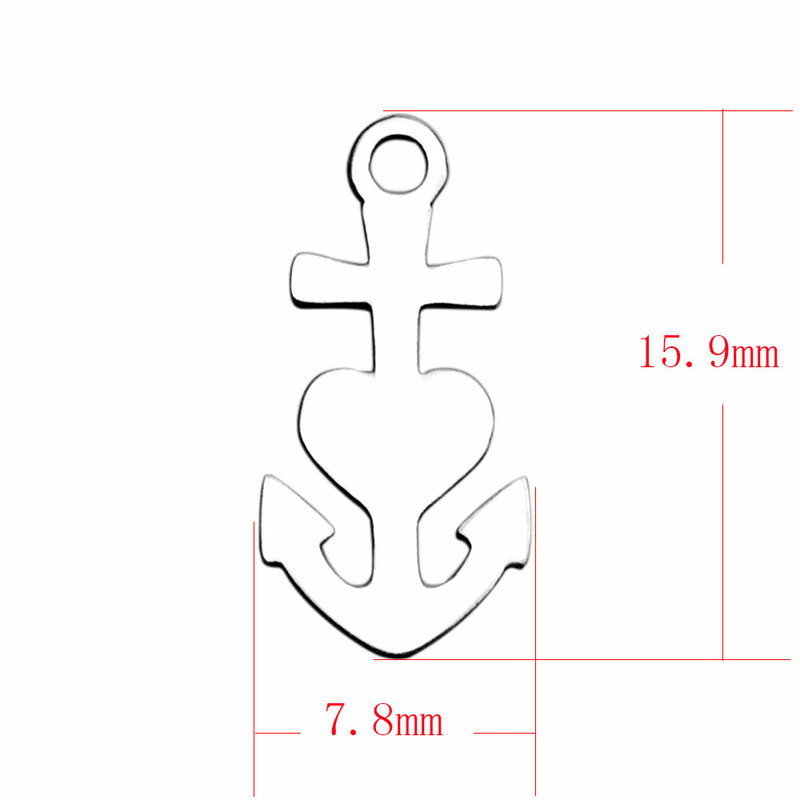 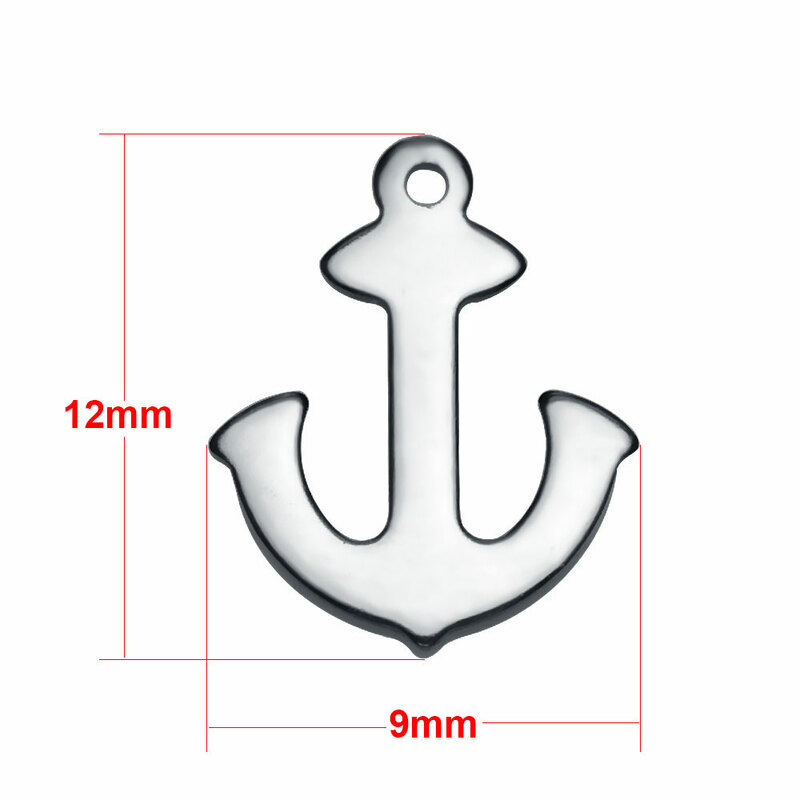 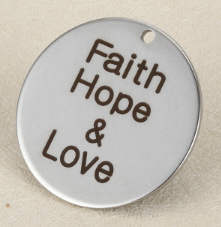 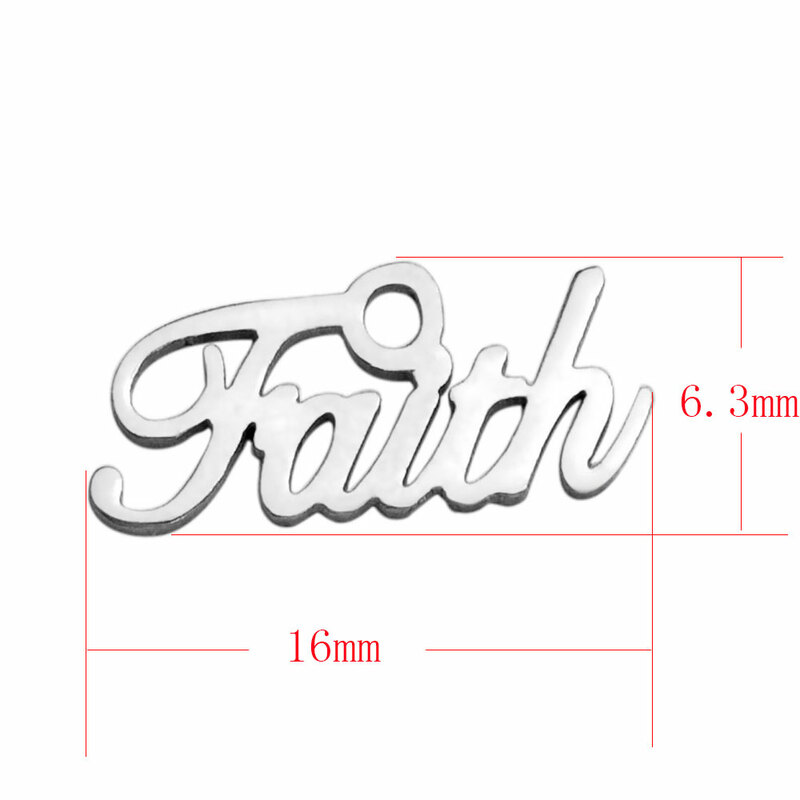 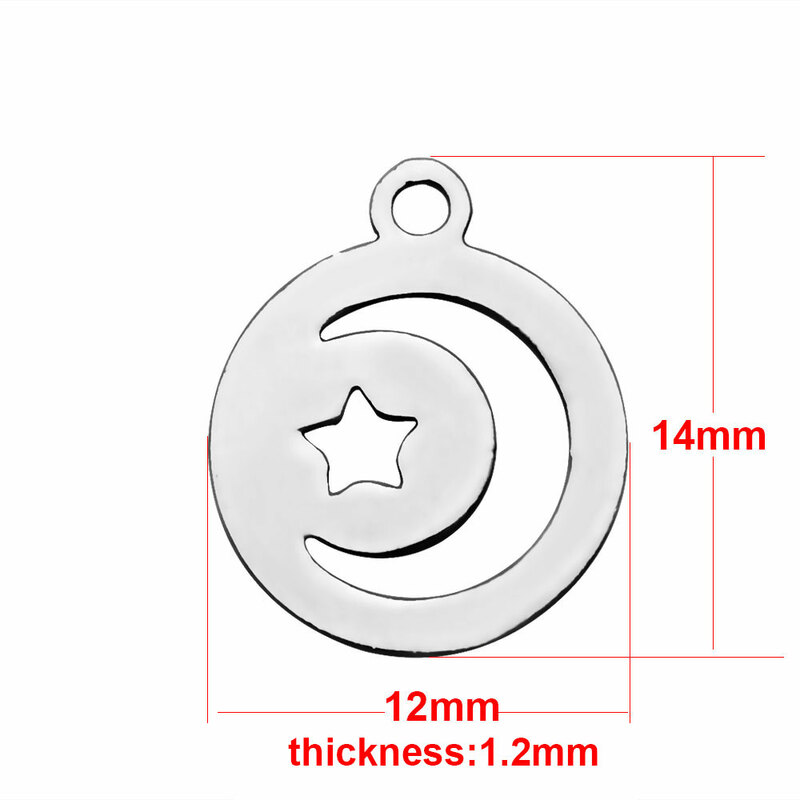 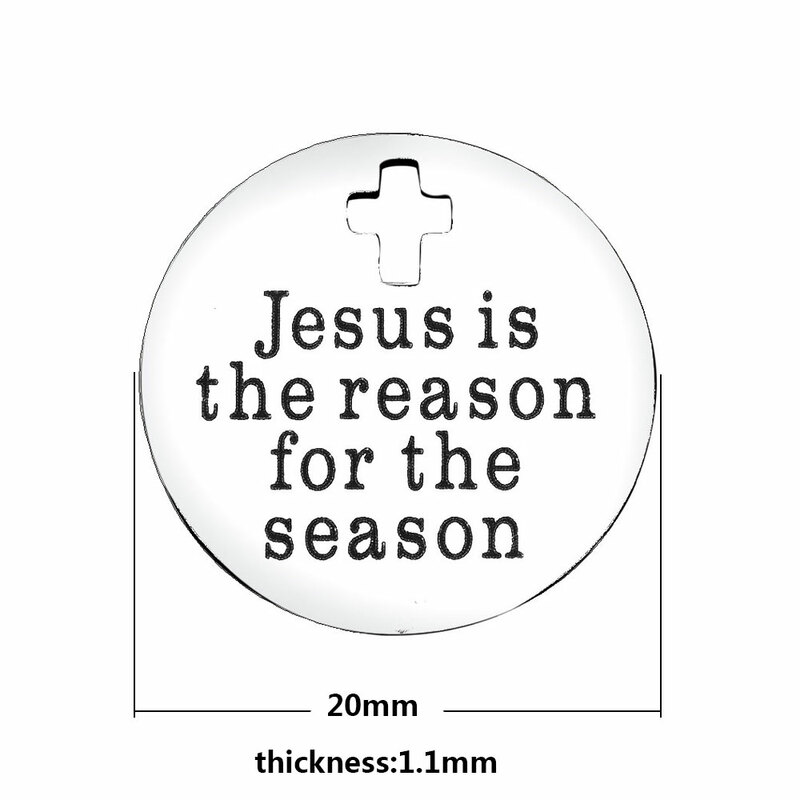 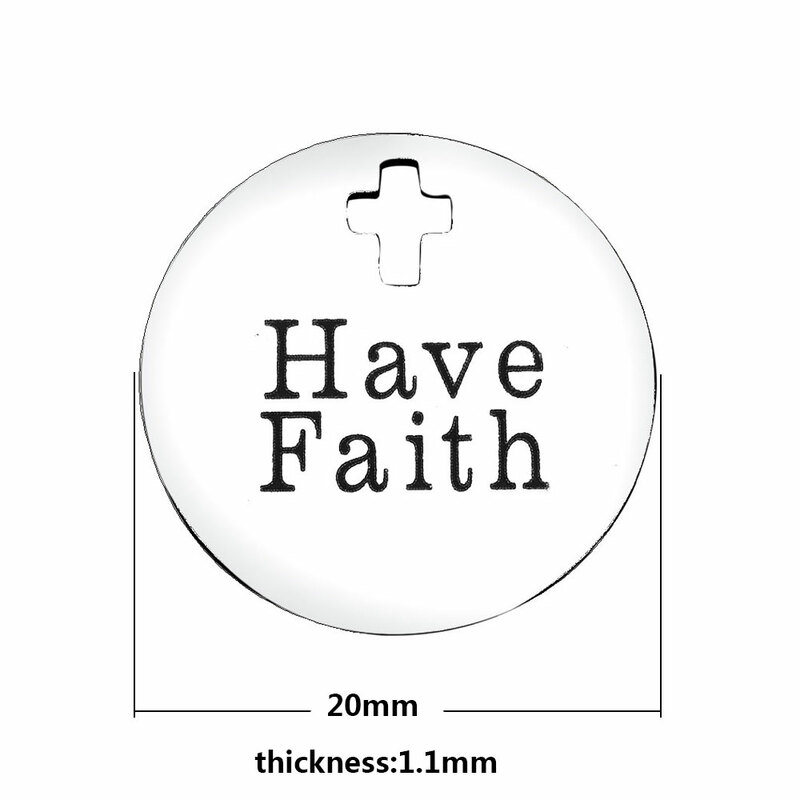 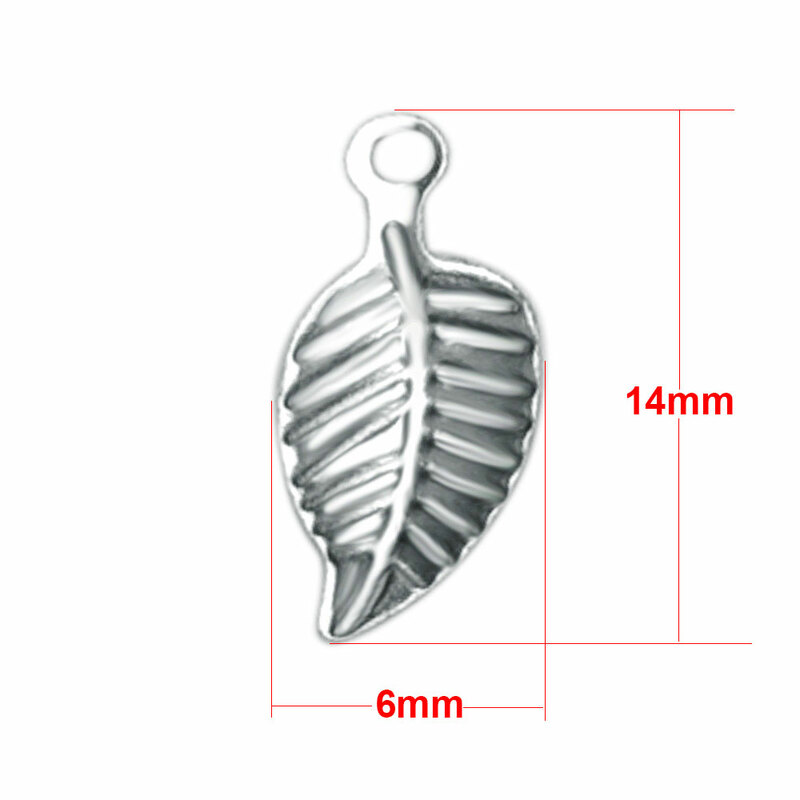 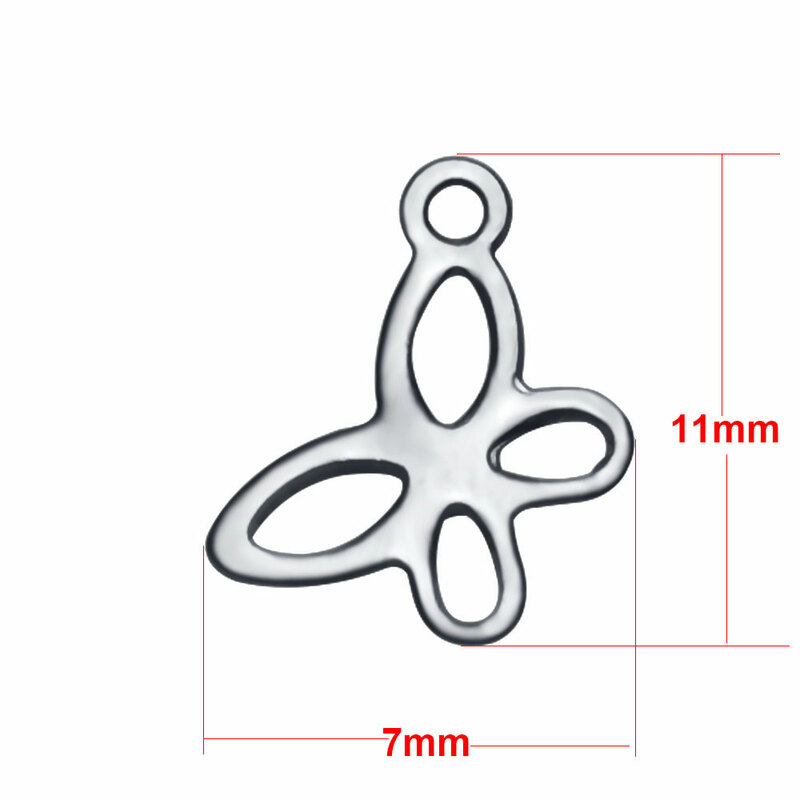 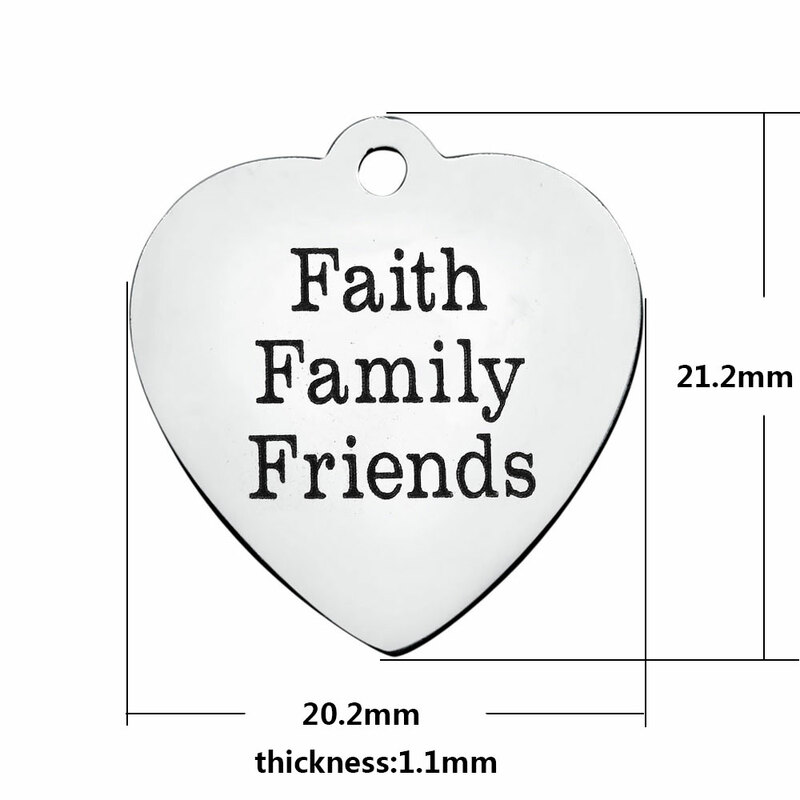 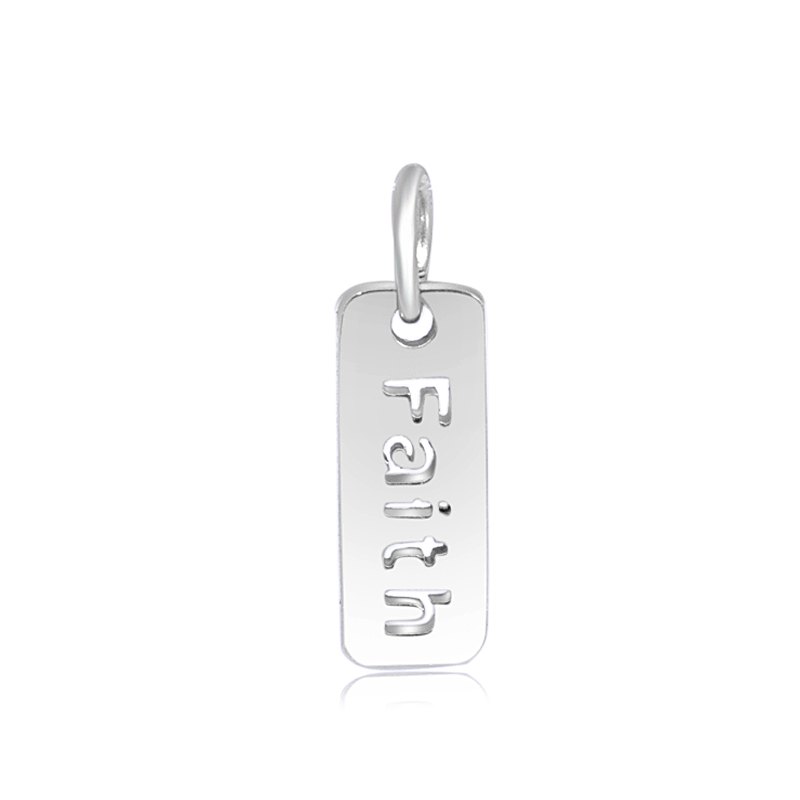 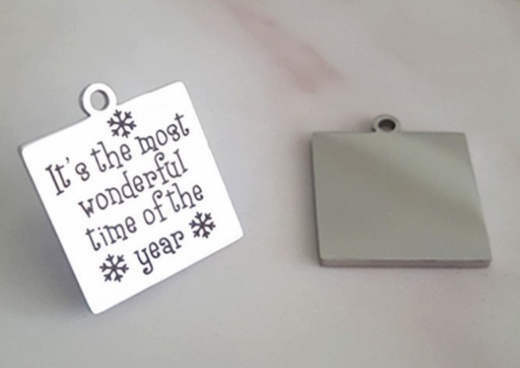 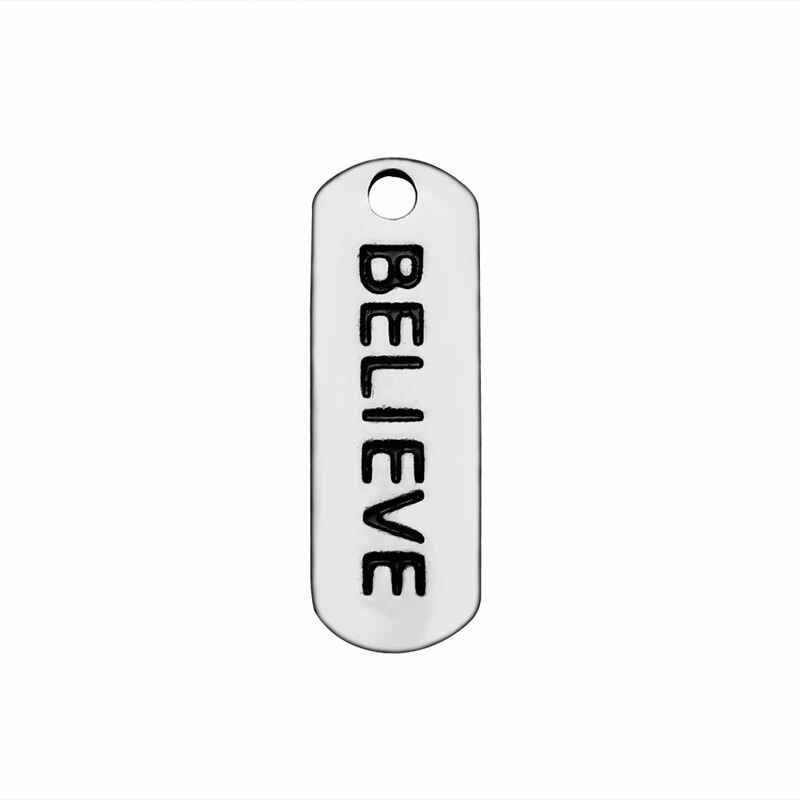 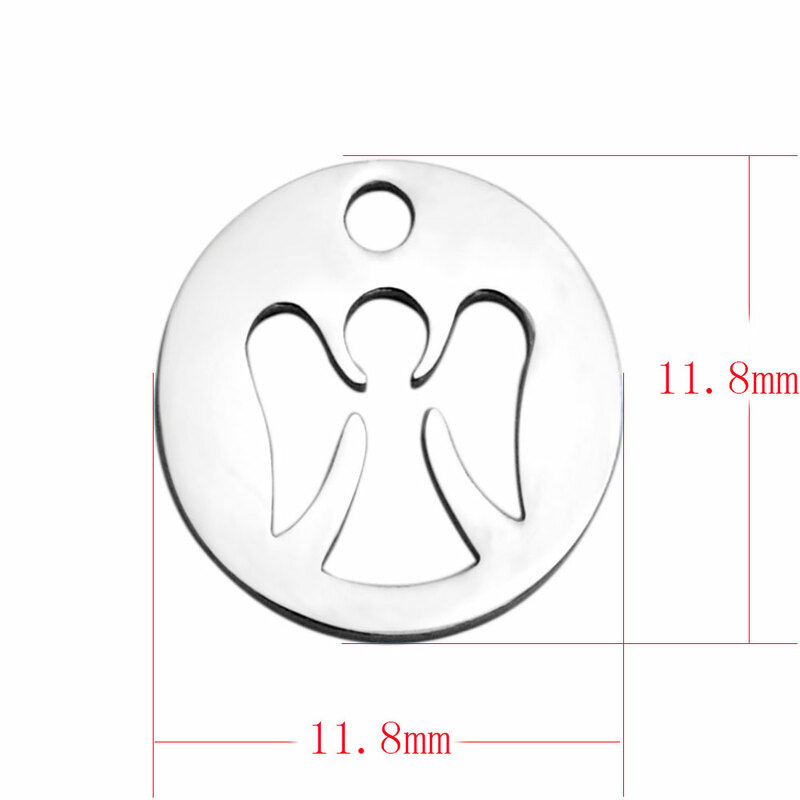 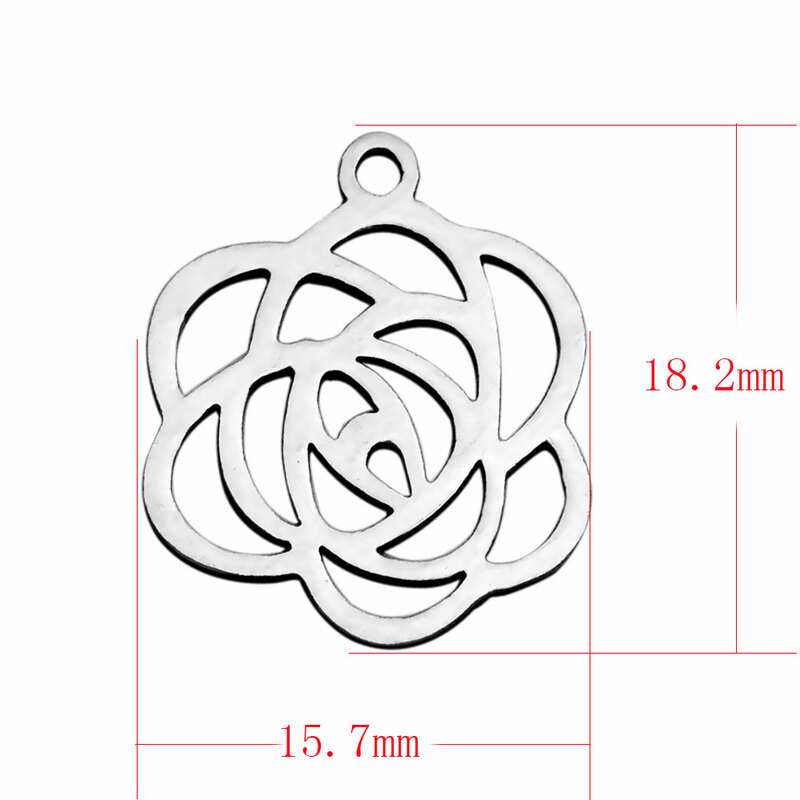 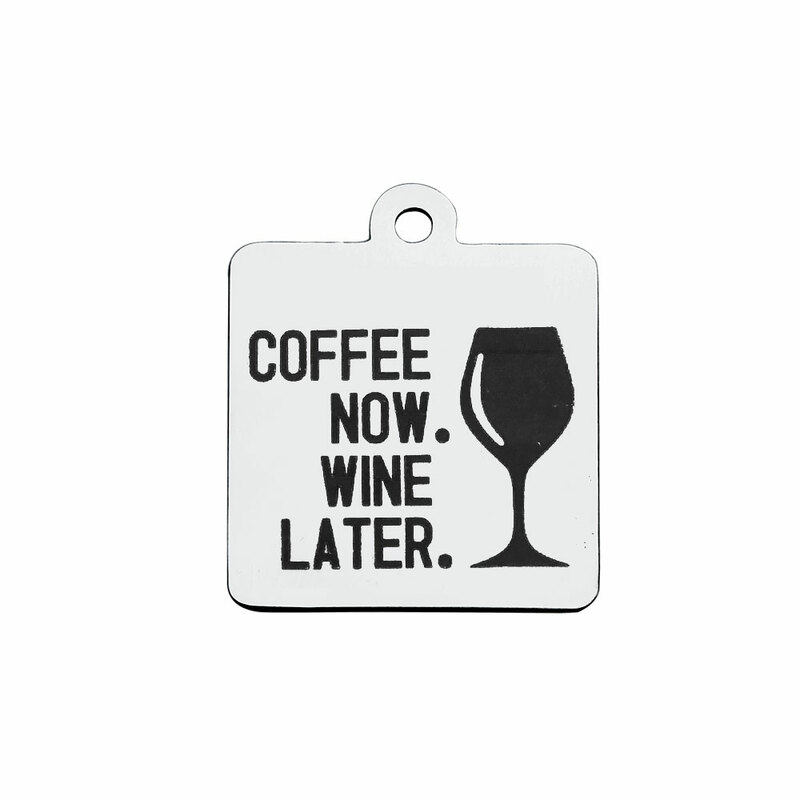 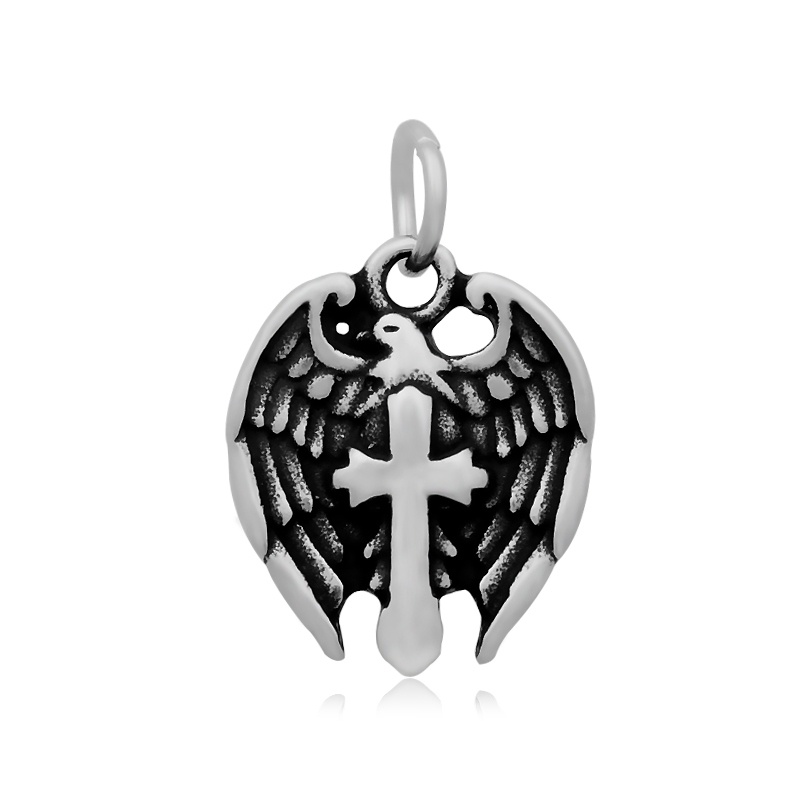 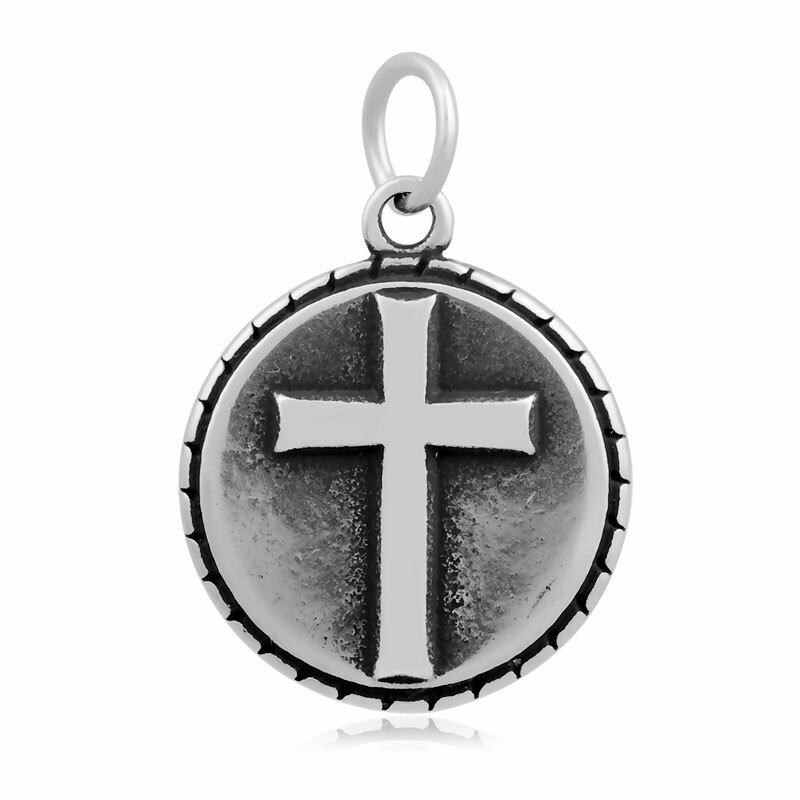 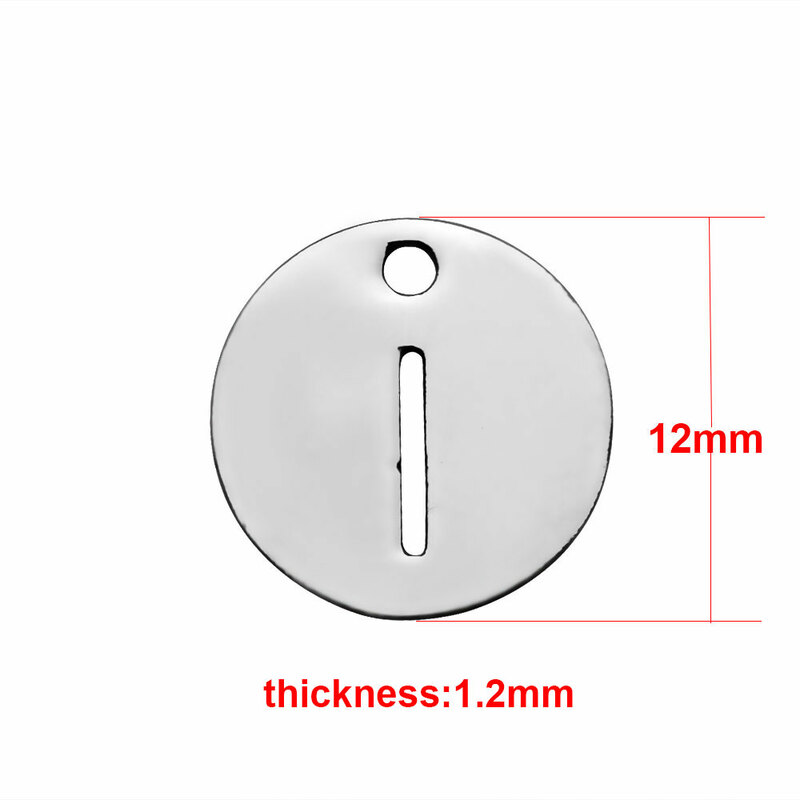 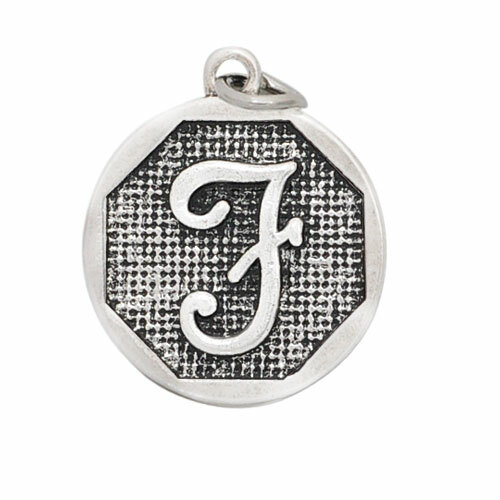 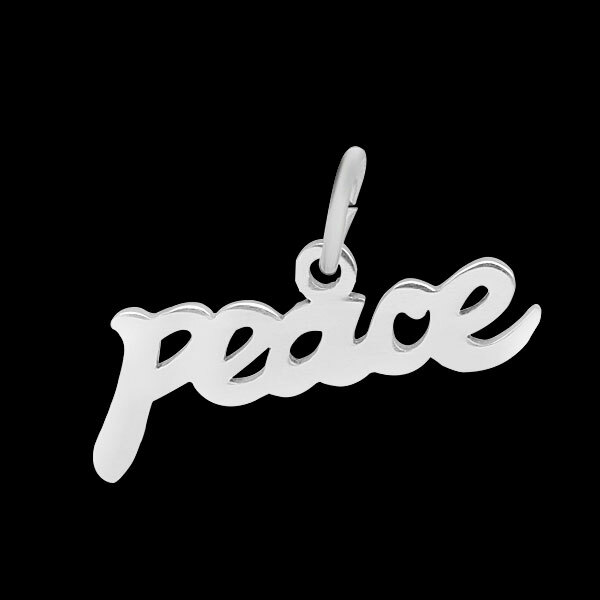 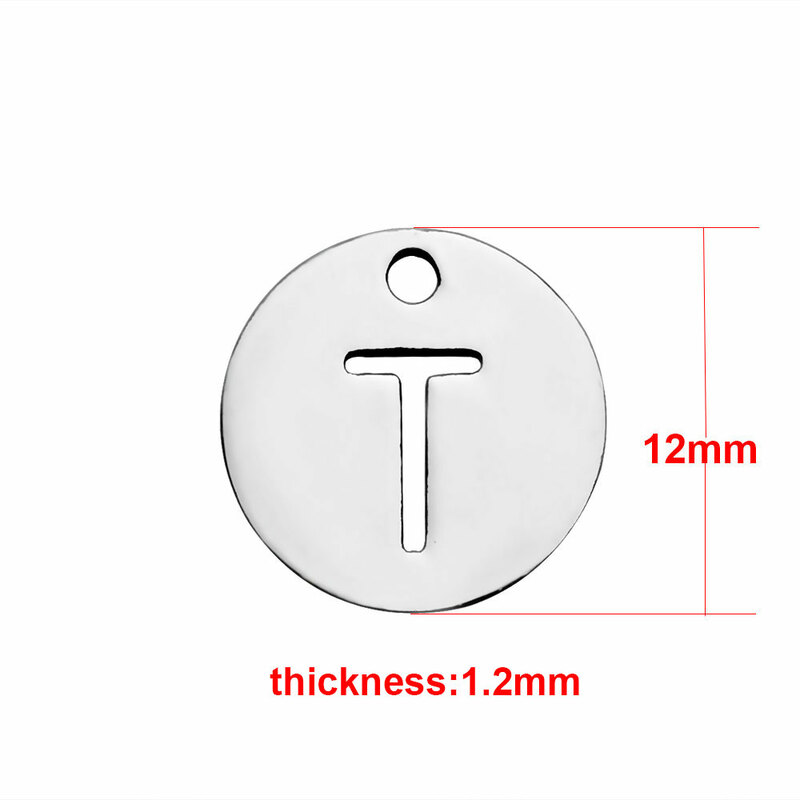 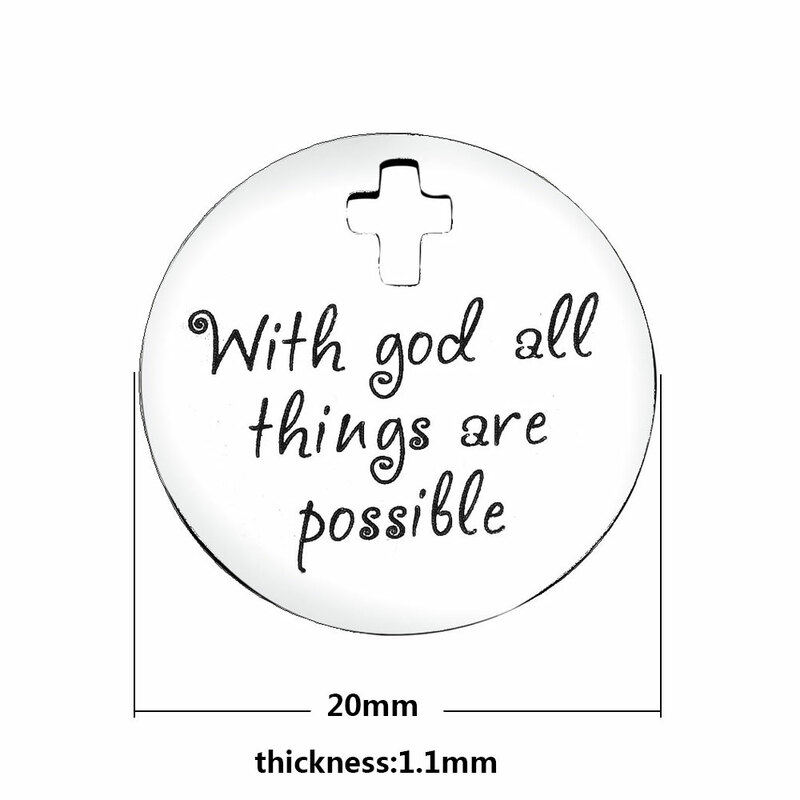 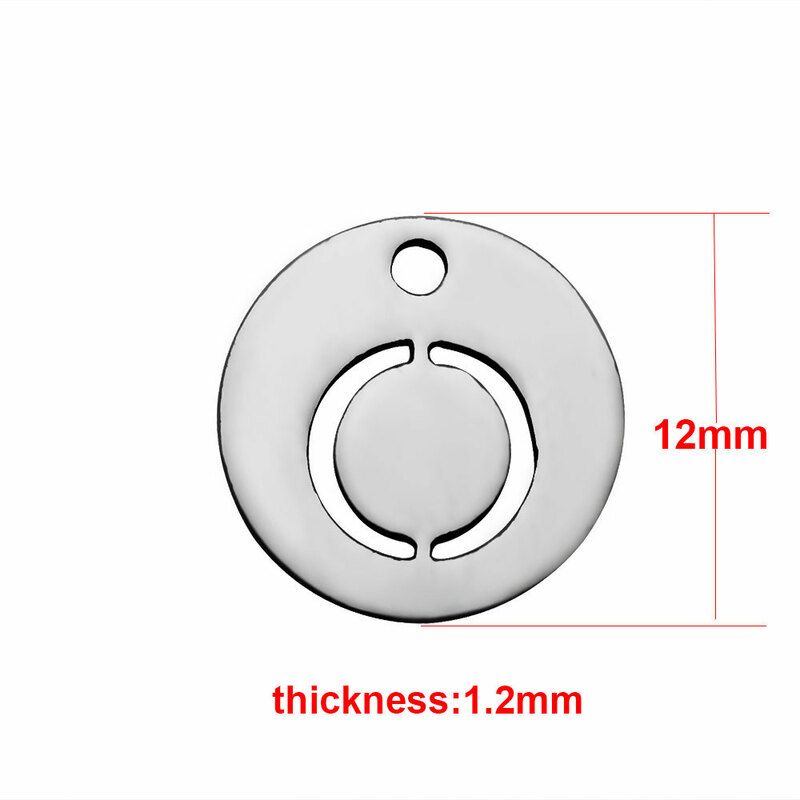 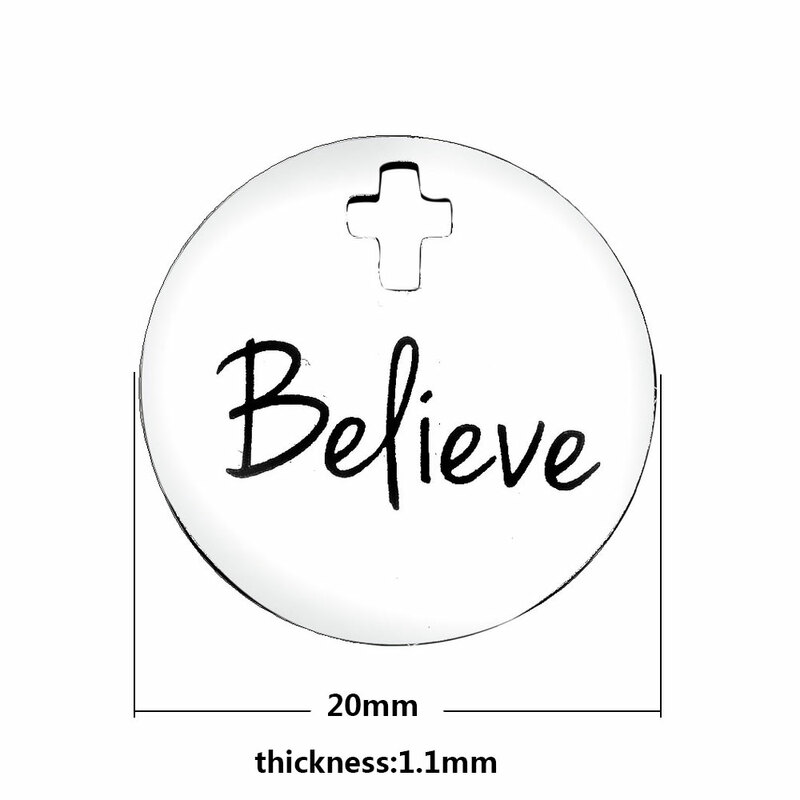 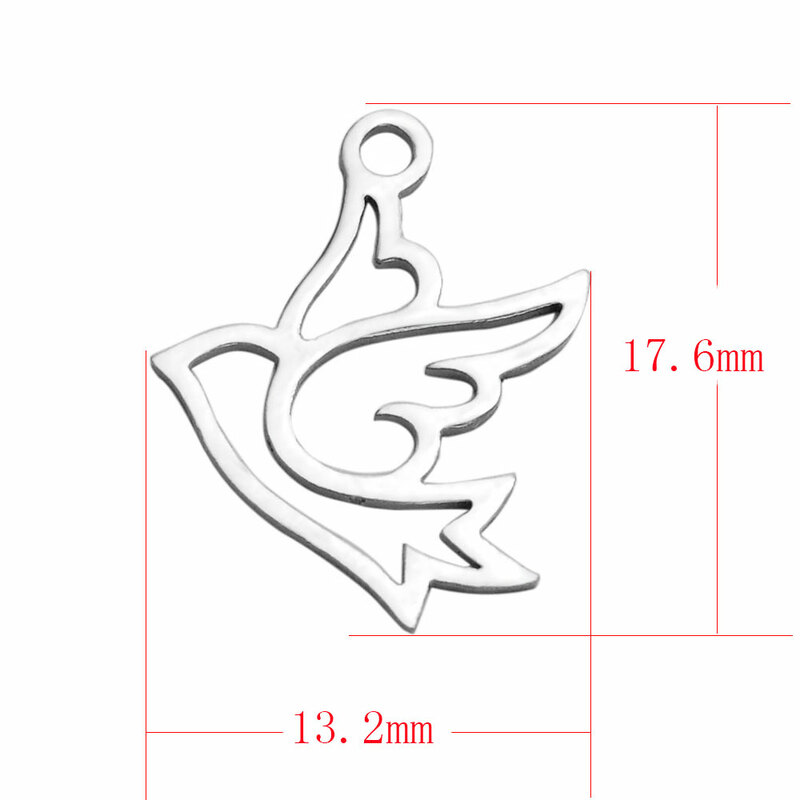 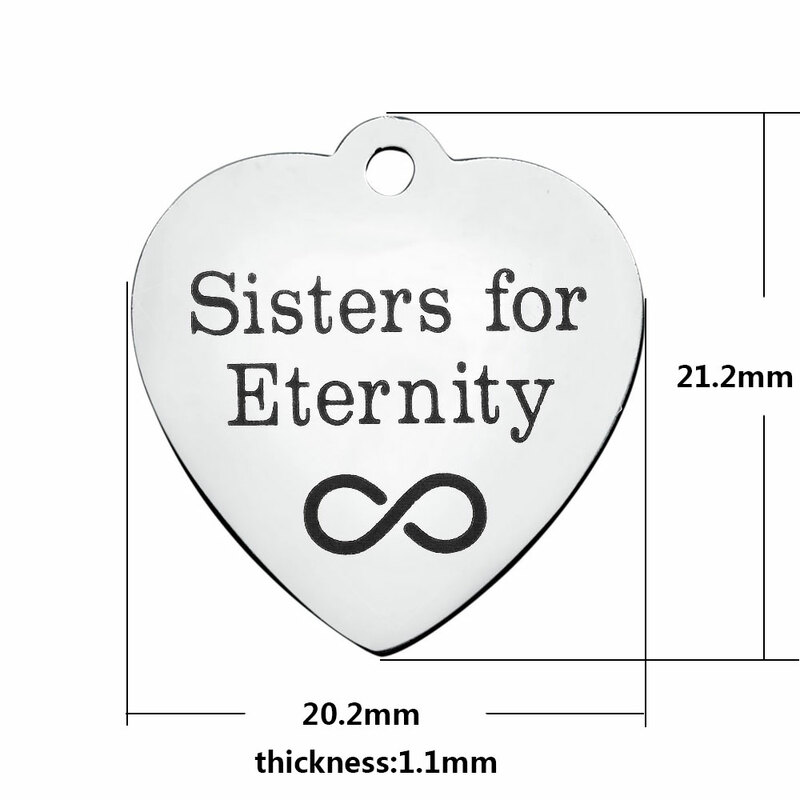 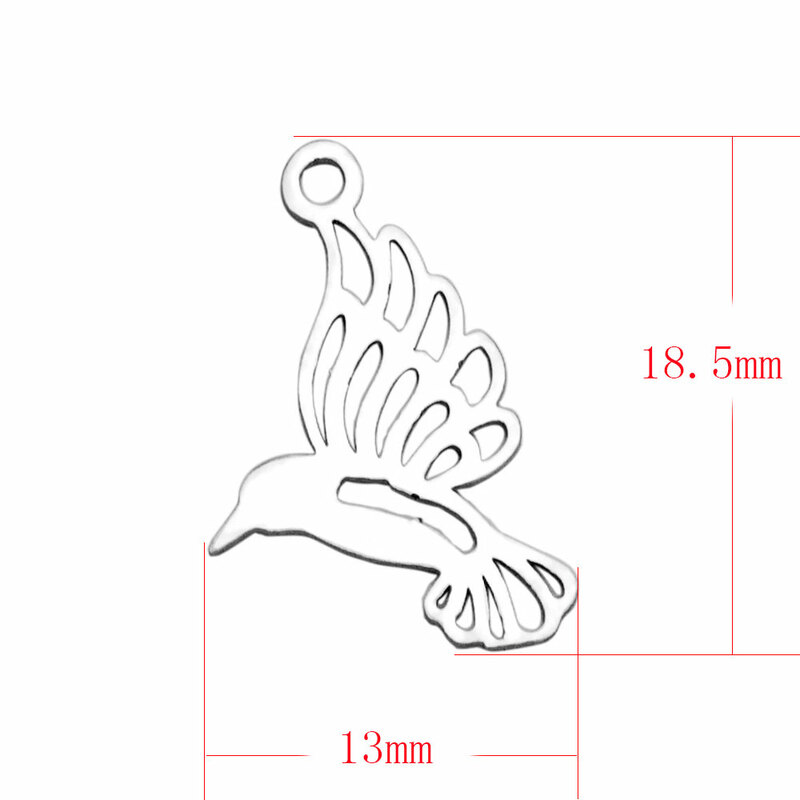 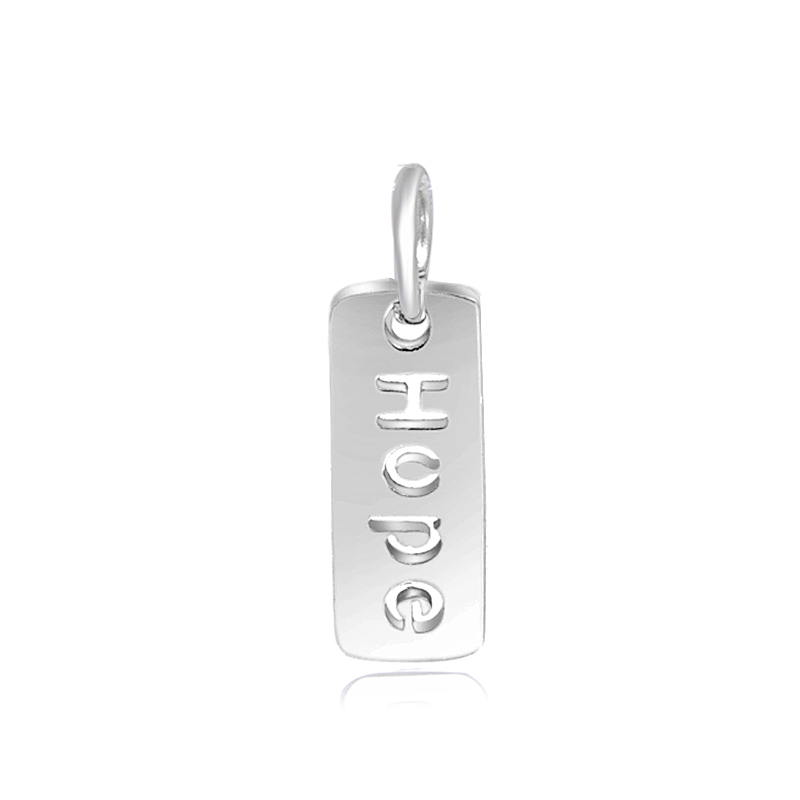 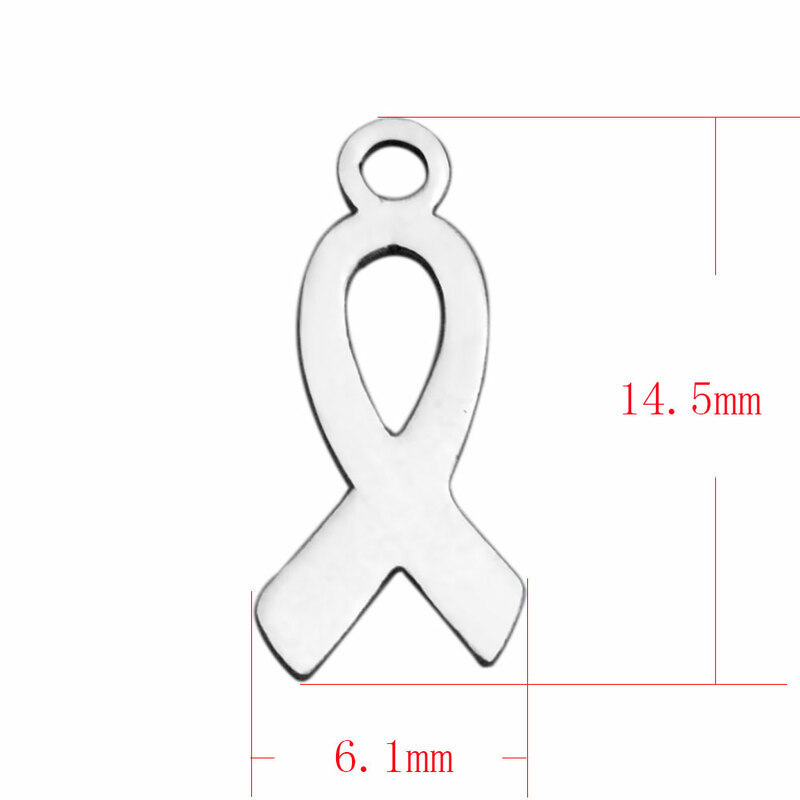 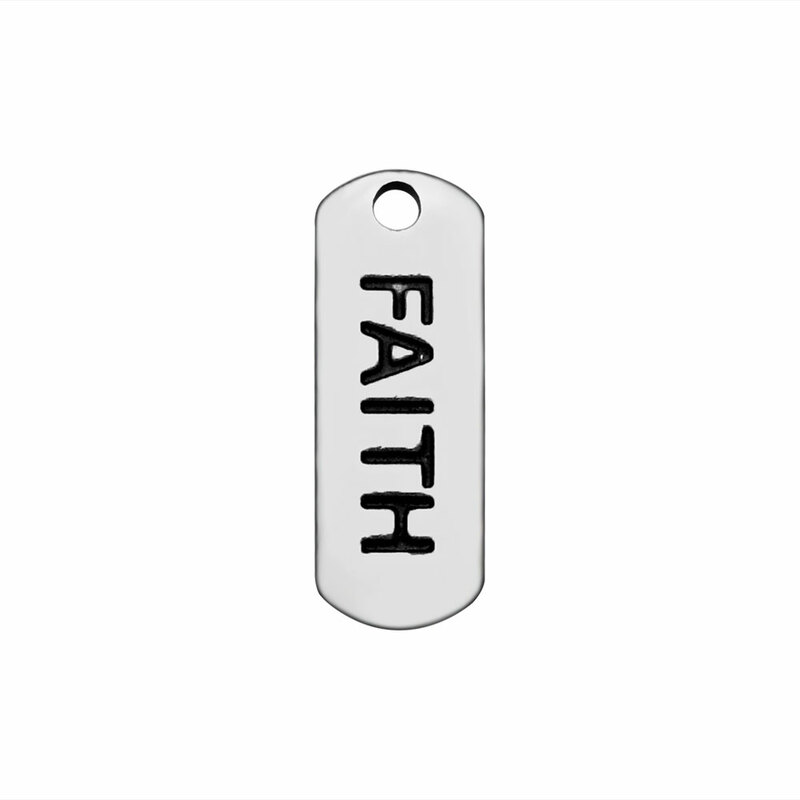 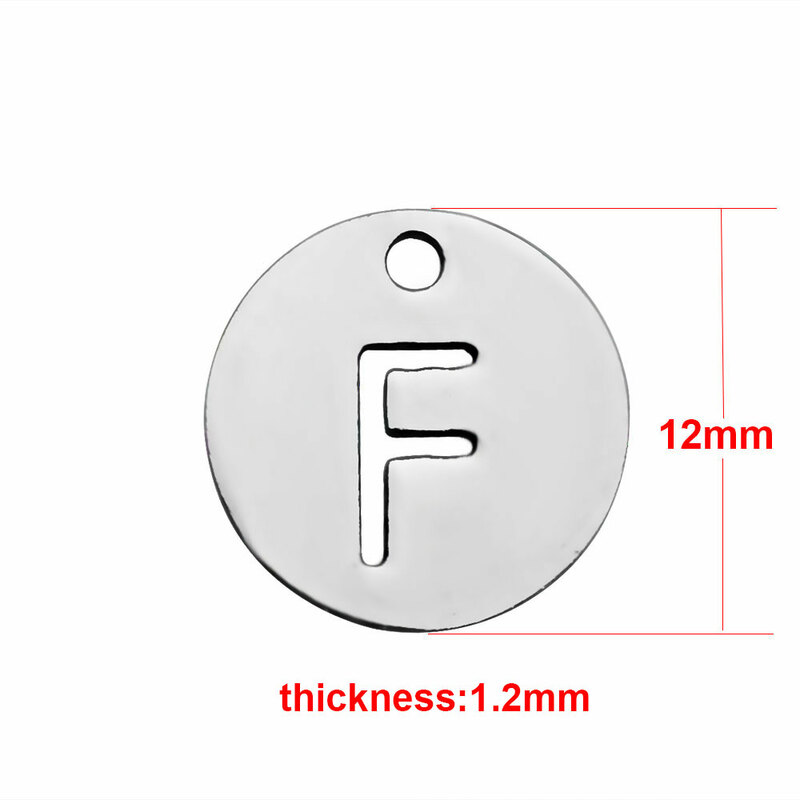 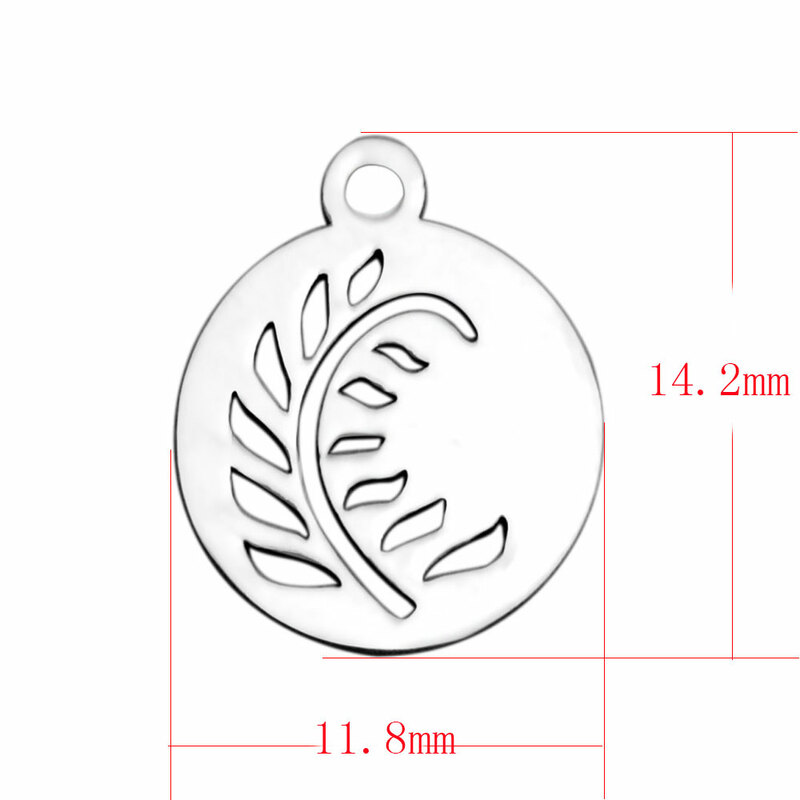 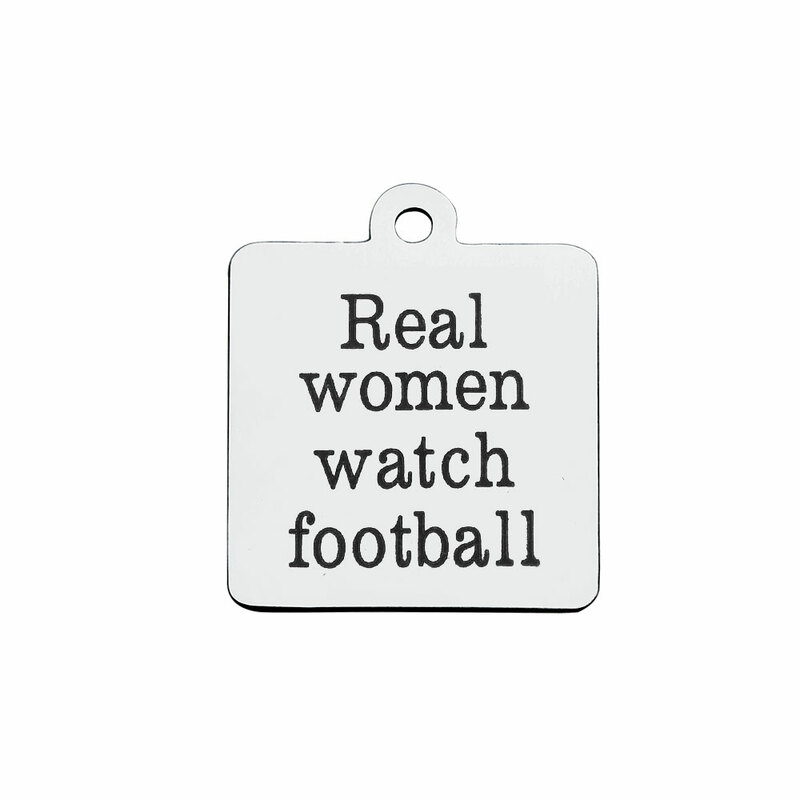 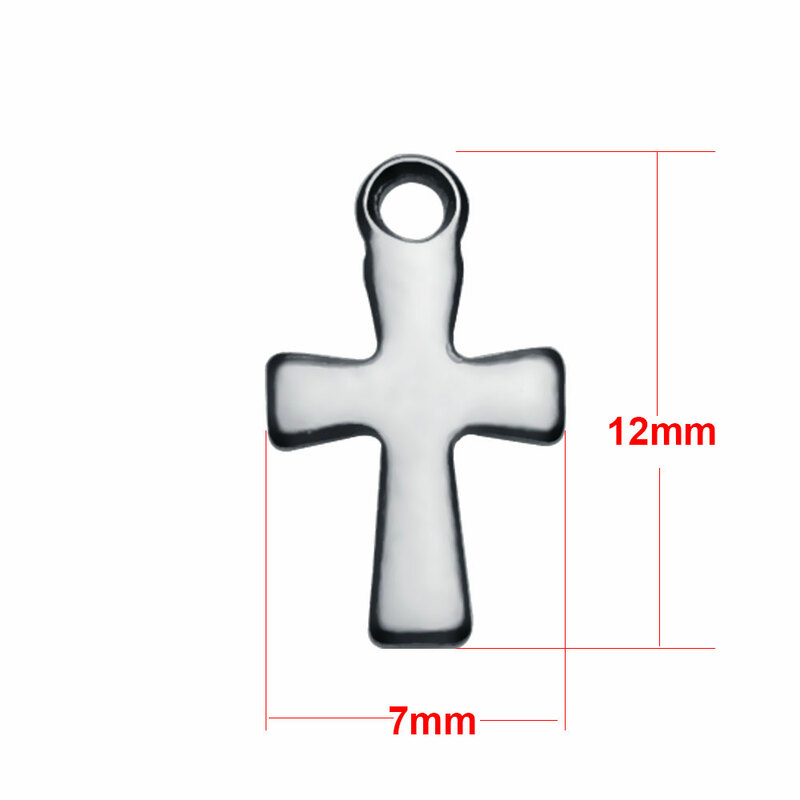 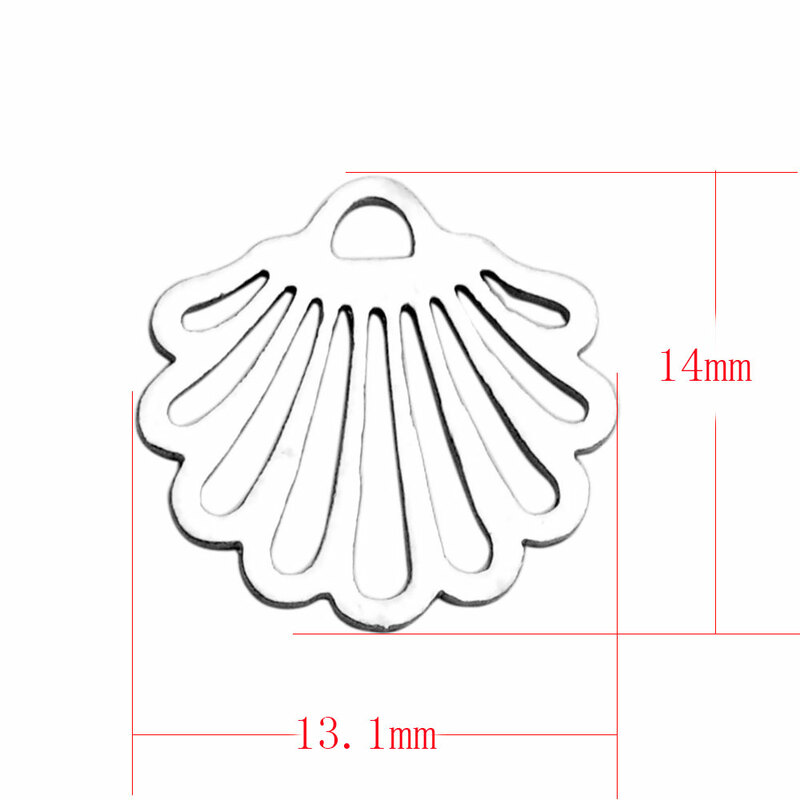 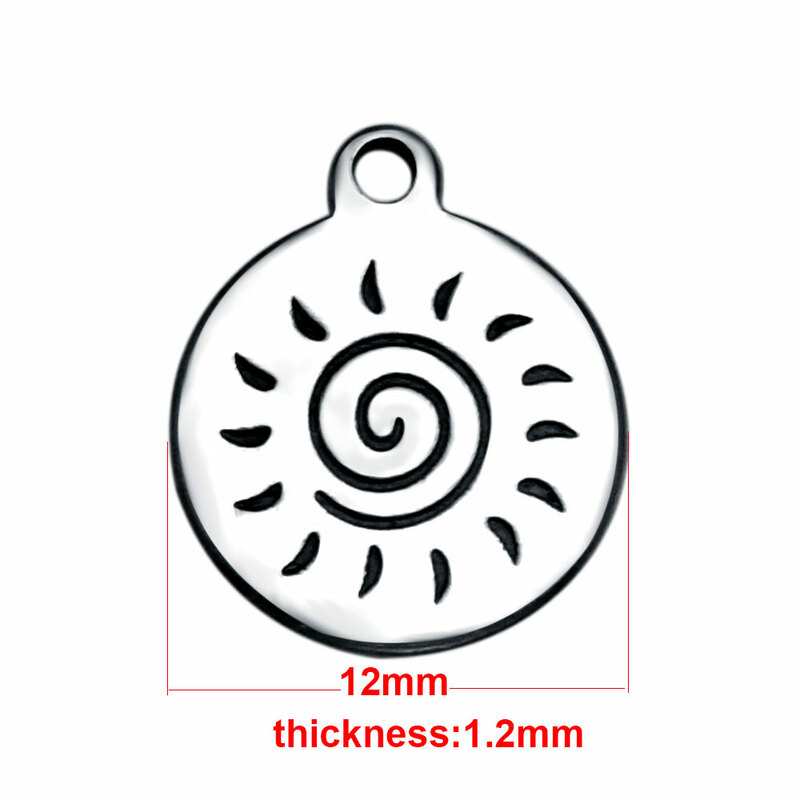 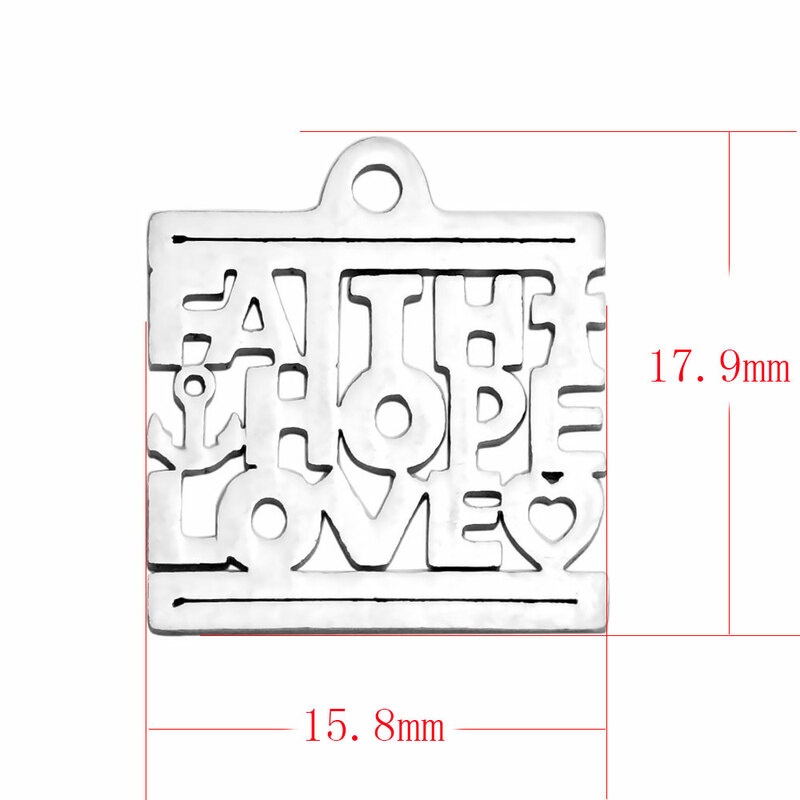 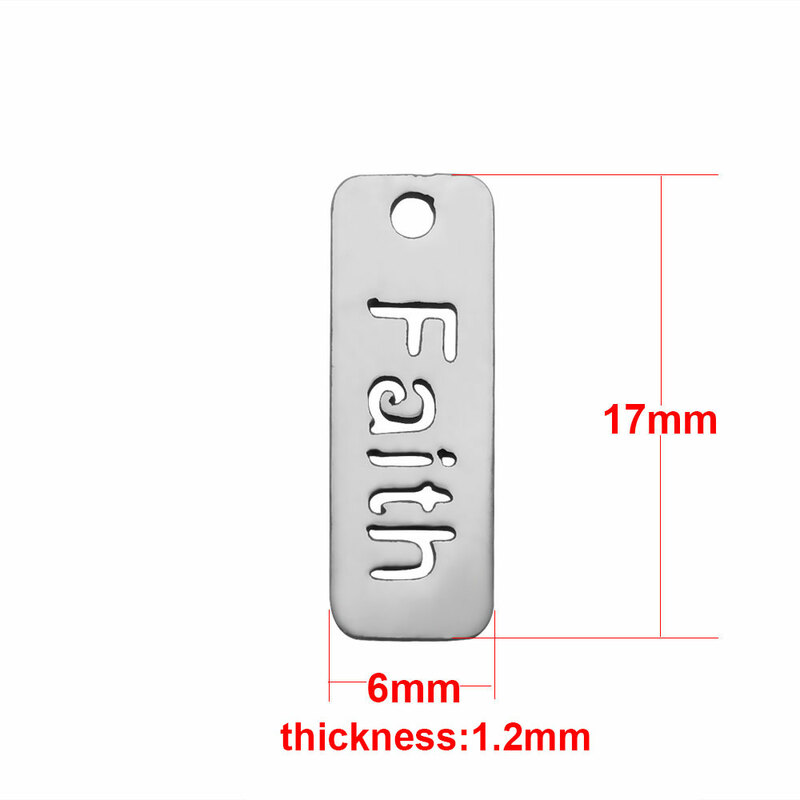 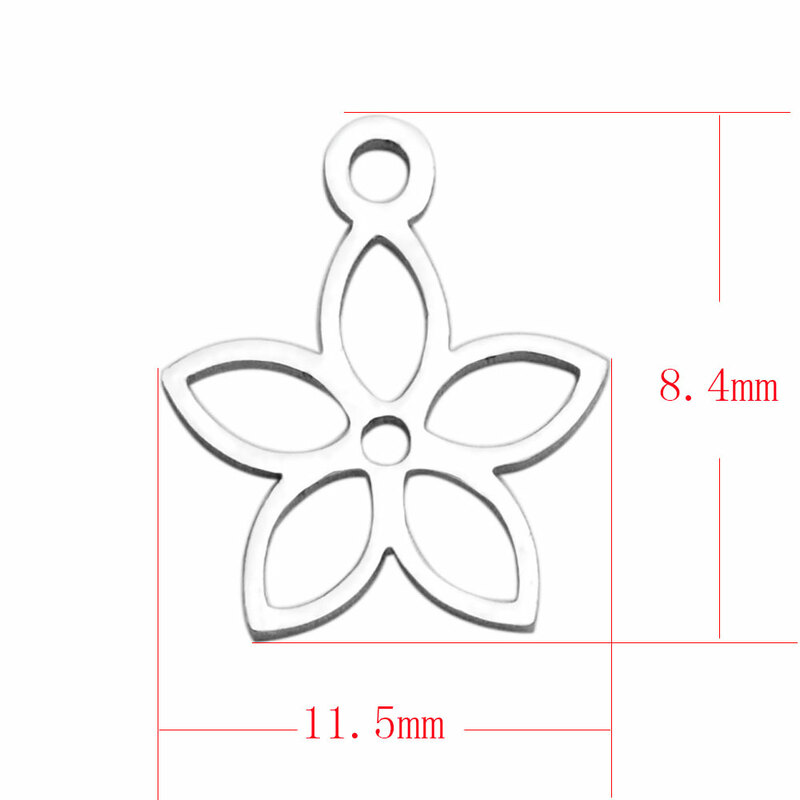 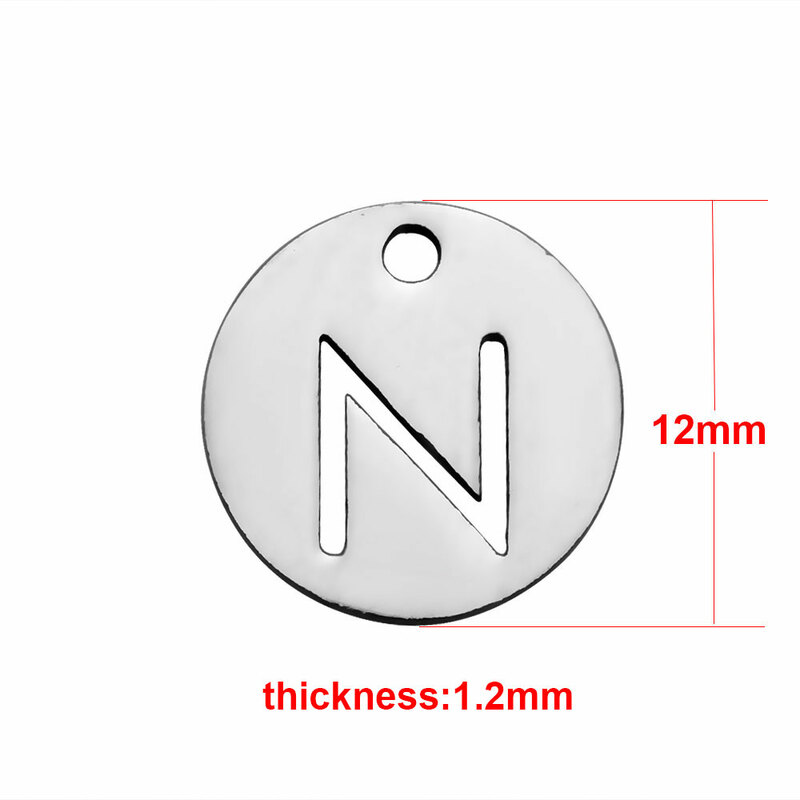 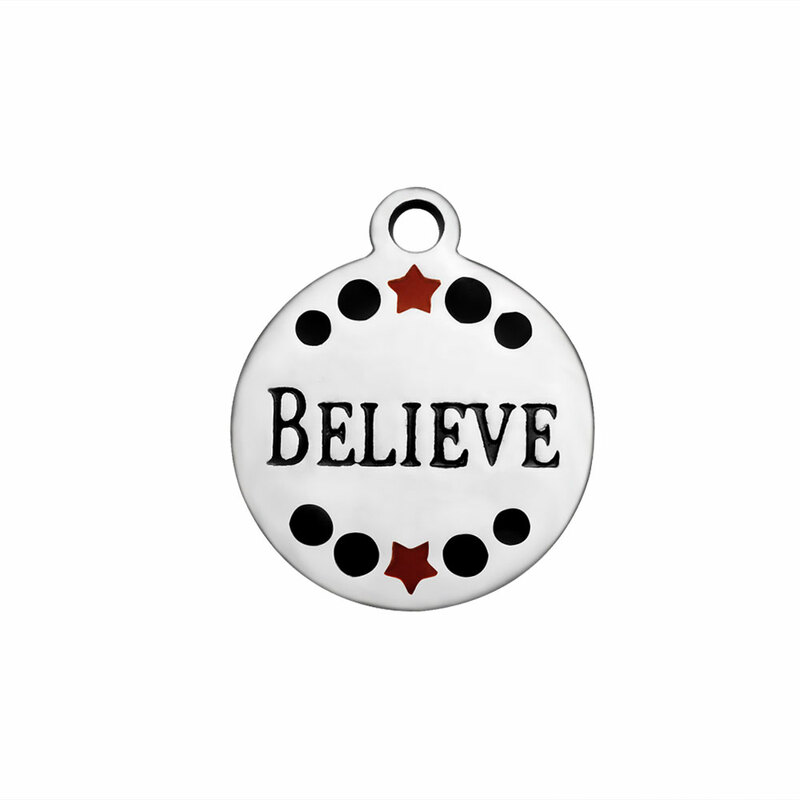 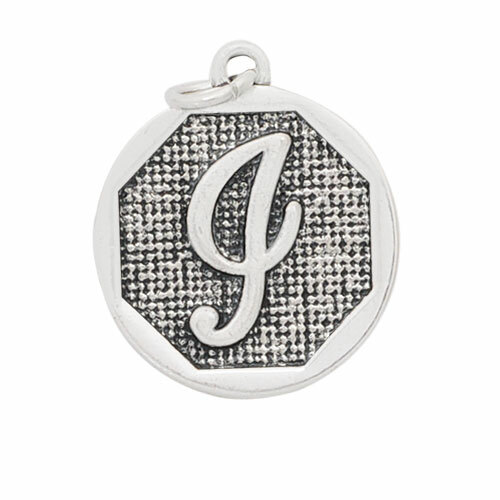 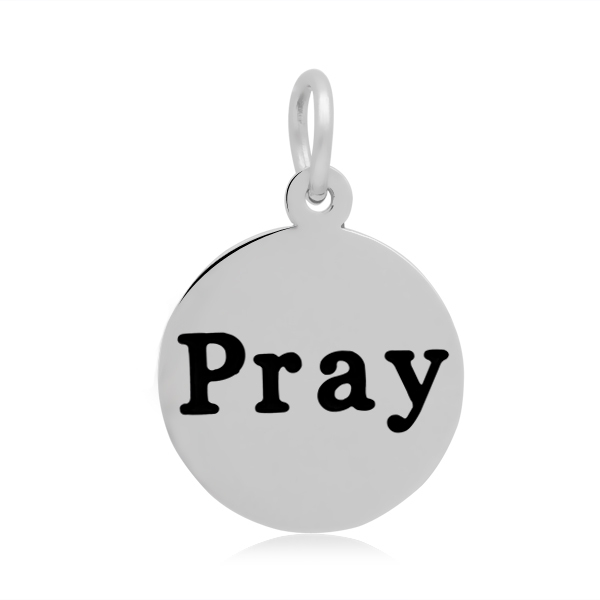 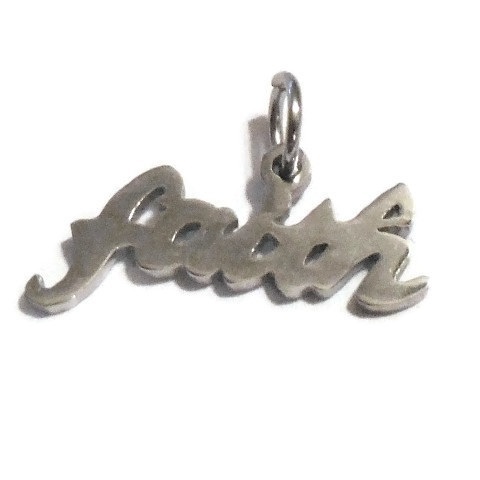 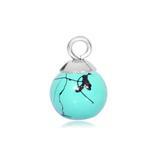 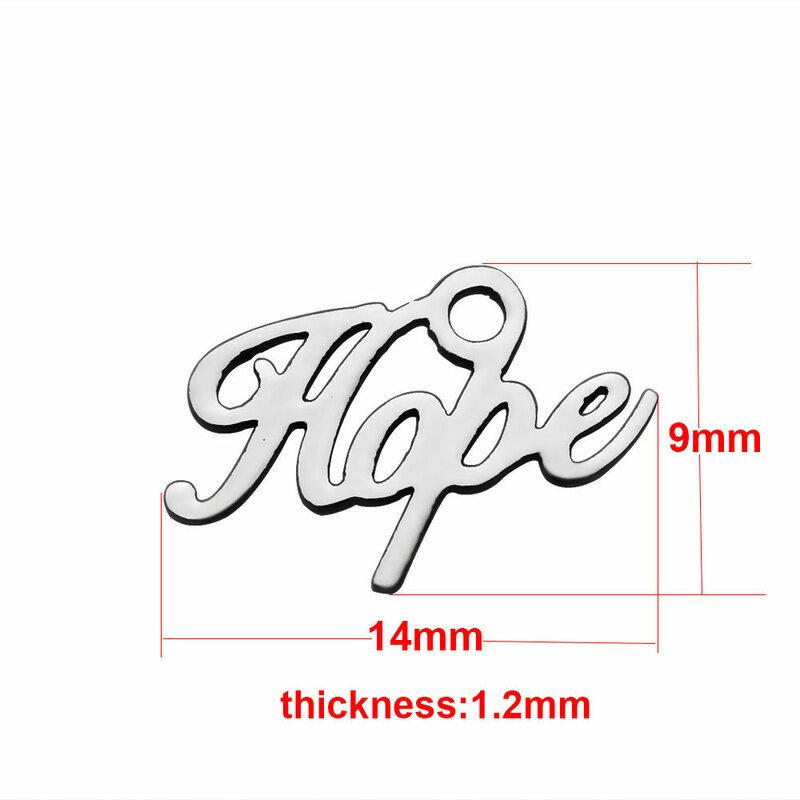 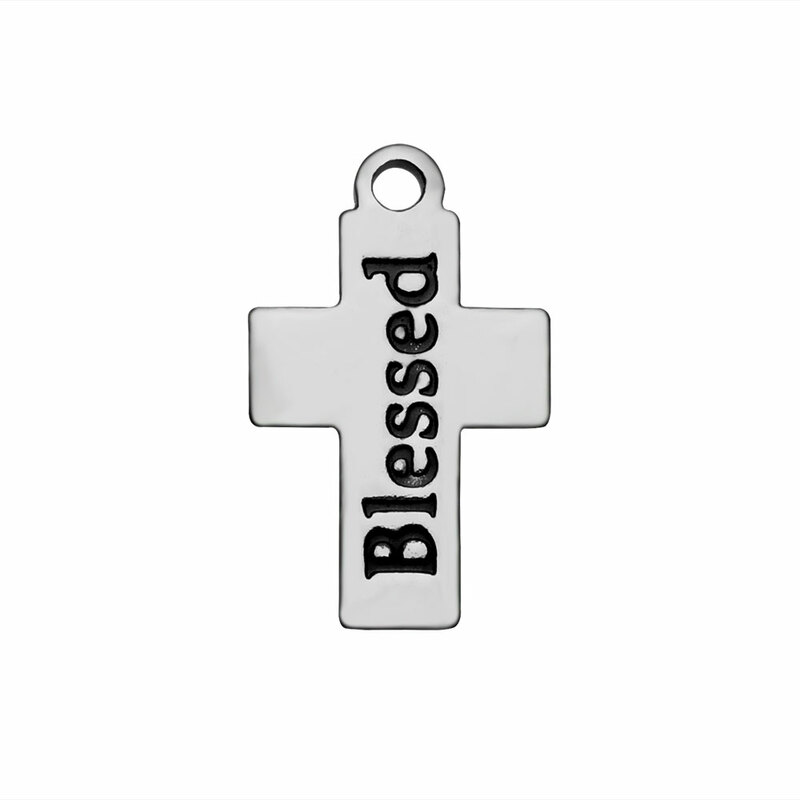 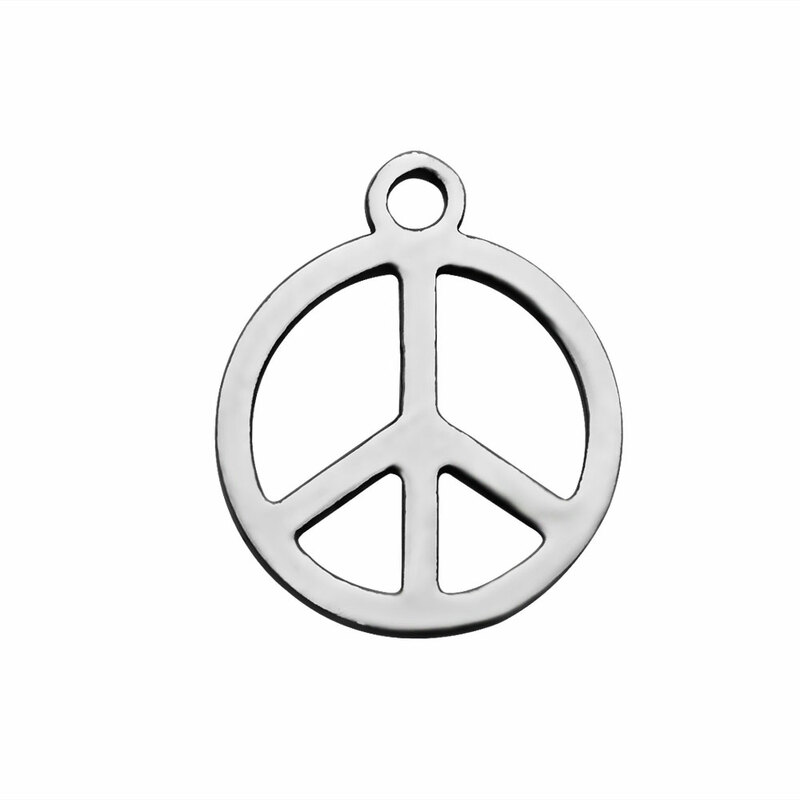 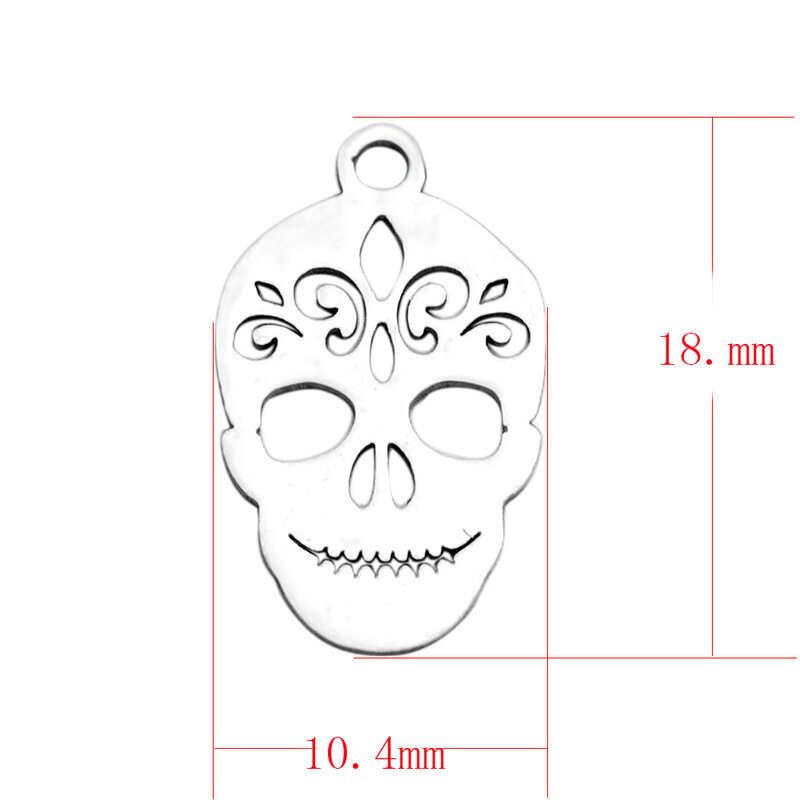 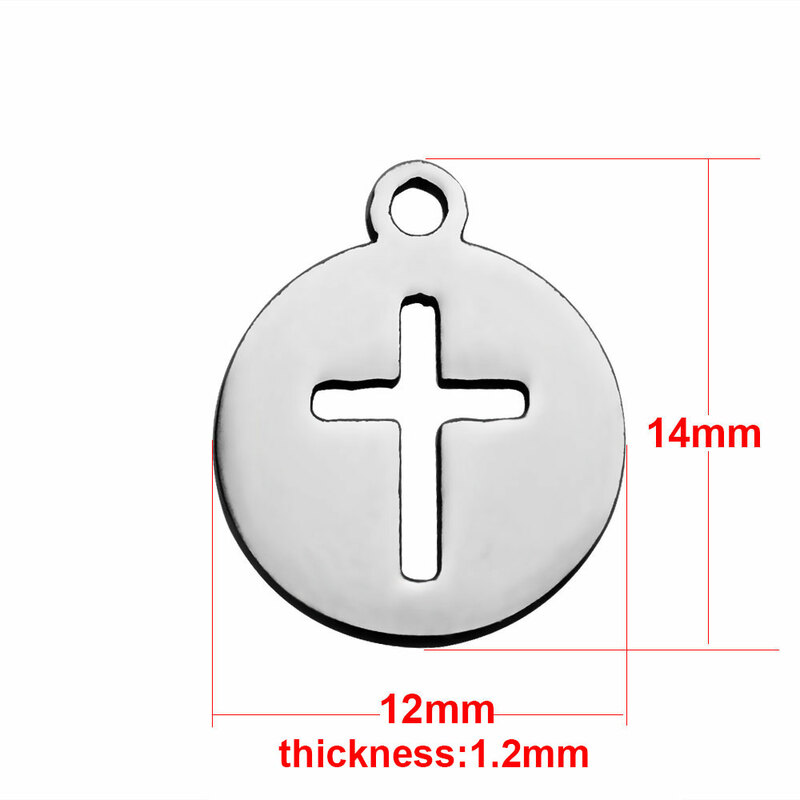 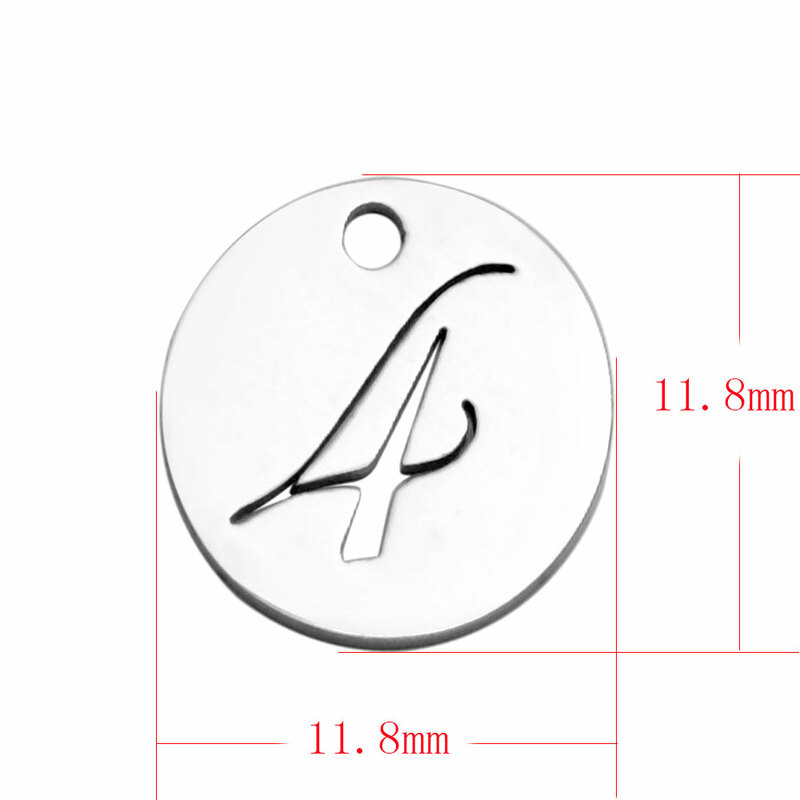 6*16mm Stainless Steel Charm - Faith Tag Stainless steel jewelry will not tarnish or rust. 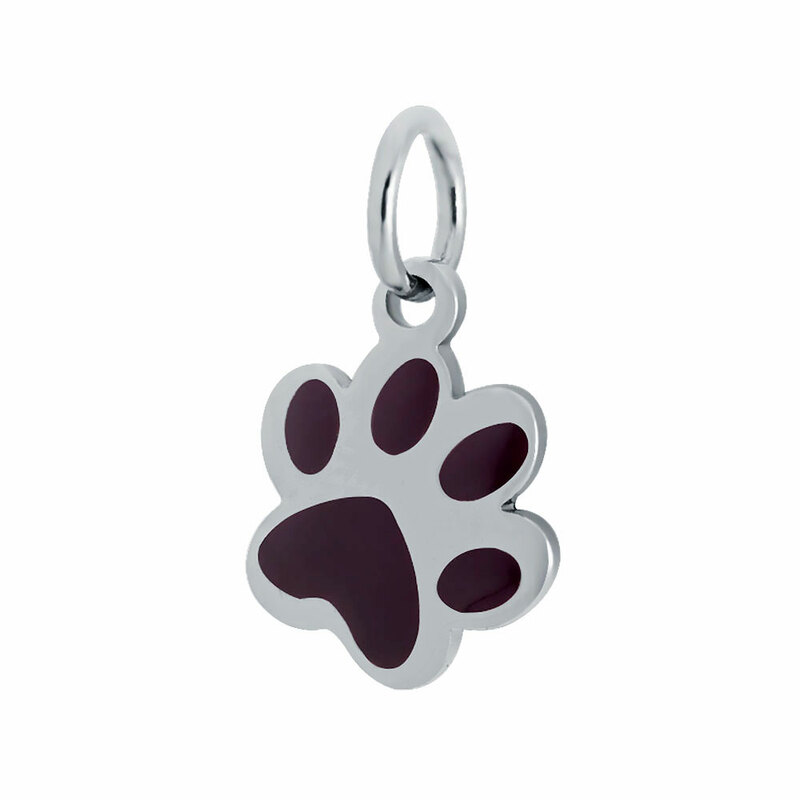 It is durable and scratch resistant. 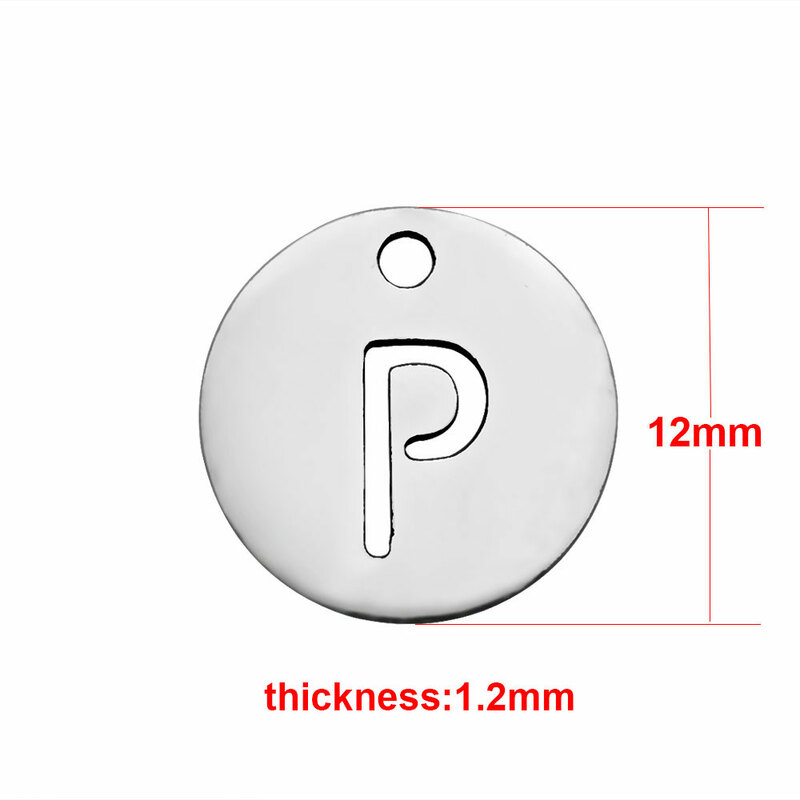 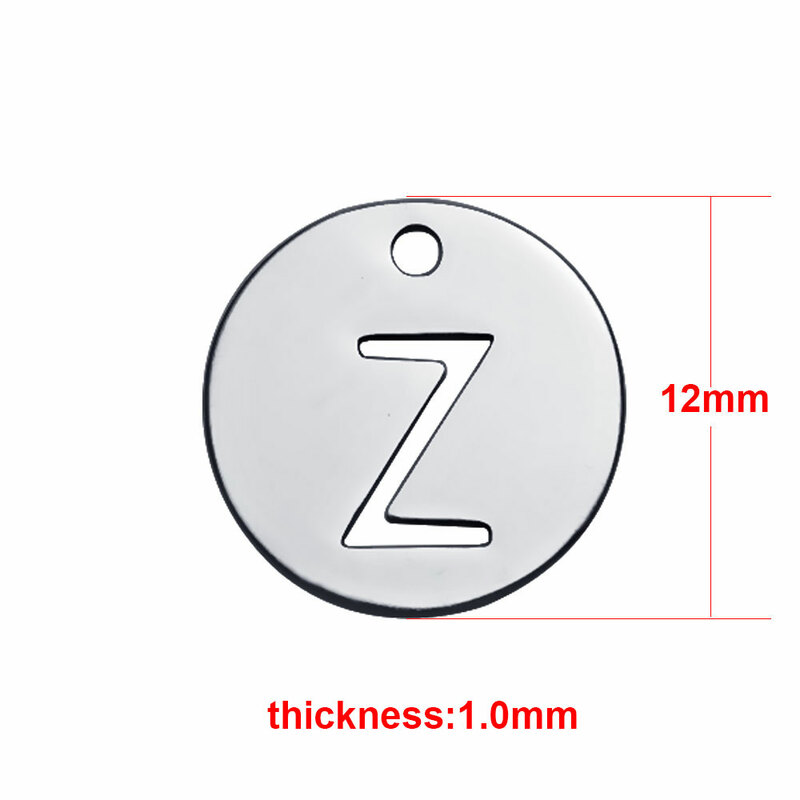 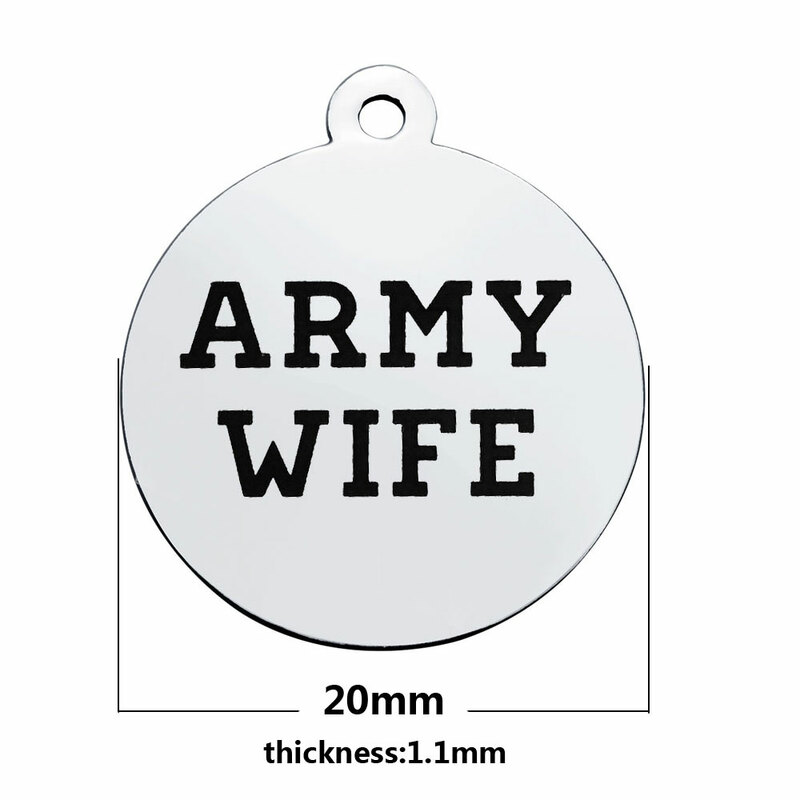 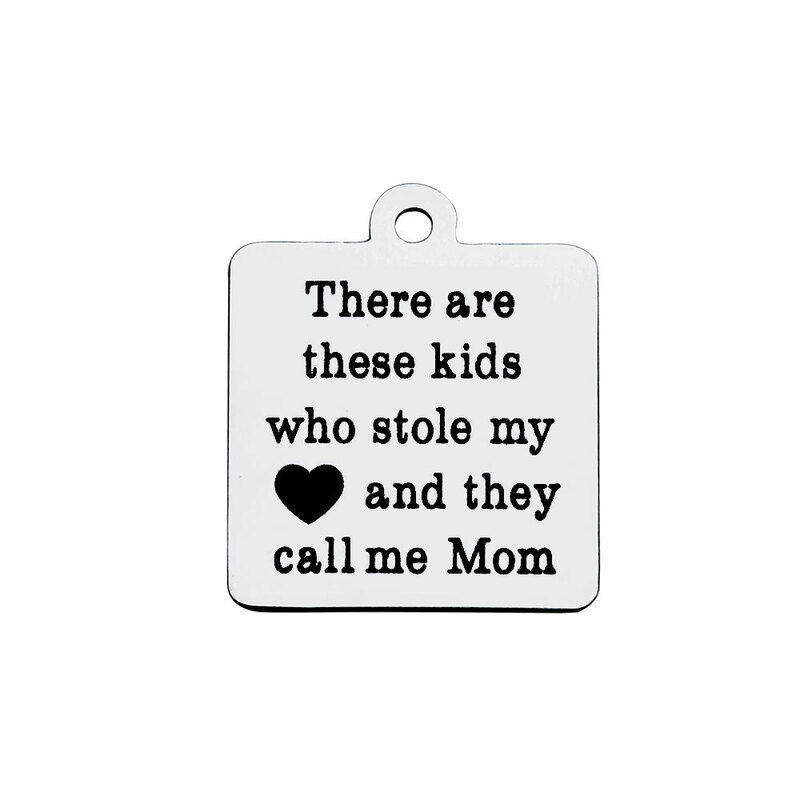 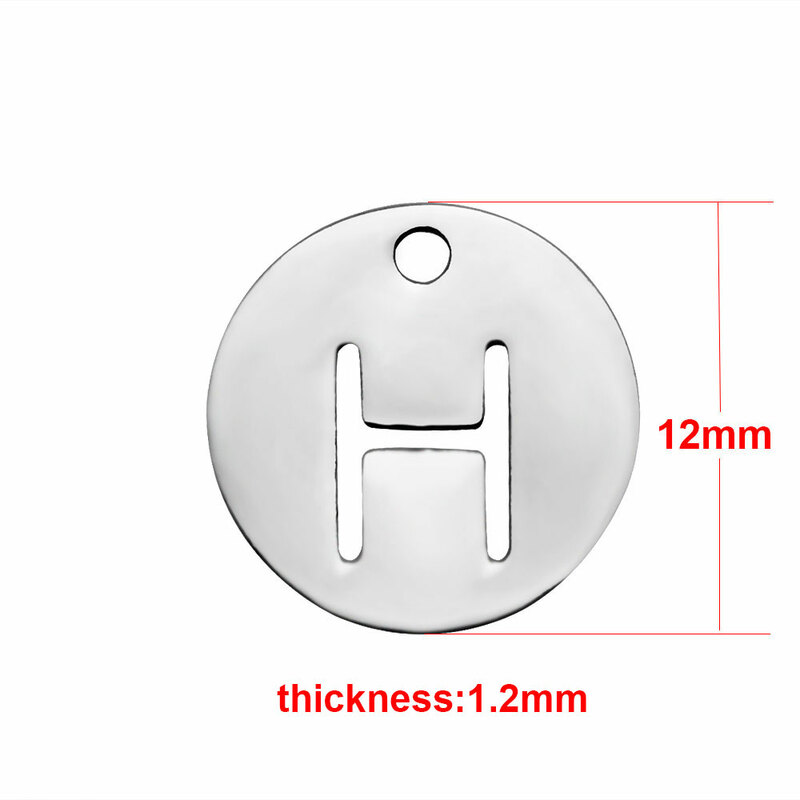 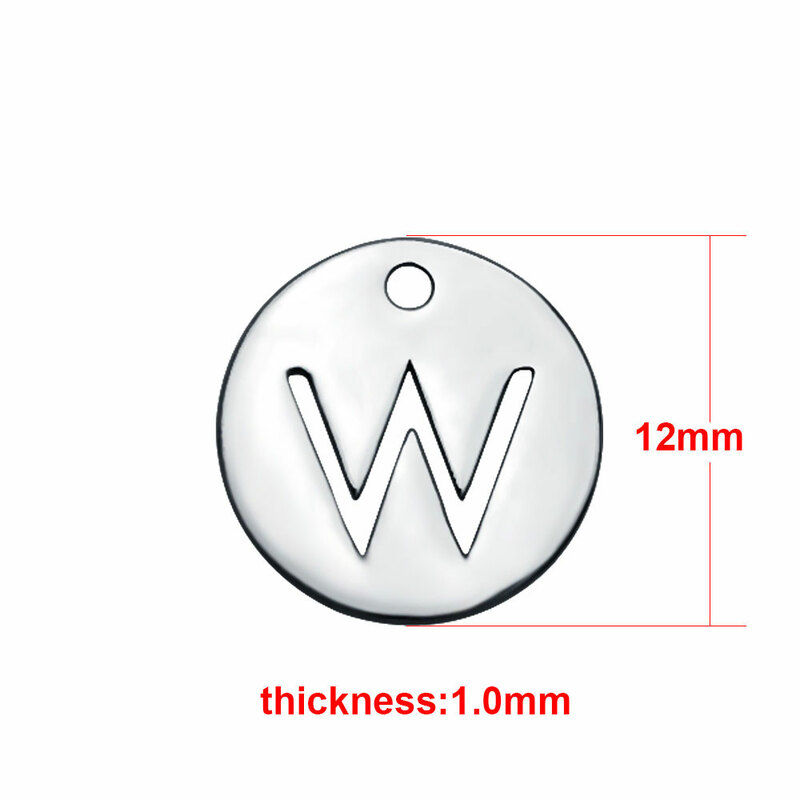 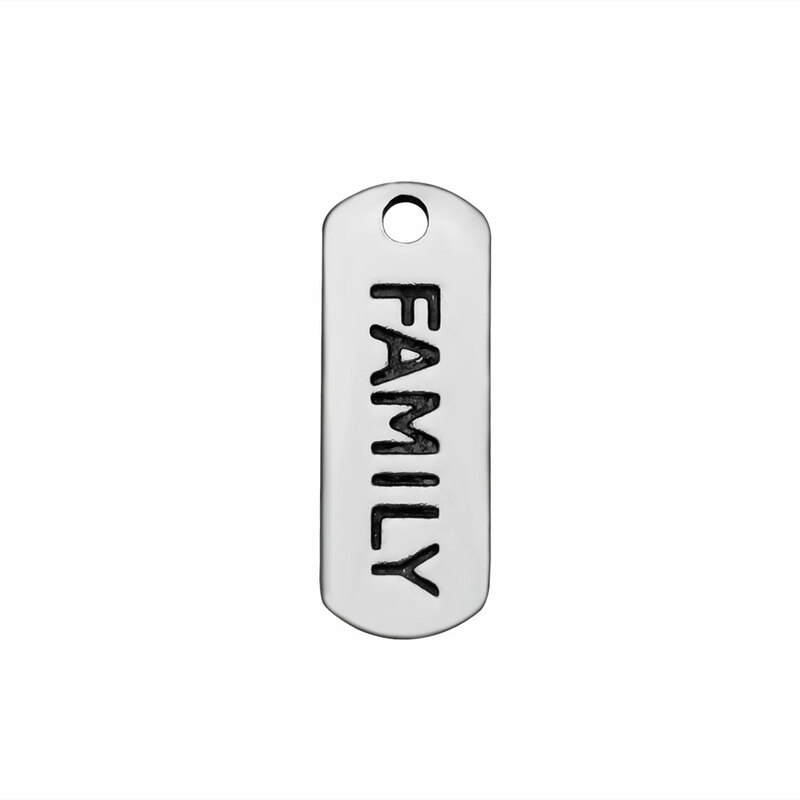 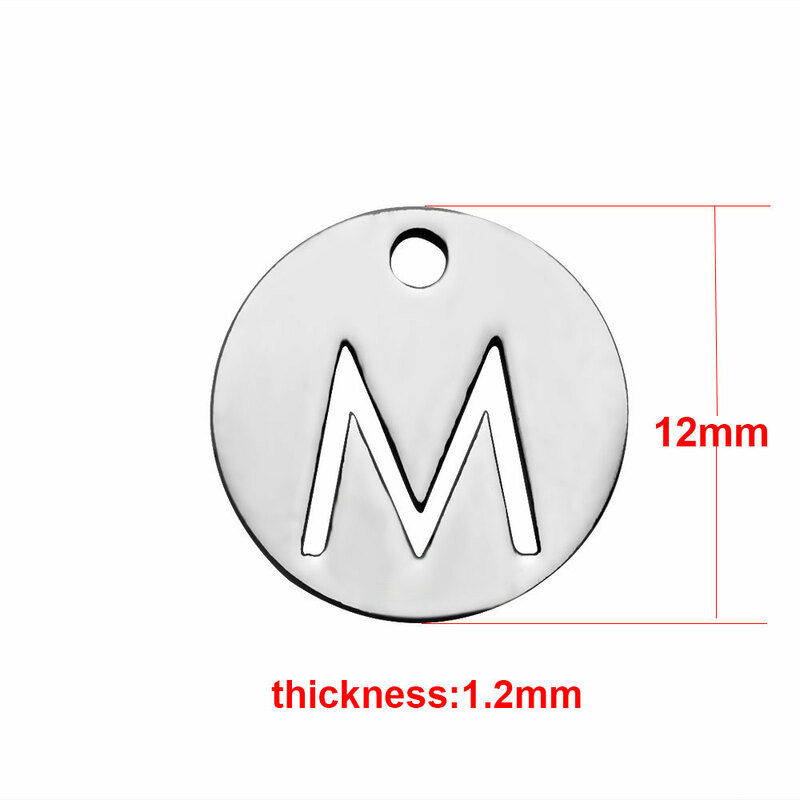 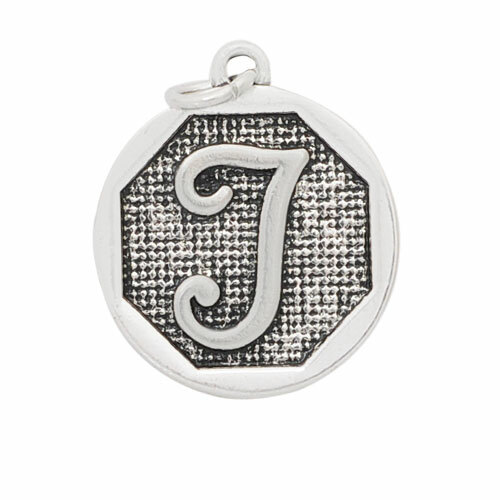 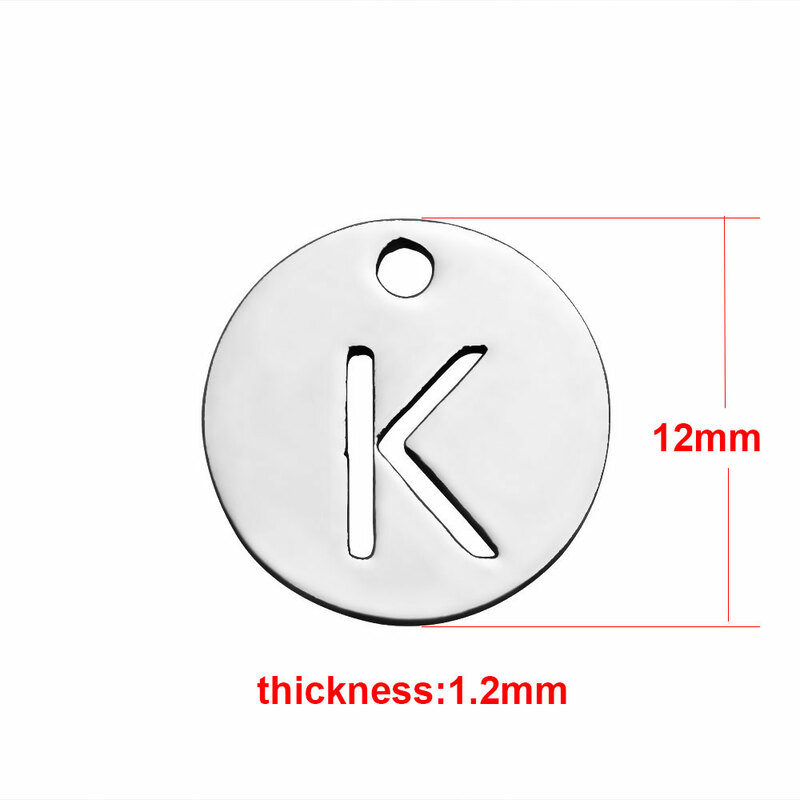 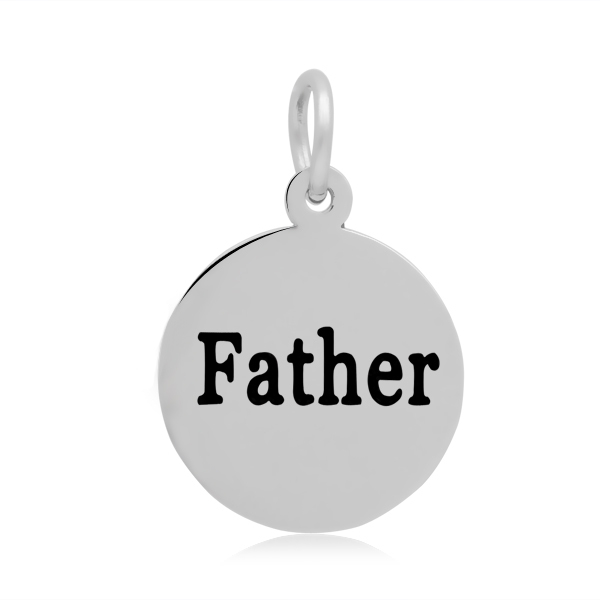 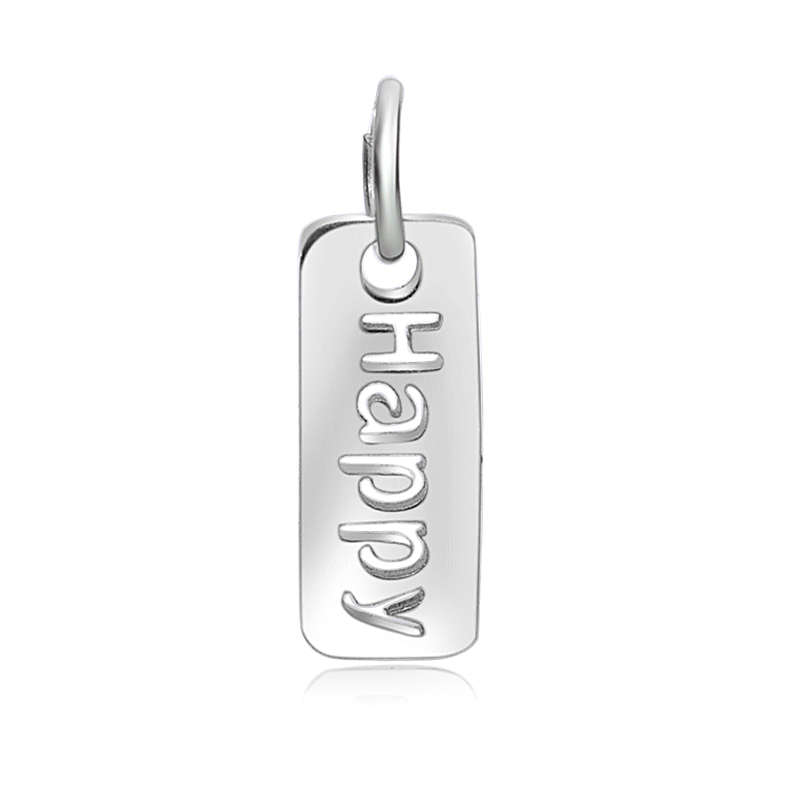 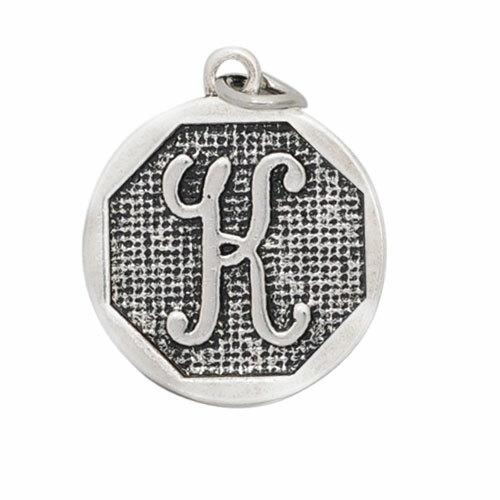 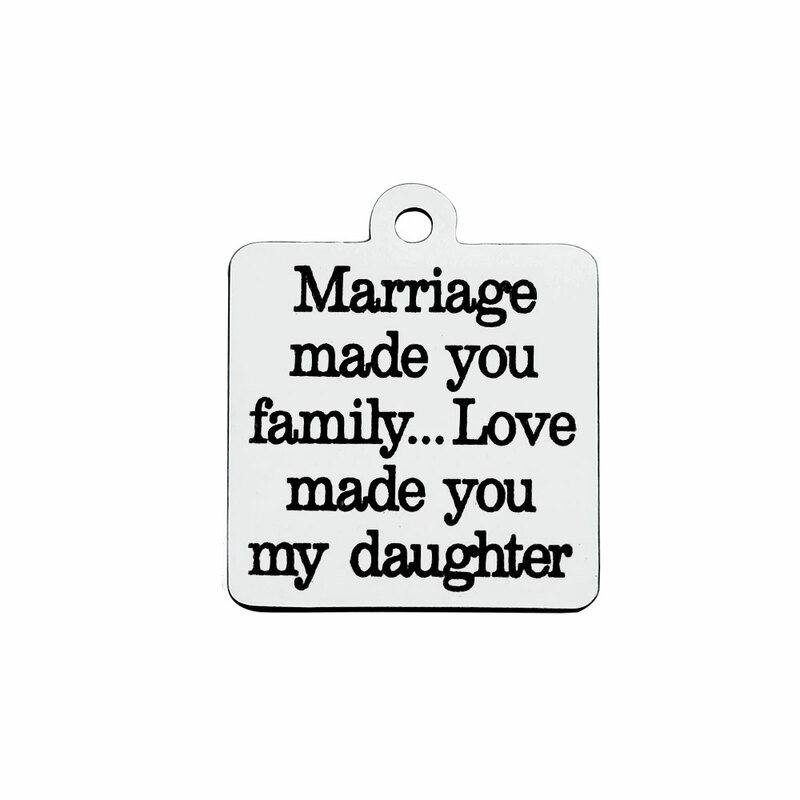 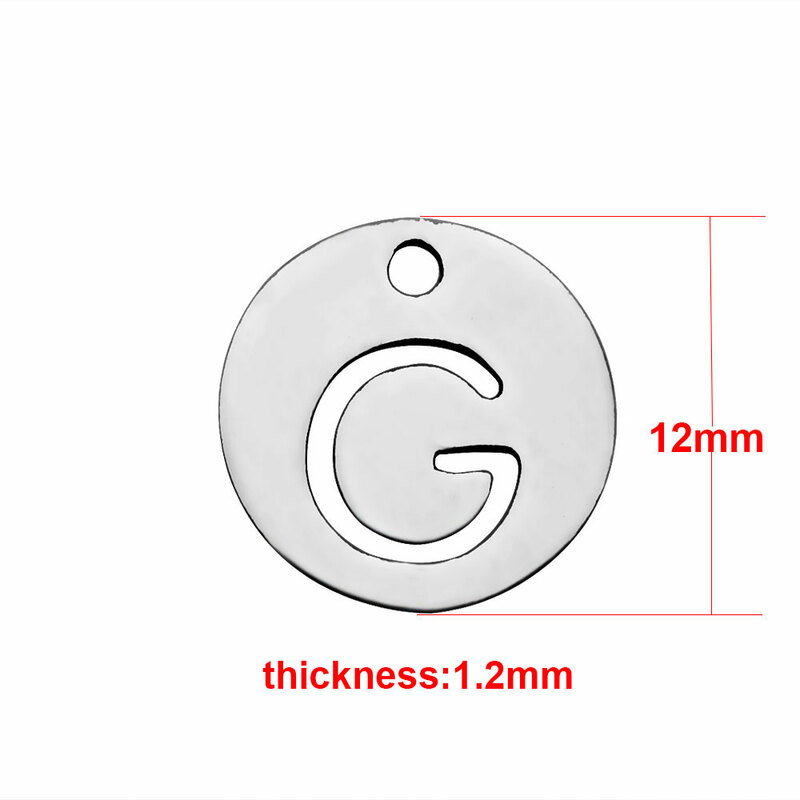 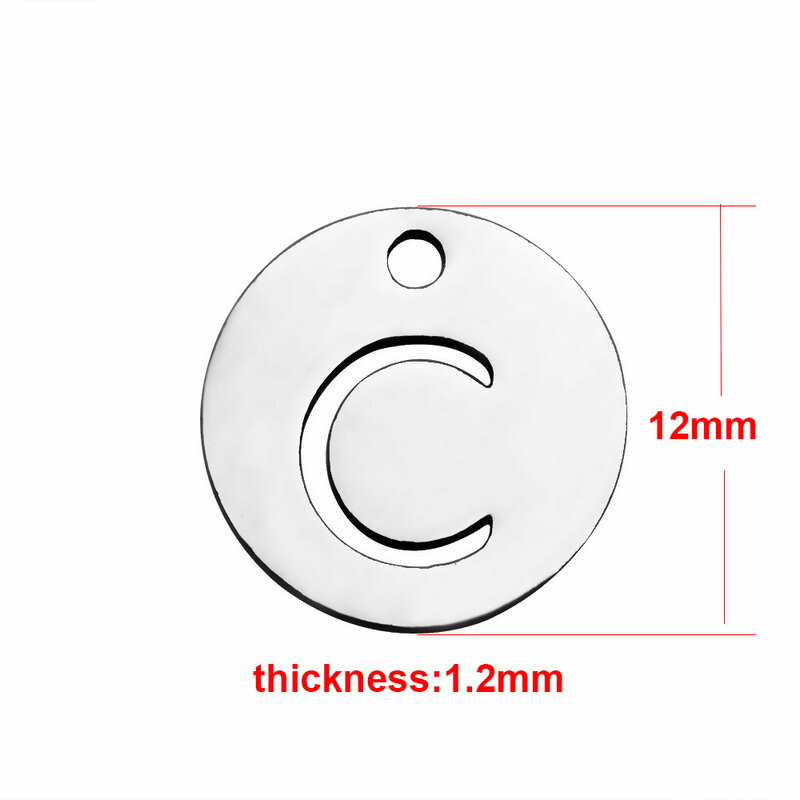 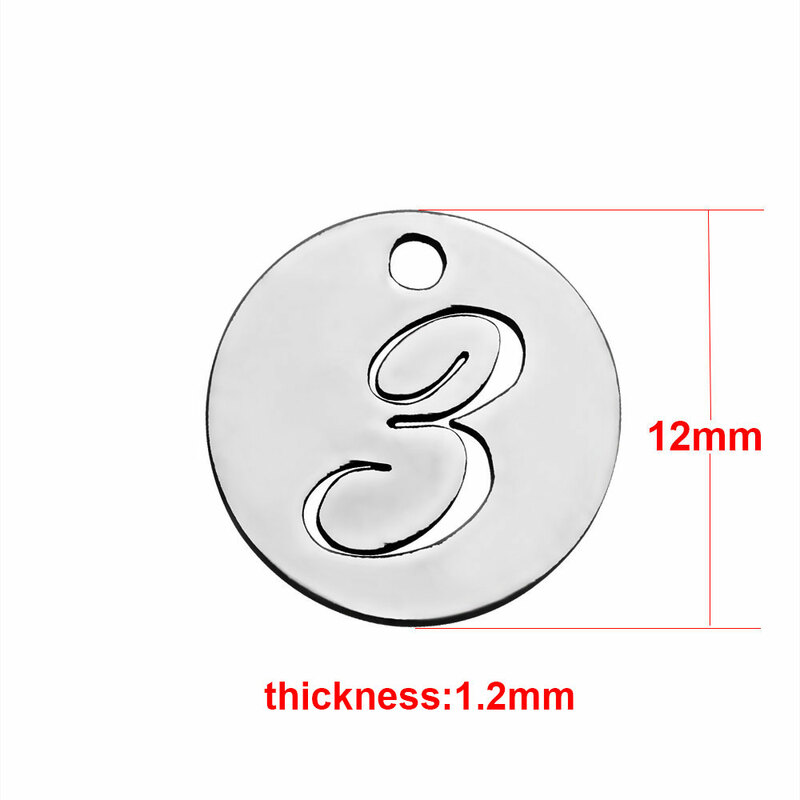 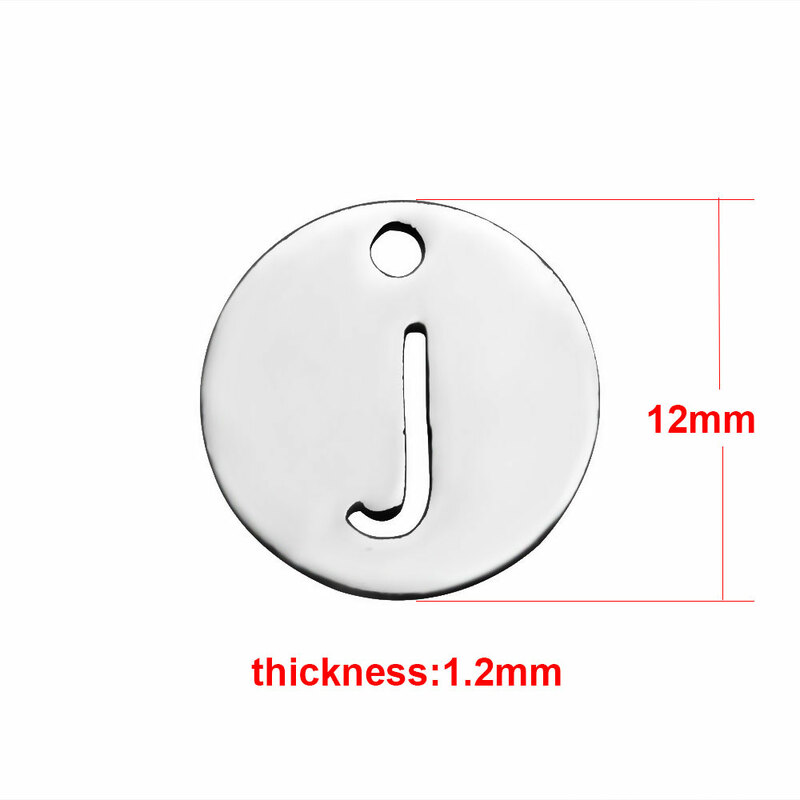 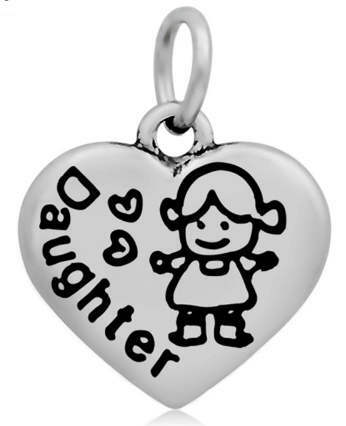 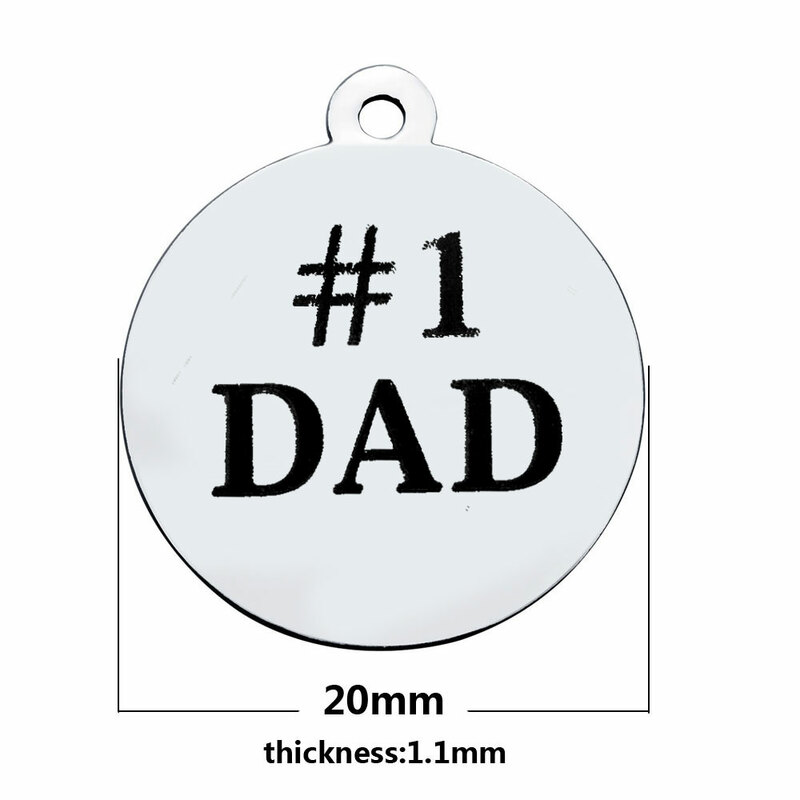 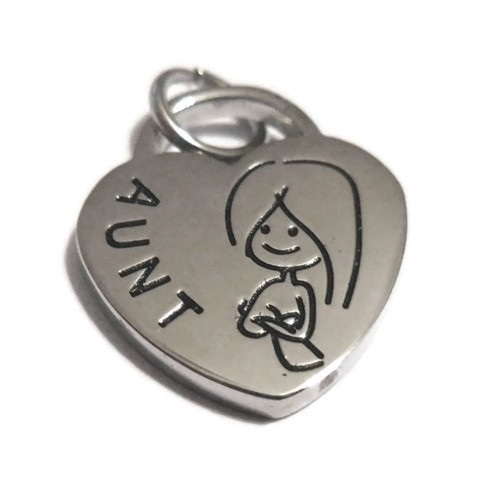 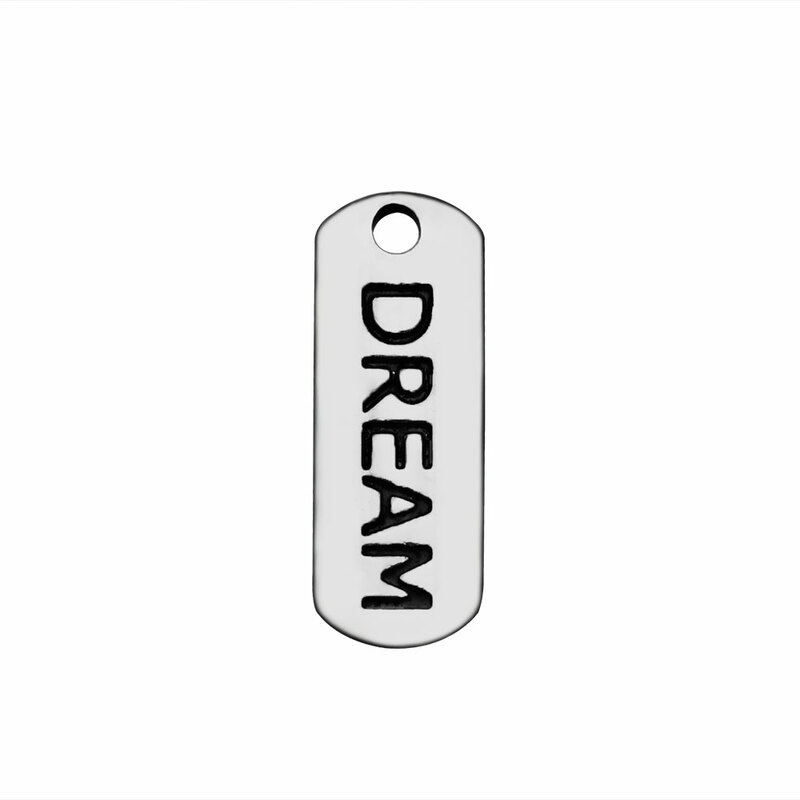 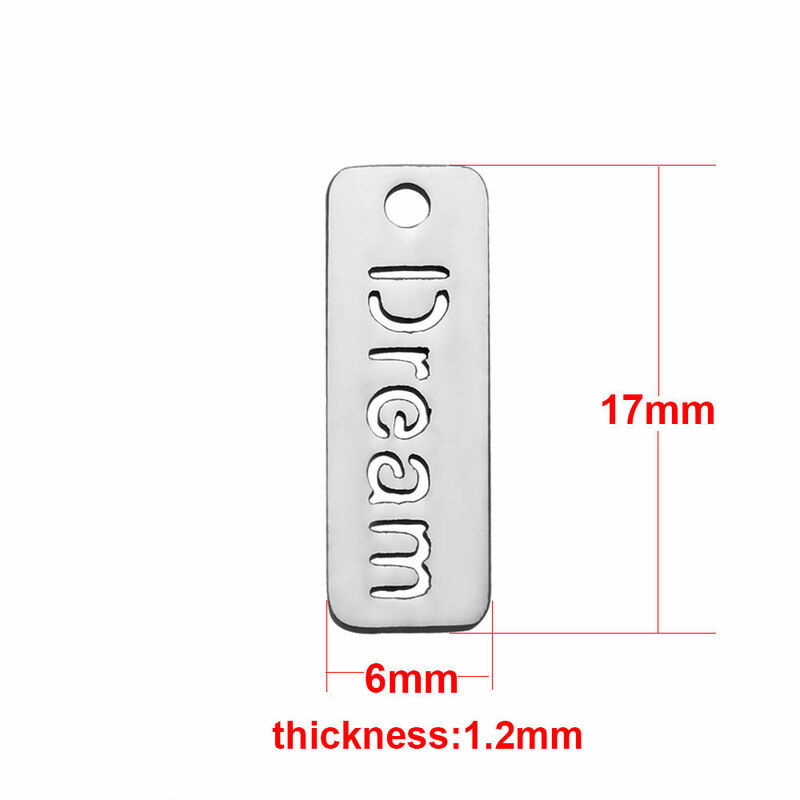 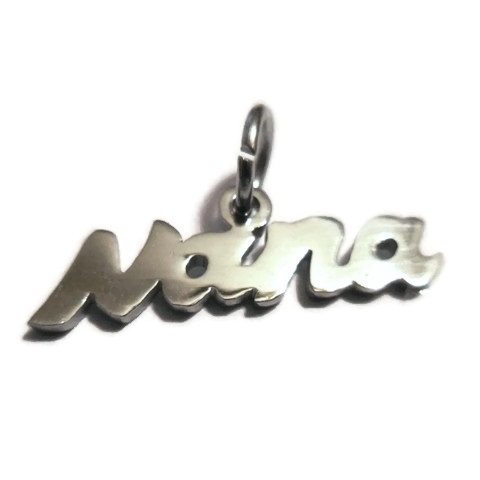 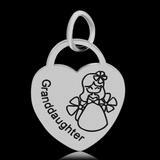 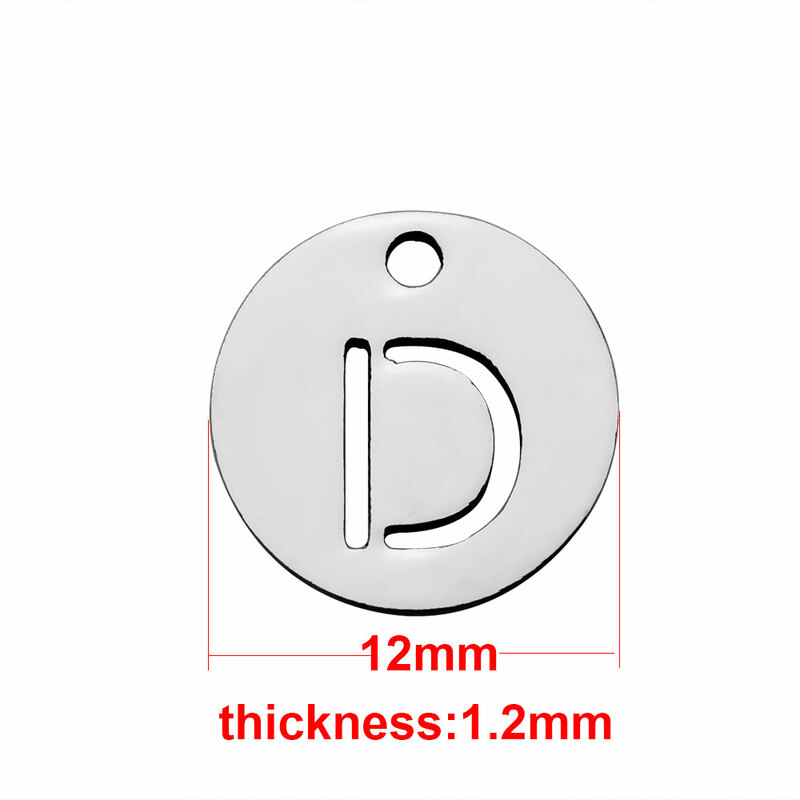 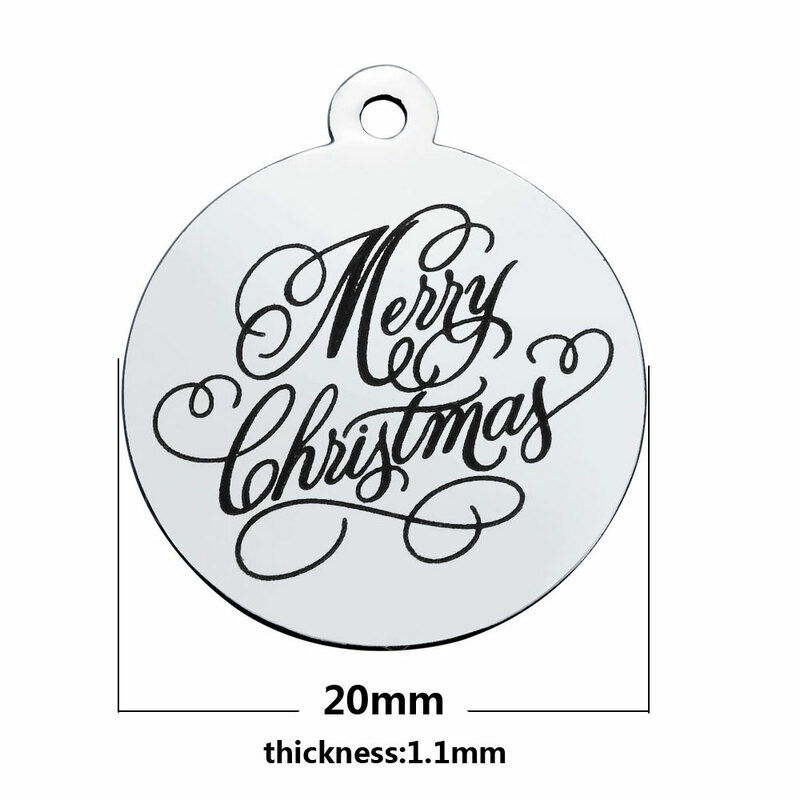 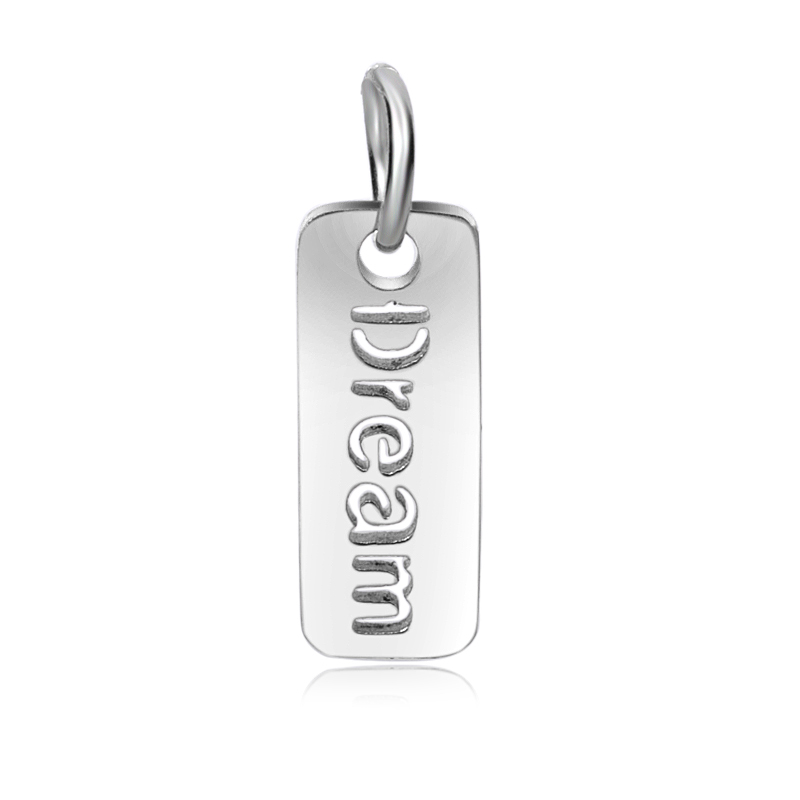 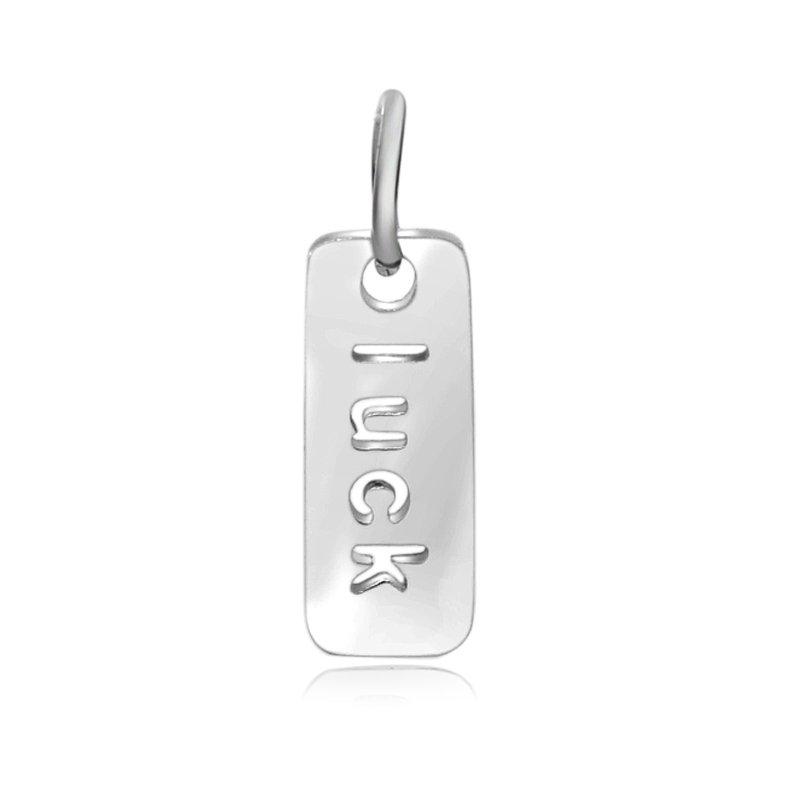 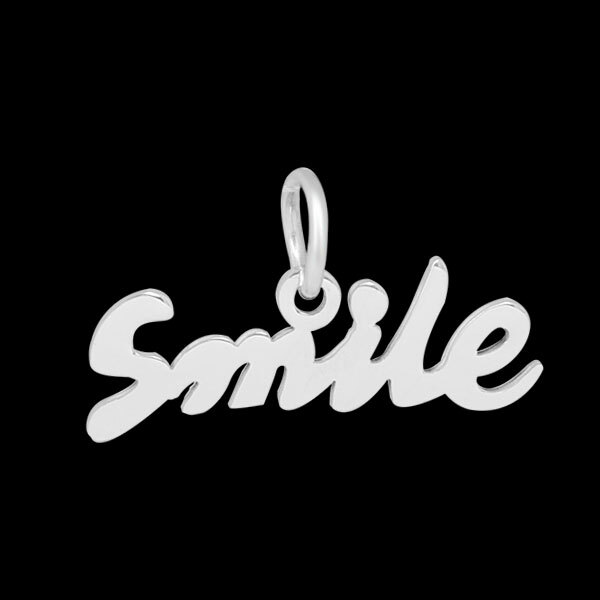 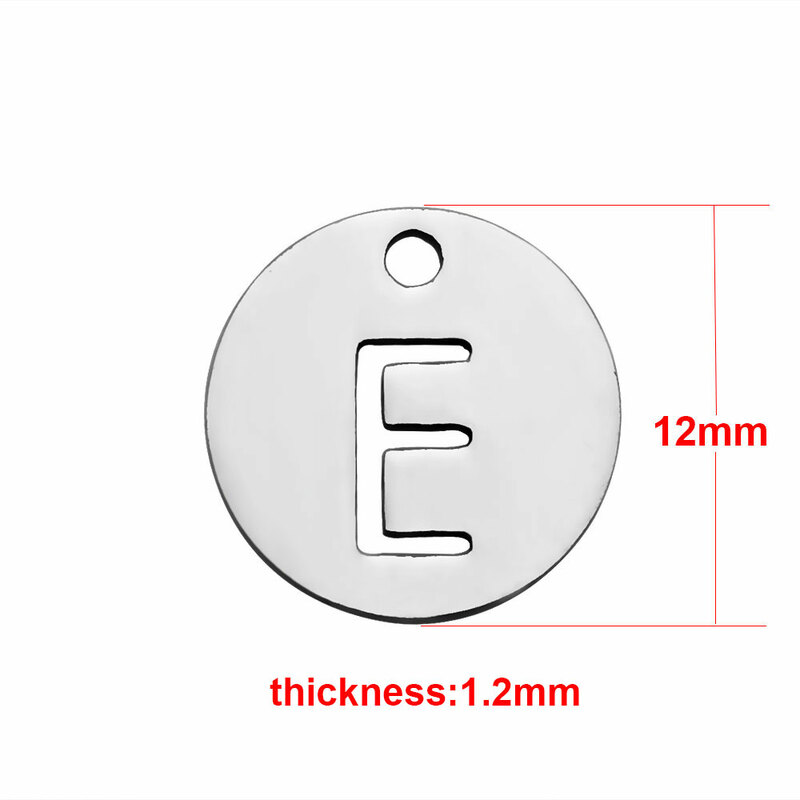 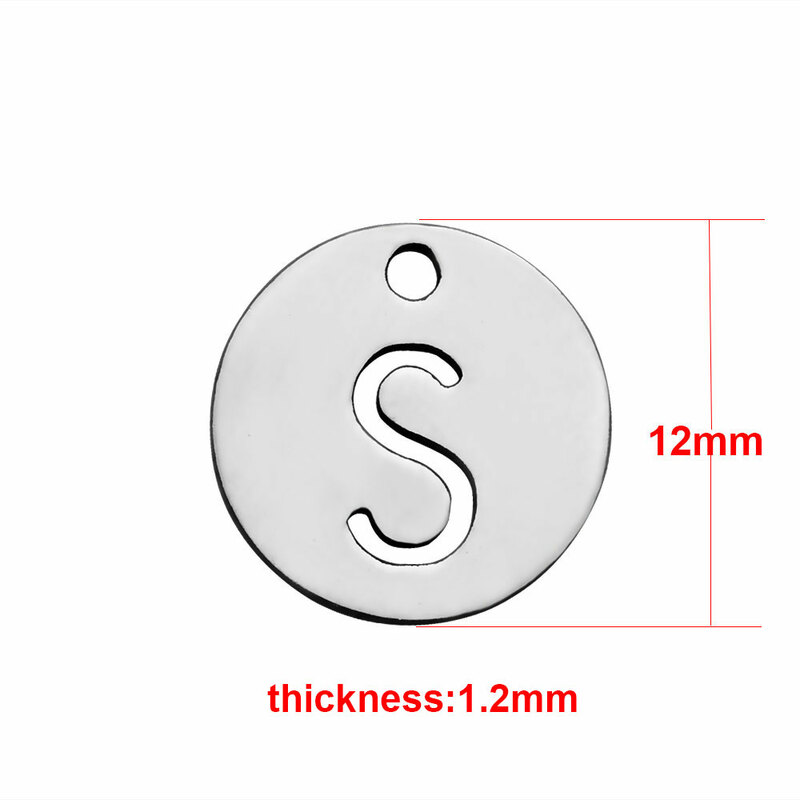 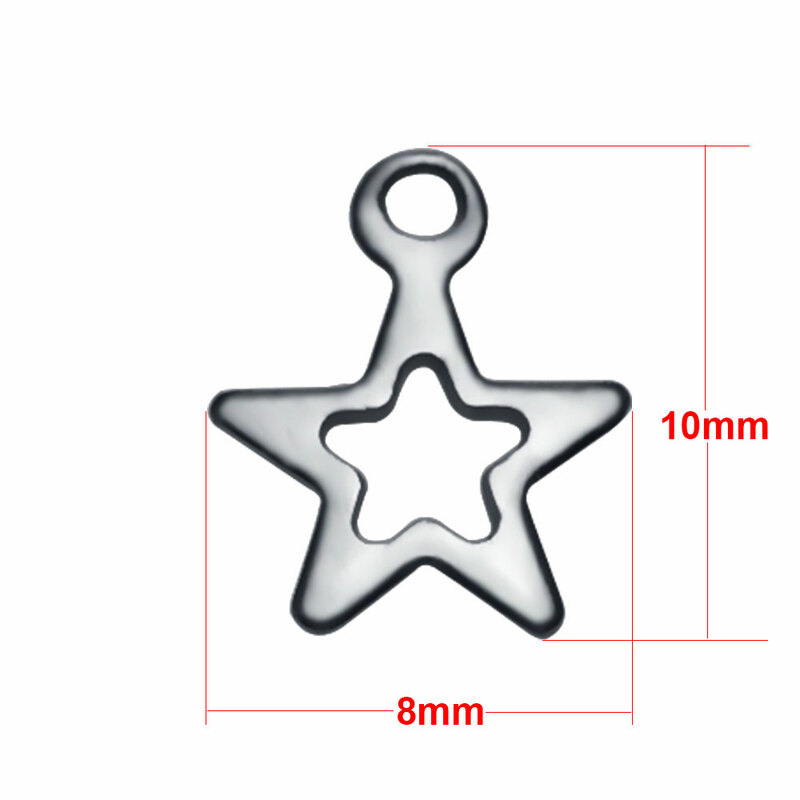 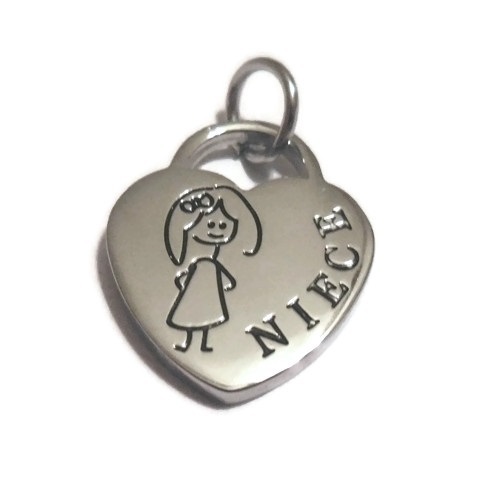 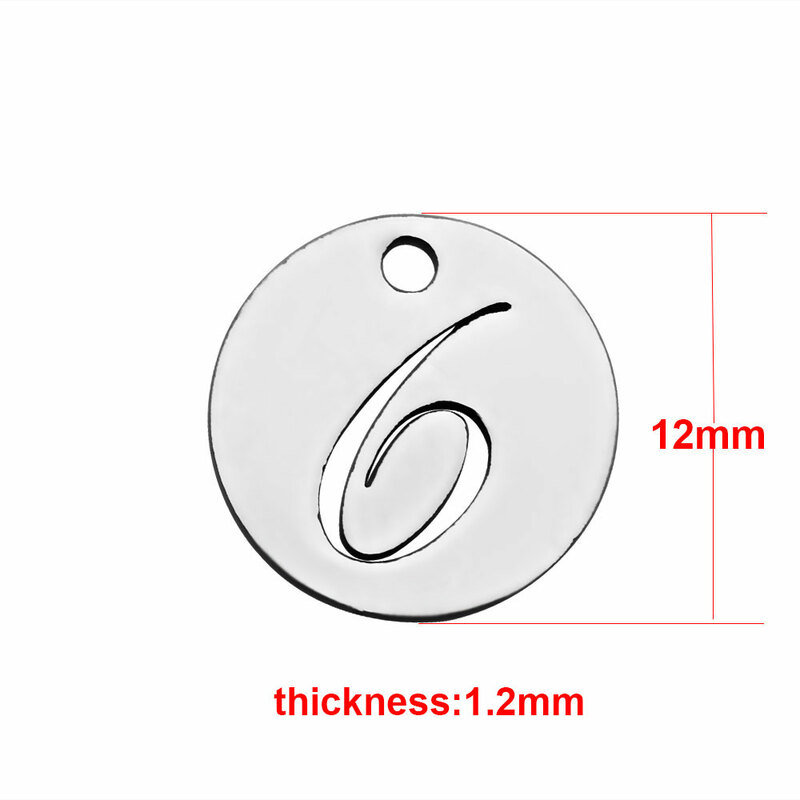 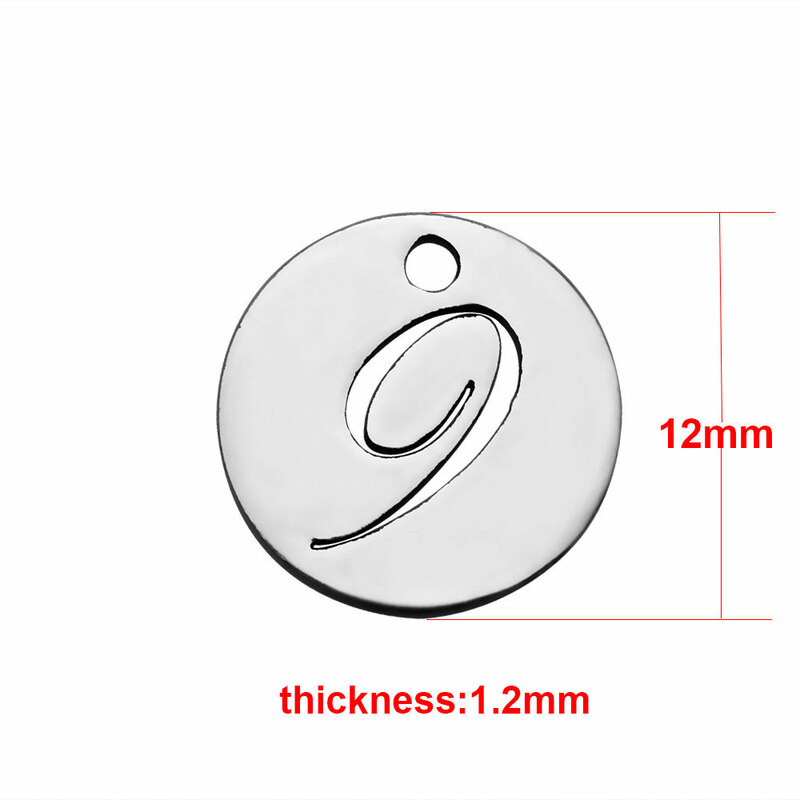 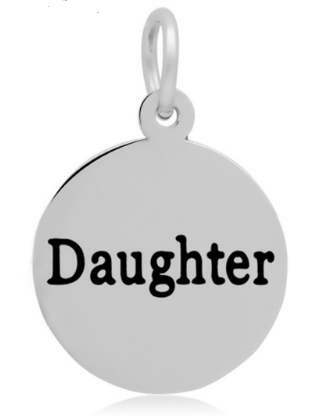 6*16mm Stainless Steel Charm - Family Tag Stainless steel jewelry will not tarnish or rust. 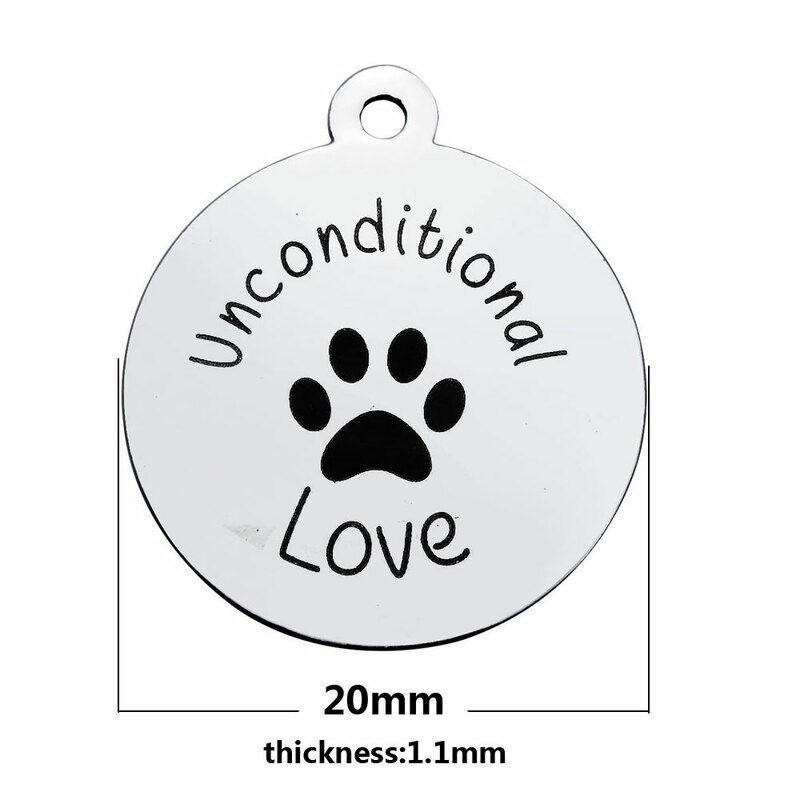 It is durable and scratch resistant. 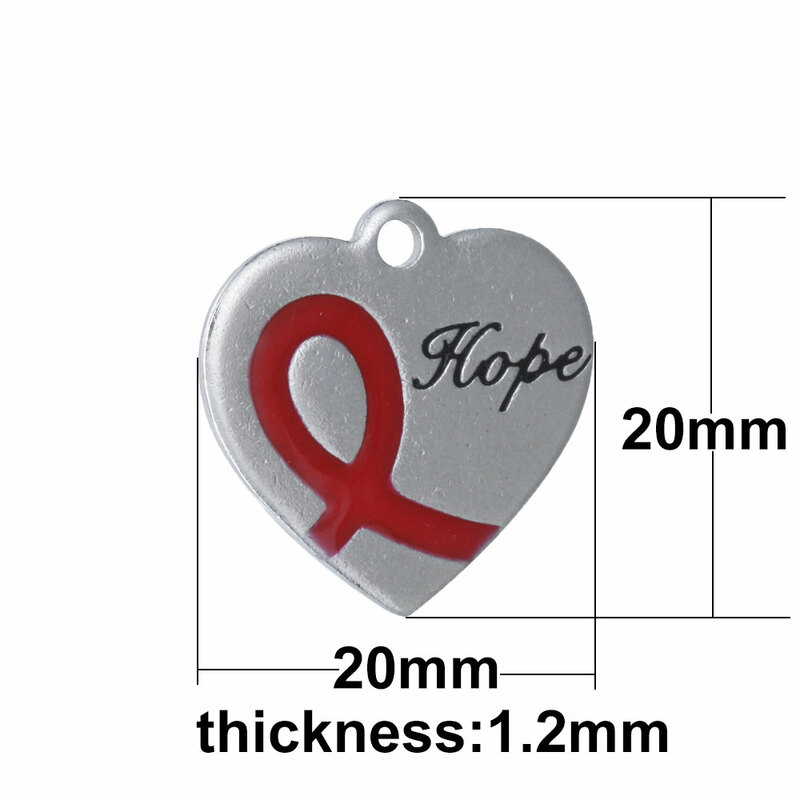 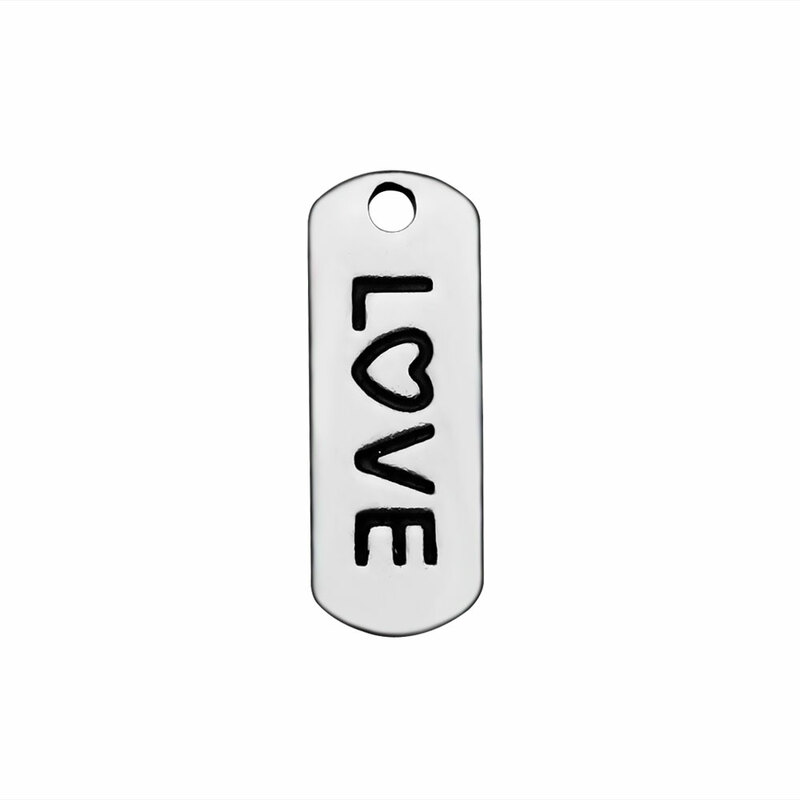 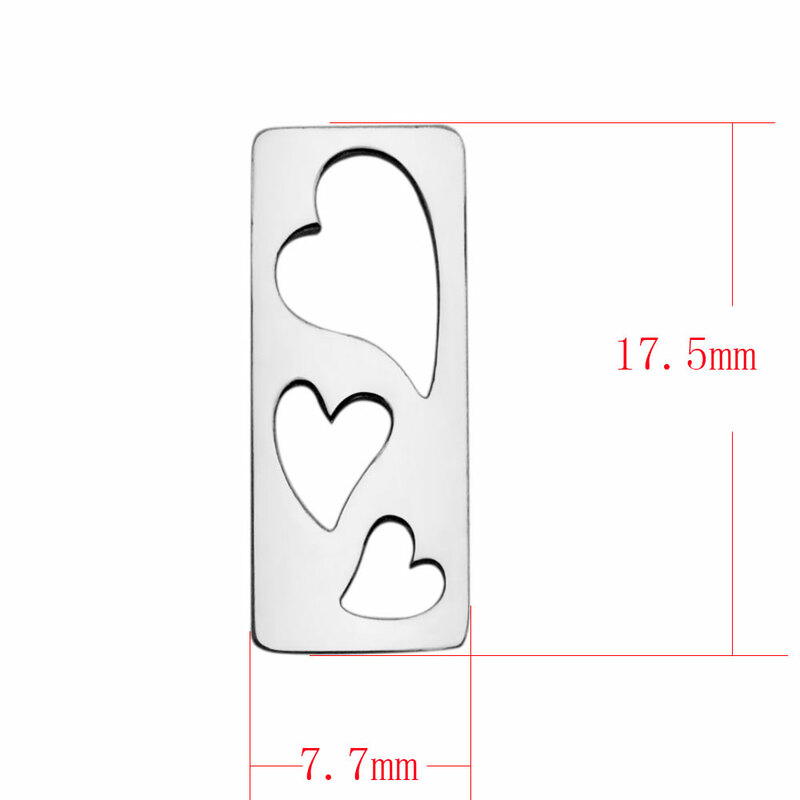 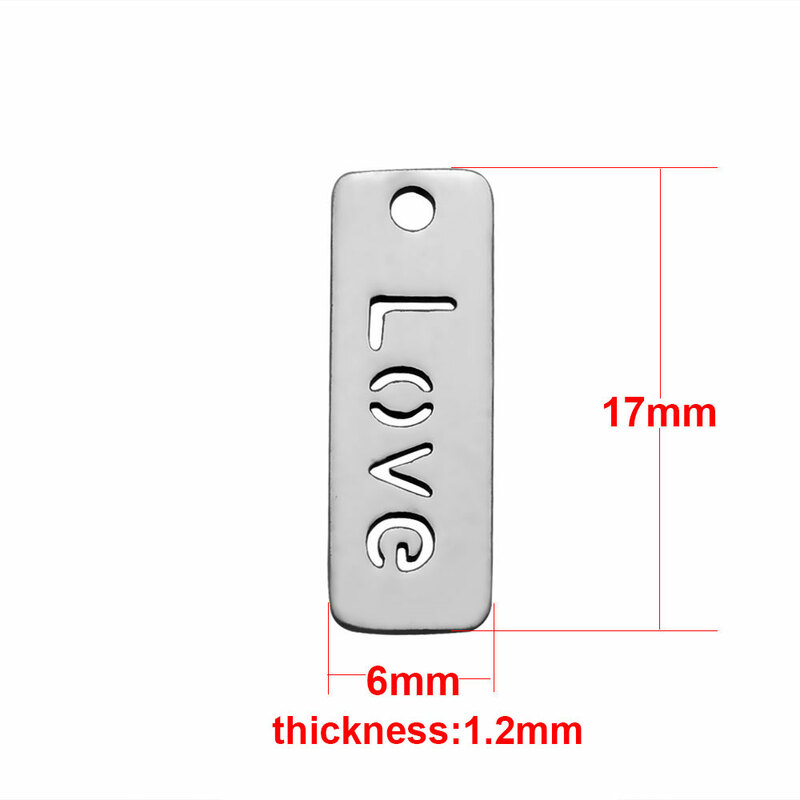 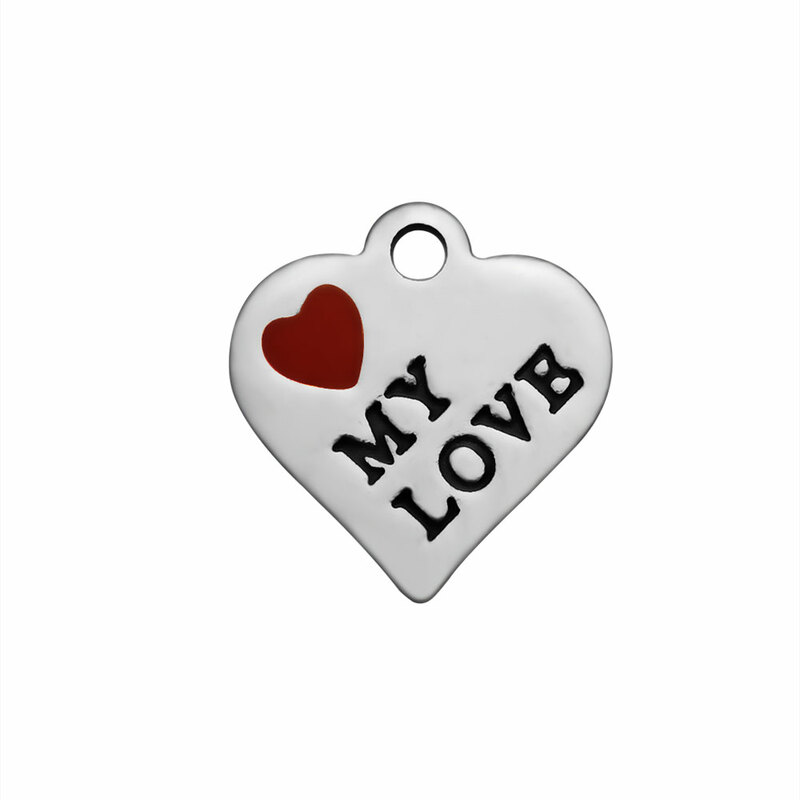 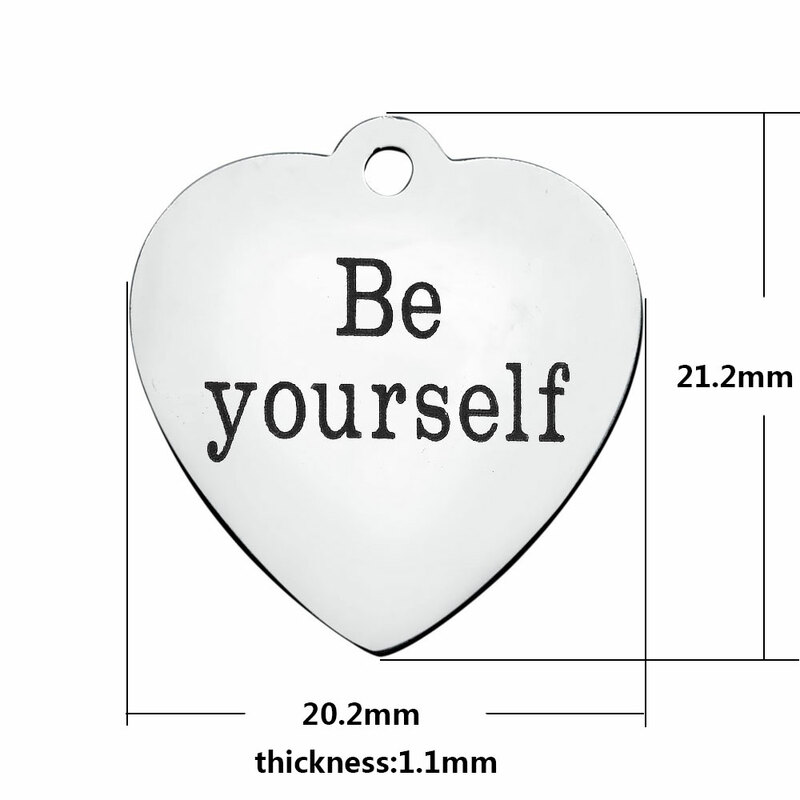 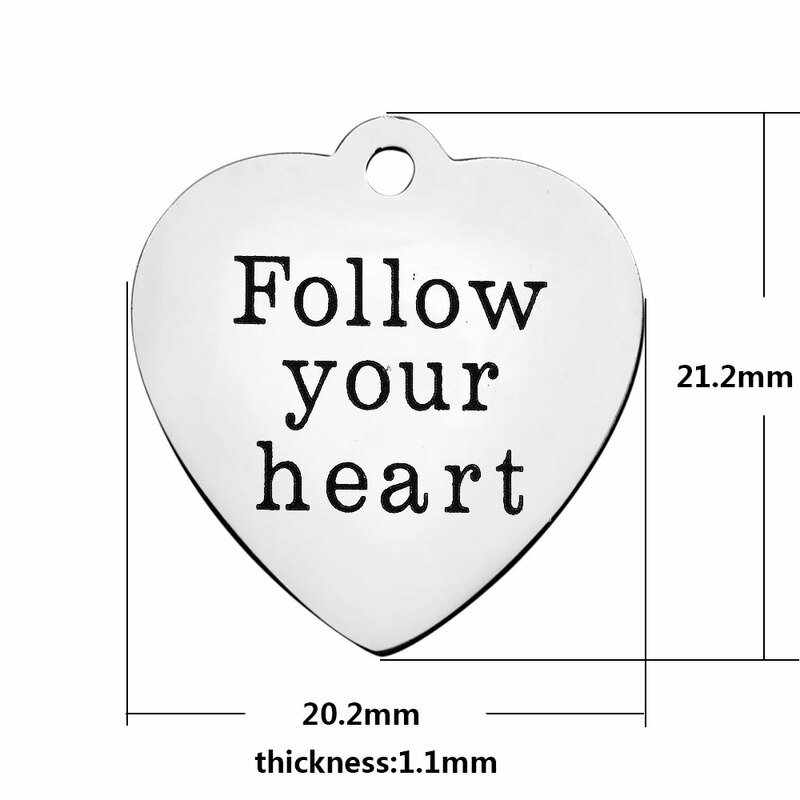 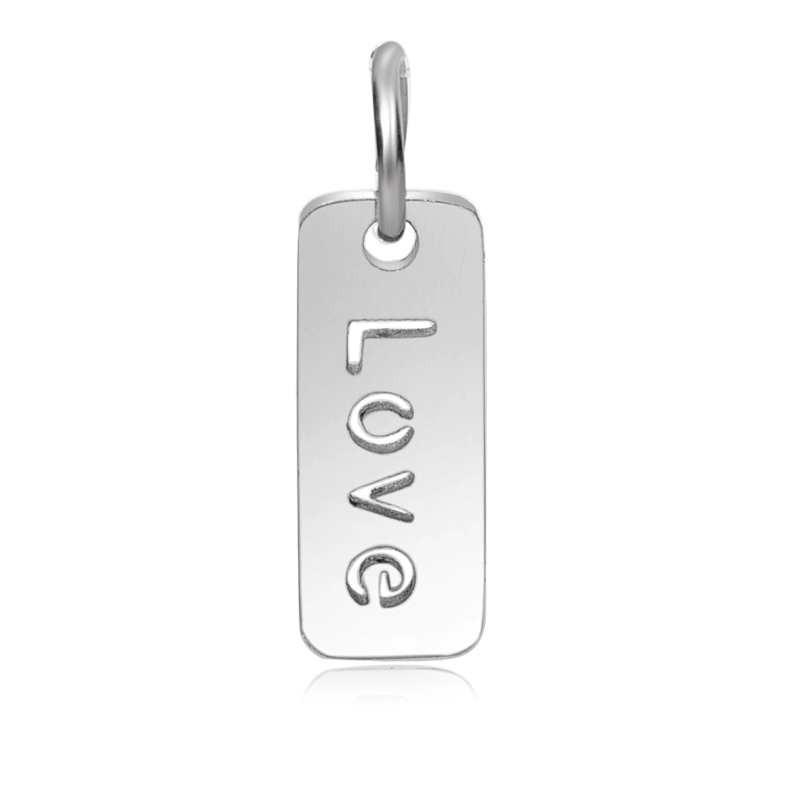 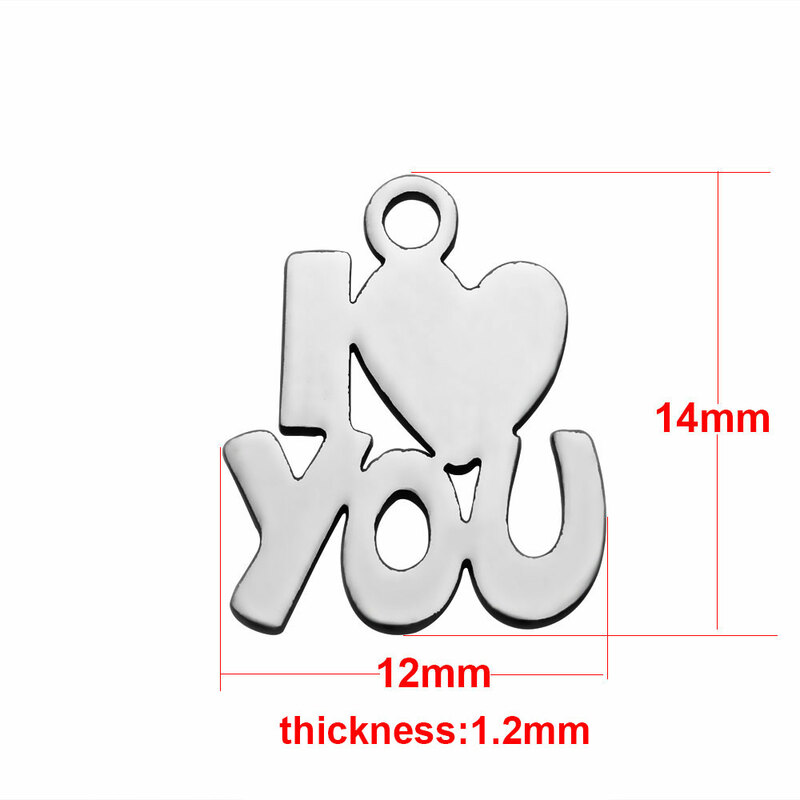 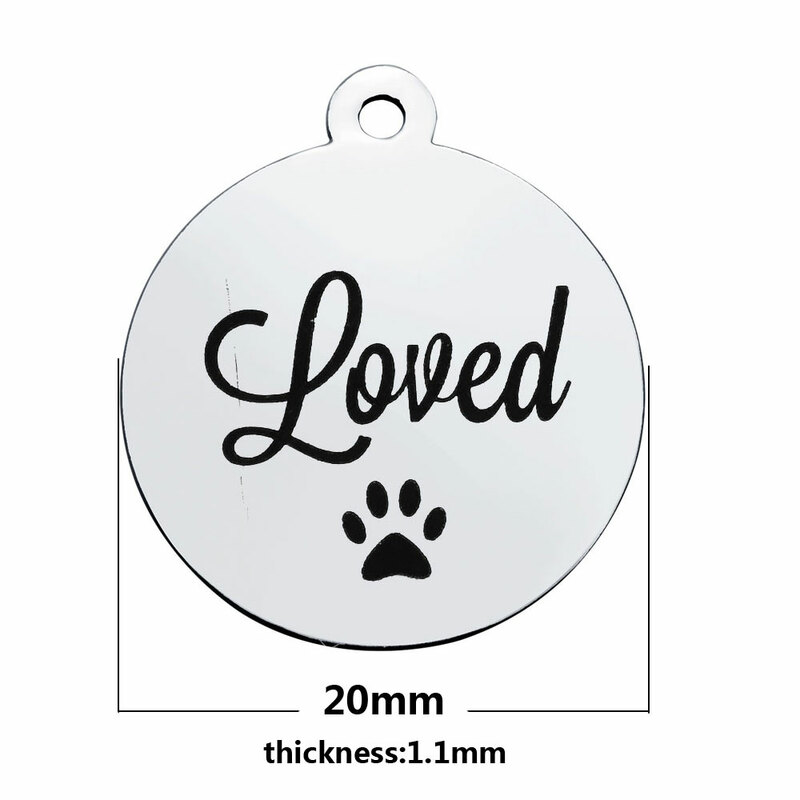 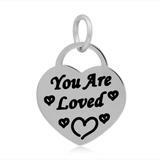 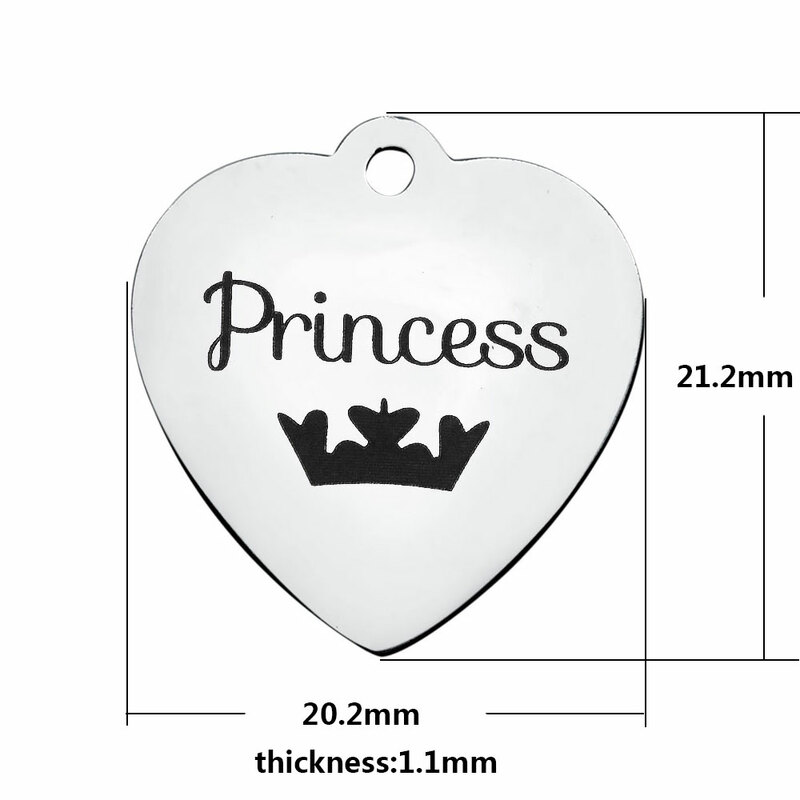 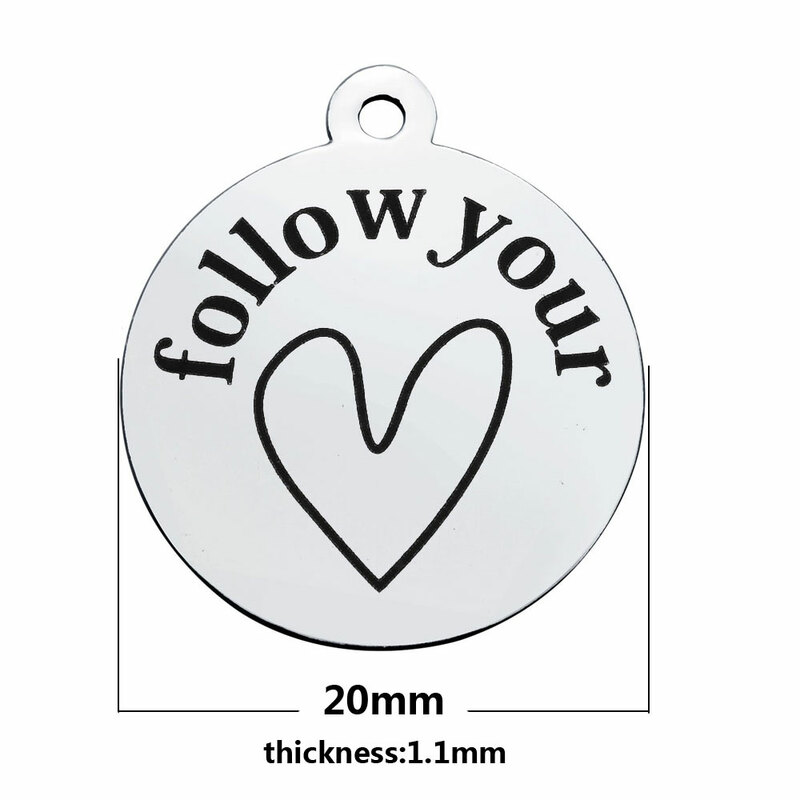 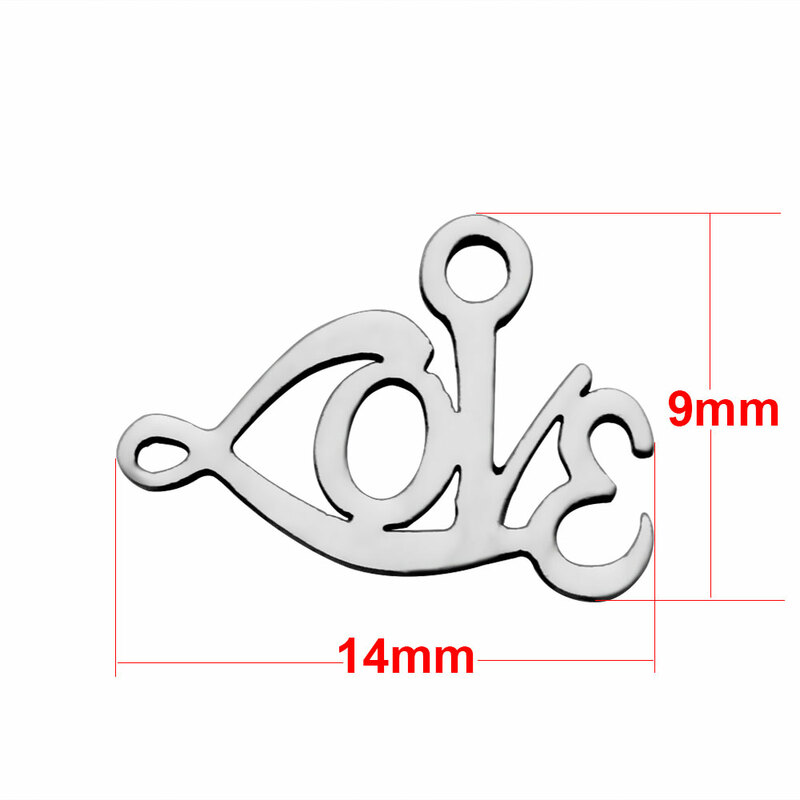 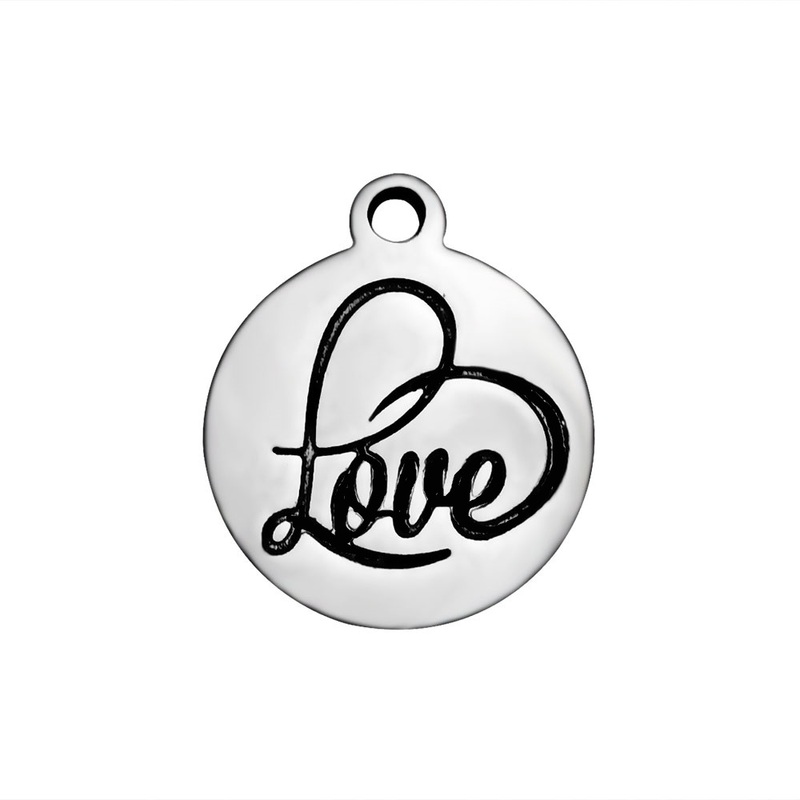 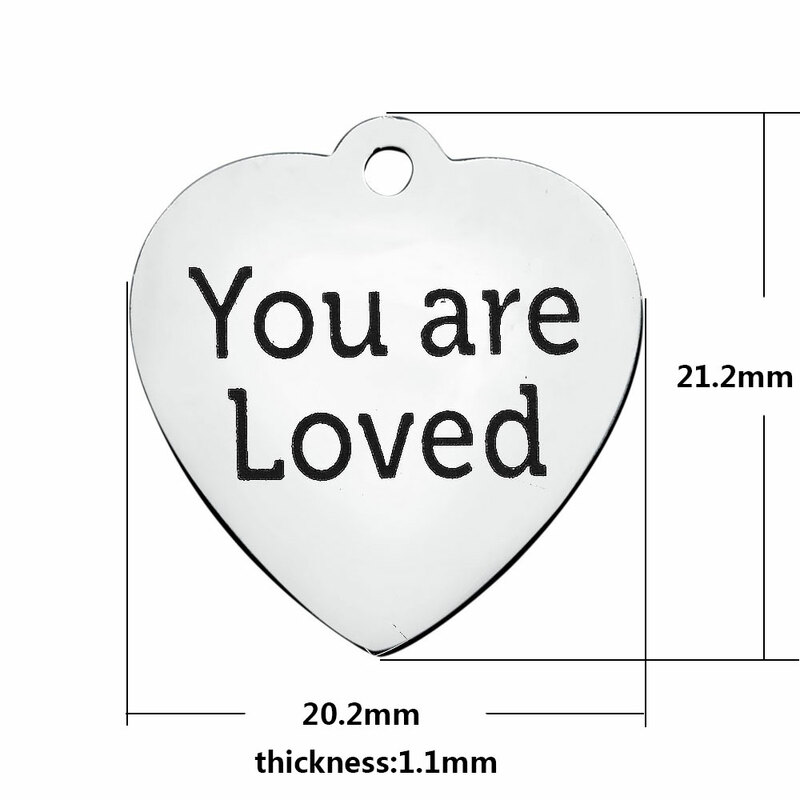 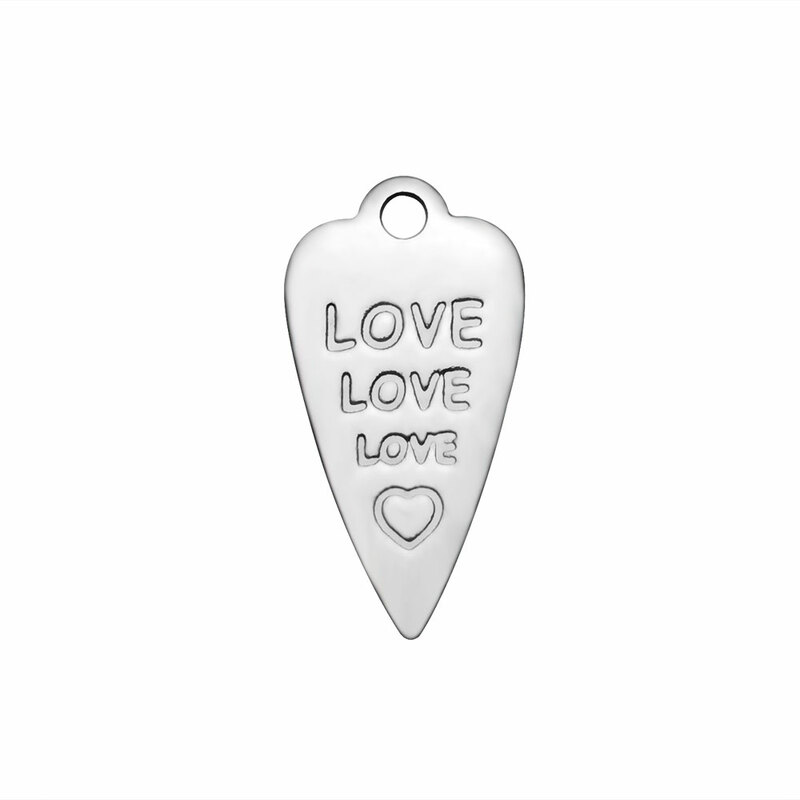 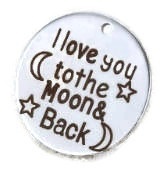 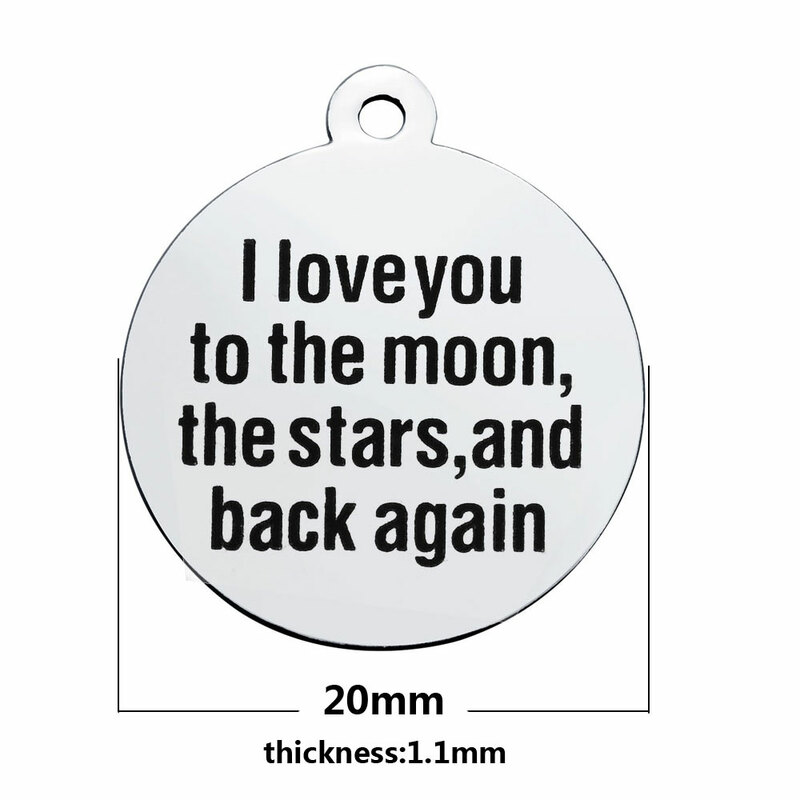 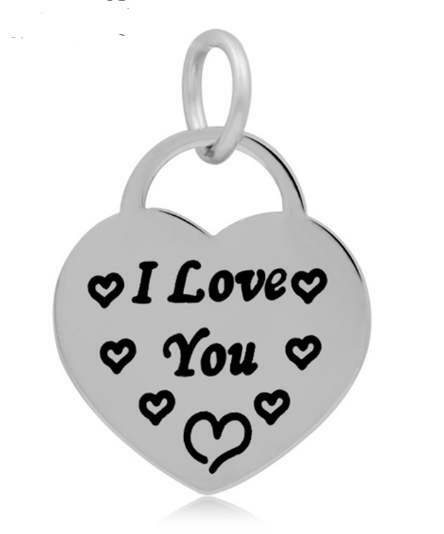 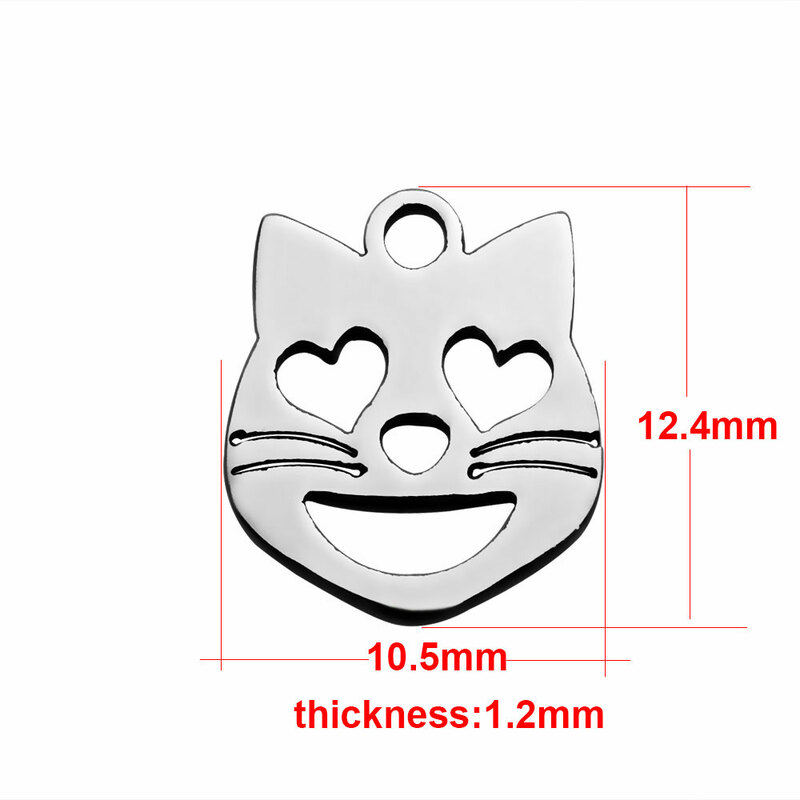 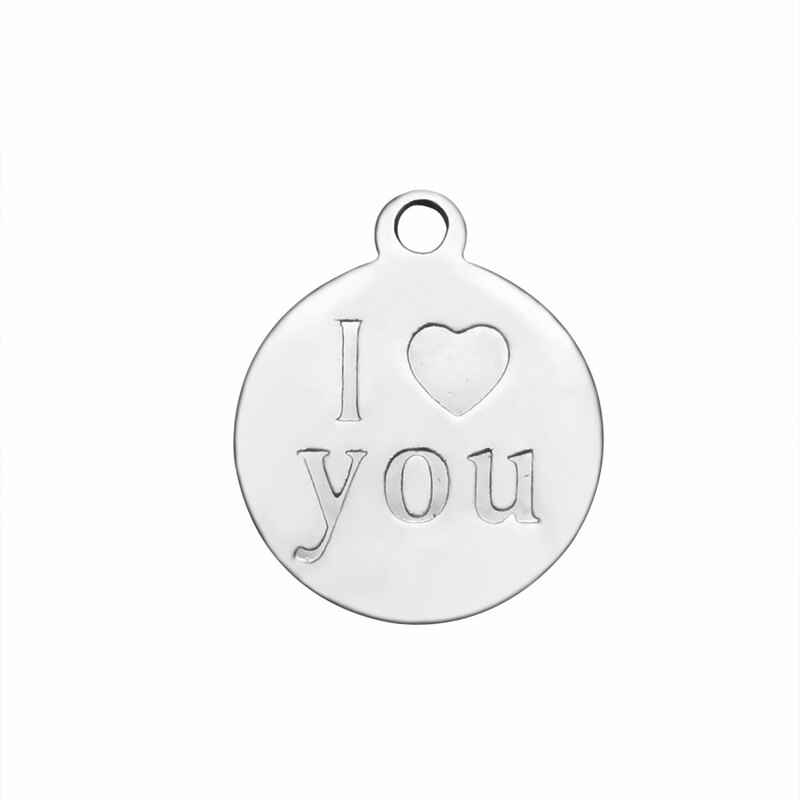 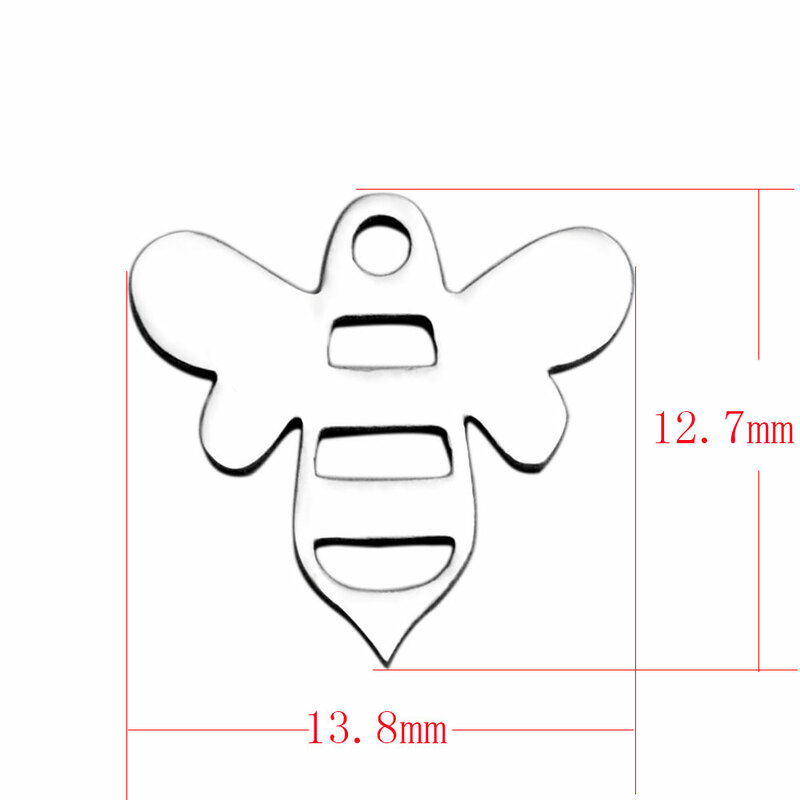 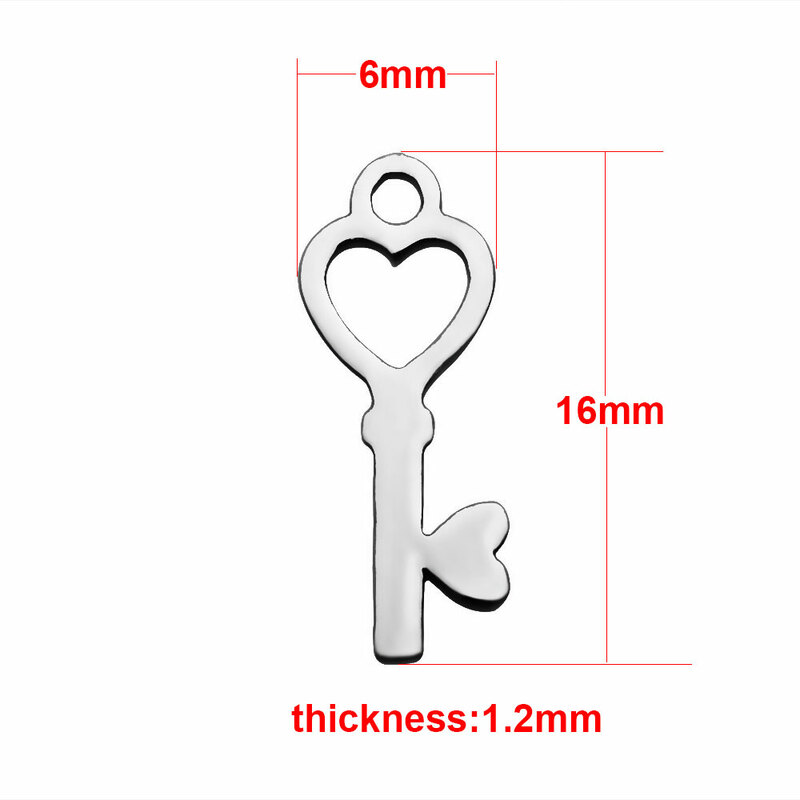 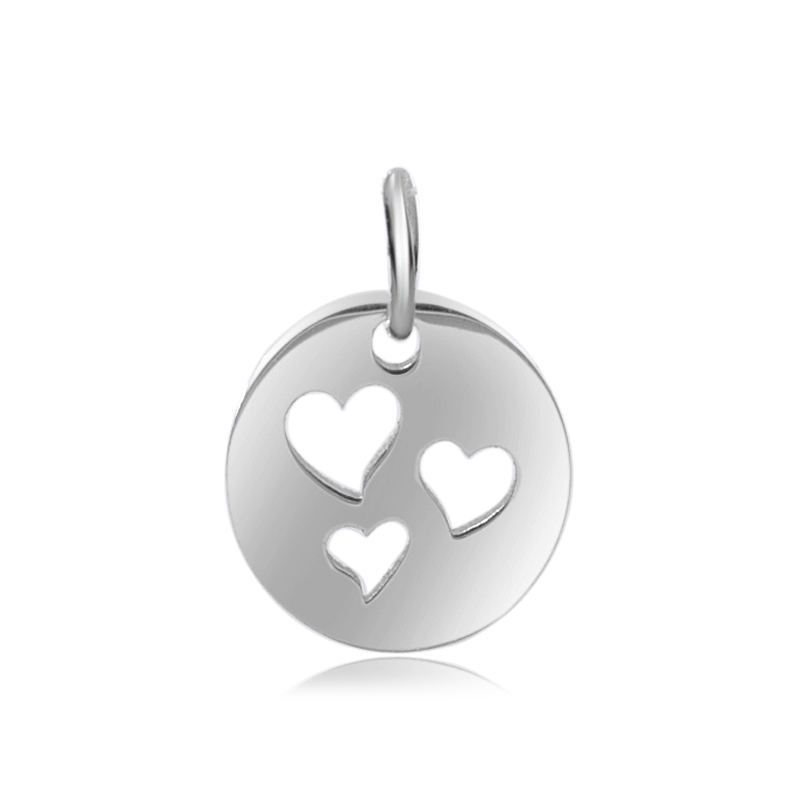 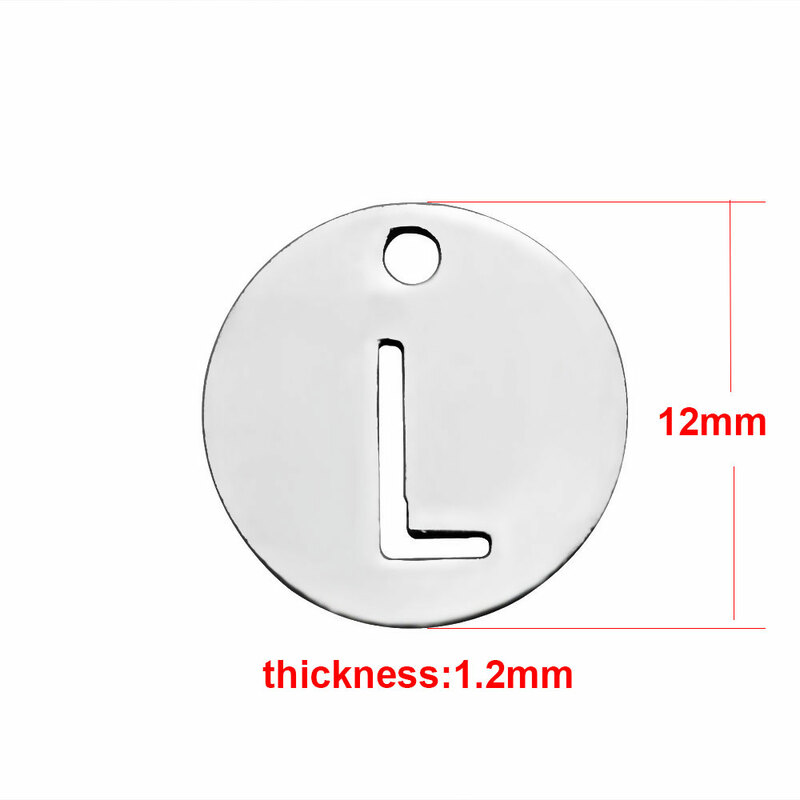 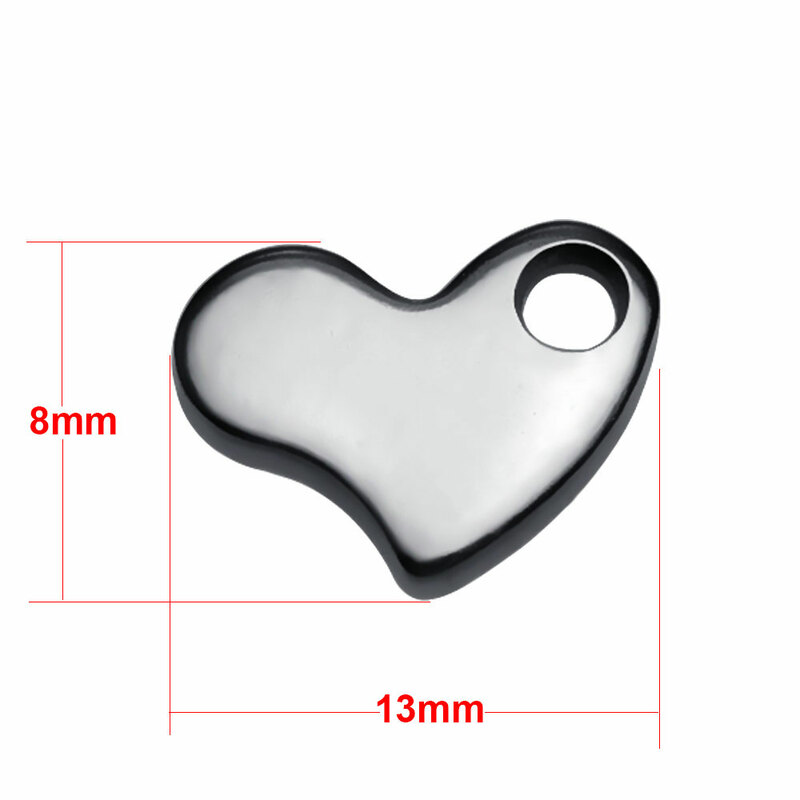 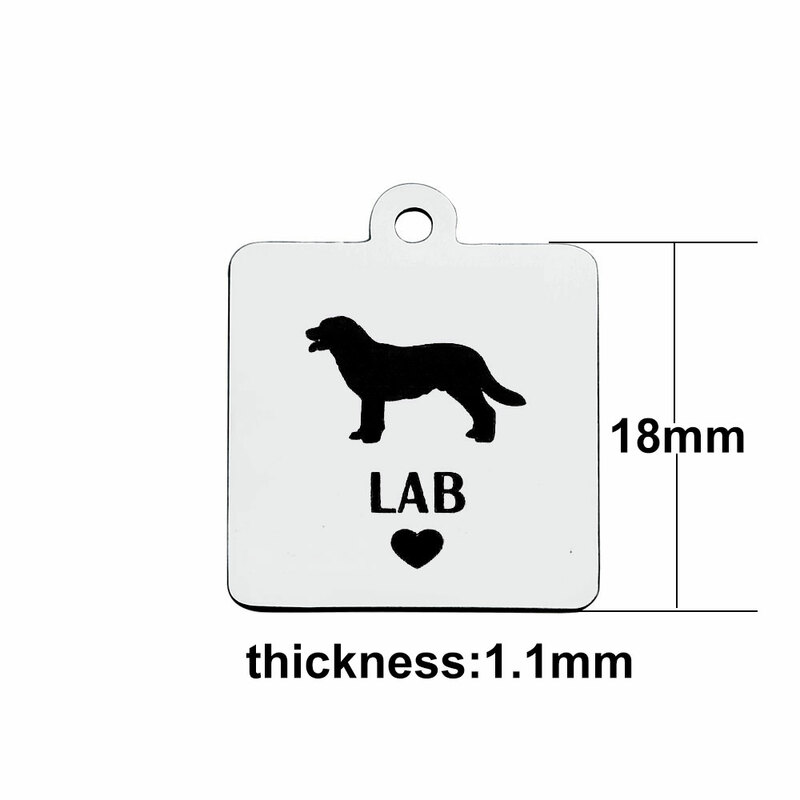 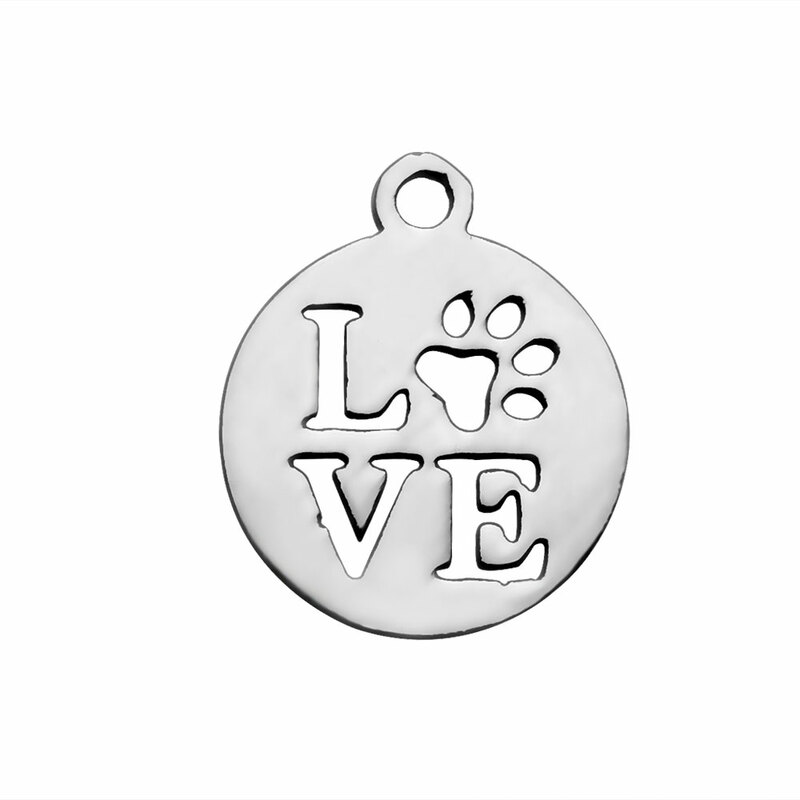 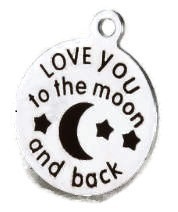 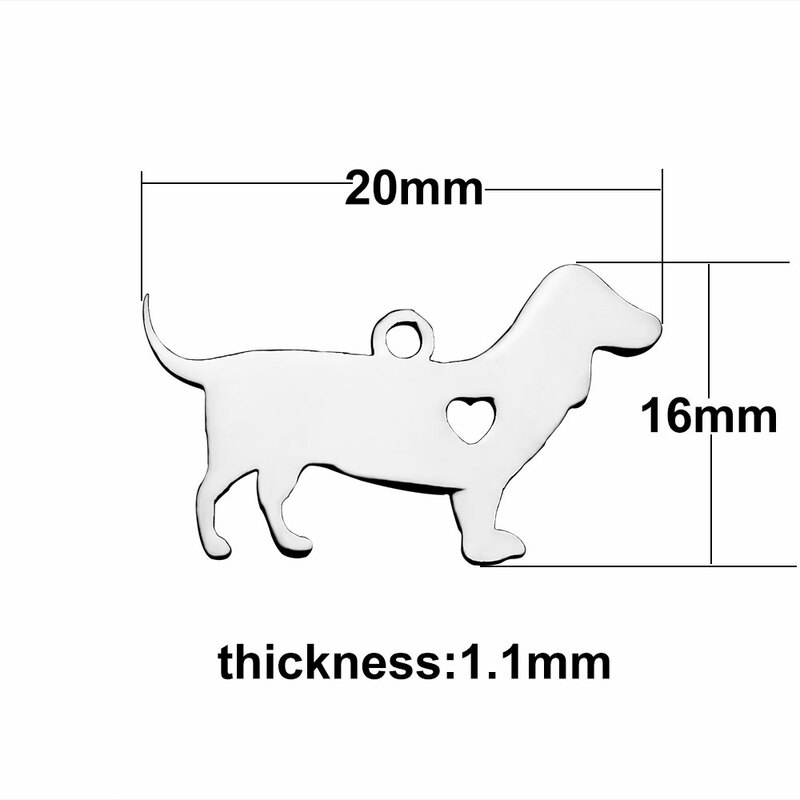 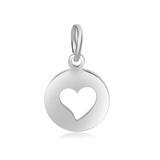 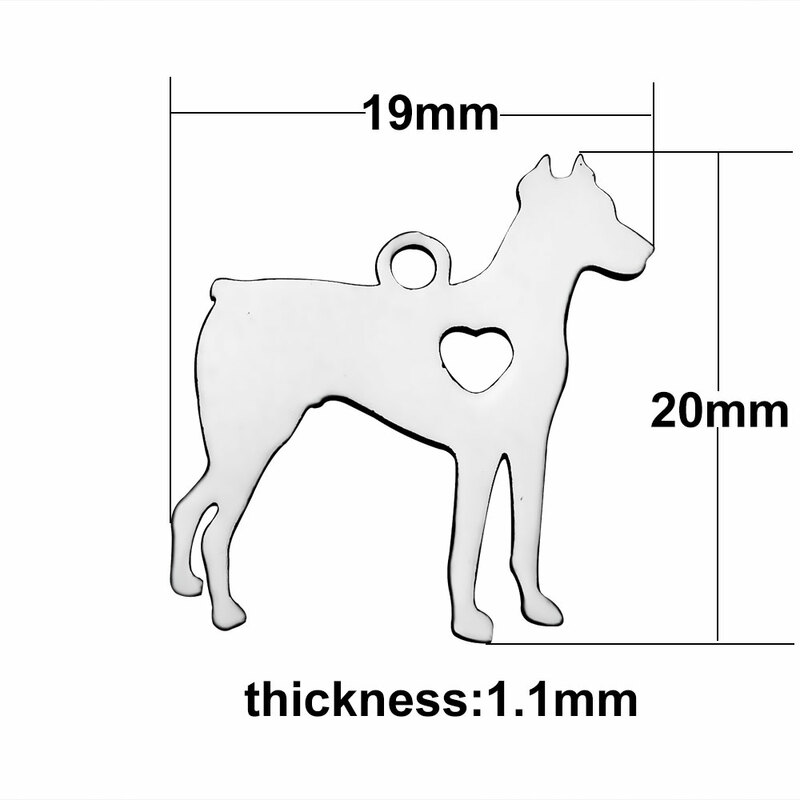 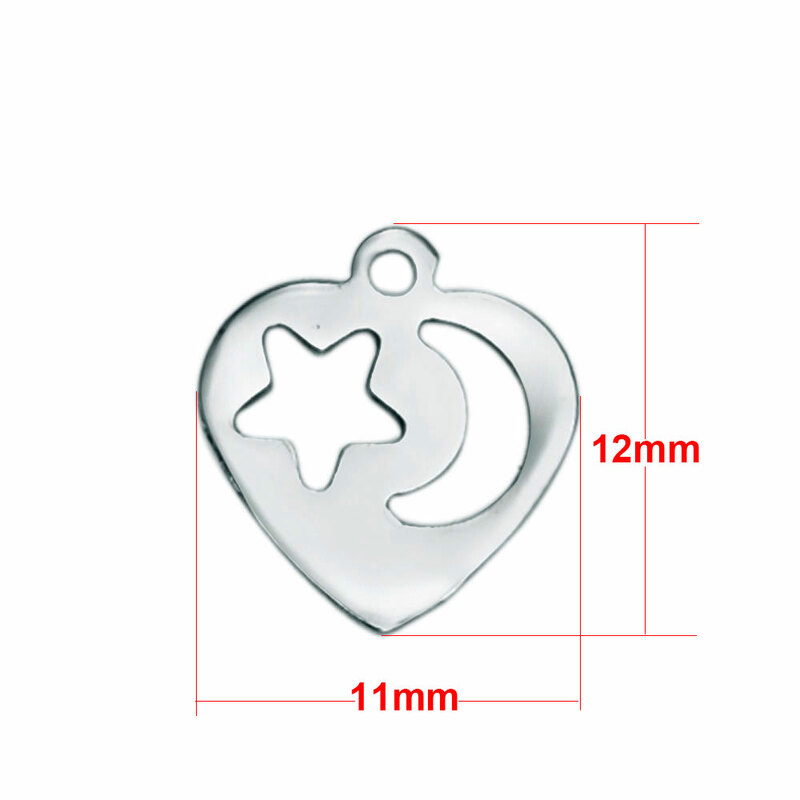 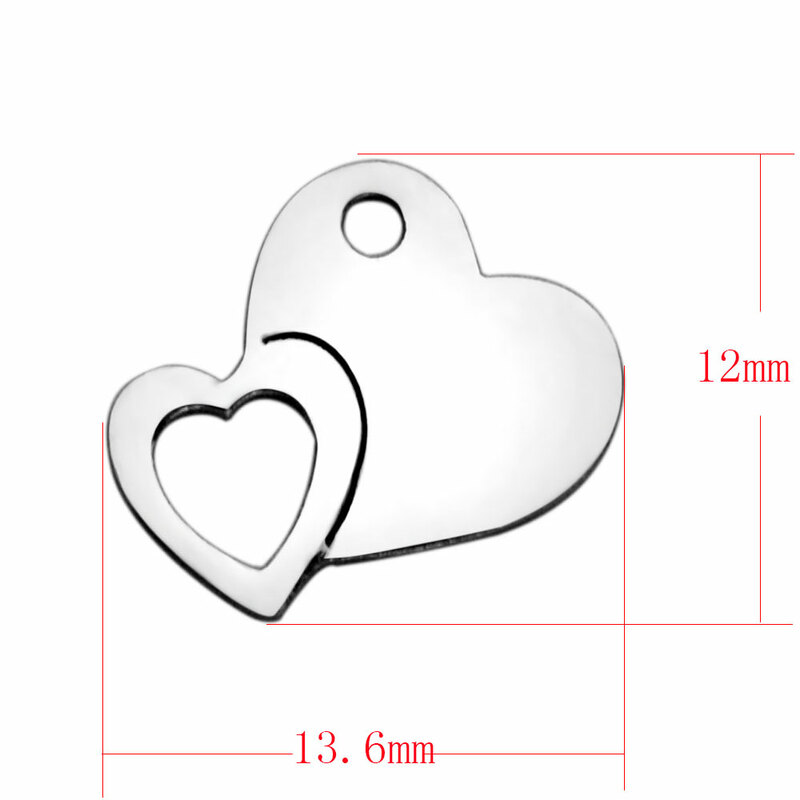 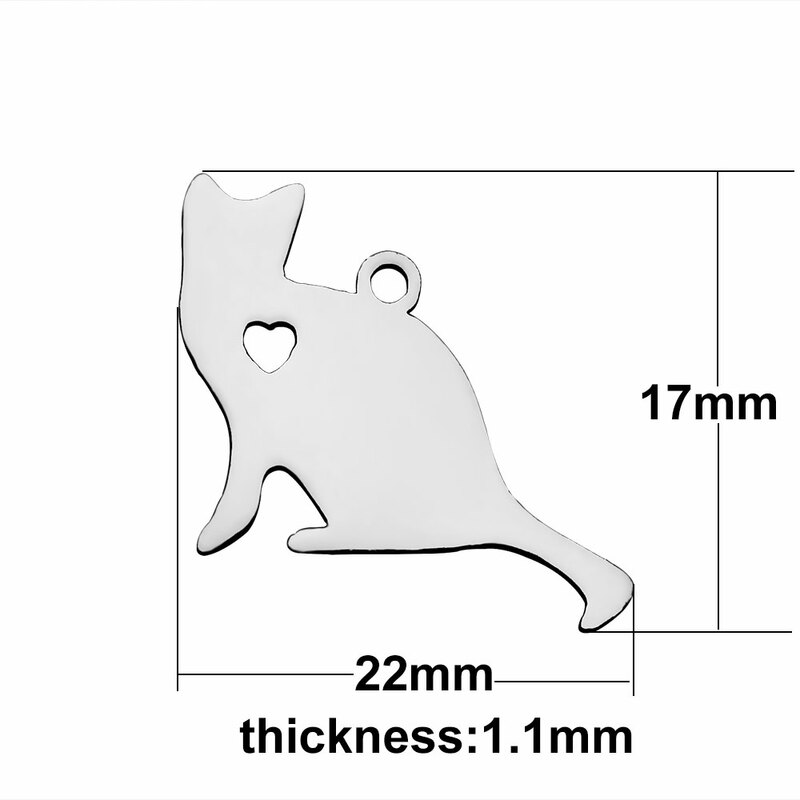 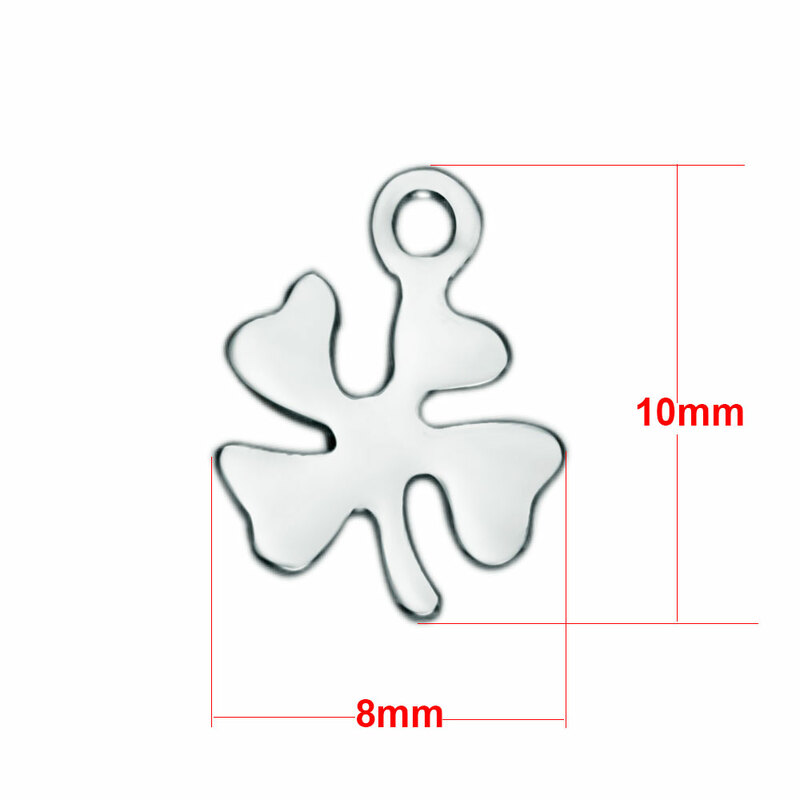 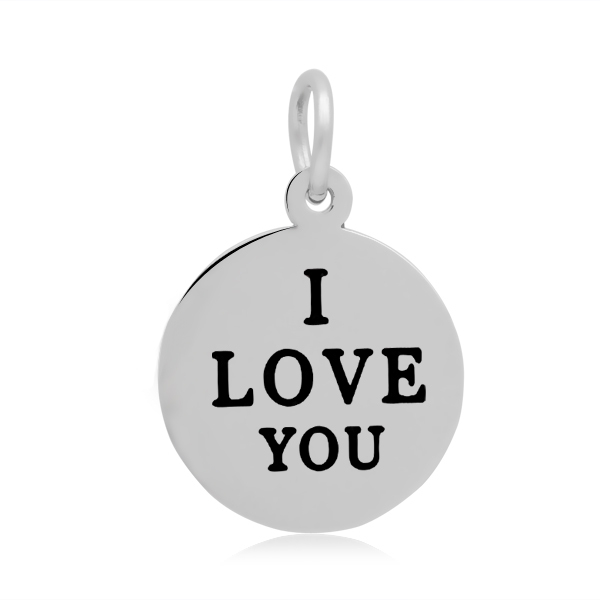 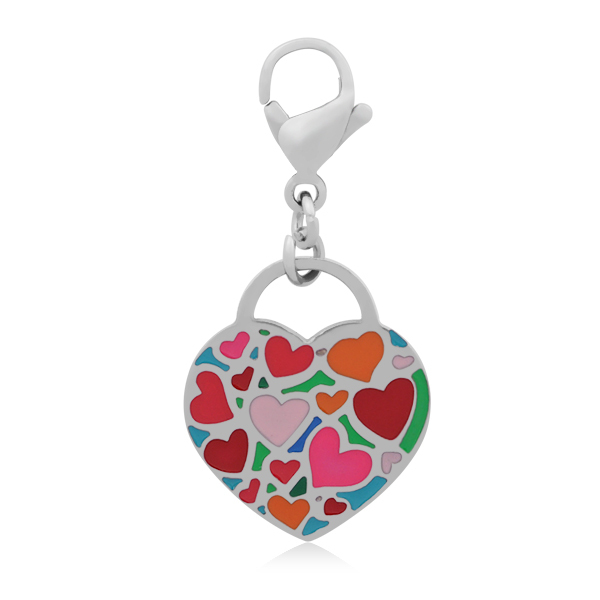 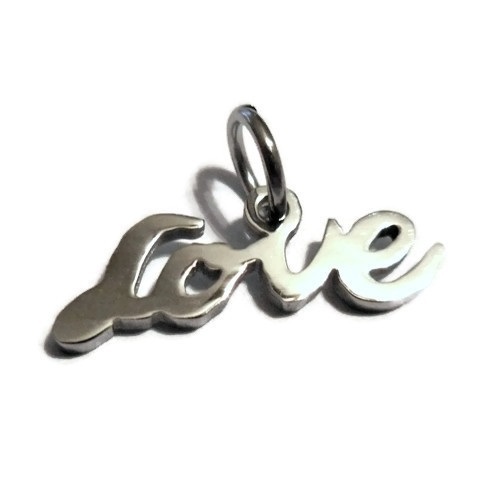 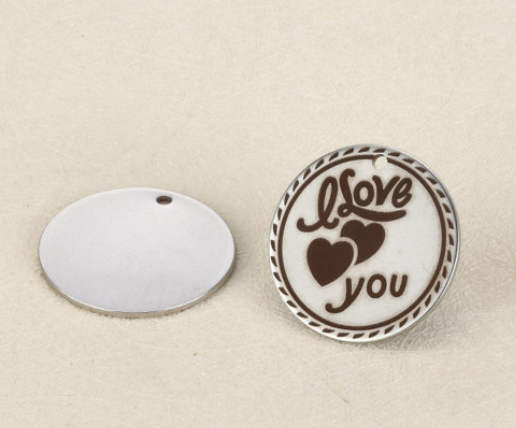 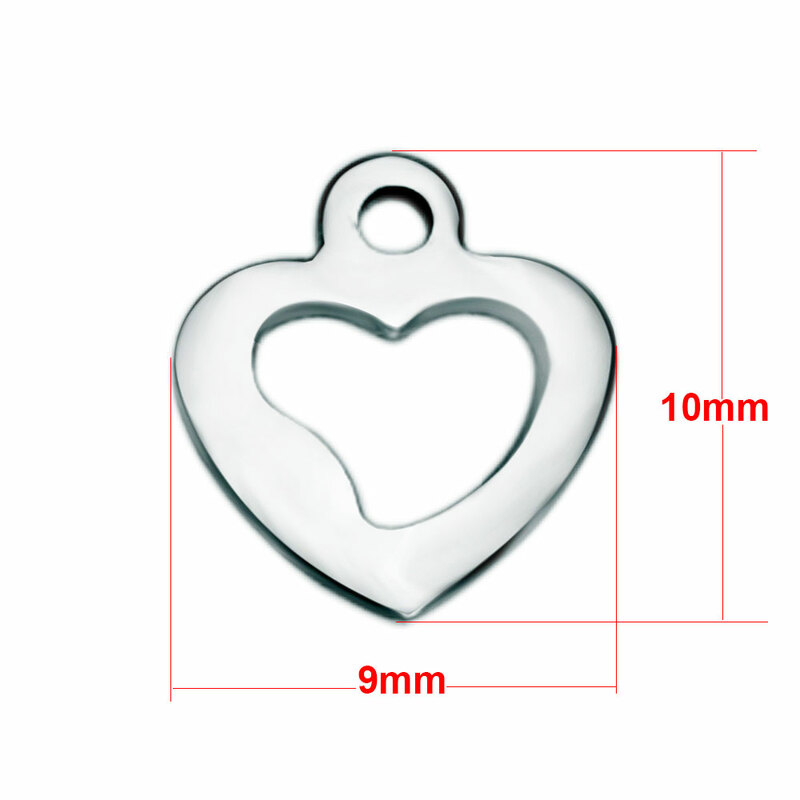 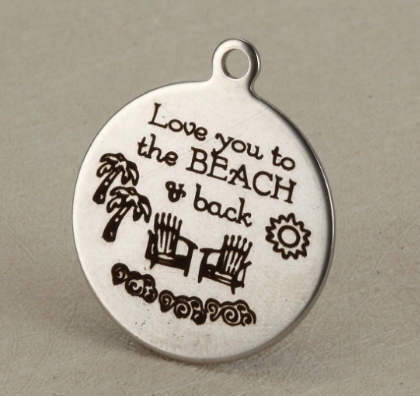 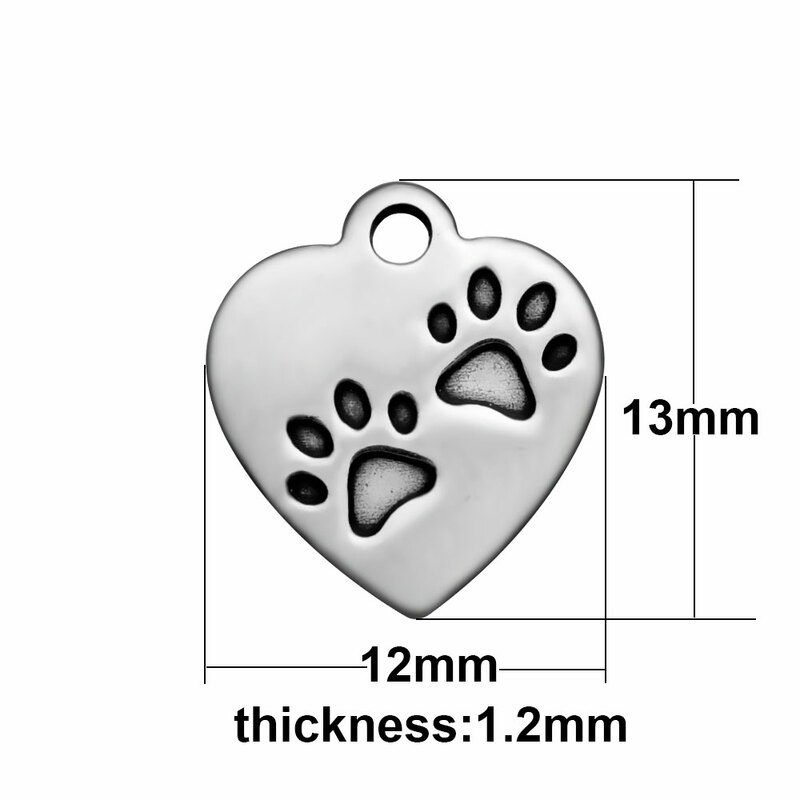 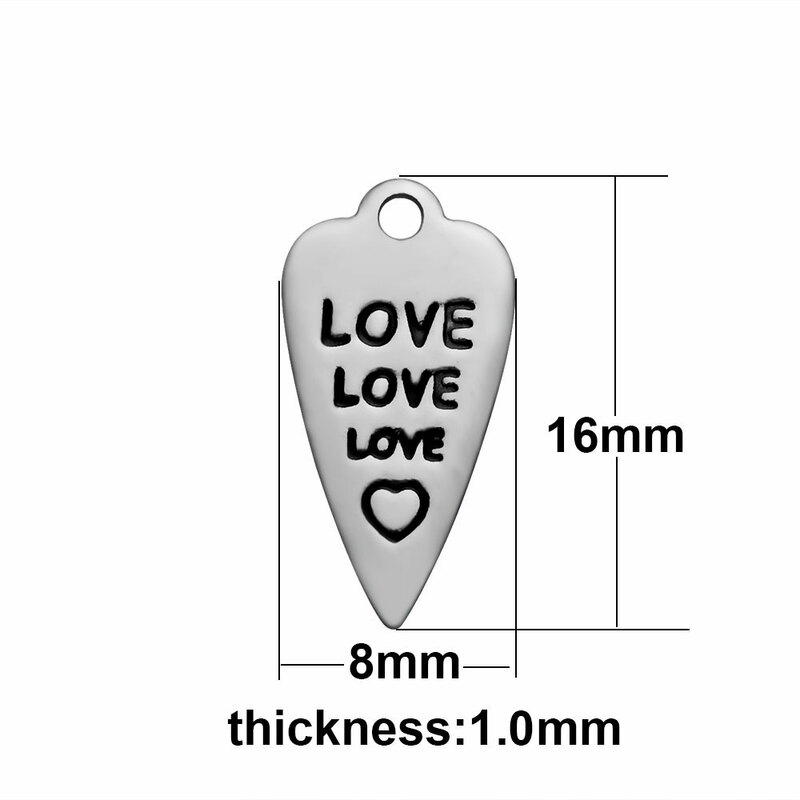 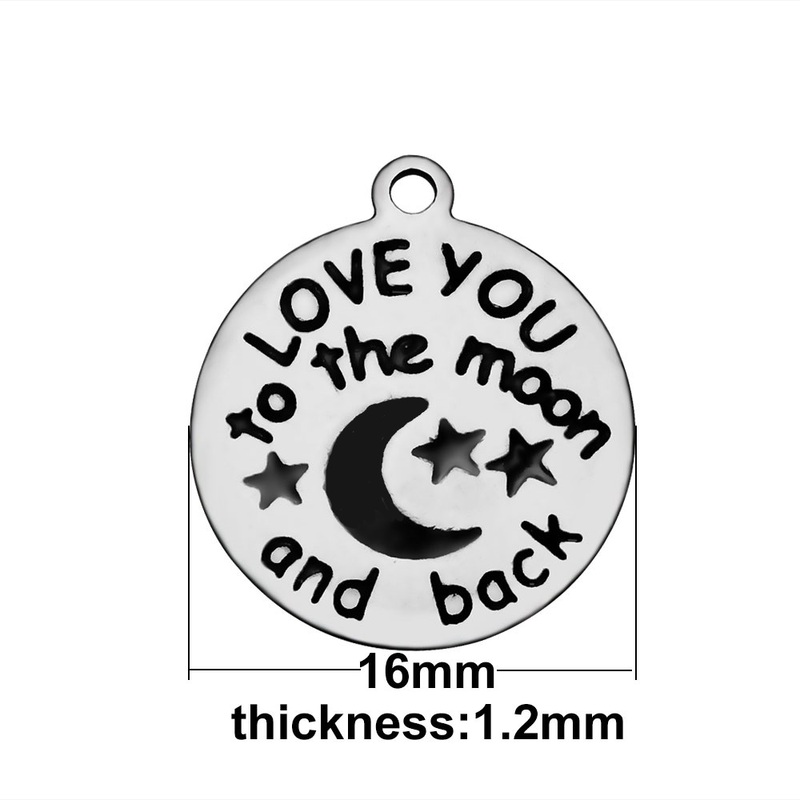 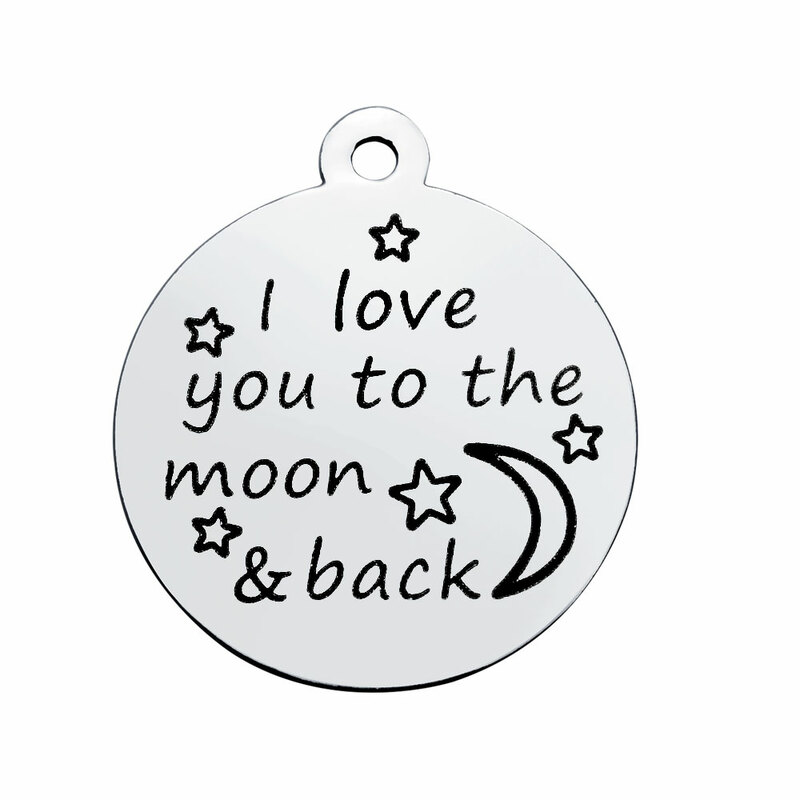 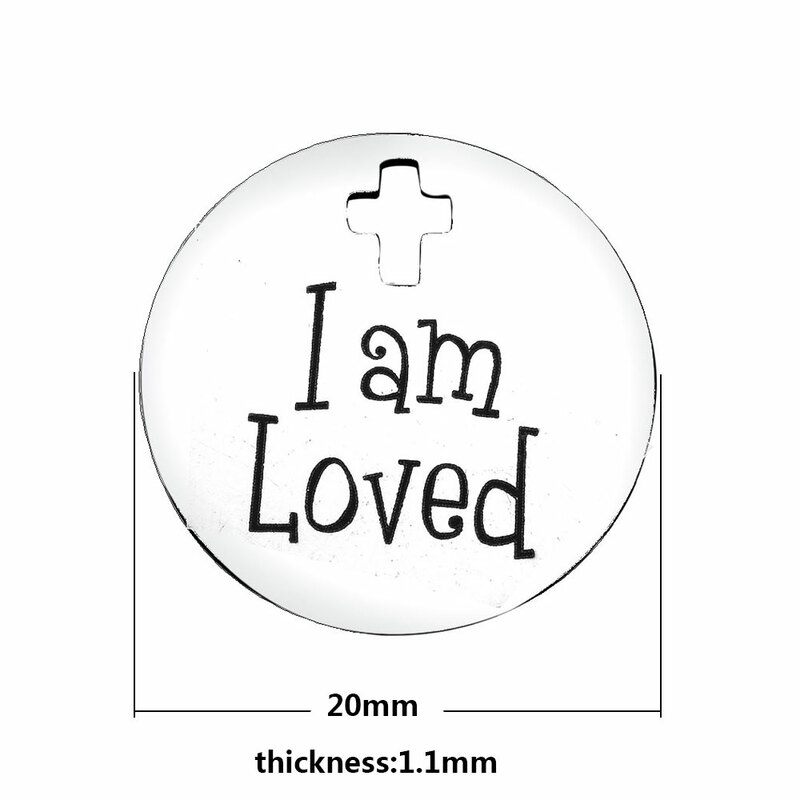 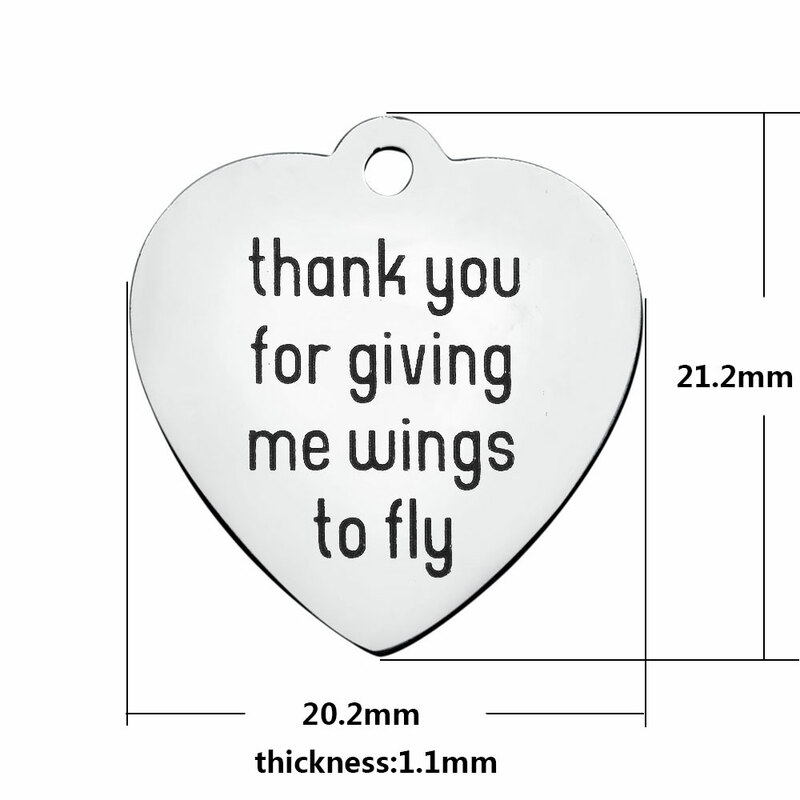 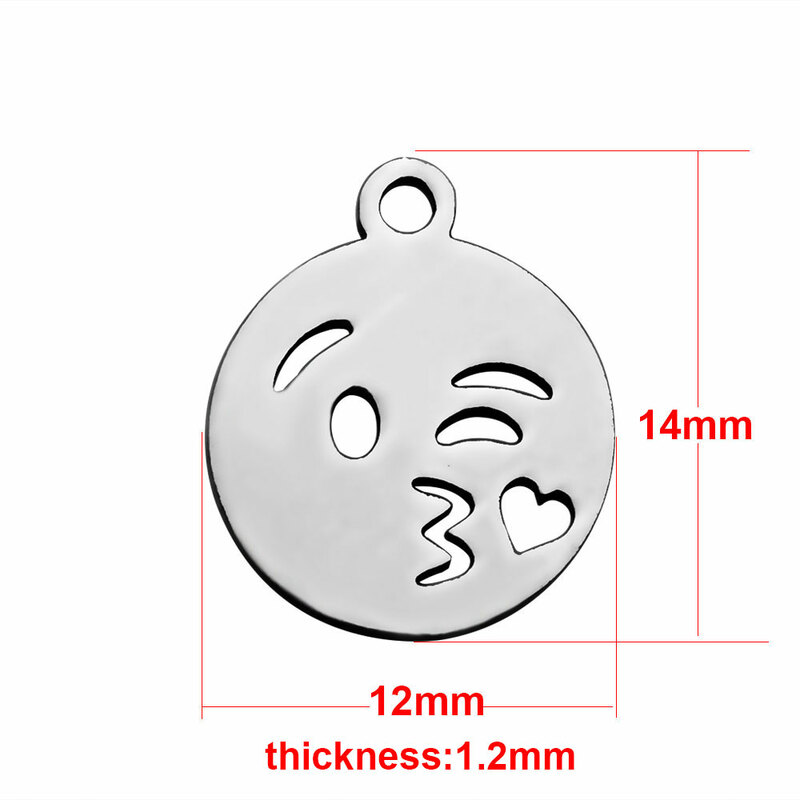 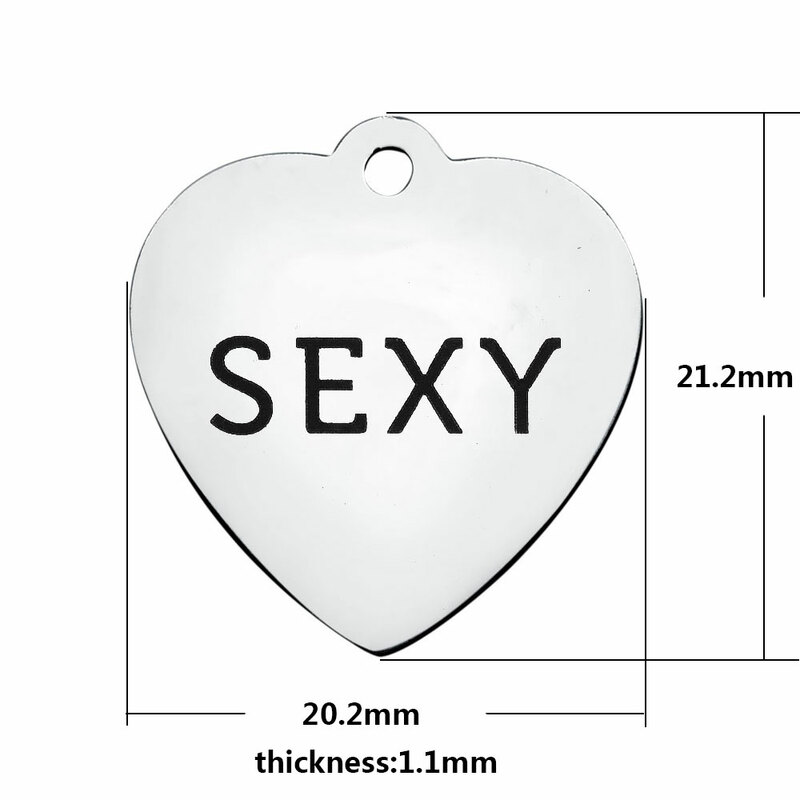 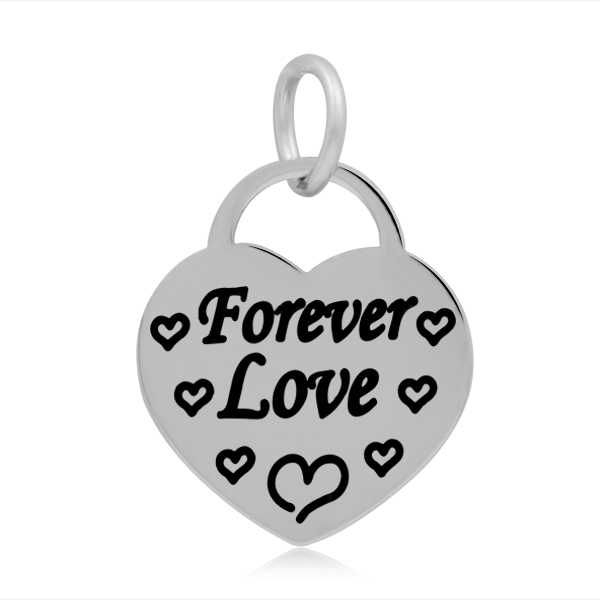 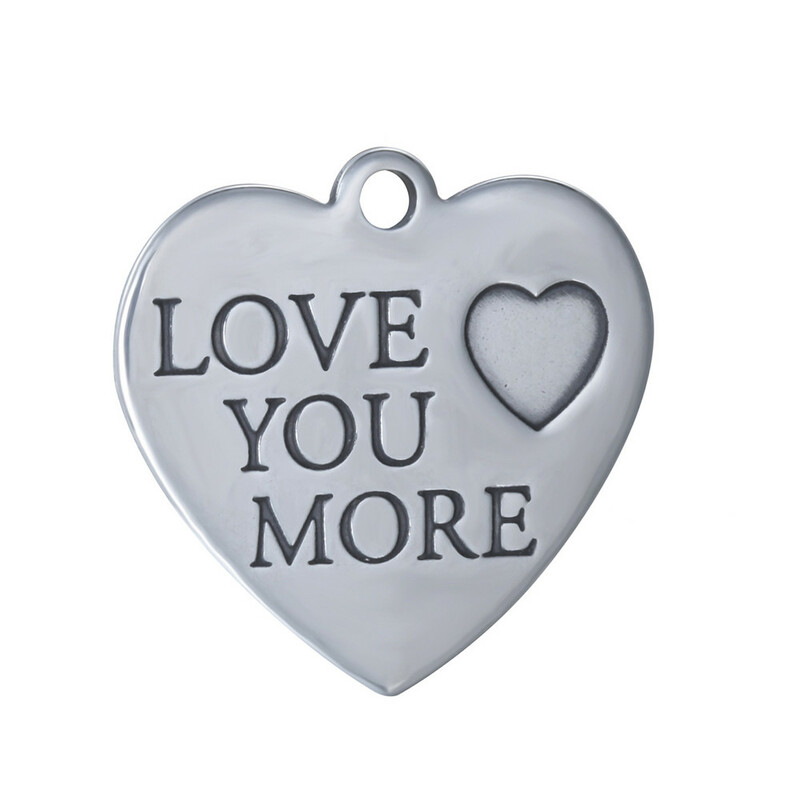 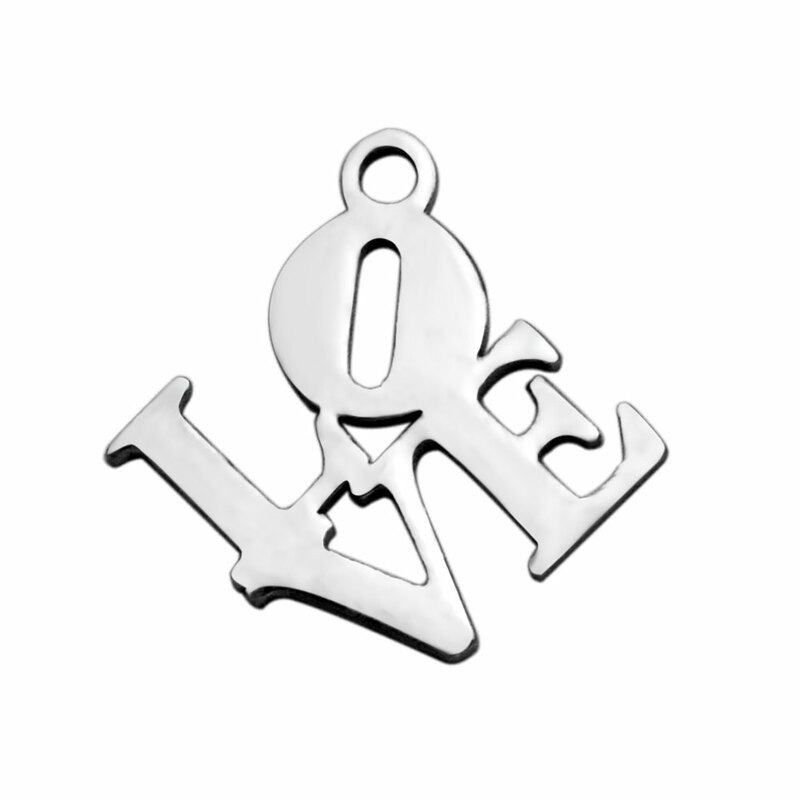 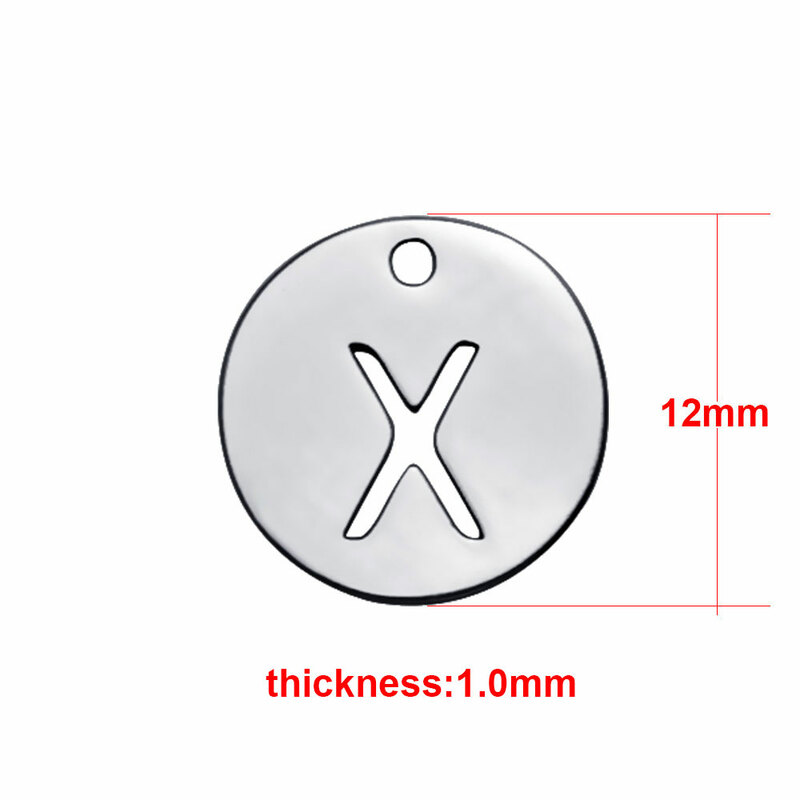 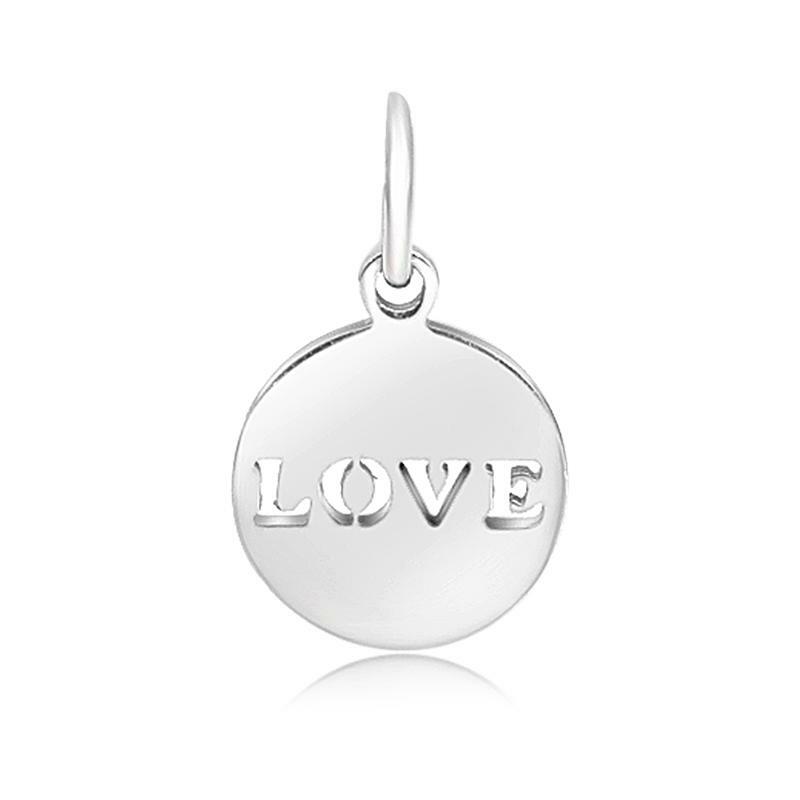 6*16mm Stainless Steel Charm - Love Tag Stainless steel jewelry will not tarnish or rust. 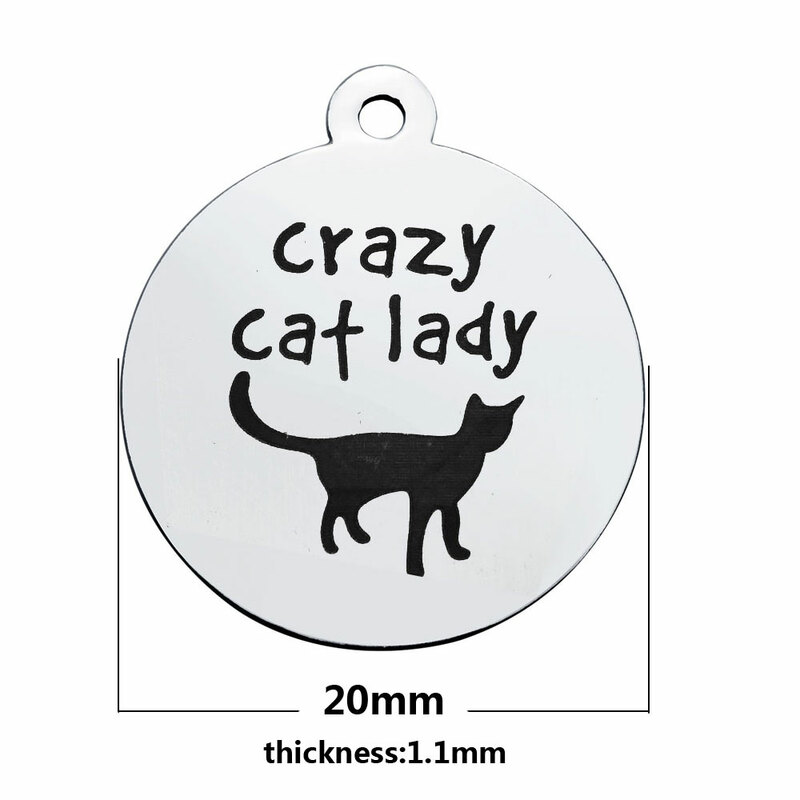 It is durable and scratch resistant. 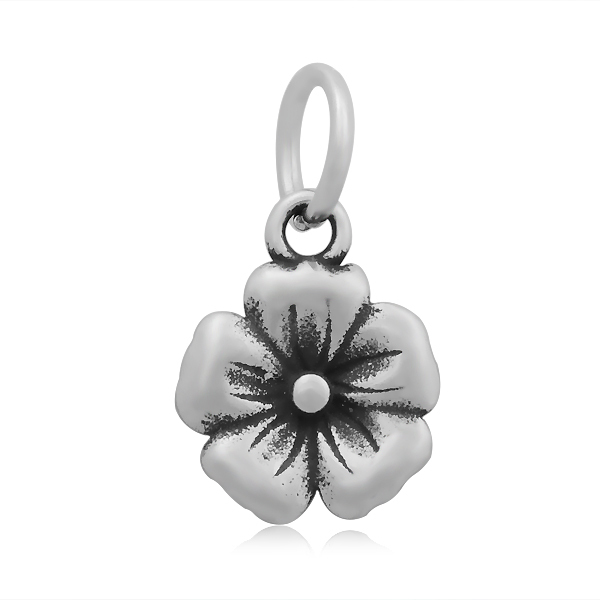 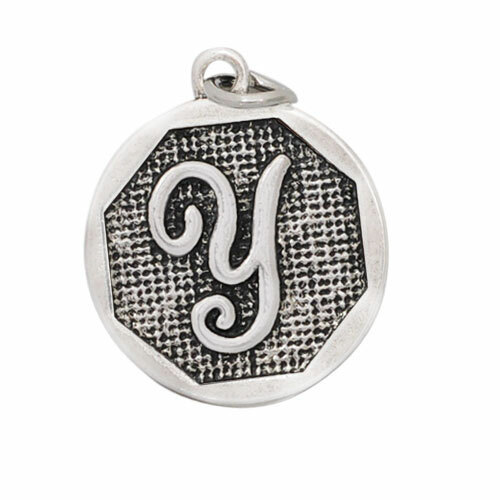 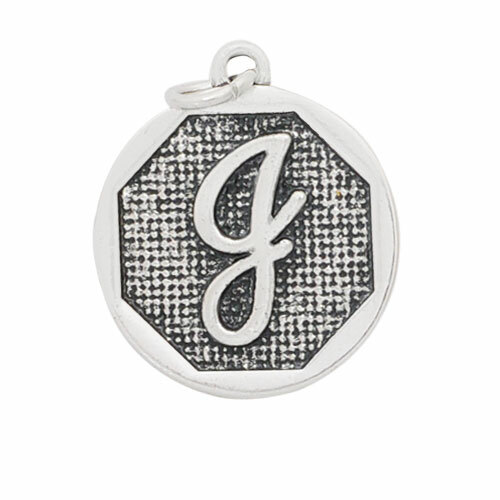 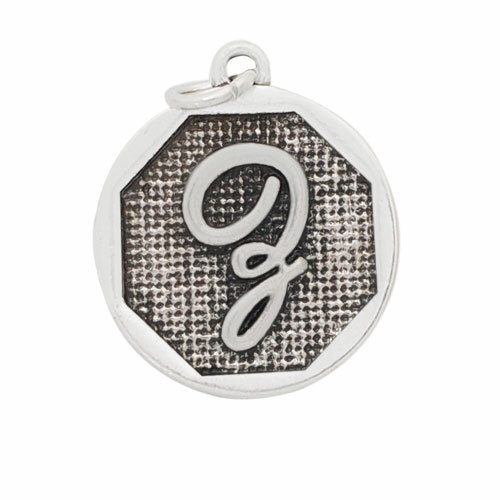 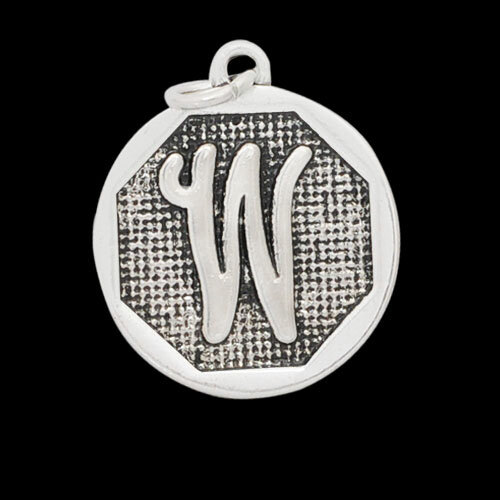 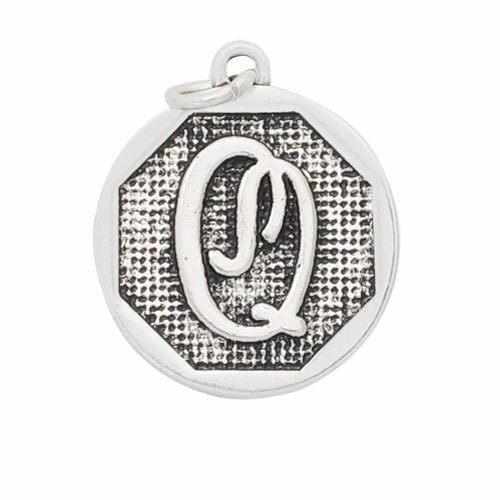 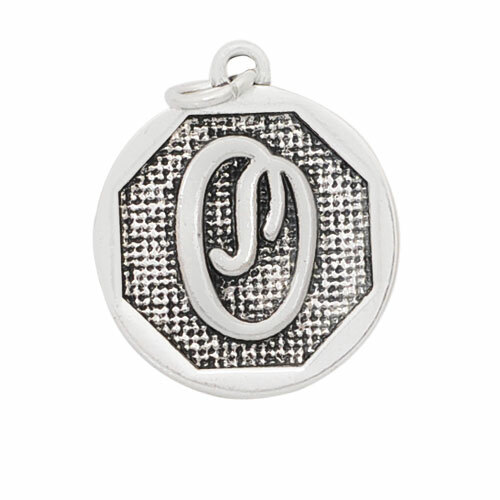 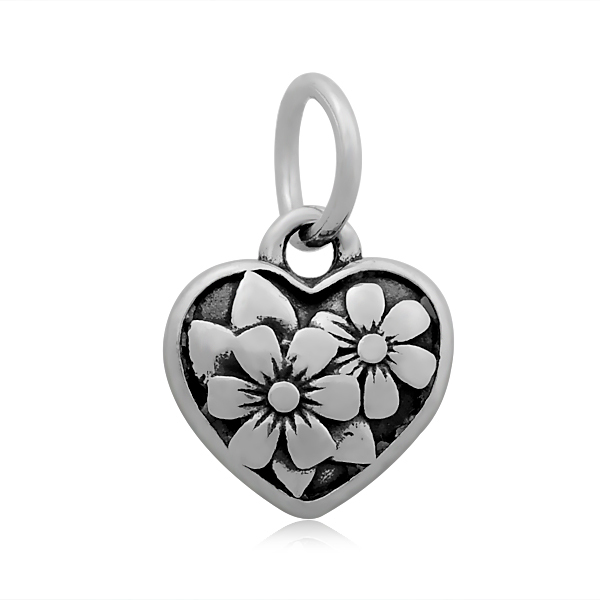 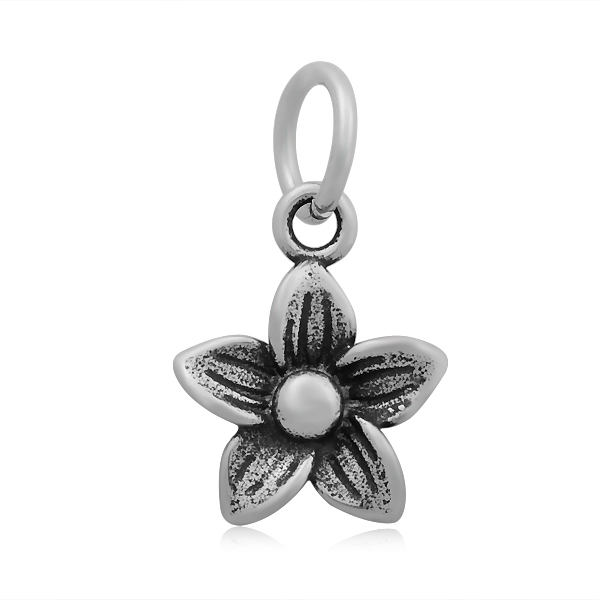 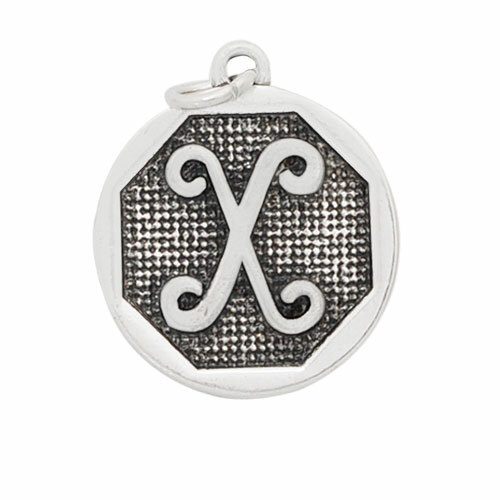 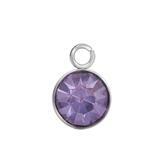 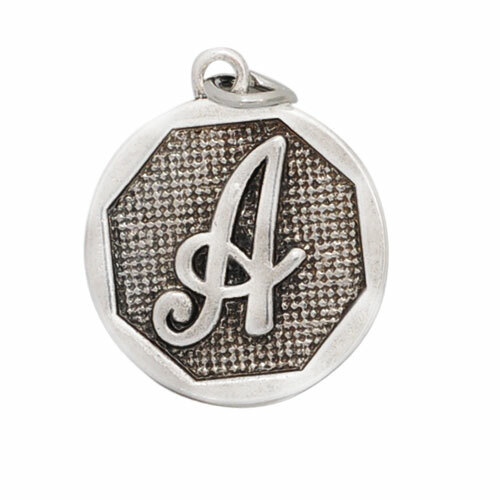 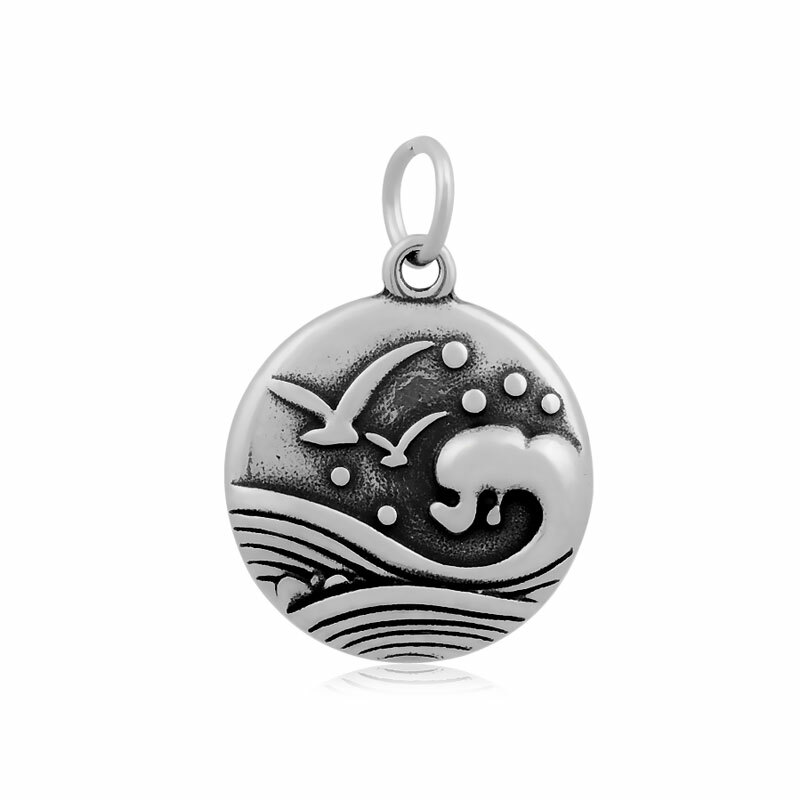 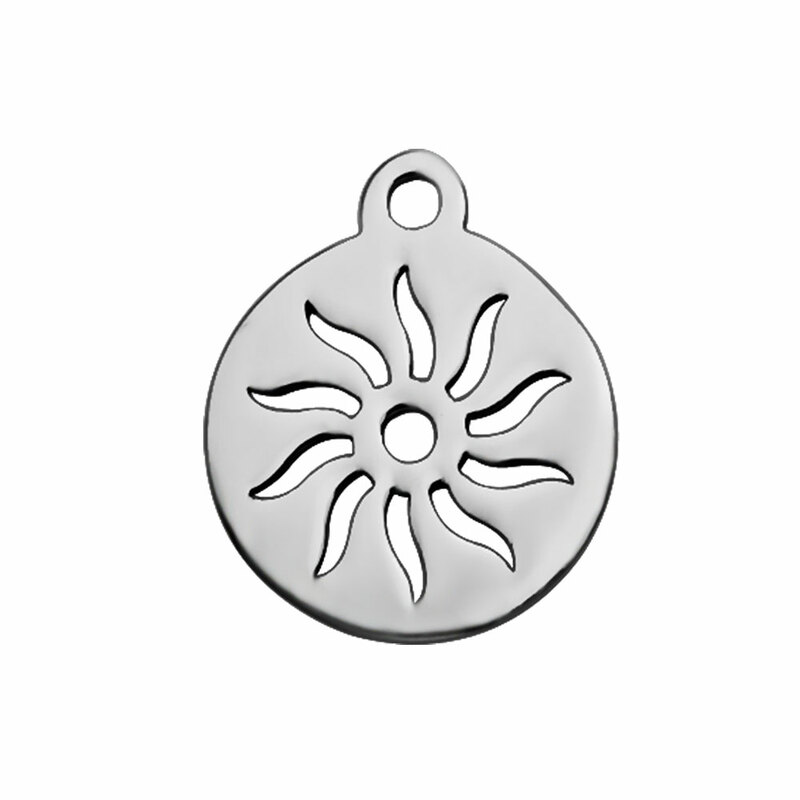 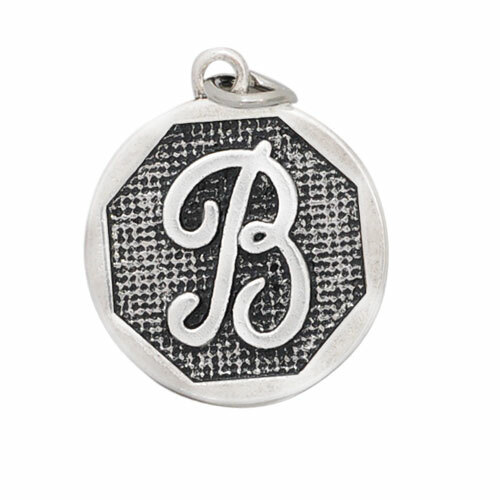 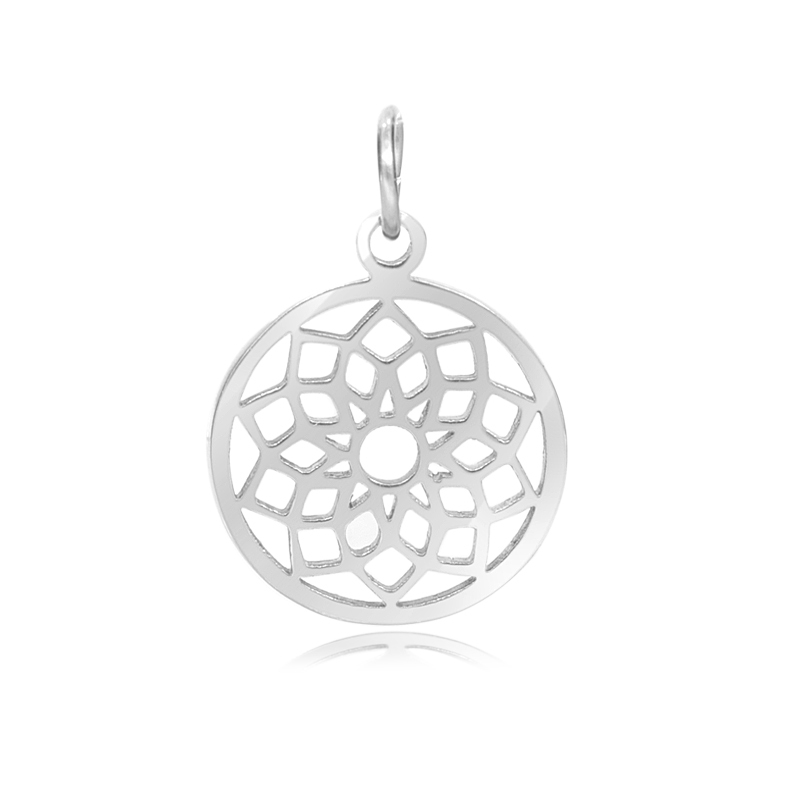 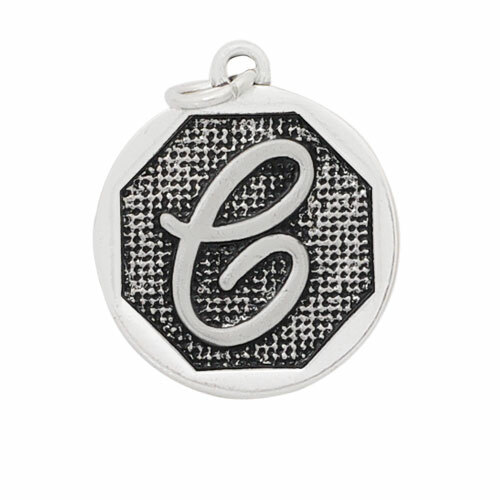 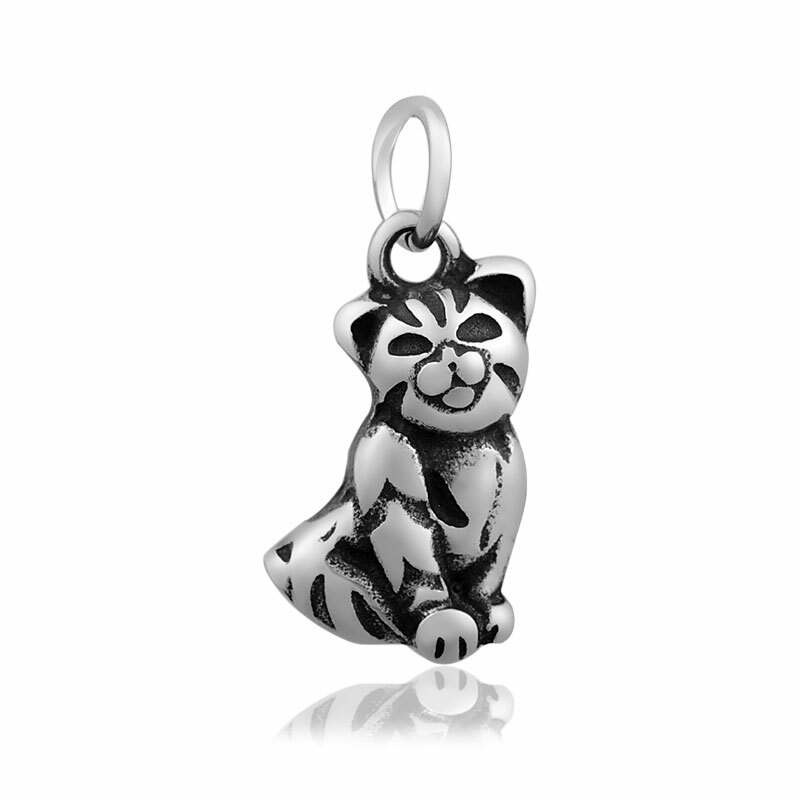 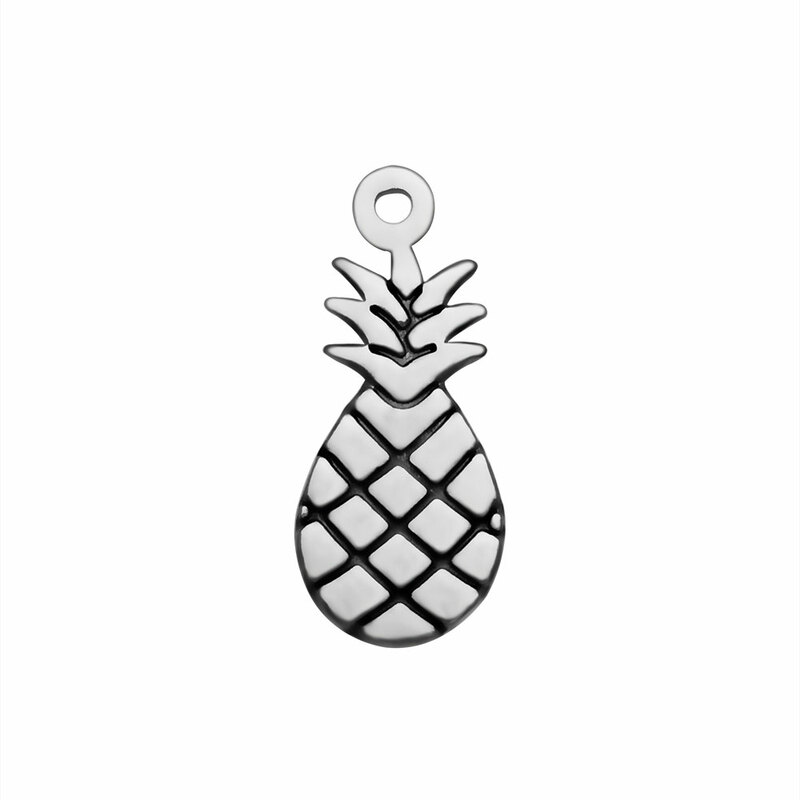 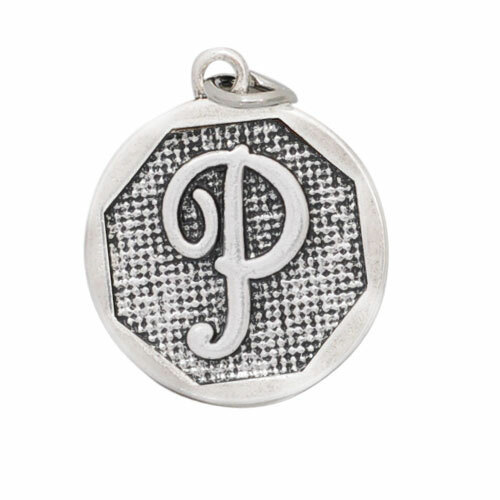 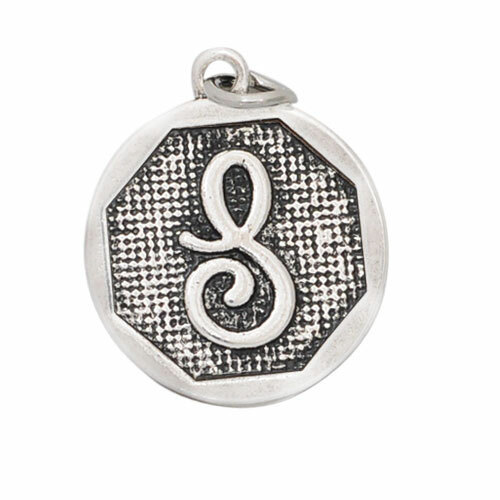 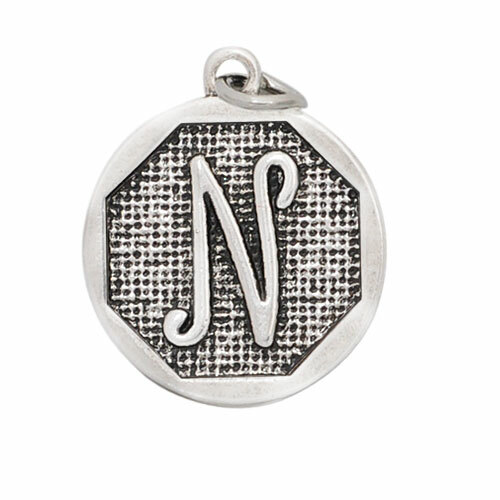 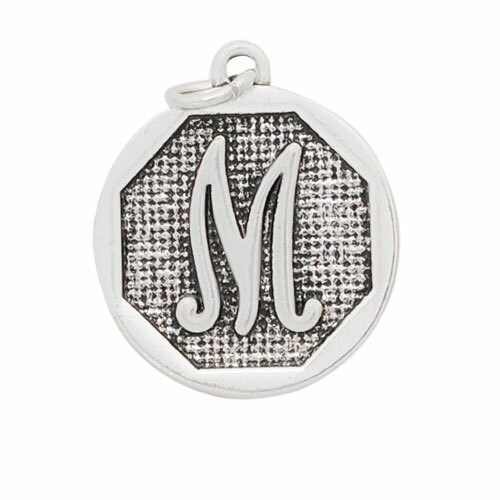 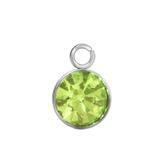 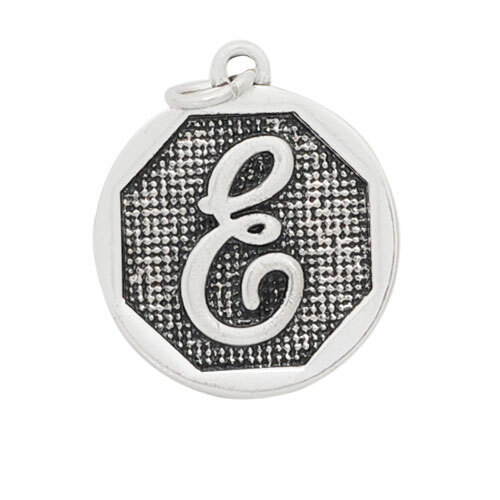 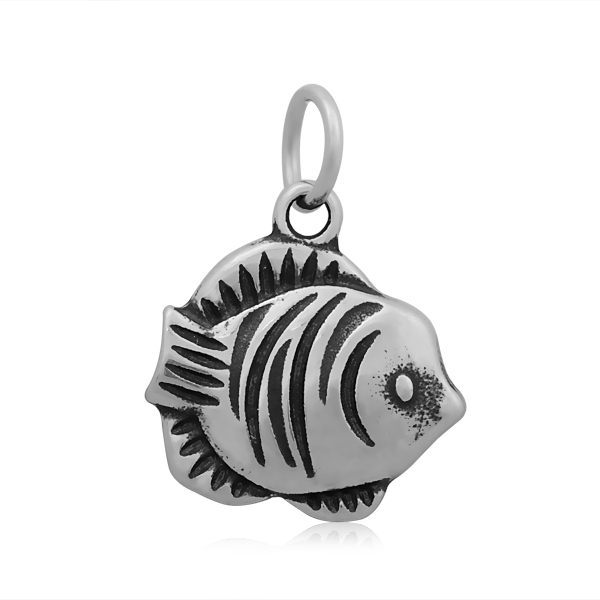 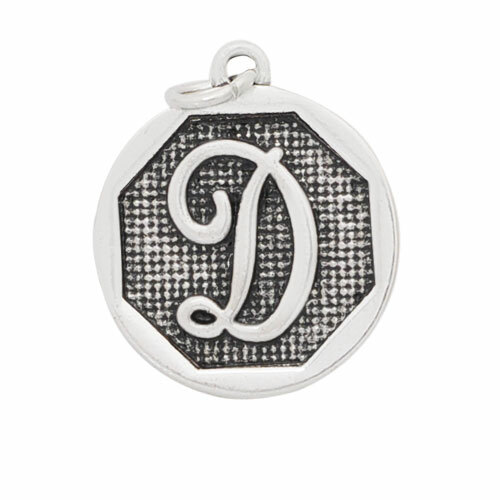 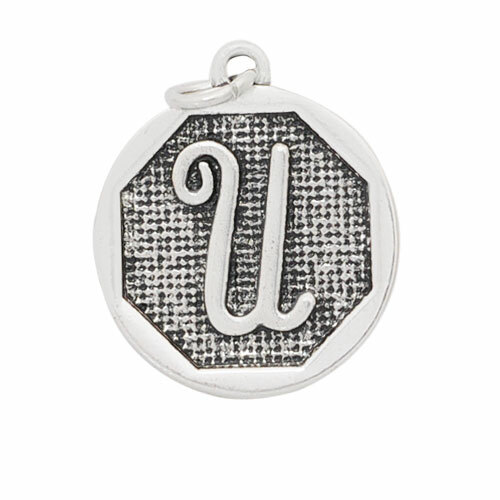 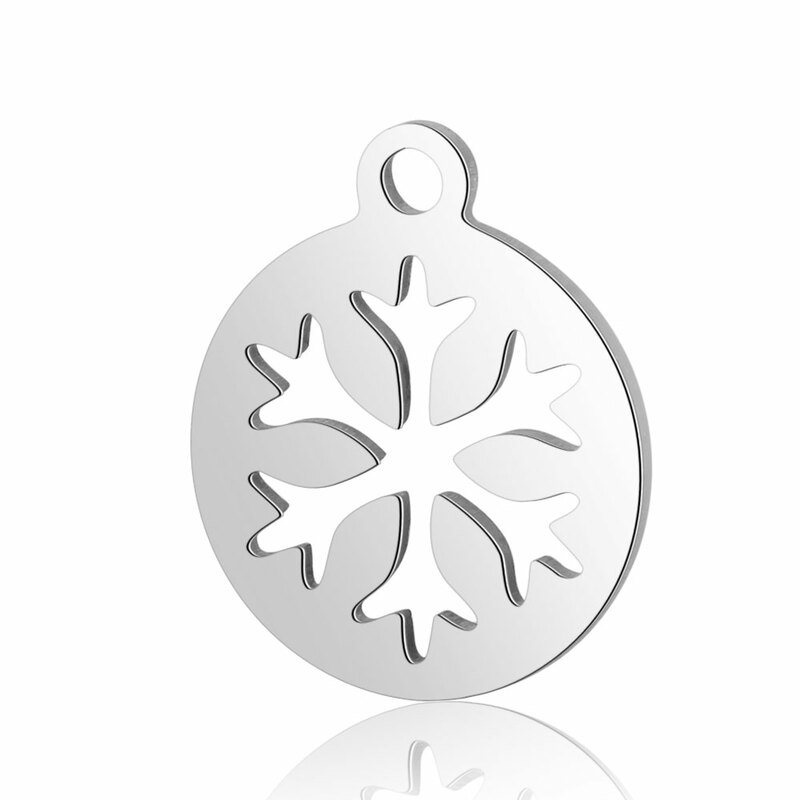 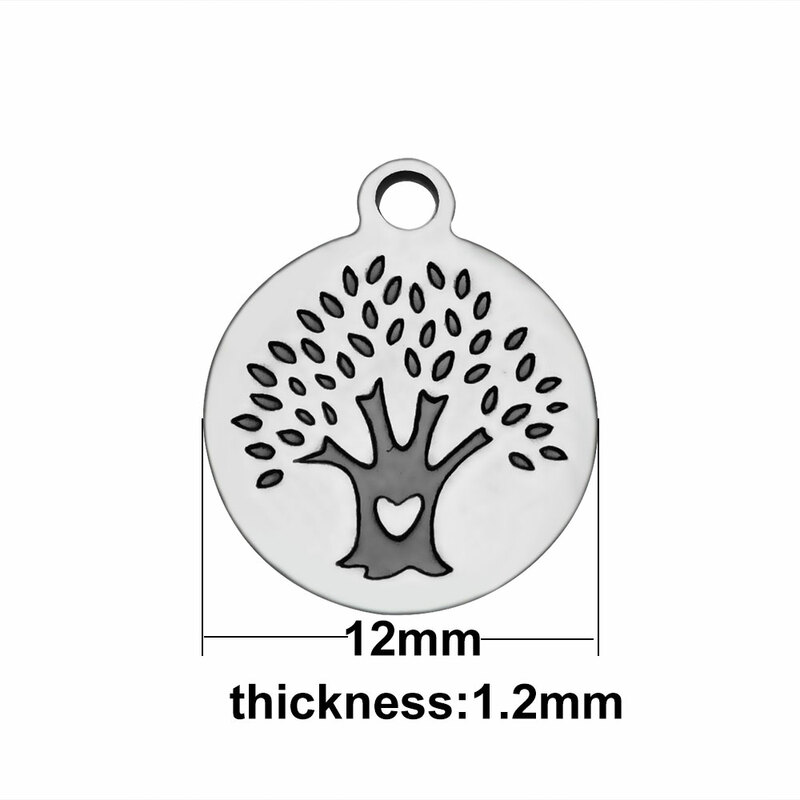 Products Description: * 1 Silver-Tone Charm with Clear Rhinestone * Use this charm to add to an Alex & Ani Style Bracelet Or your Necklace * Stainless steel jewelry will not will not tarnish or rust. 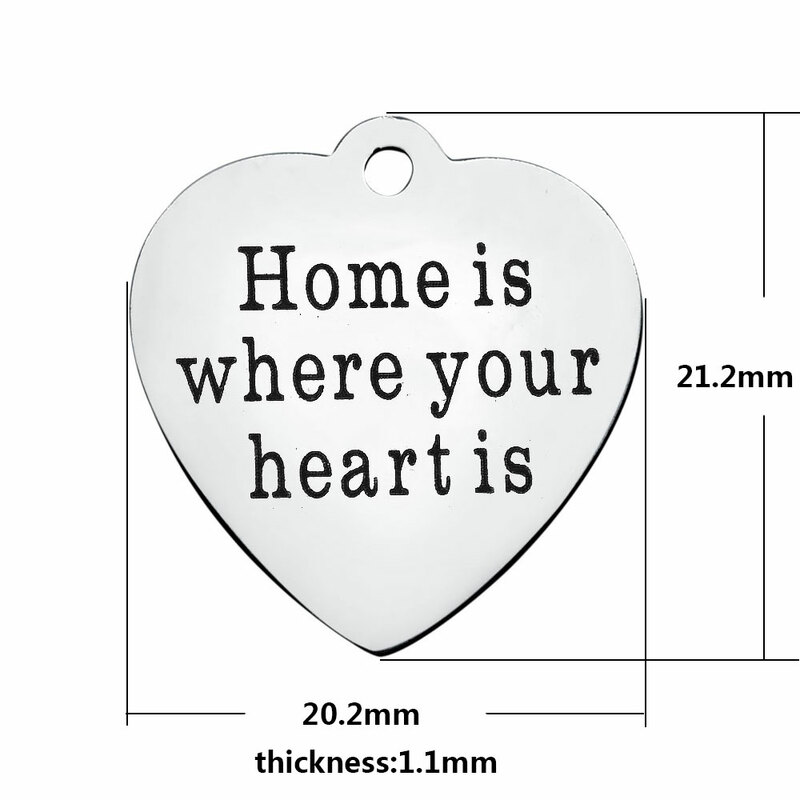 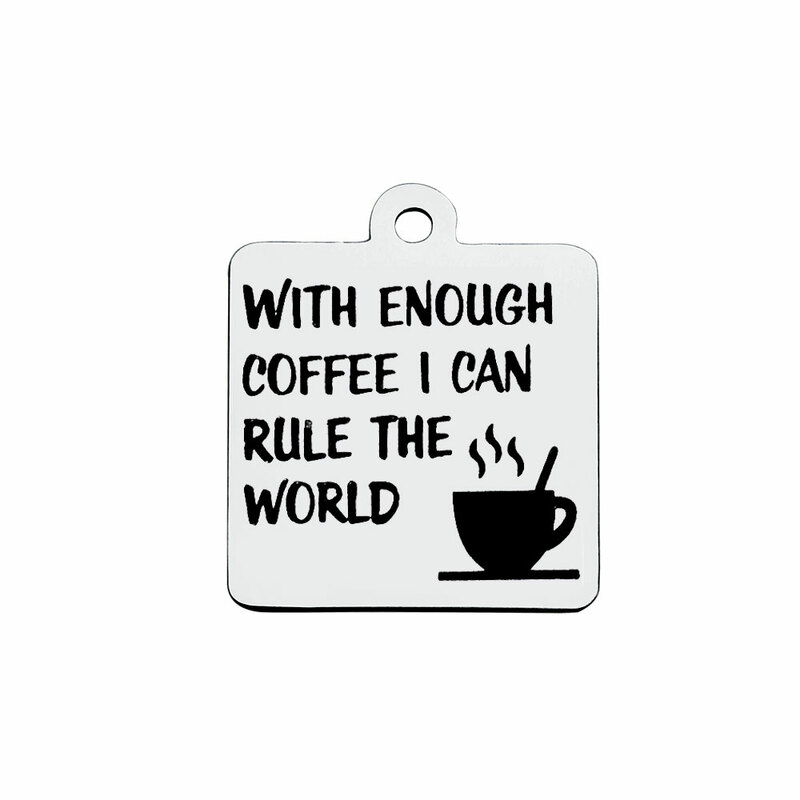 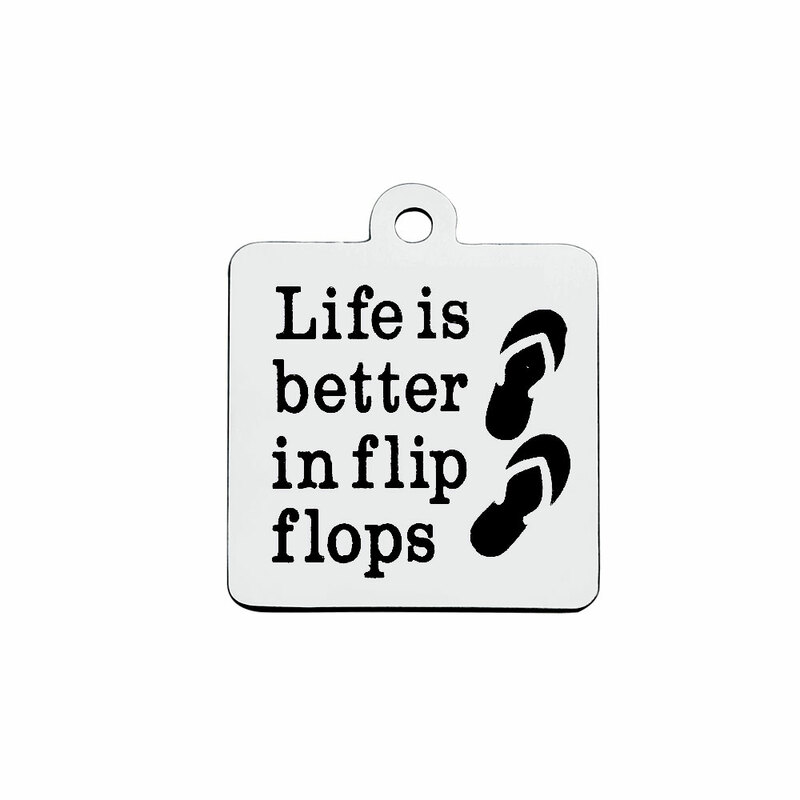 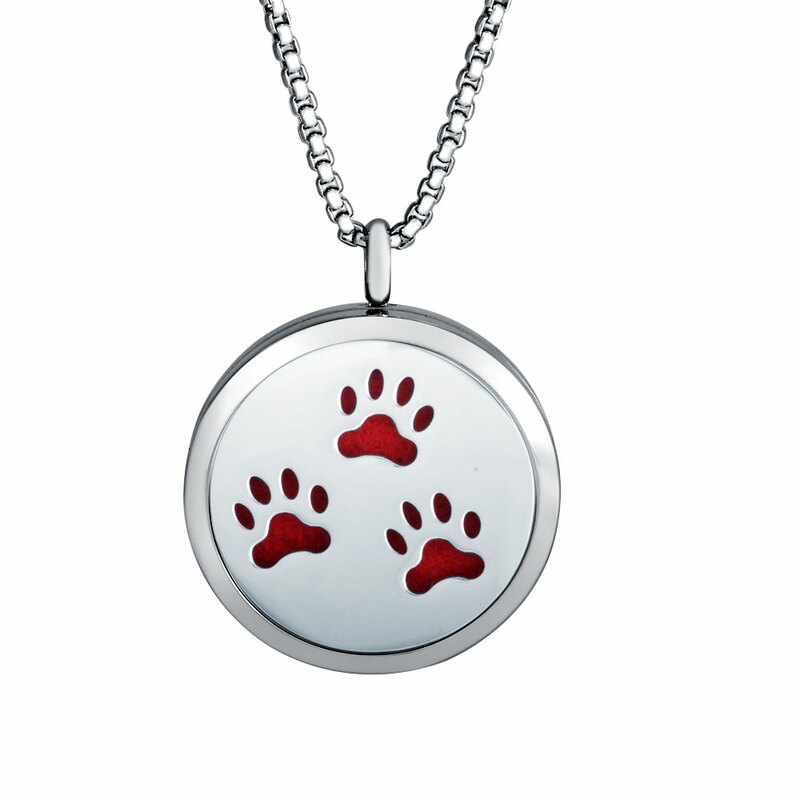 * It is durable and scratch resistant. 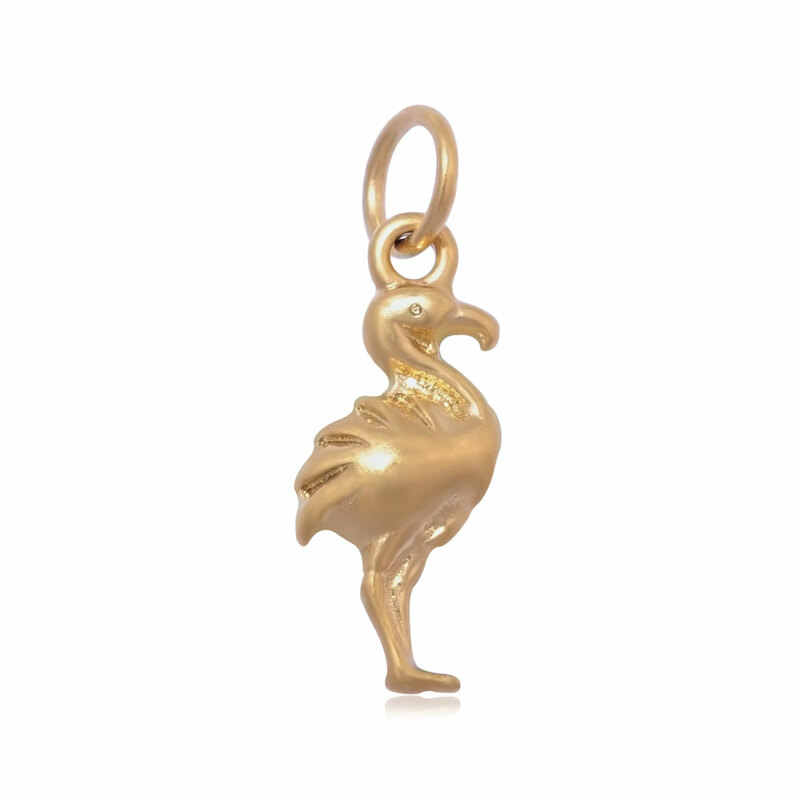 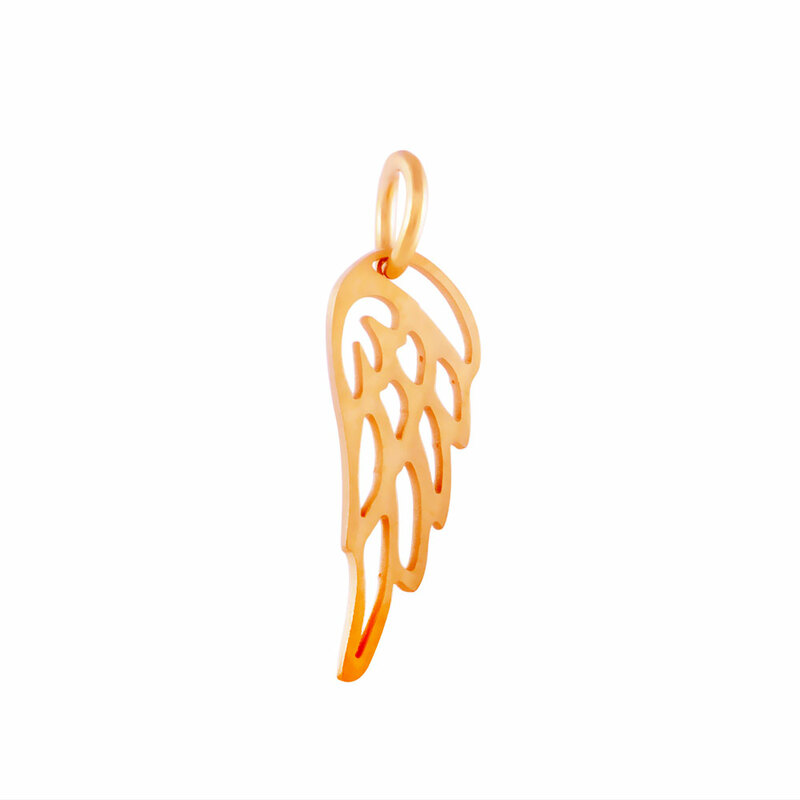 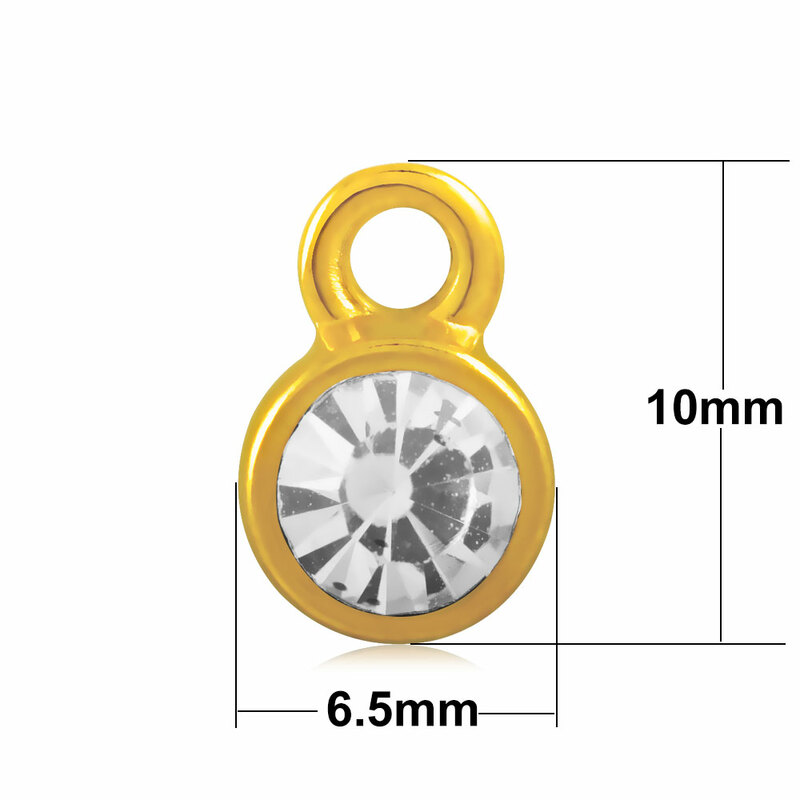 Products Description: * 1 Gold-Tone Charm with Clear Rhinestone * Use this charm to add to an Alex & Ani Style Bracelet Or your Necklace * Stainless steel jewelry will not will not tarnish or rust. 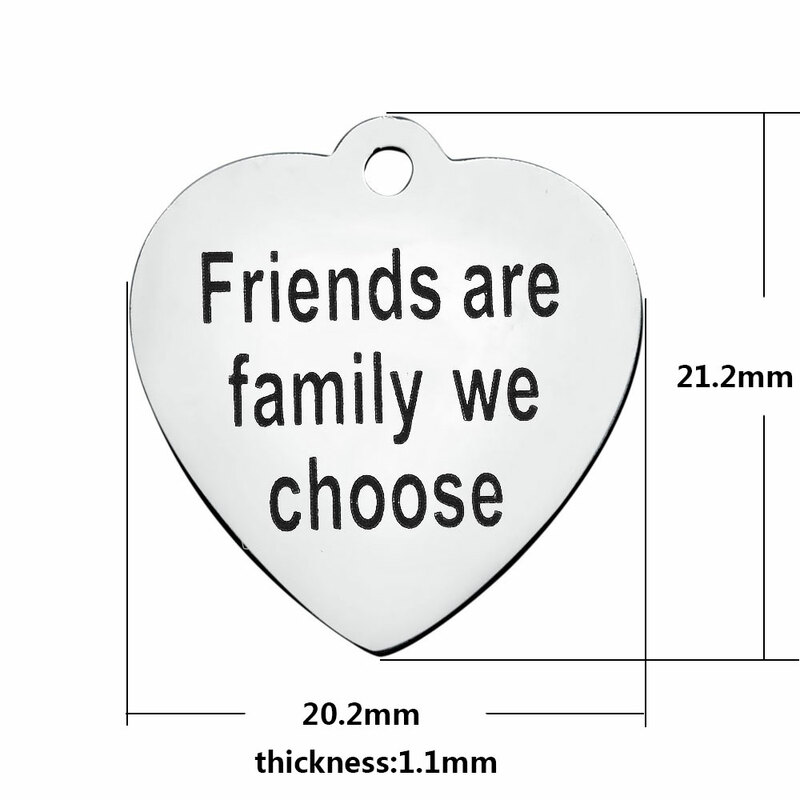 * It is durable and scratch resistant. 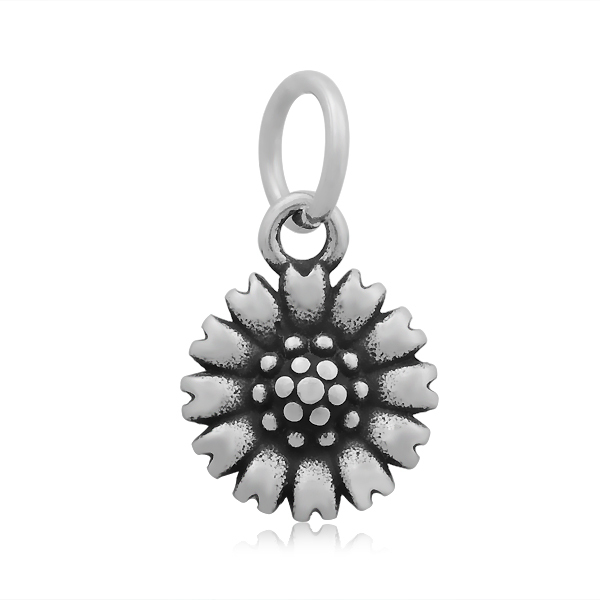 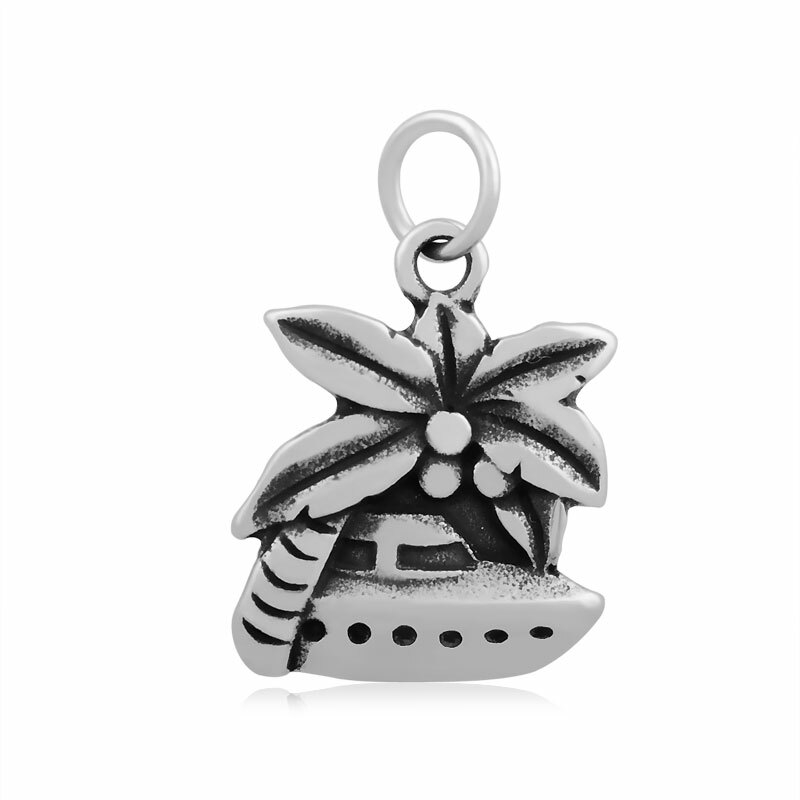 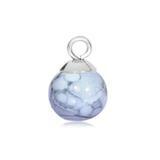 Products Description: * 1 Silver-Tone Charm with Blue Rhinestone * Use this charm to add to an Alex & Ani Style Bracelet Or your Necklace * Stainless steel jewelry will not will not tarnish or rust. 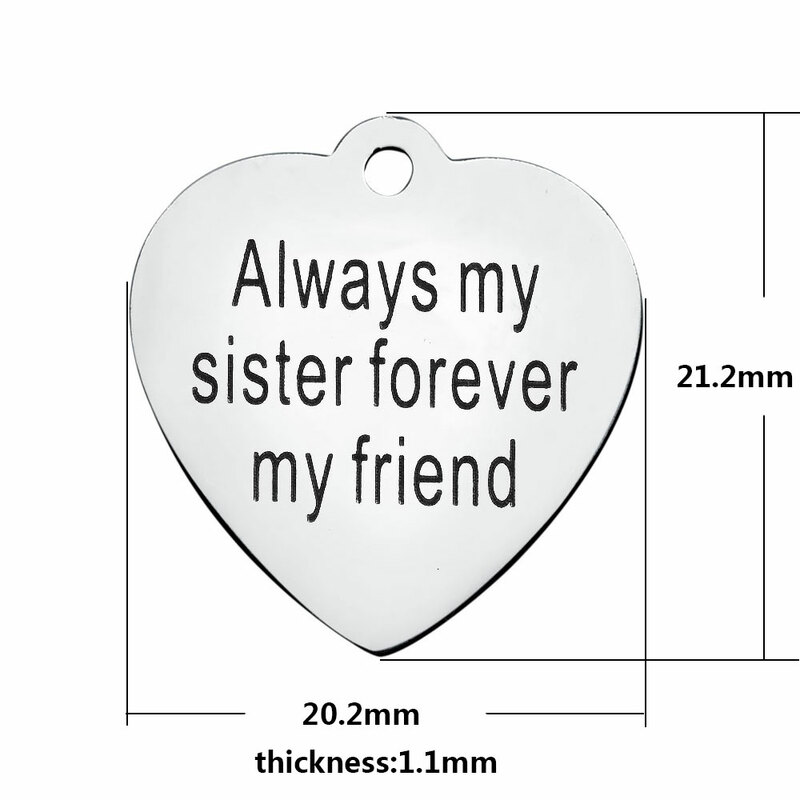 * It is durable and scratch resistant. 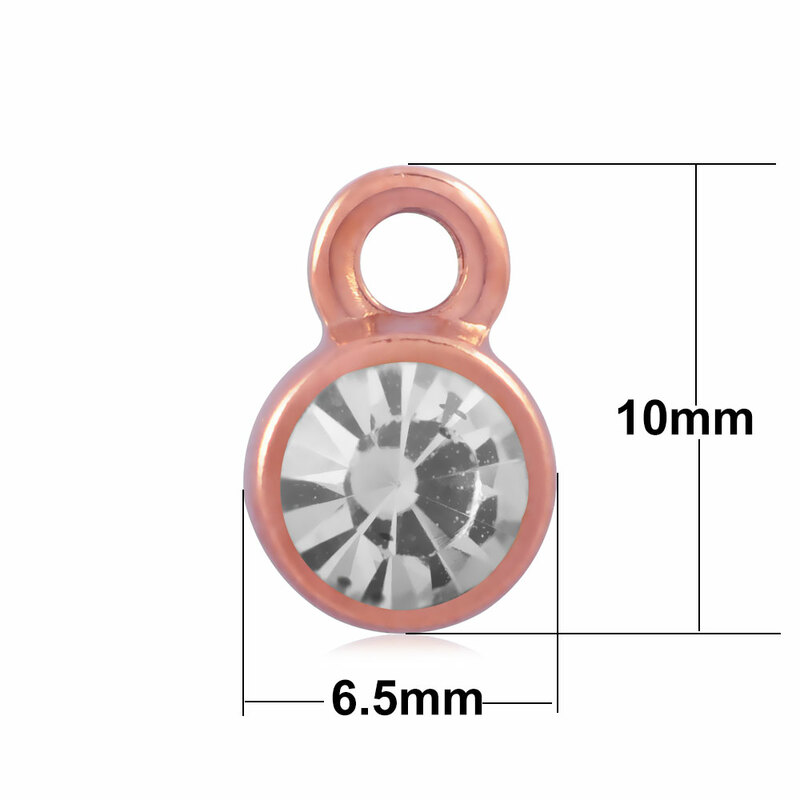 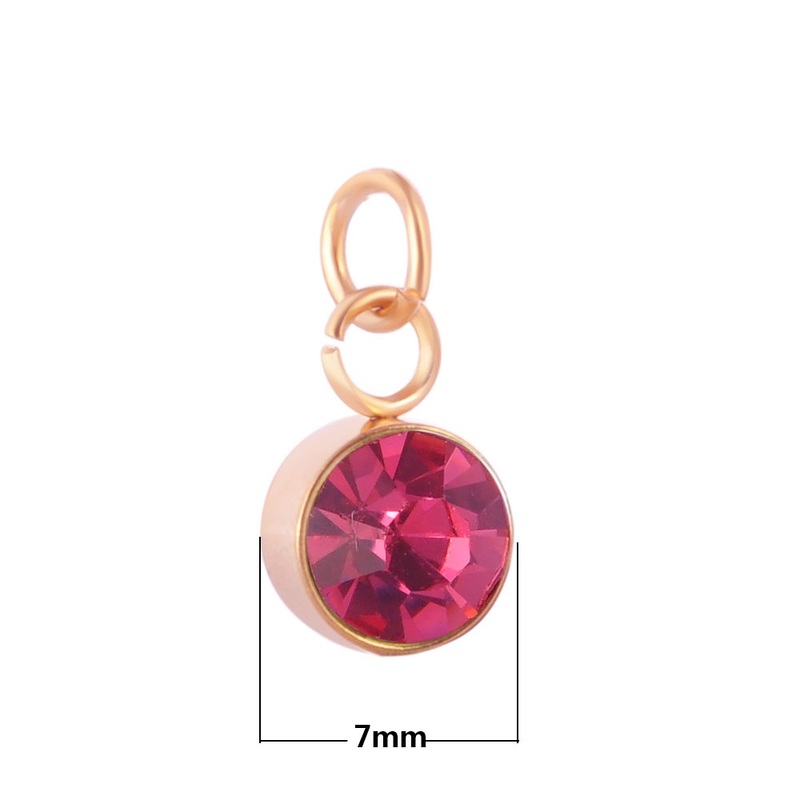 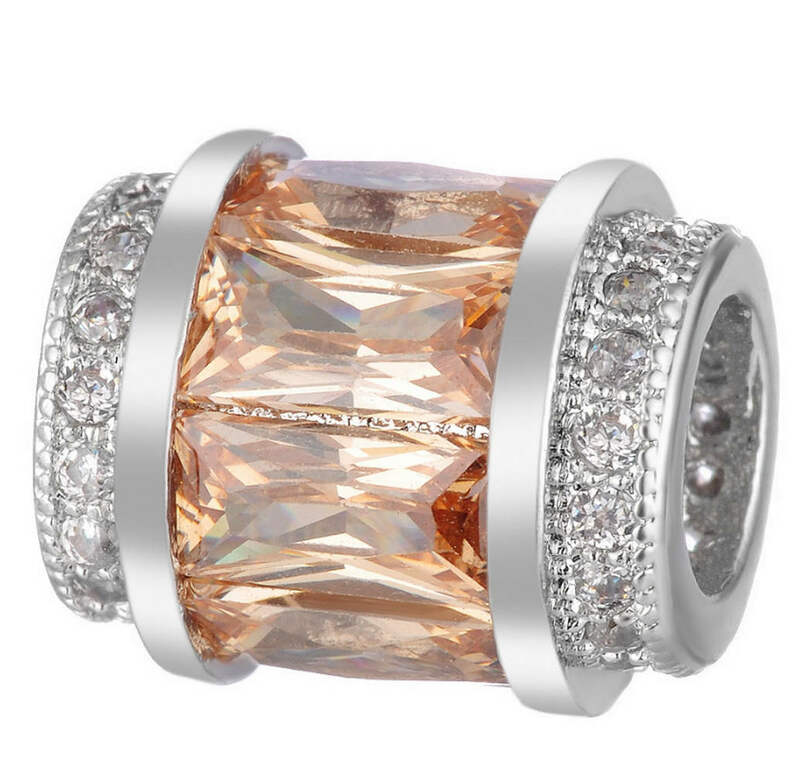 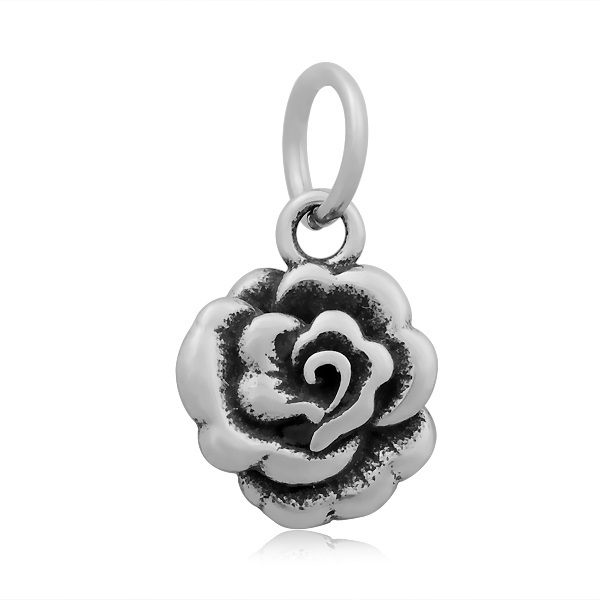 Products Description: * 1 Rose Gold-Tone Charm with Clear Rhinestone * Use this charm to add to an Alex & Ani Style Bracelet Or your Necklace * Stainless steel jewelry will not will not tarnish or rust. 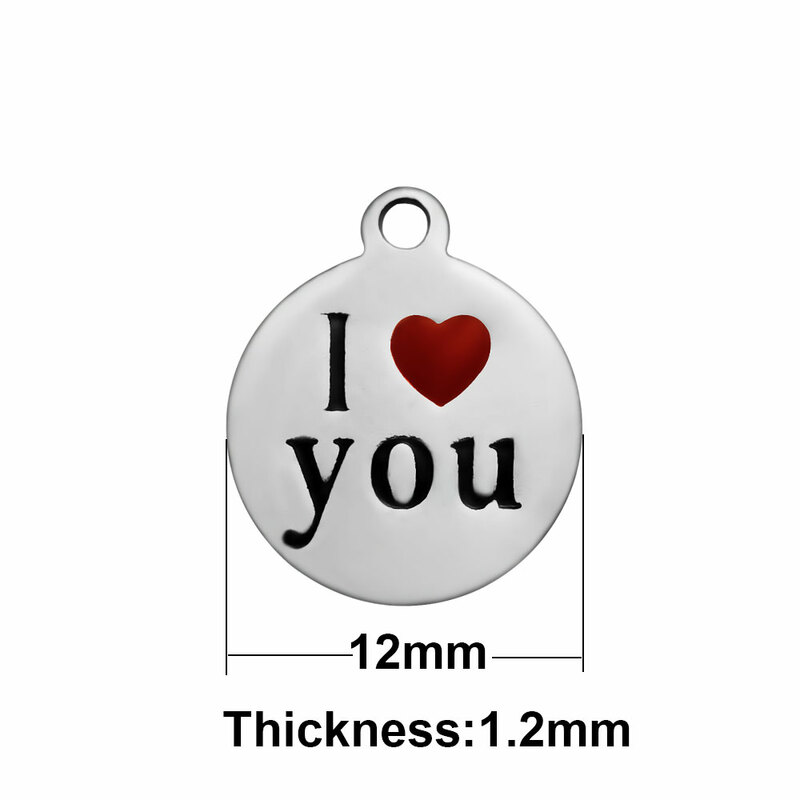 * It is durable and scratch resistant. 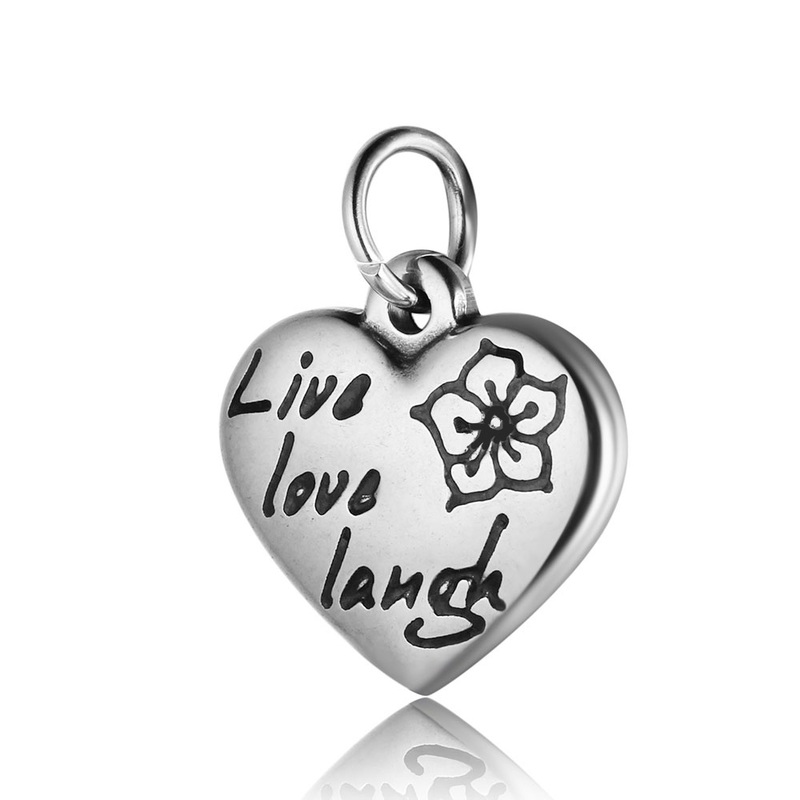 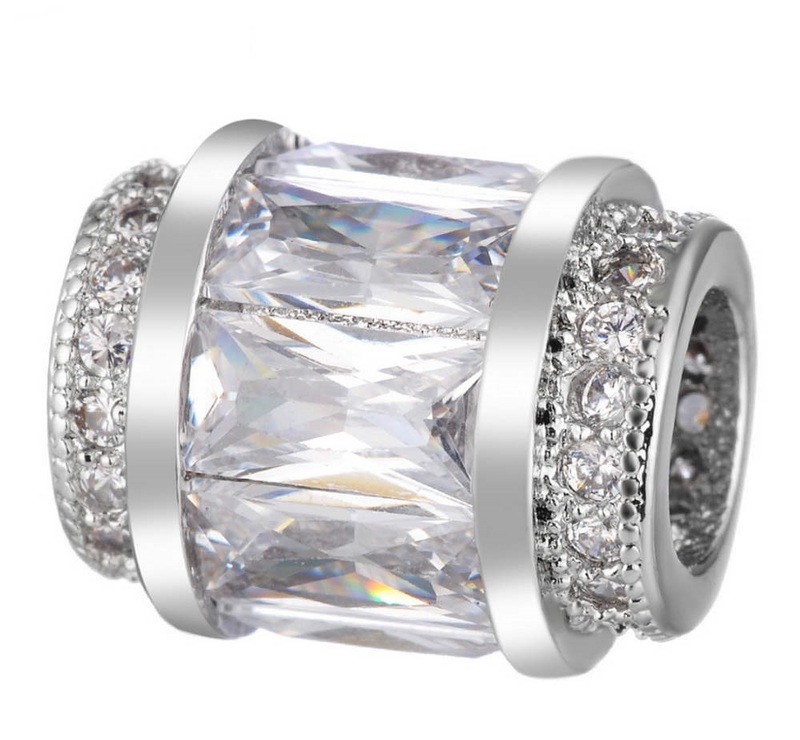 tainless steel jewelry will not will not tarnish or rust. 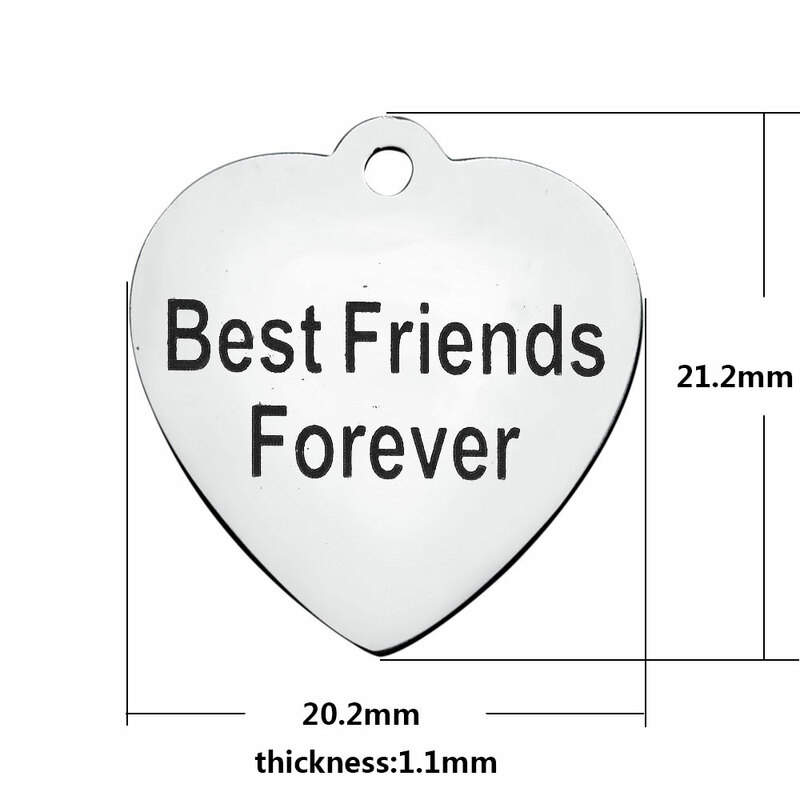 It is durable and scratch resistant. 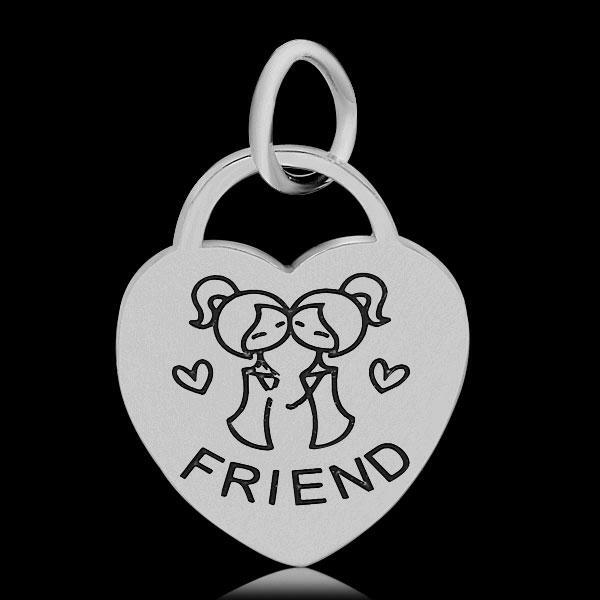 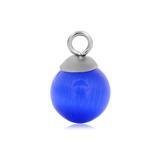 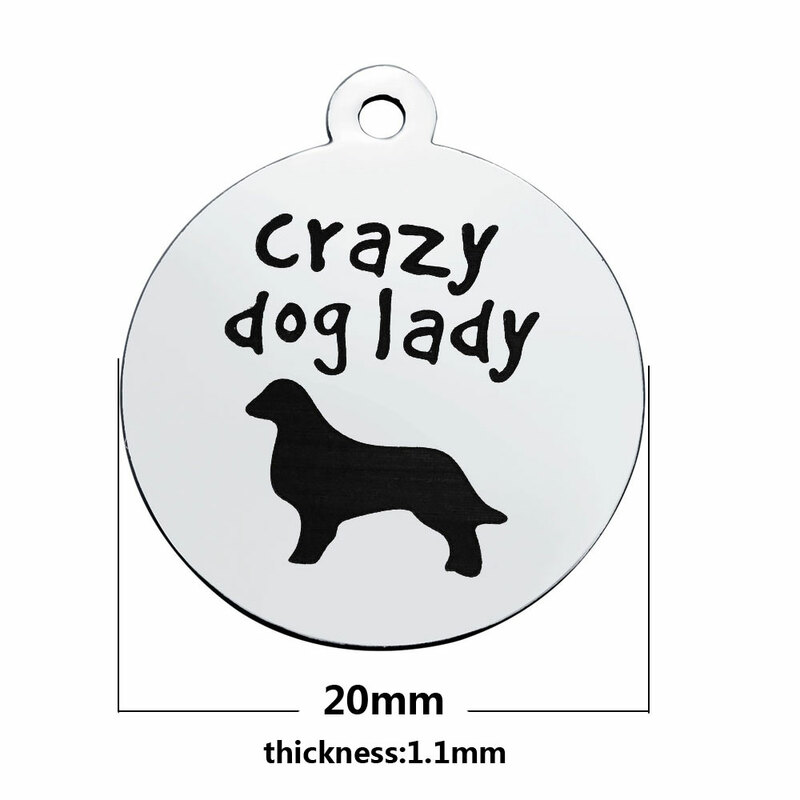 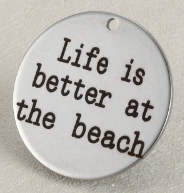 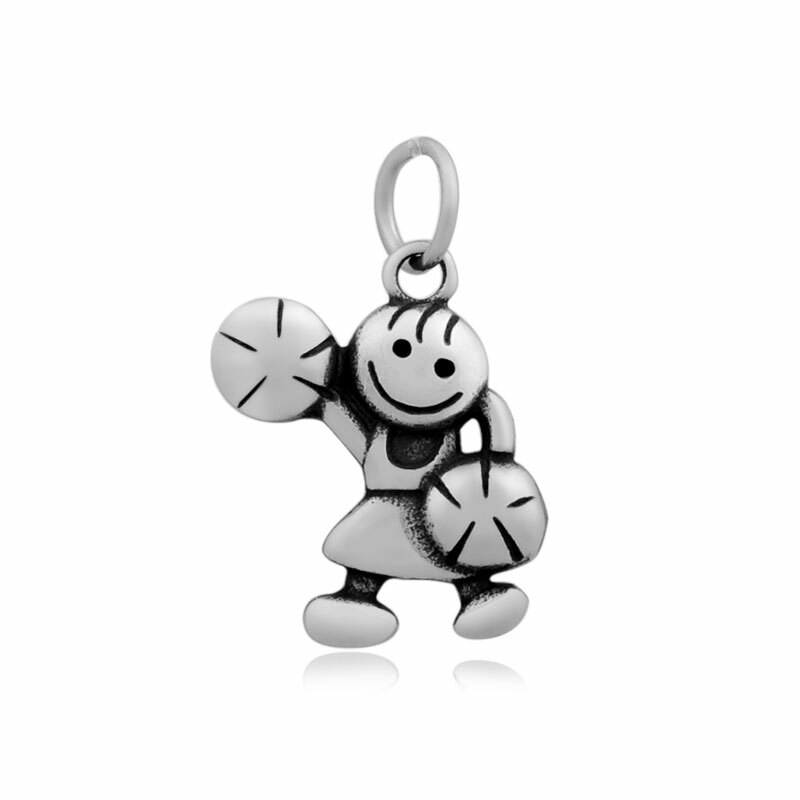 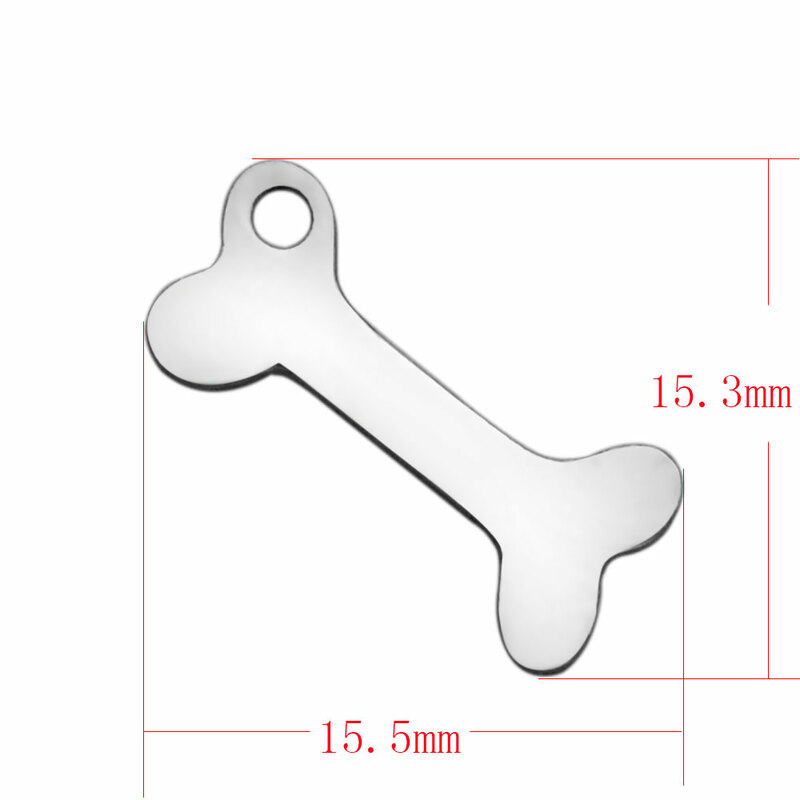 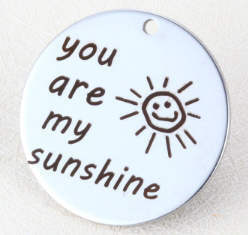 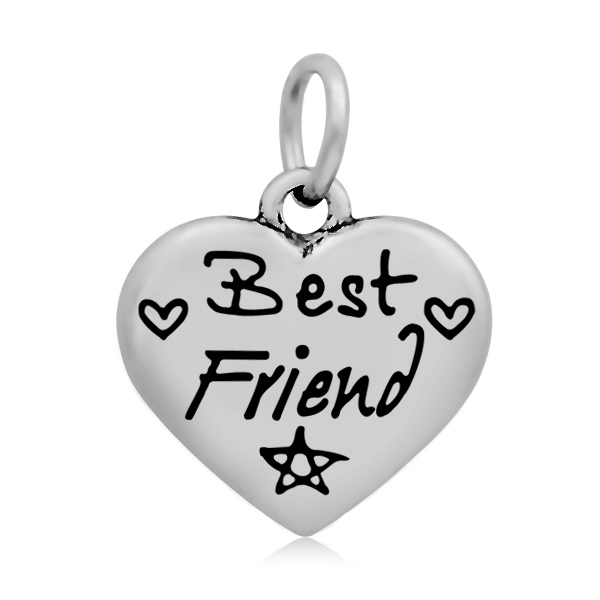 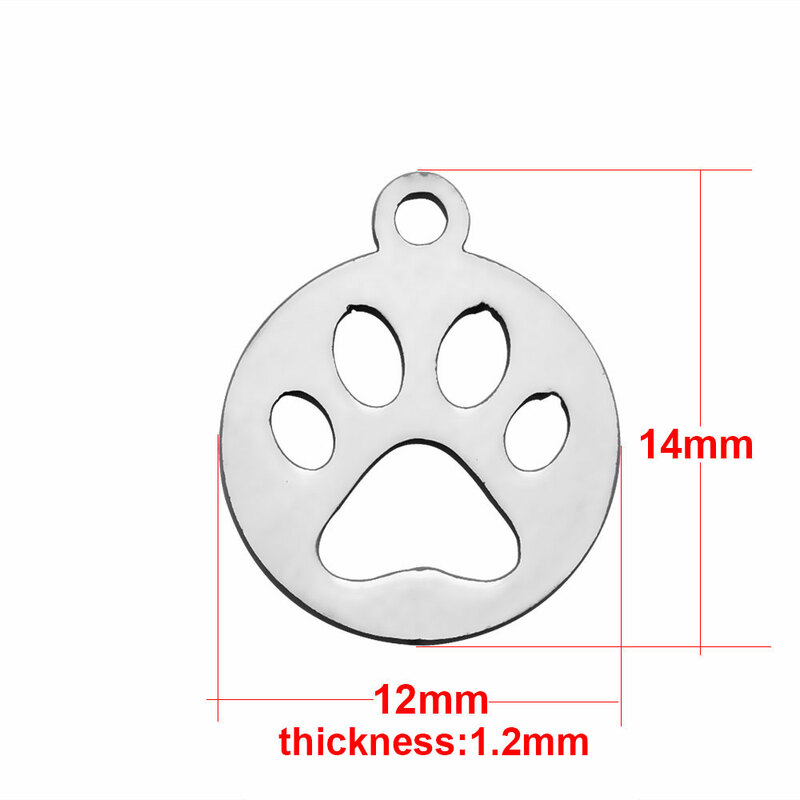 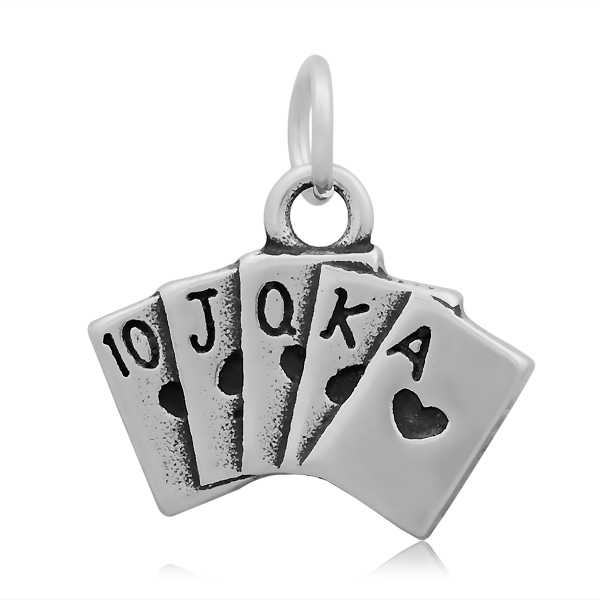 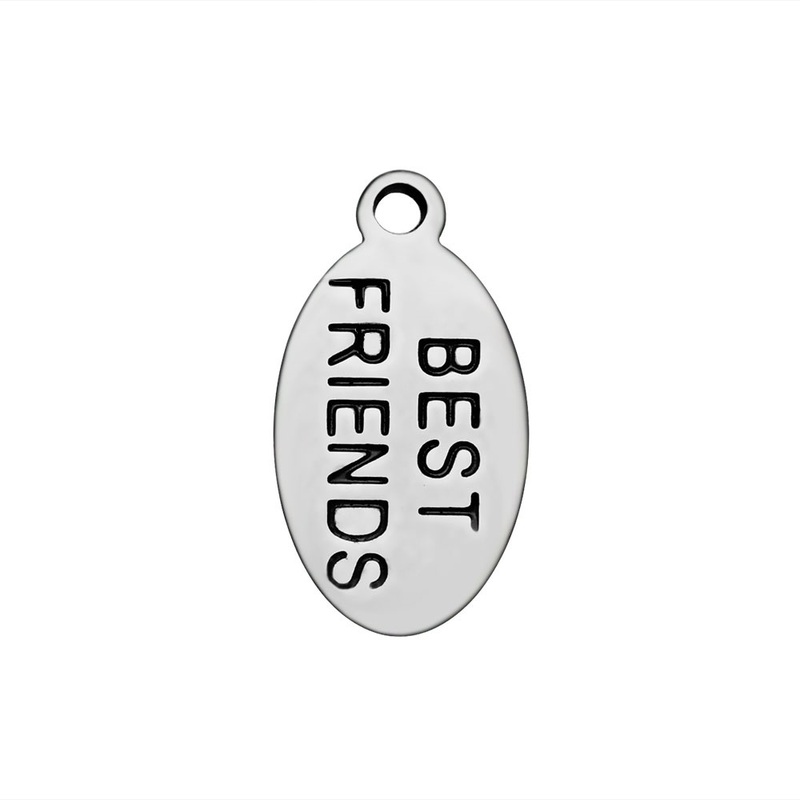 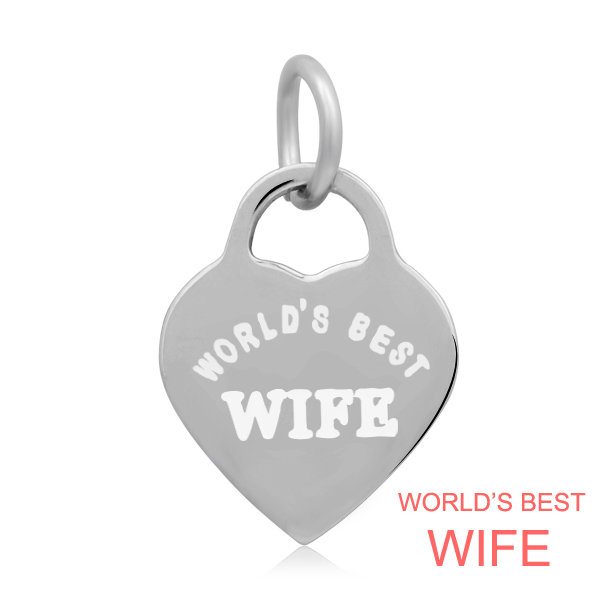 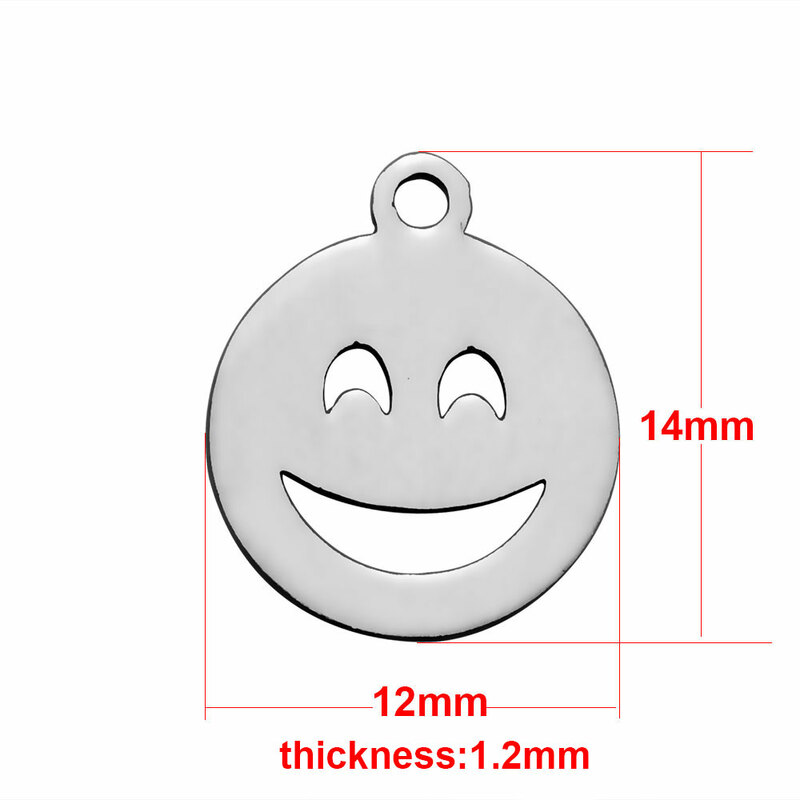 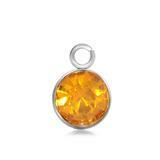 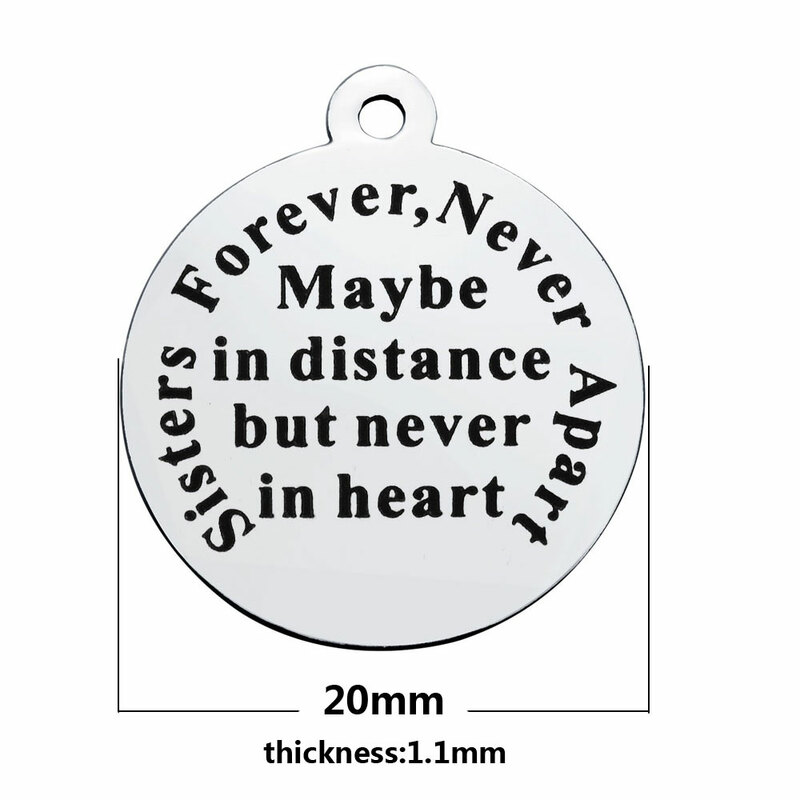 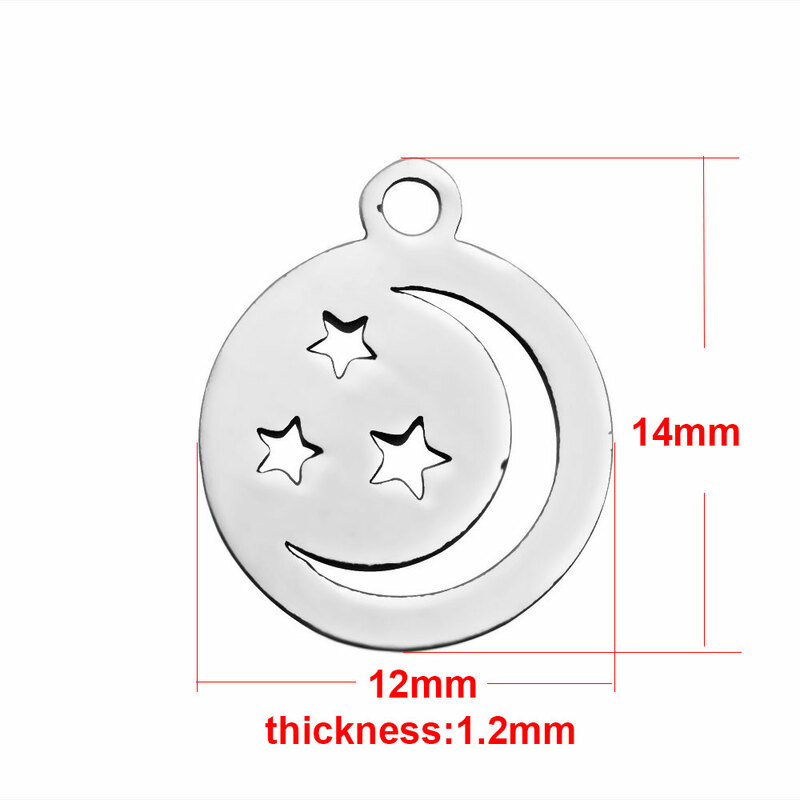 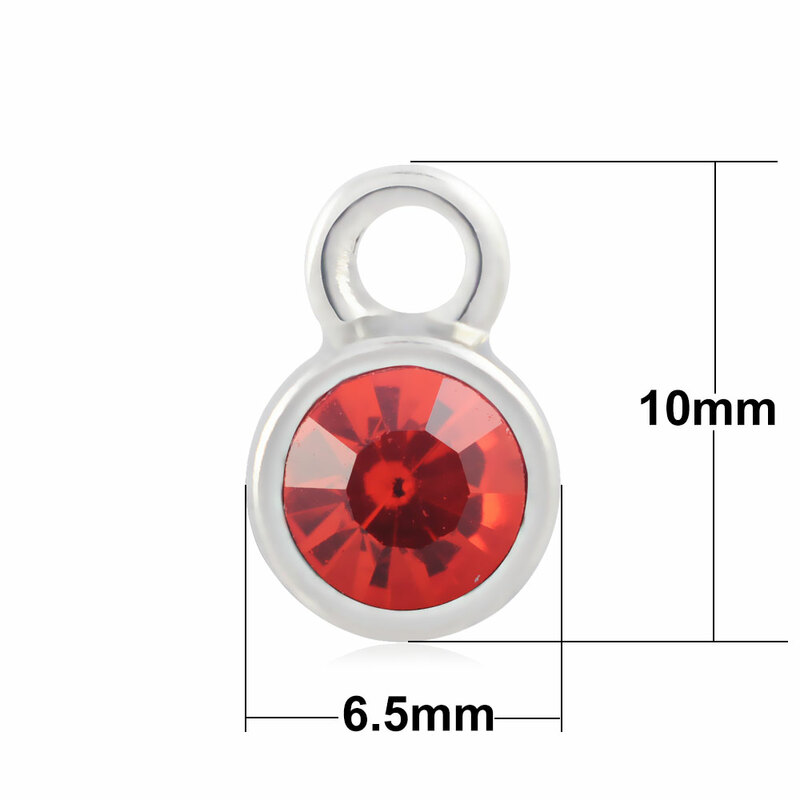 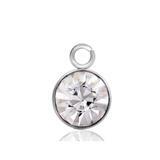 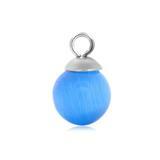 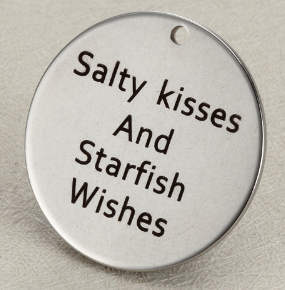 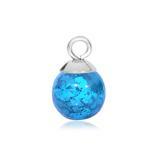 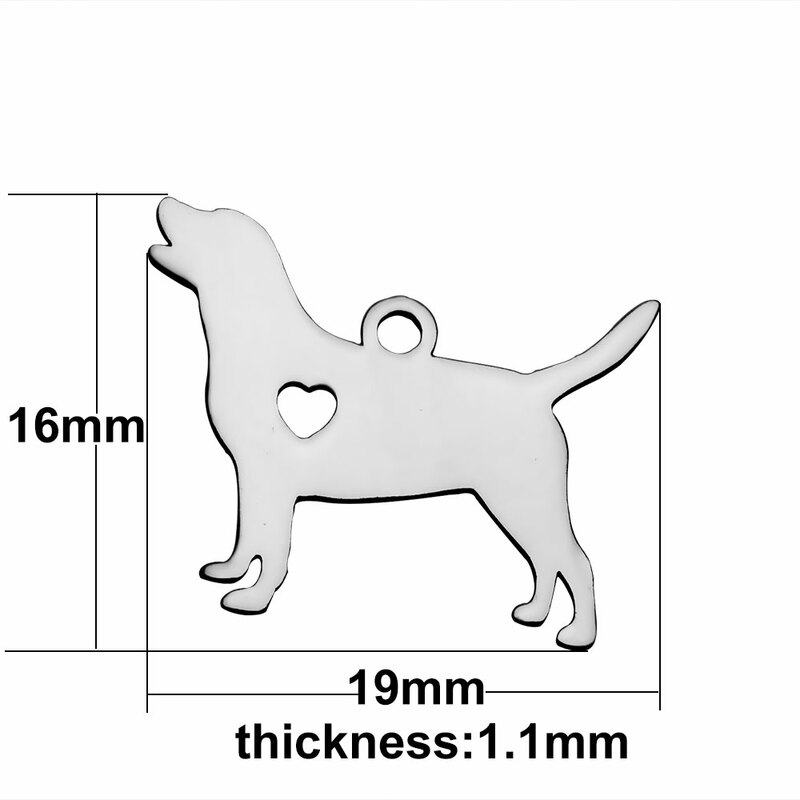 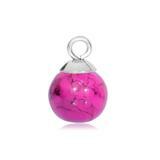 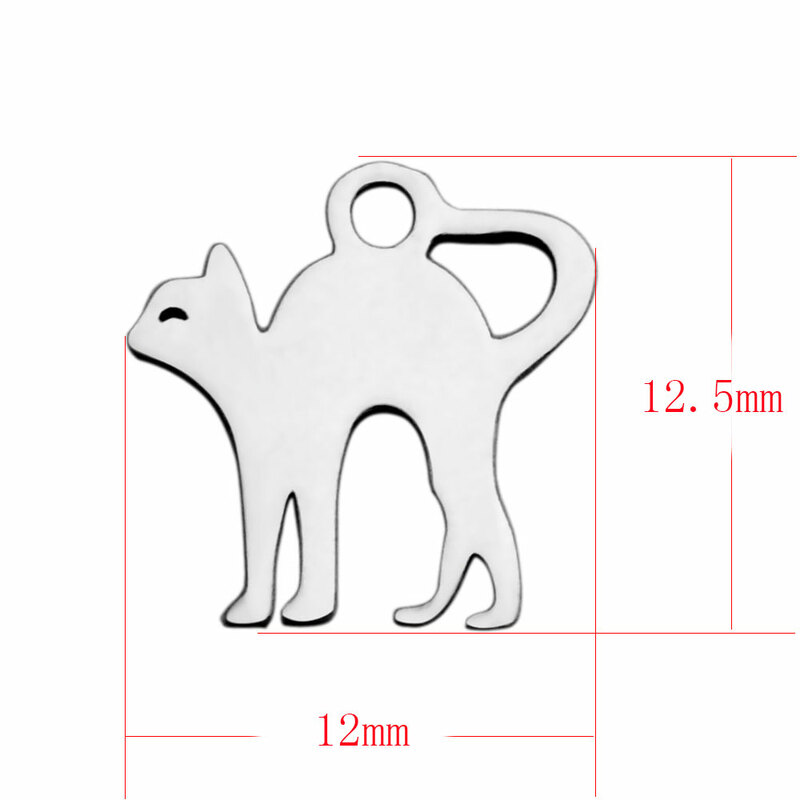 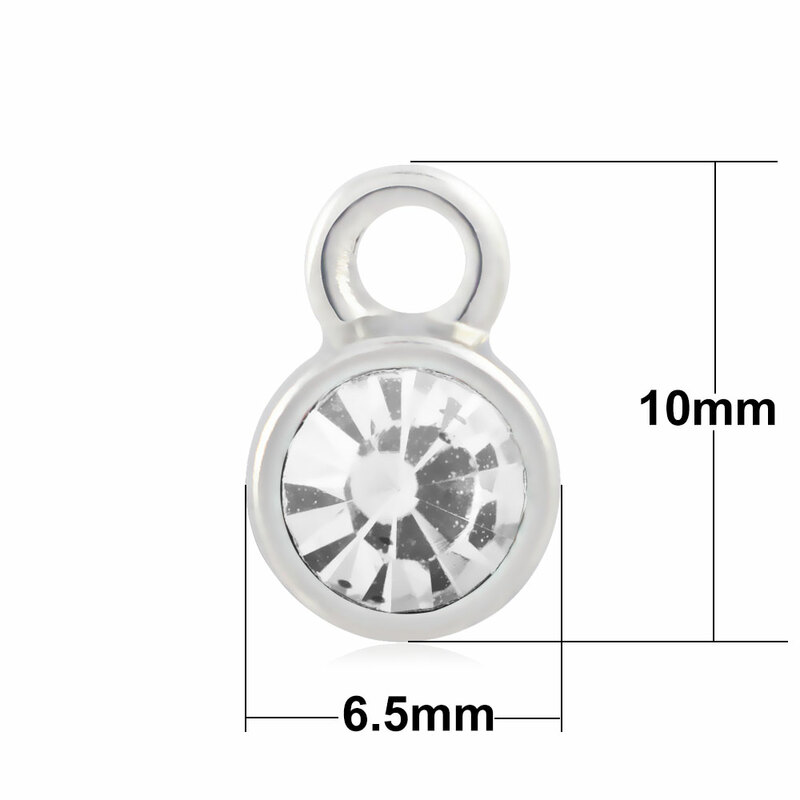 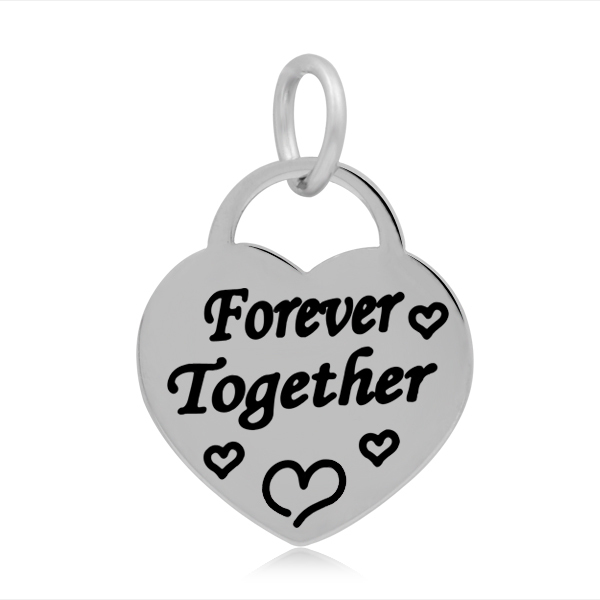 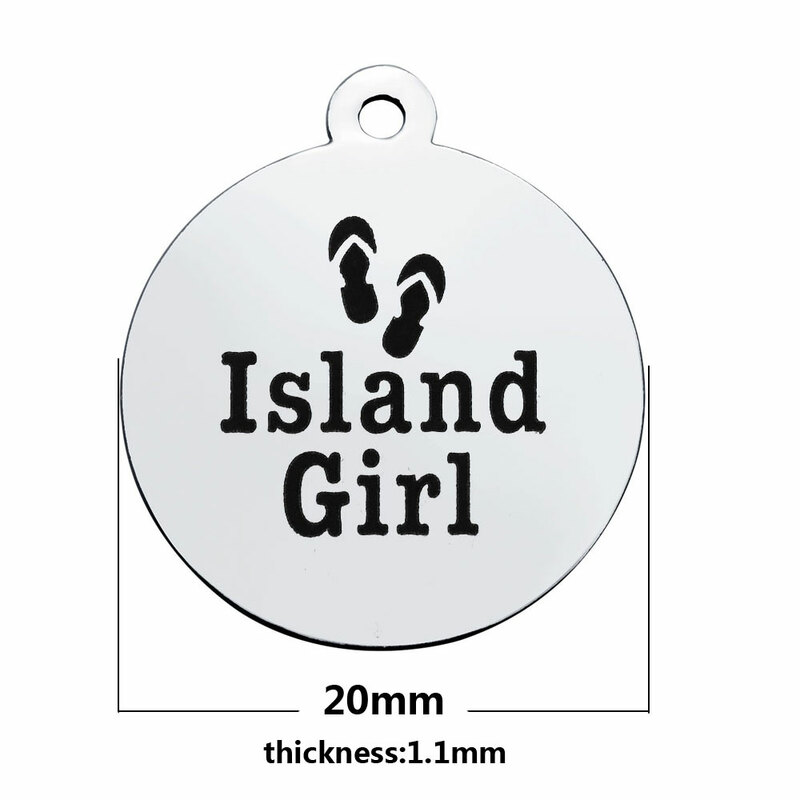 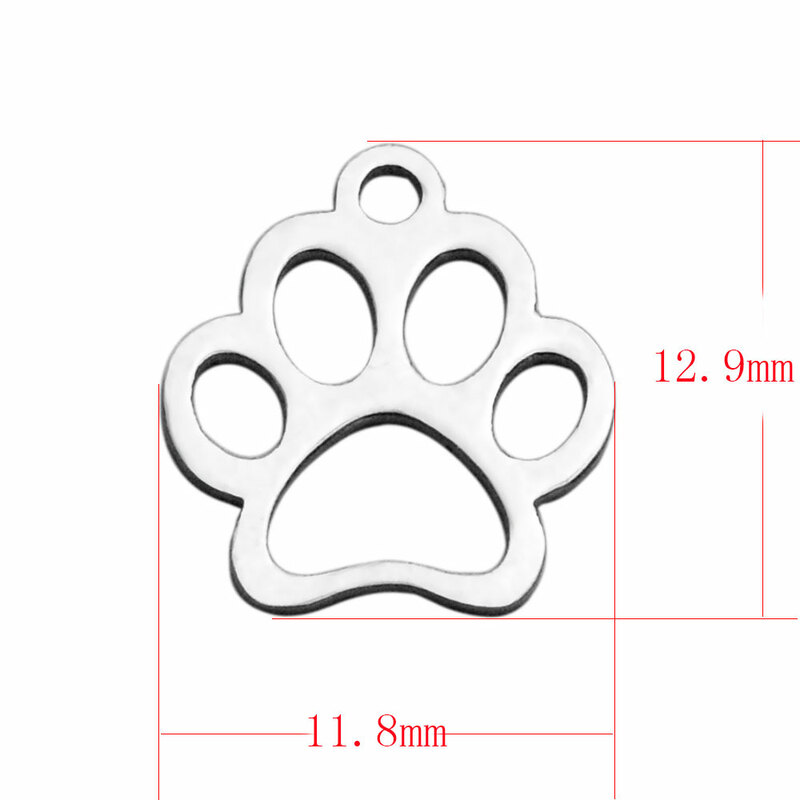 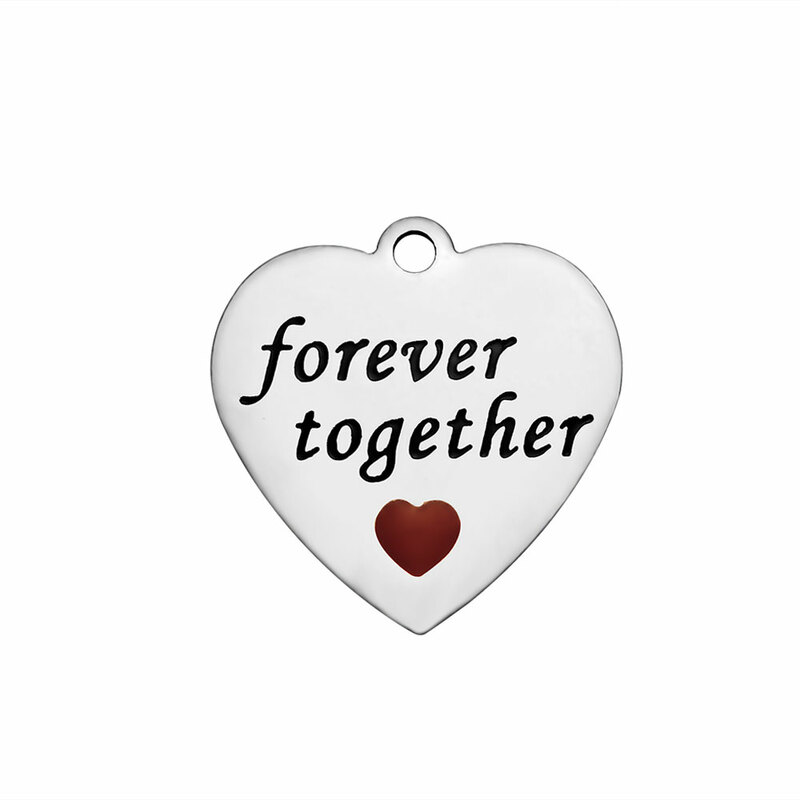 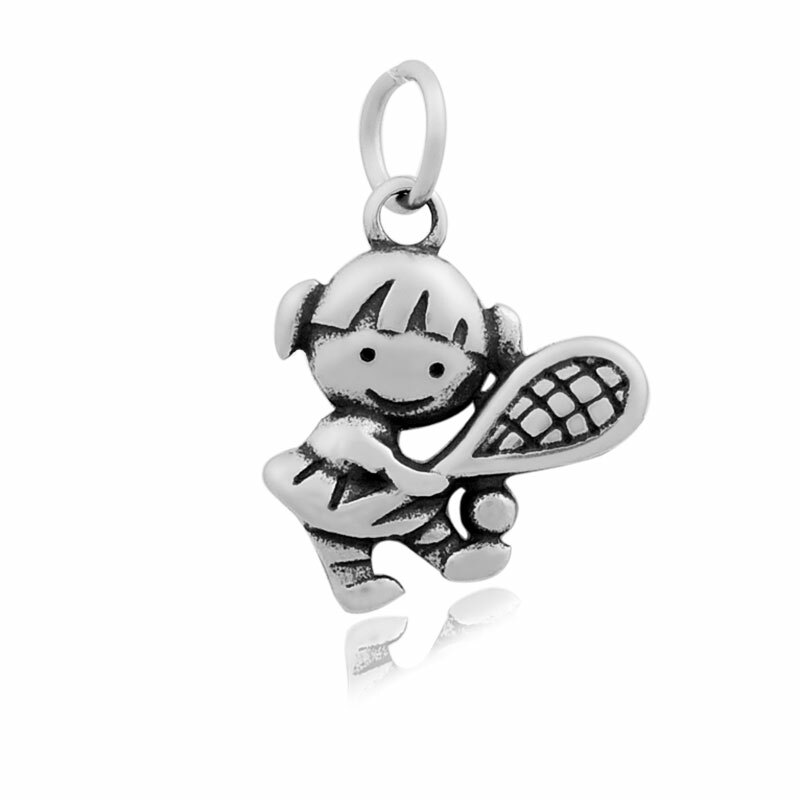 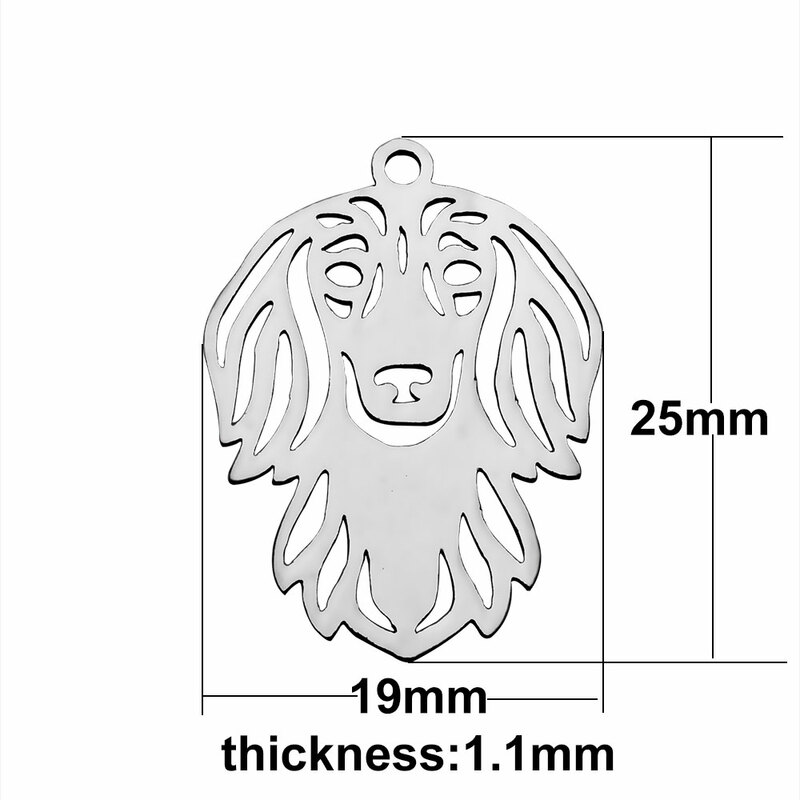 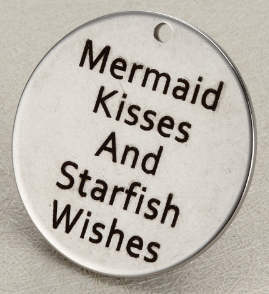 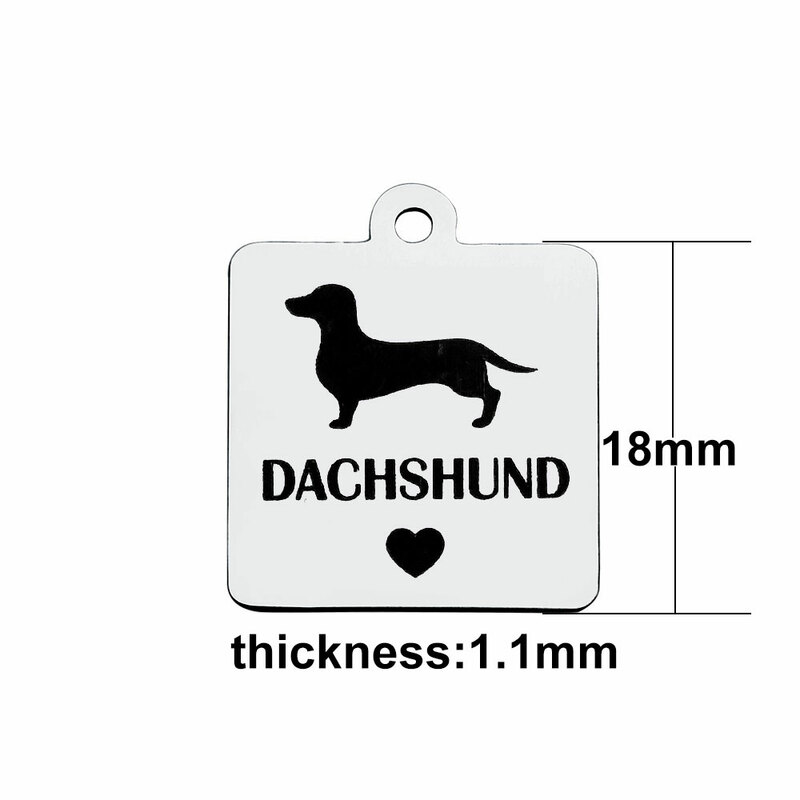 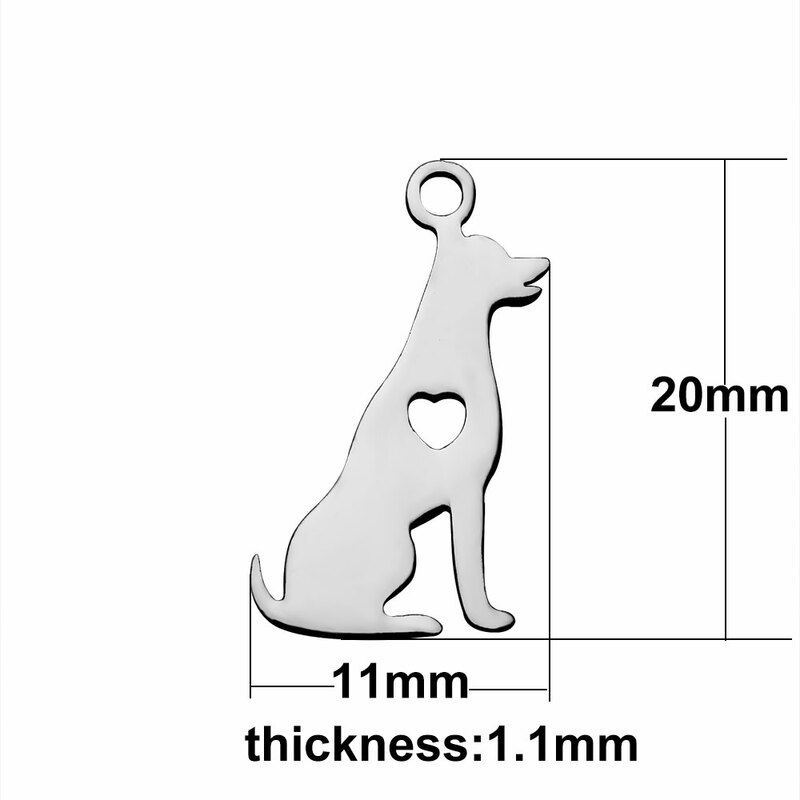 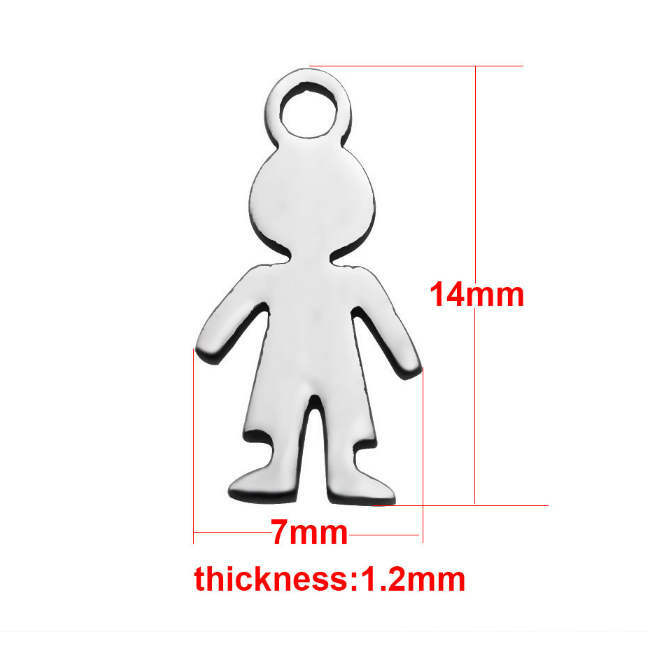 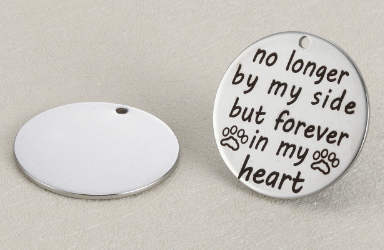 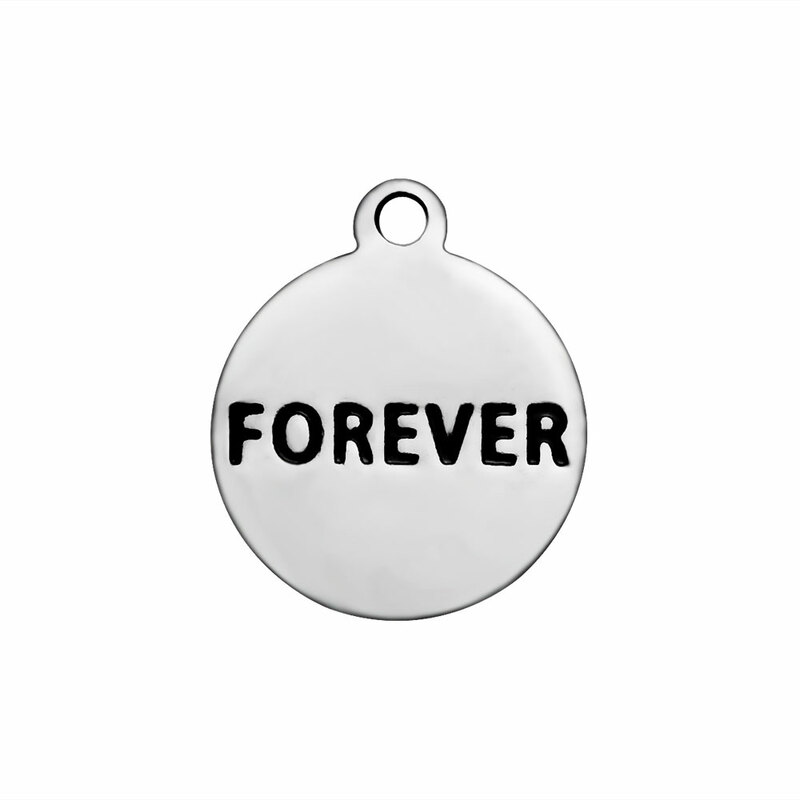 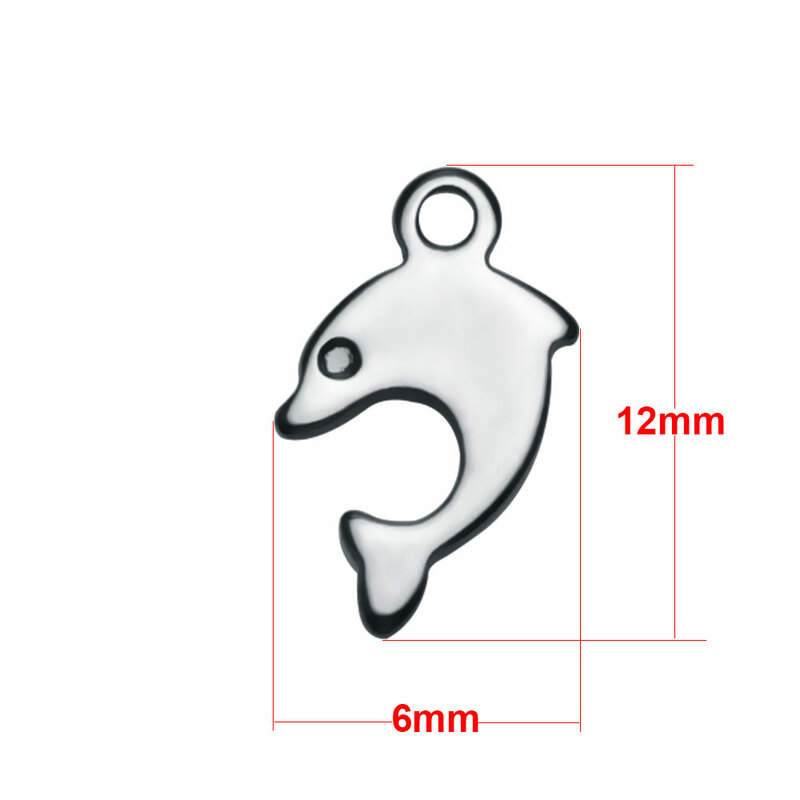 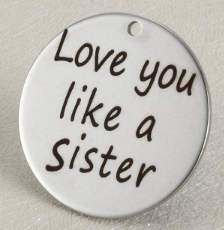 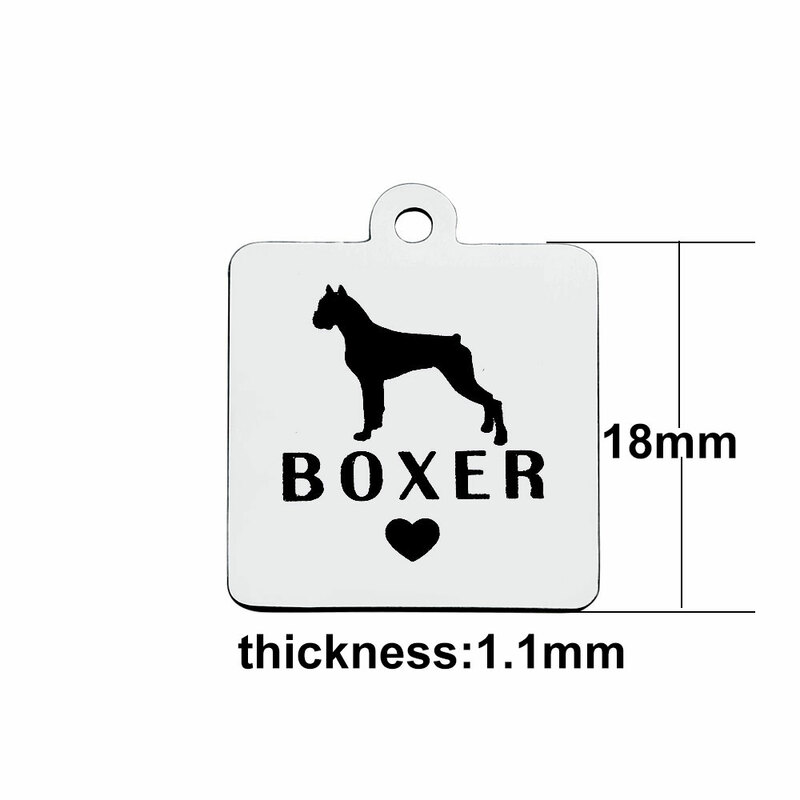 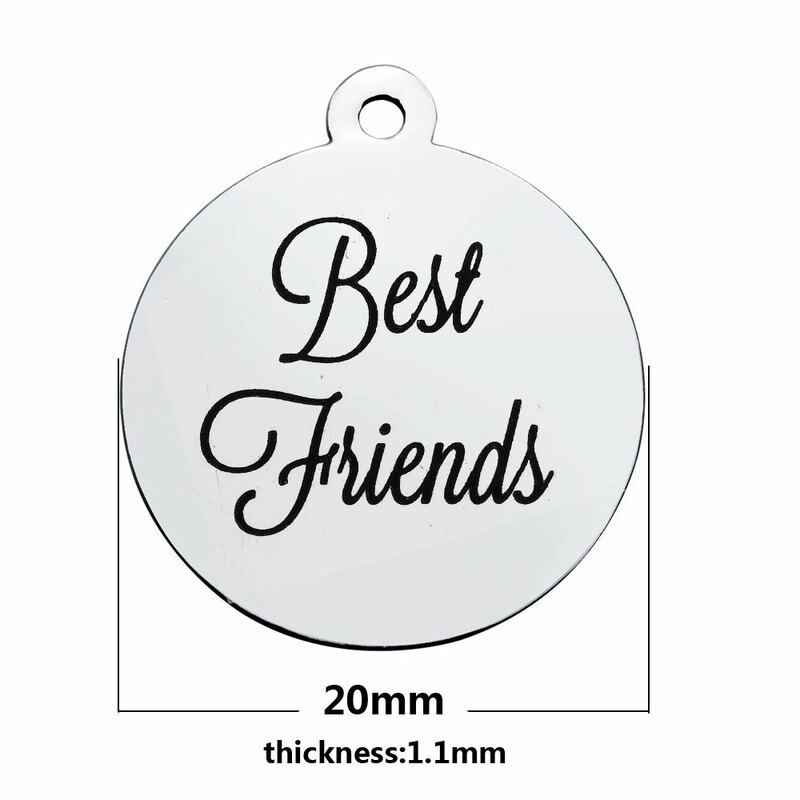 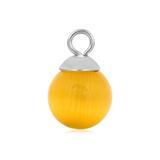 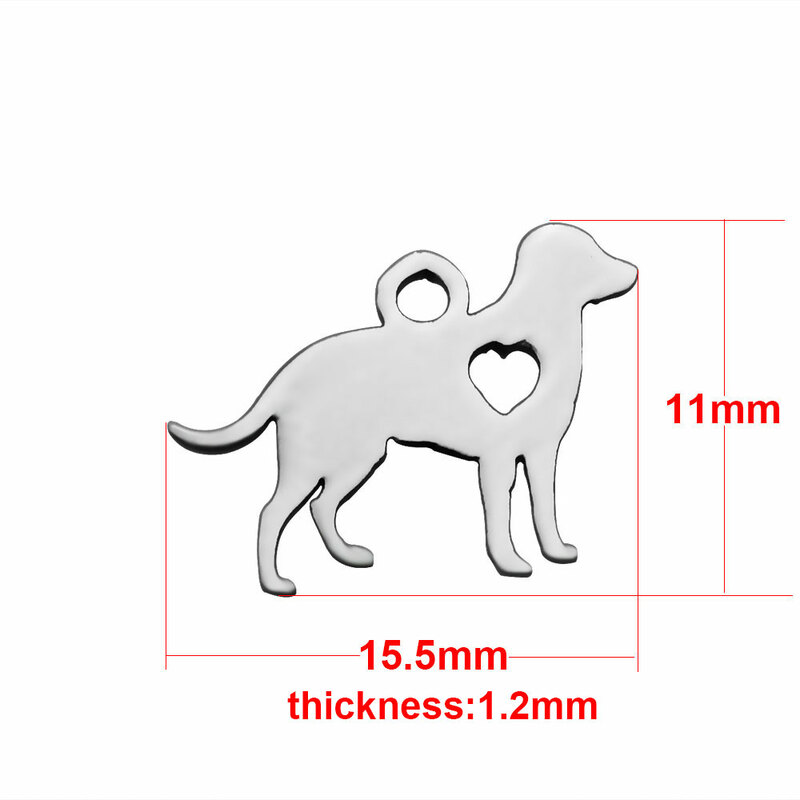 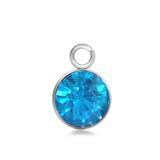 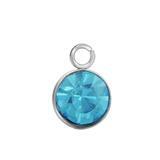 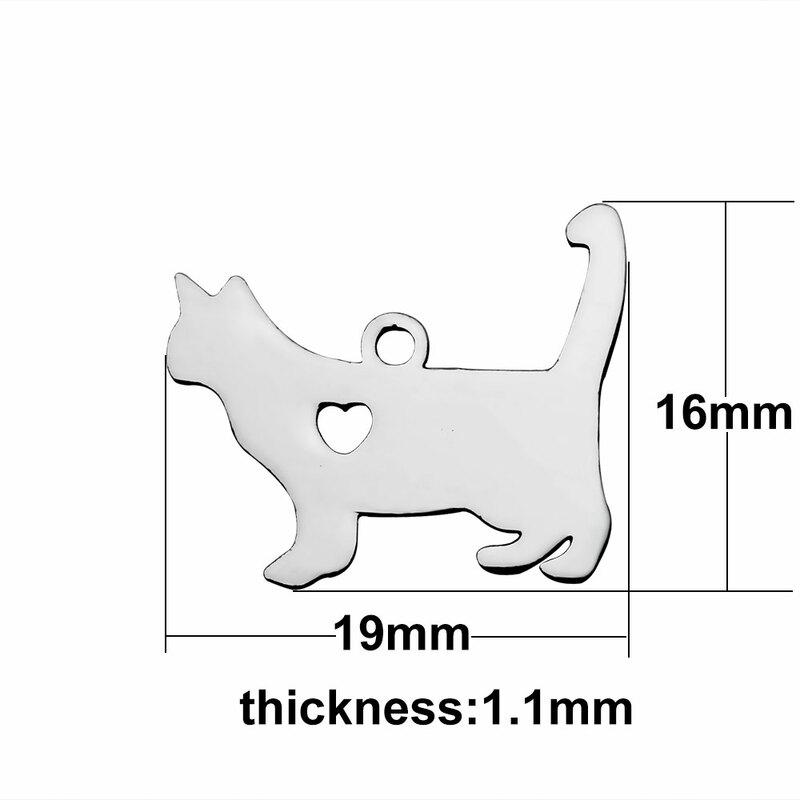 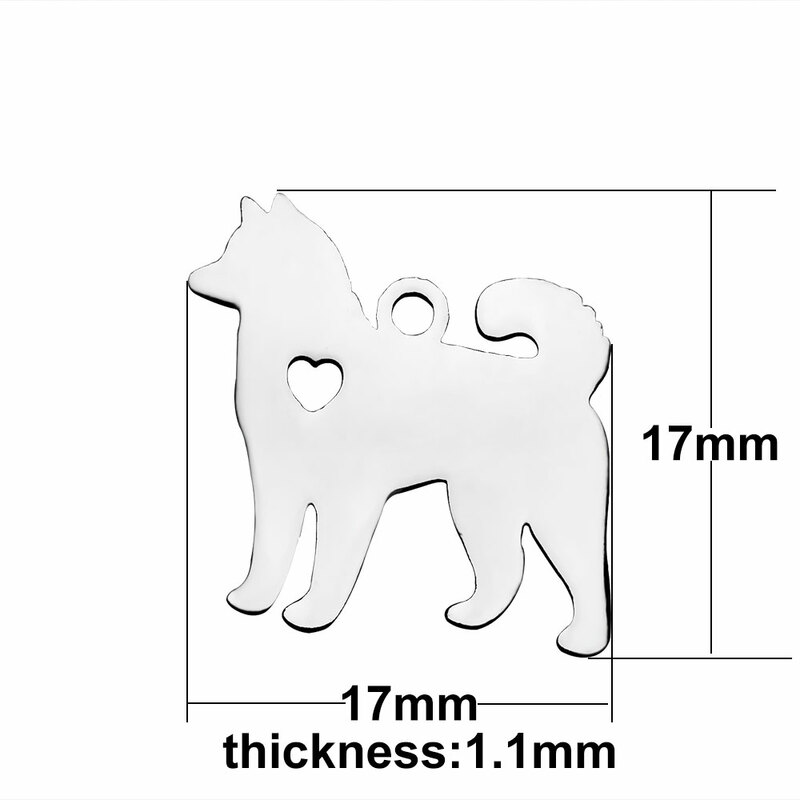 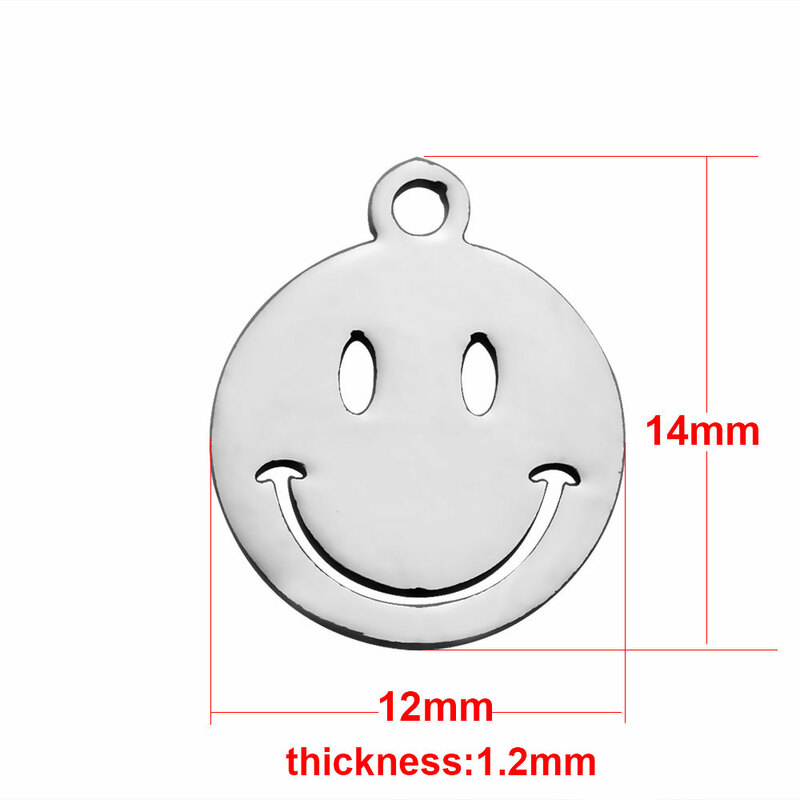 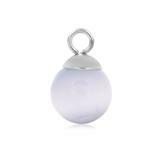 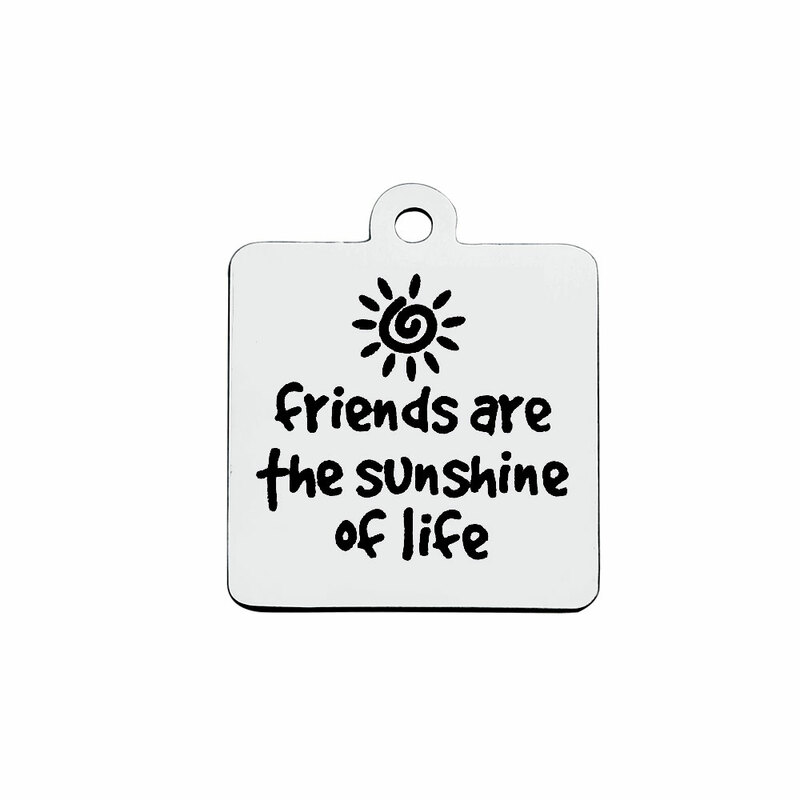 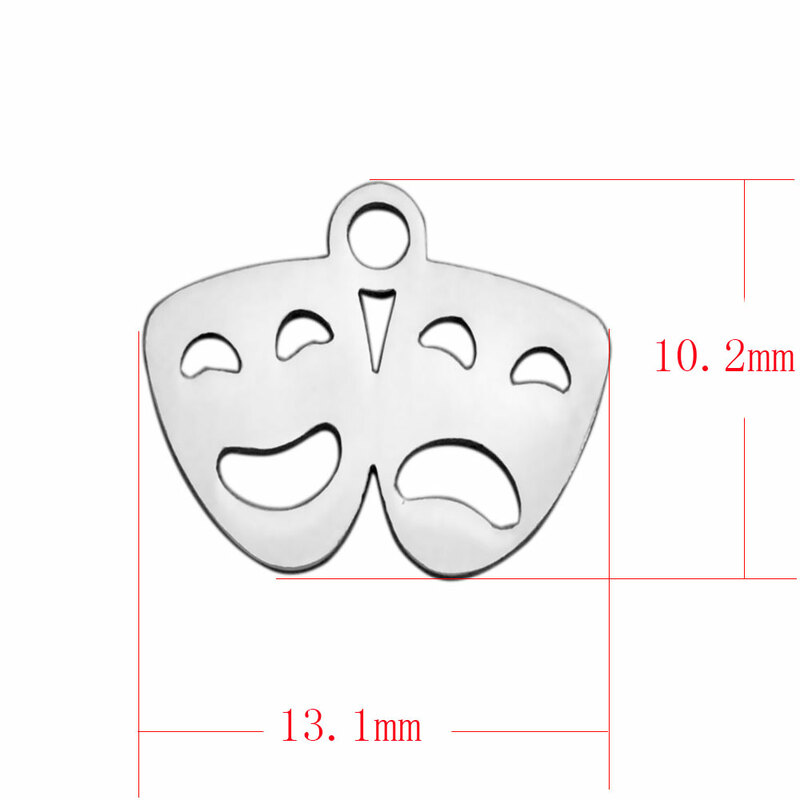 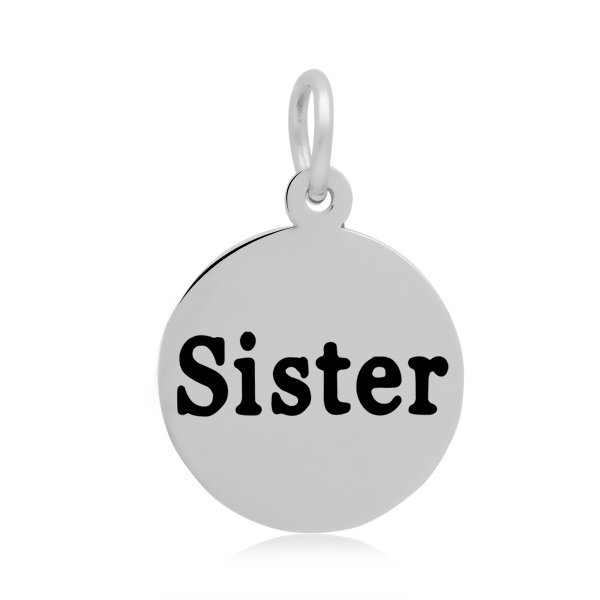 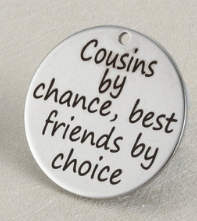 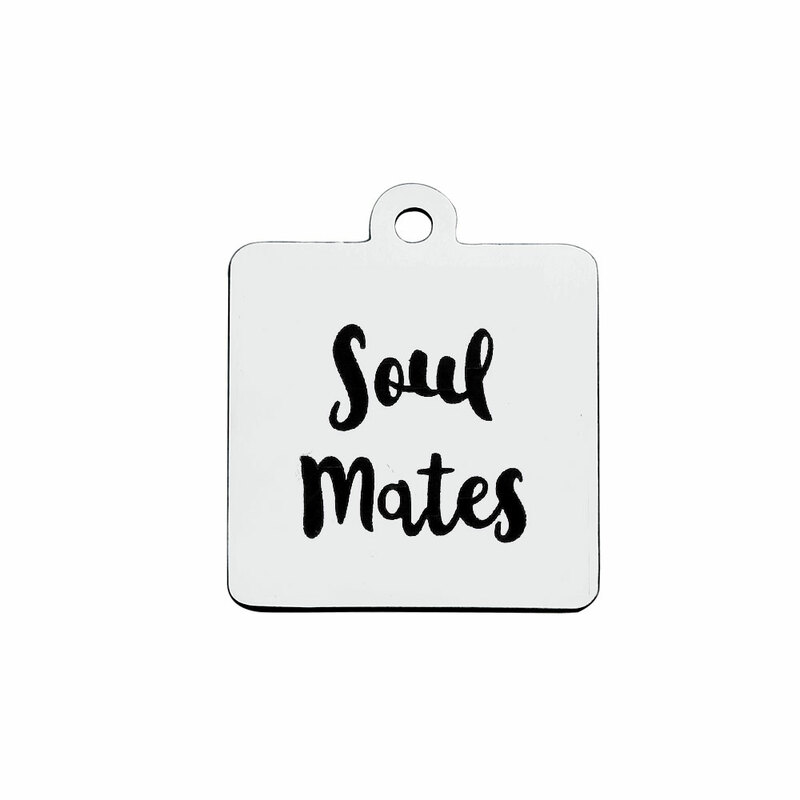 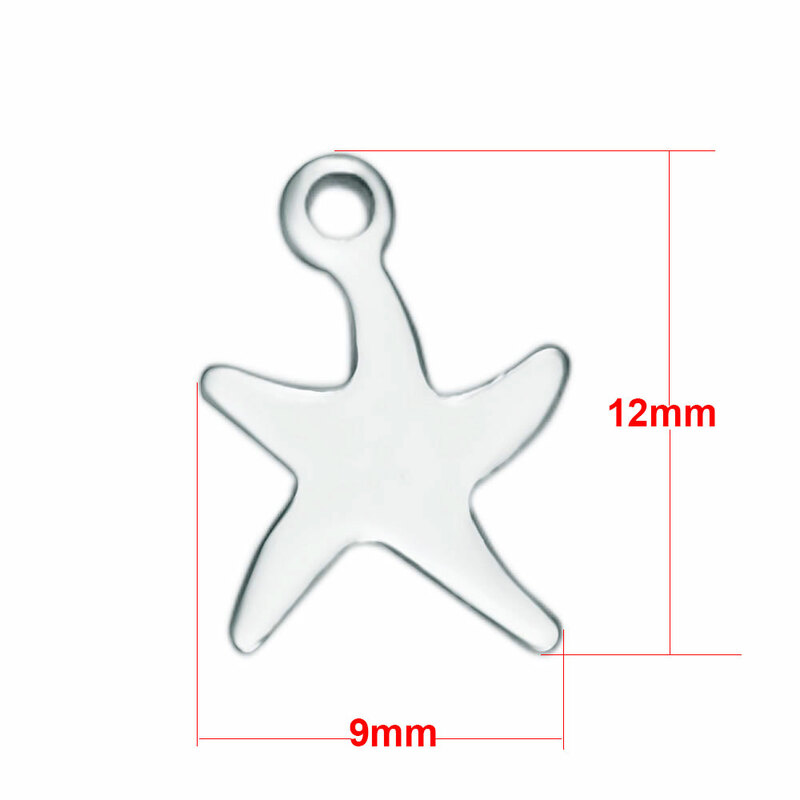 8*16mm Stainless Steel Charm - Best Friend Tag Stainless steel jewelry will not tarnish or rust. 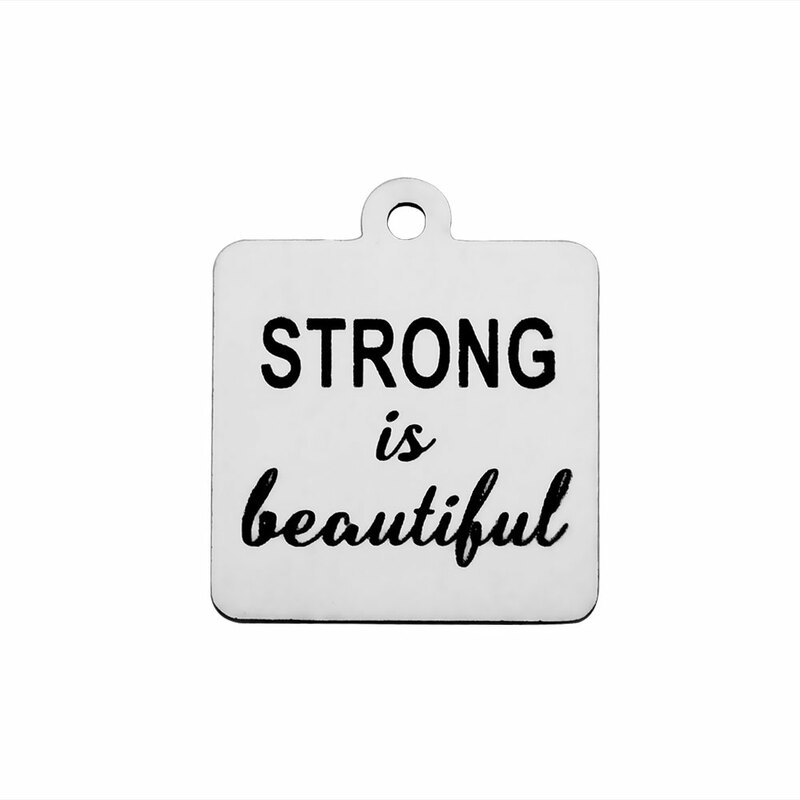 It is durable and scratch resistant. 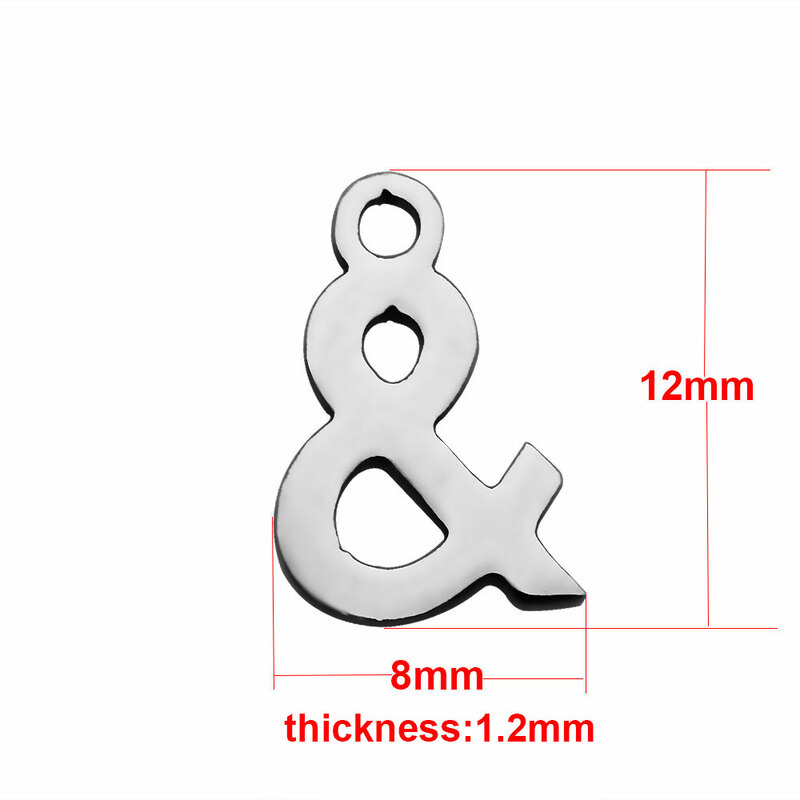 Small 12mm Stainless Steel Alphabet Charm - "A"
Small 12mm Stainless Steel Alphabet Charm - "B"
Small 12mm Stainless Steel Alphabet Charm - "C"
Small 12mm Stainless Steel Alphabet Charm - "D"
Small 12mm Stainless Steel Alphabet Charm - "E"
Small 12mm Stainless Steel Alphabet Charm - "F"
Small 12mm Stainless Steel Alphabet Charm - "G"
Small 12mm Stainless Steel Alphabet Charm - "H"
Small 12mm Stainless Steel Alphabet Charm - "I"
Small 12mm Stainless Steel Alphabet Charm - "J"
Small 12mm Stainless Steel Alphabet Charm - "K"
Small 12mm Stainless Steel Alphabet Charm - "L"
Small 12mm Stainless Steel Alphabet Charm - "M"
Small 12mm Stainless Steel Alphabet Charm - "N"
Small 12mm Stainless Steel Alphabet Charm - "O"
Small 12mm Stainless Steel Alphabet Charm - "P"
Small 12mm Stainless Steel Alphabet Charm - "Q"
Small 12mm Stainless Steel Alphabet Charm - "R"
Small 12mm Stainless Steel Alphabet Charm - "S"
Small 12mm Stainless Steel Alphabet Charm - "T"
Small 12mm Stainless Steel Alphabet Charm - "U"
Small 12mm Stainless Steel Alphabet Charm - "V"
Small 12mm Stainless Steel Alphabet Charm - "X"
Small 12mm Stainless Steel Alphabet Charm - "Y"
Small 12mm Stainless Steel Alphabet Charm - "Z"
Small 12mm Stainless Steel Number Charm - "0"
Small 12mm Stainless Steel Number Charm - "1"
Small 12mm Stainless Steel Number Charm - "2"
Small 12mm Stainless Steel Number Charm - "3"
Small 12mm Stainless Steel Number Charm - "4"
Small 12mm Stainless Steel Number Charm - "5"
Small 12mm Stainless Steel Number Charm - "6"
Small 12mm Stainless Steel Number Charm - "7"
Small 12mm Stainless Steel Number Charm - "8"
Small 12mm Stainless Steel Number Charm - "9"
Small Stainless Steel Charm 12*14mm - "I Heart You"